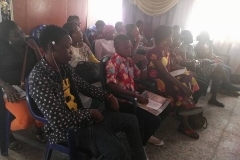 We had just ended our session with a large turn out of Youths. 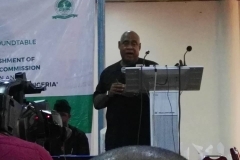 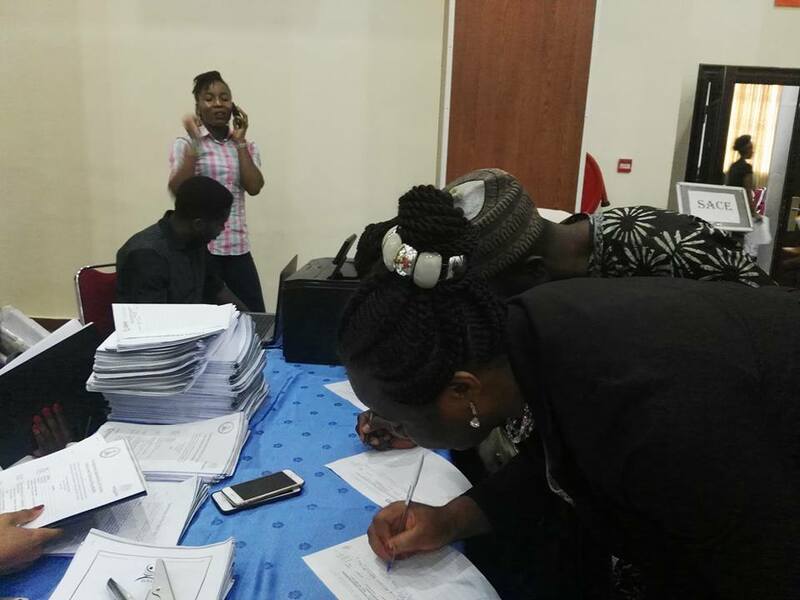 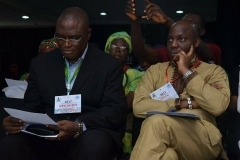 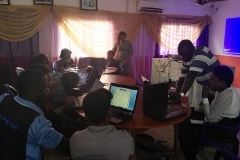 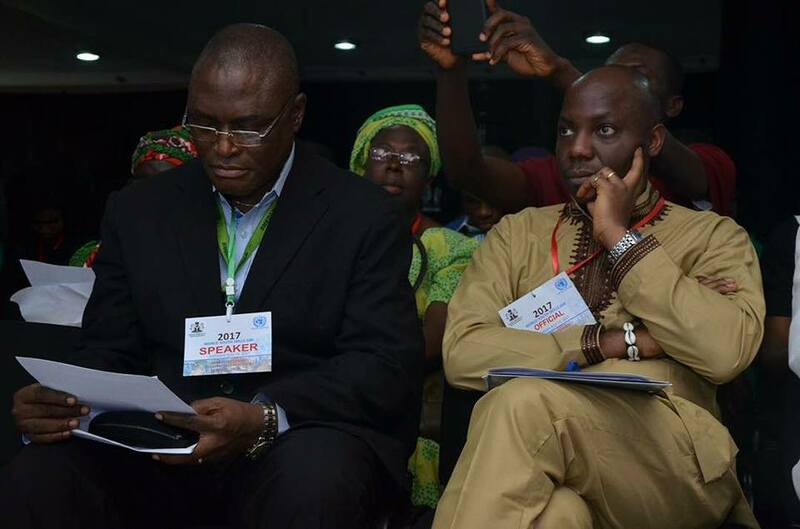 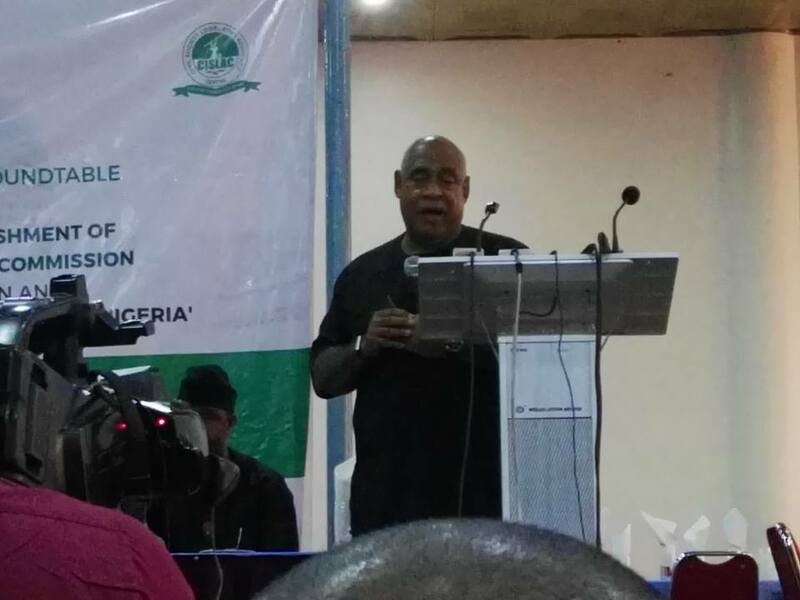 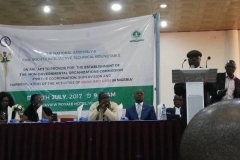 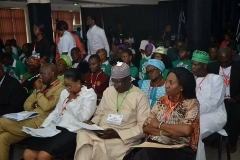 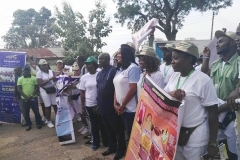 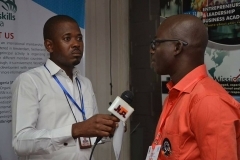 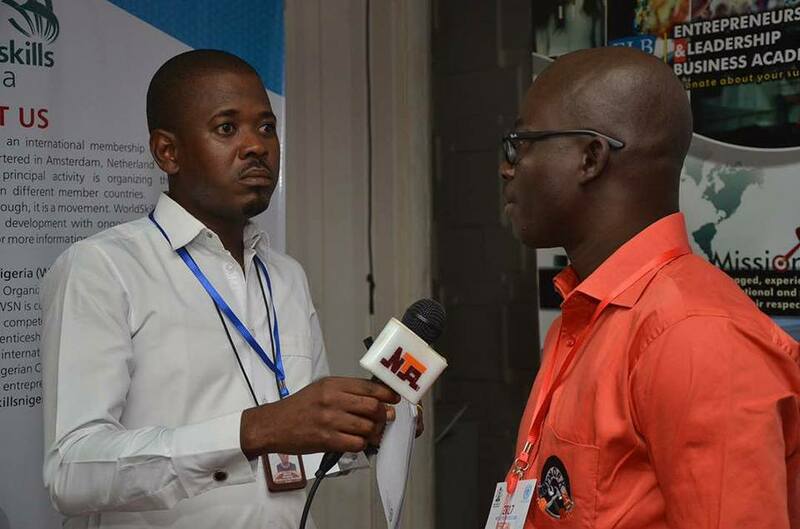 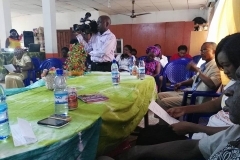 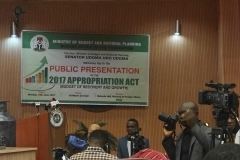 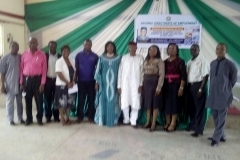 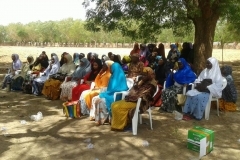 The event was covered by NTA and News Agency of Nigeria. 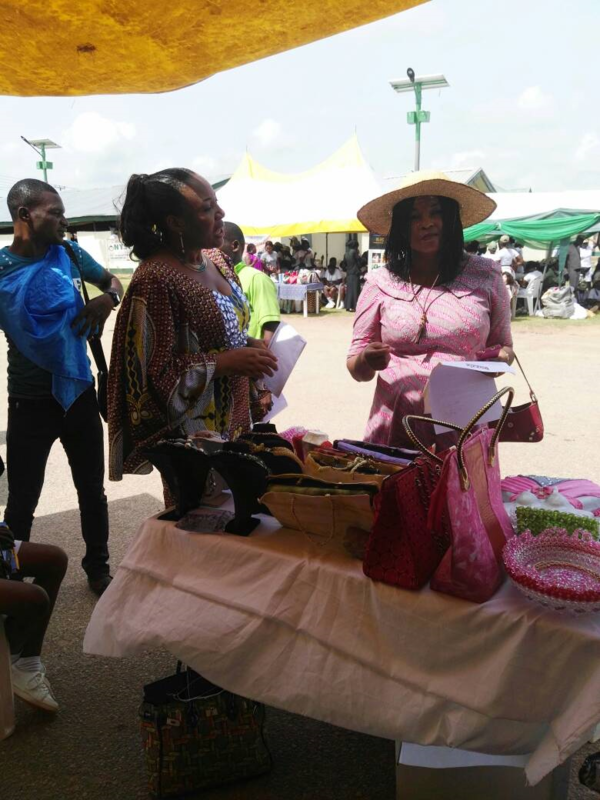 We had various stake holders in attendance, starting from owners of the day, Honourable Sharon Omotayo from Nigeria Youth Parliament, she took the centre stage because it was their event. 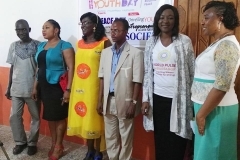 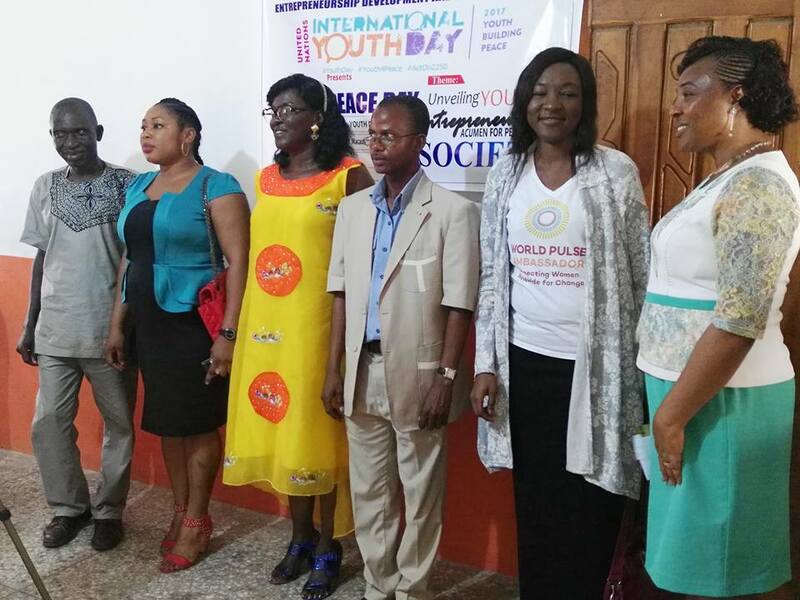 We want Youths to speak out and tell the world how they intend to make the world a peaceful place. 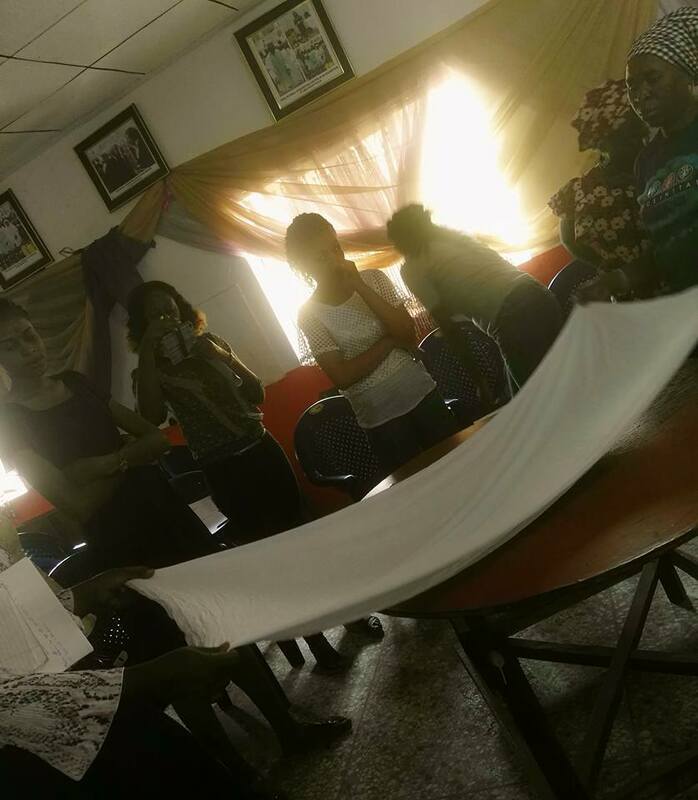 It was highly interactive, I must confess. 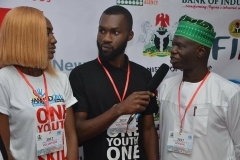 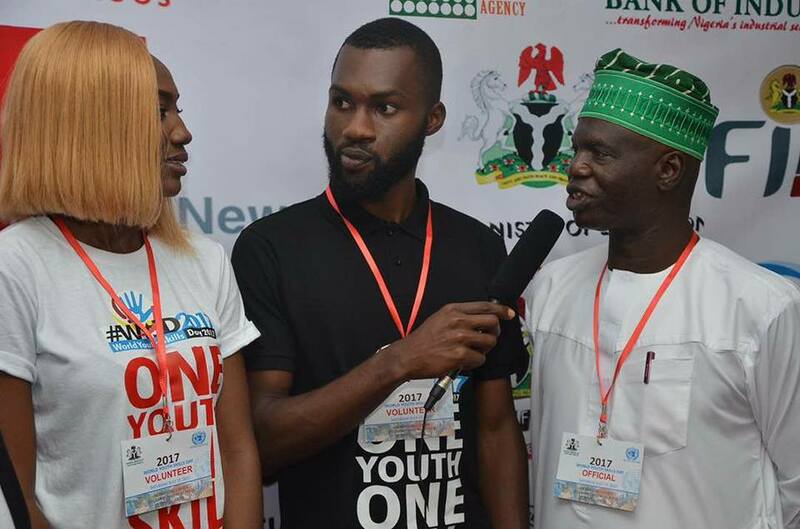 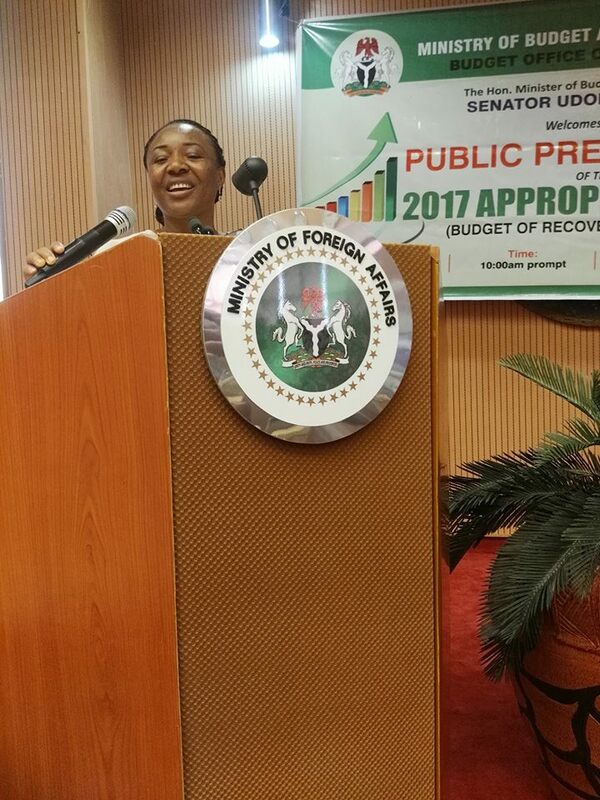 Sharon was on point, she gave her narratives on the activities of Nigeria Youth Parliament at the National Assembly, and their plans towards sensitising the Nigerian Youths before 2019 elections. 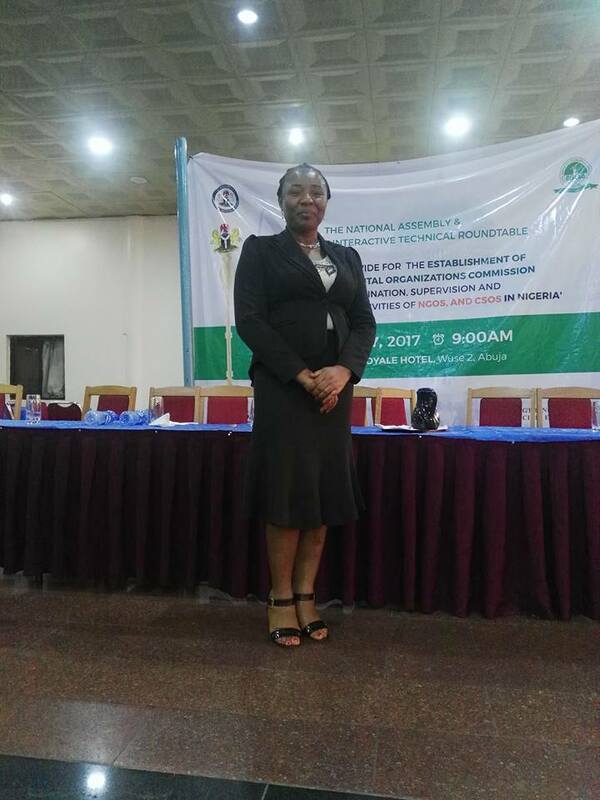 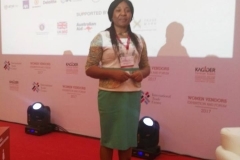 Regina Bamayi, a representative from SMEDAN also unveils their plans for Nigerian Youths. 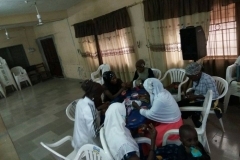 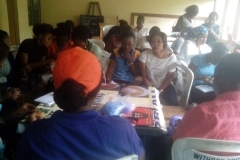 She painted a scenario with a brain teaser, where the Youths had different answers to the same questions, the bottom line was that life is seen differently by different people, opportunities are open to every one, some will see and understand while some will see it without knowing. Powerful sessions by these wonderful people. 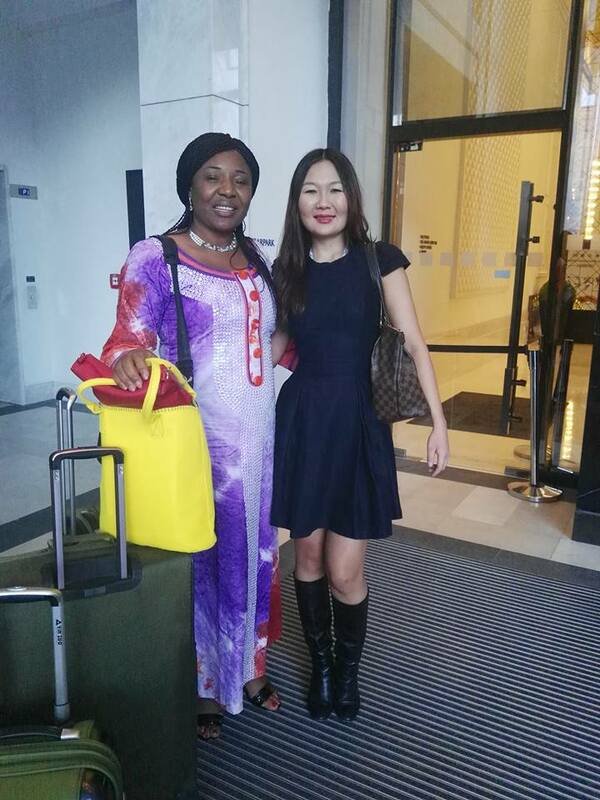 We also had Carolyn Seaman in the house, a friend and a sister from another mother, from the same family World Pulse! 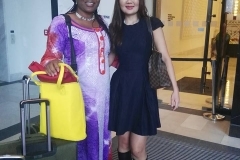 She talked about world pulse and the opportunities in stock for Youths. 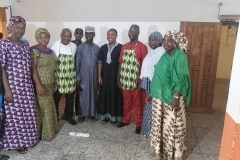 We also had Chief Abu Ali, President, Free Health Care Charity Organisation. 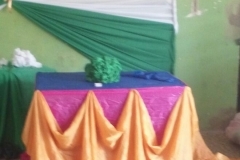 He gave a general over view of the program. 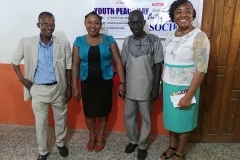 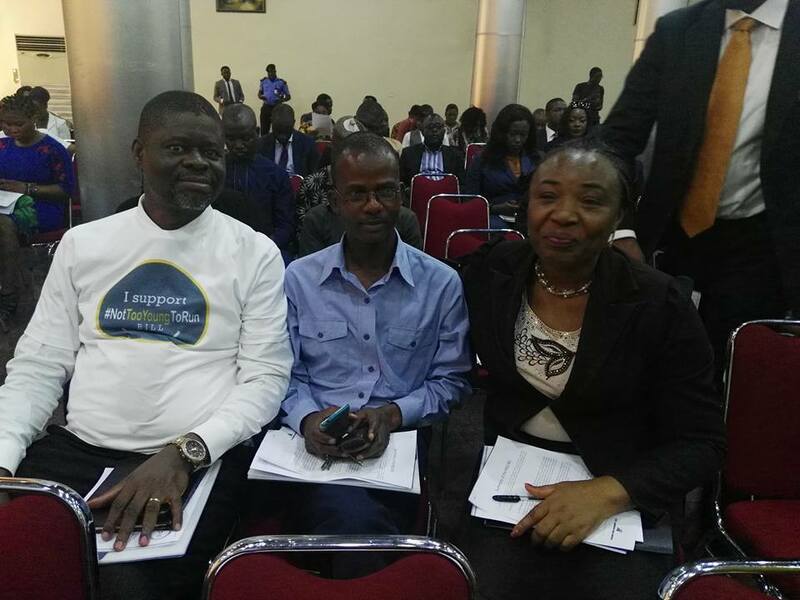 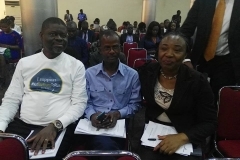 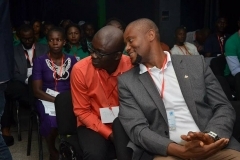 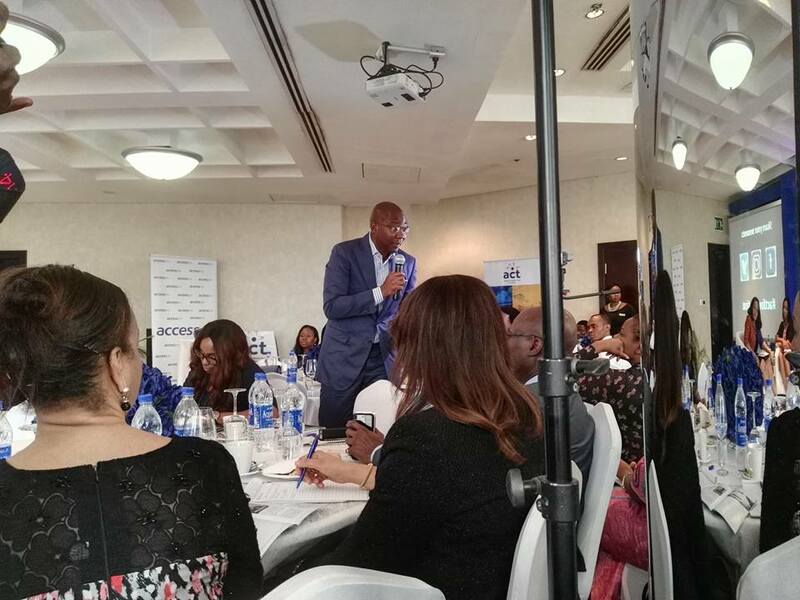 Finally, Mr Olatunji Abayomi wrapped the event with Entrepreneurship acumen for peaceful society. 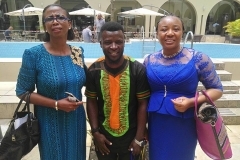 It was high level networking event. 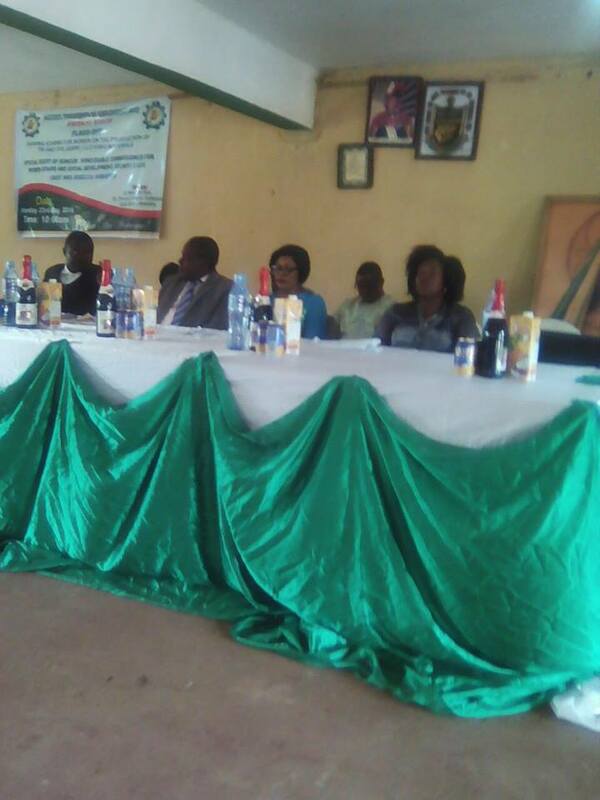 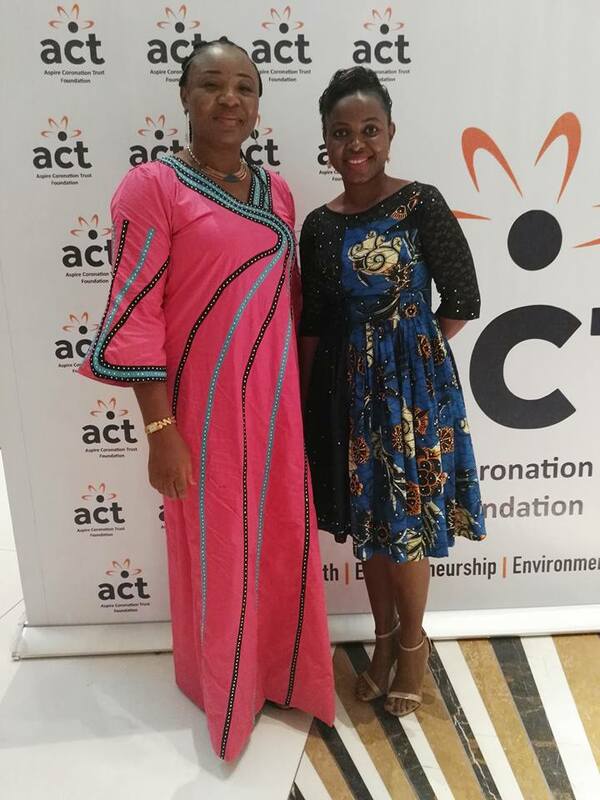 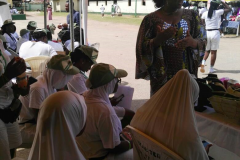 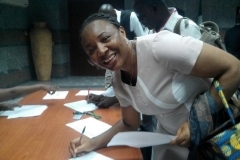 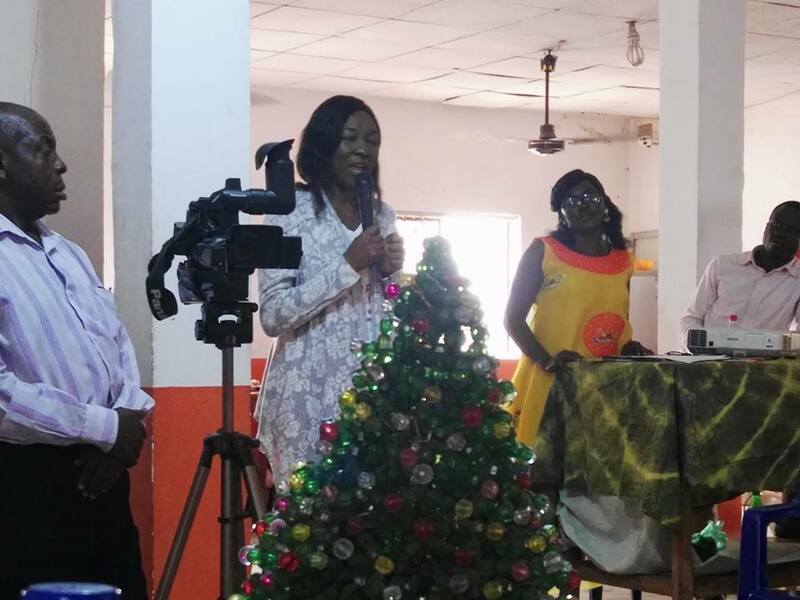 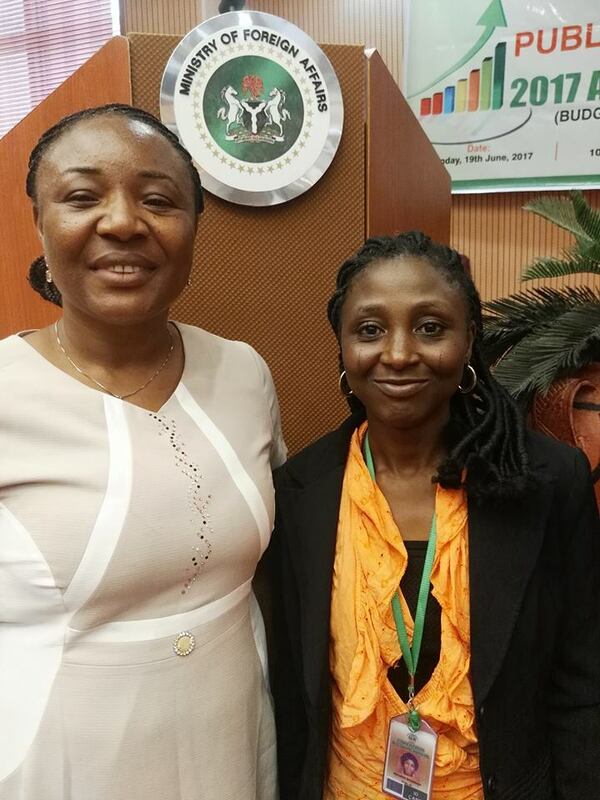 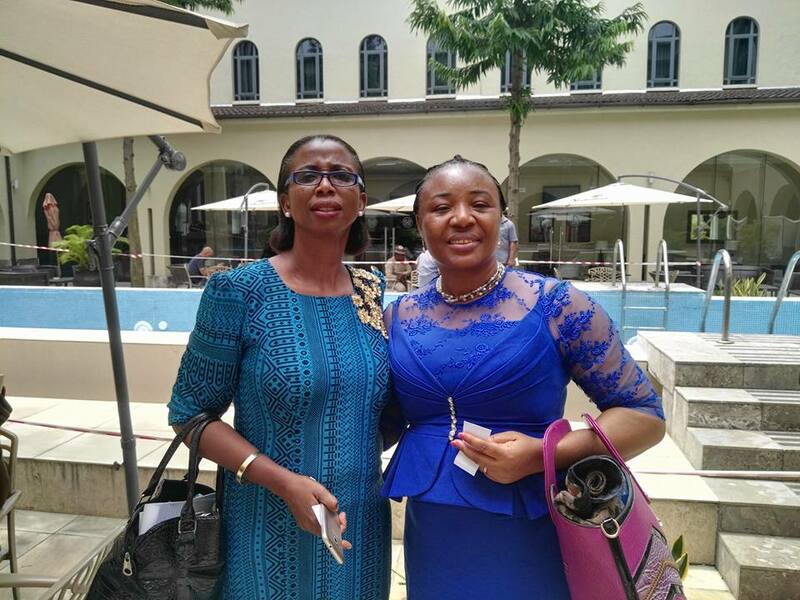 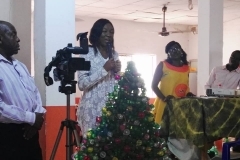 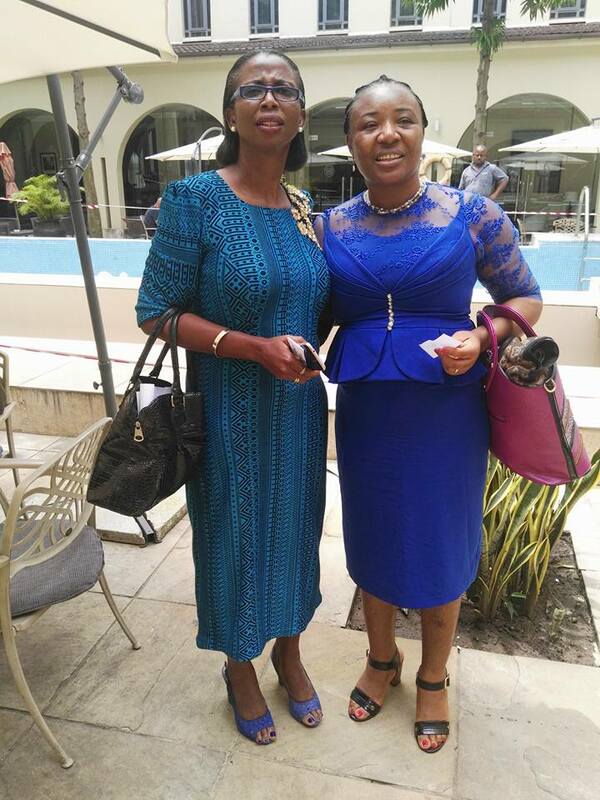 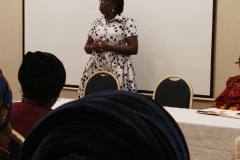 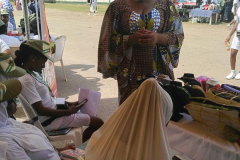 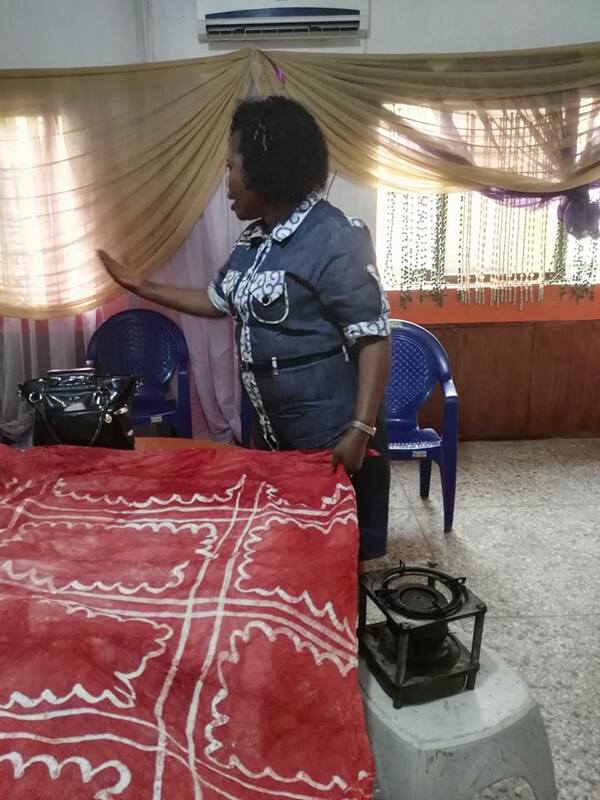 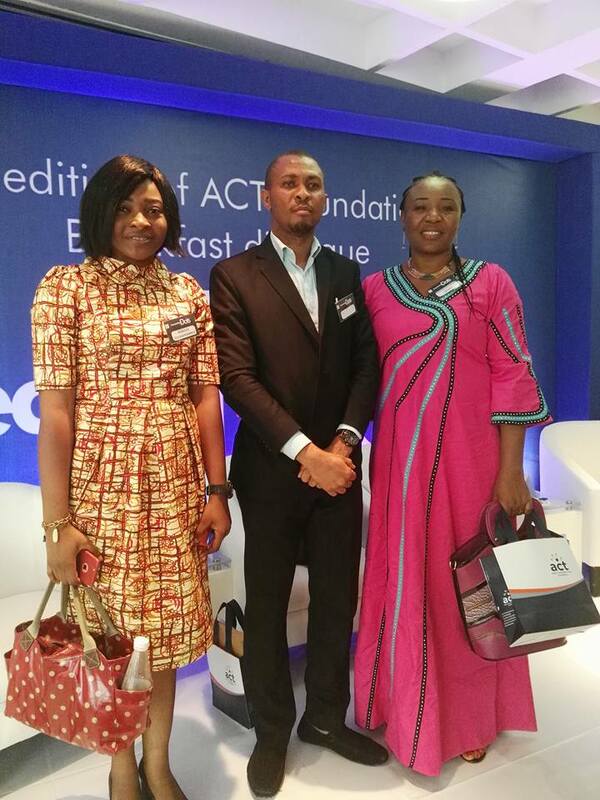 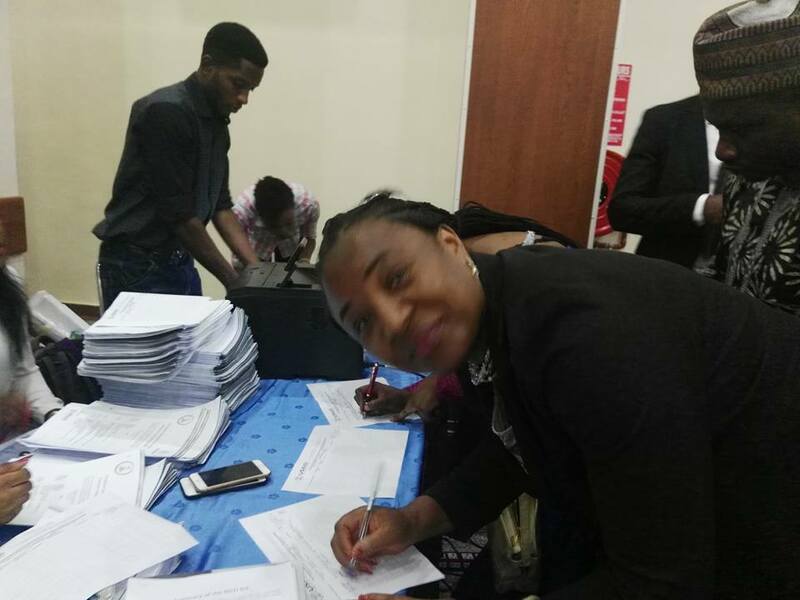 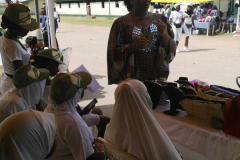 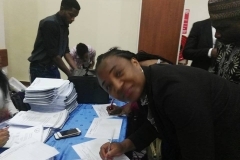 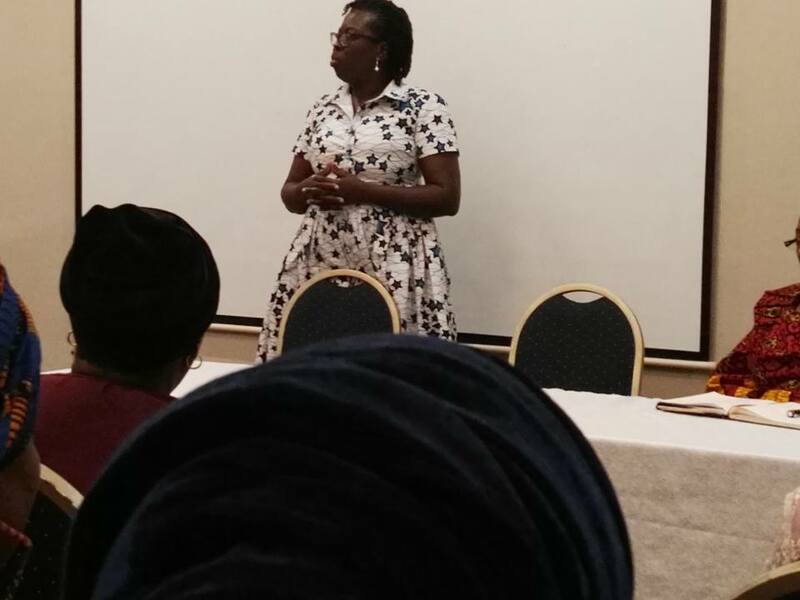 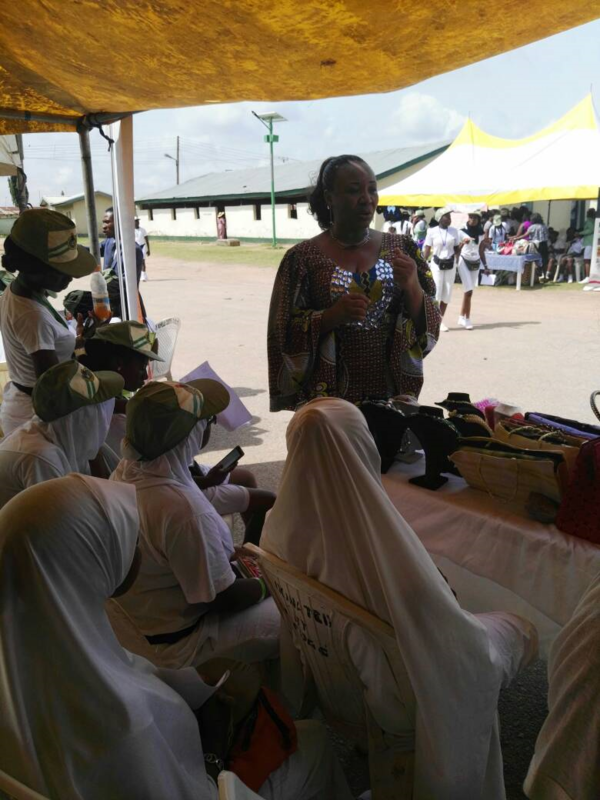 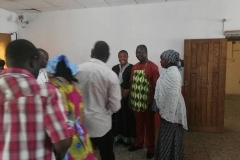 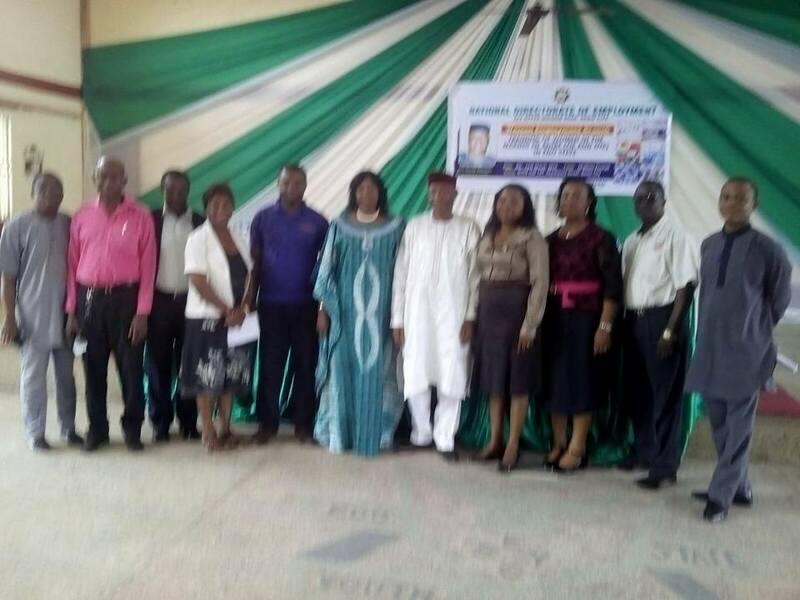 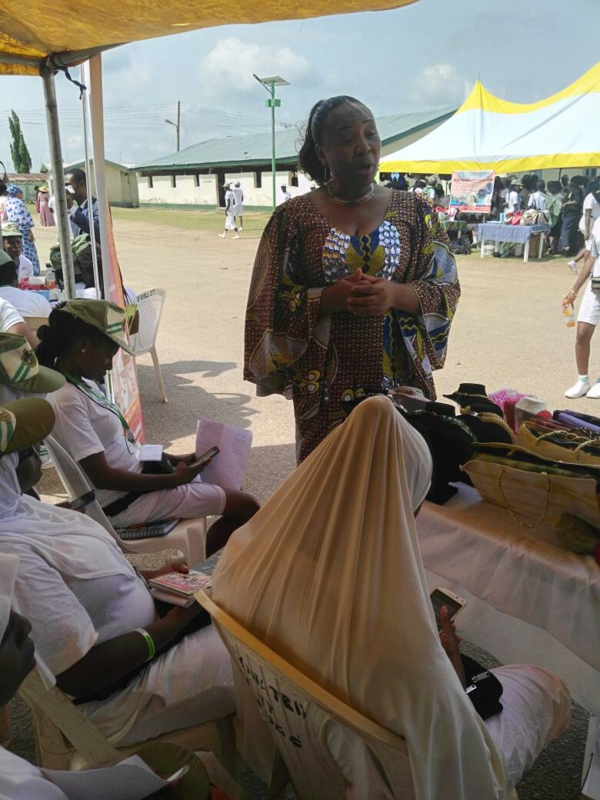 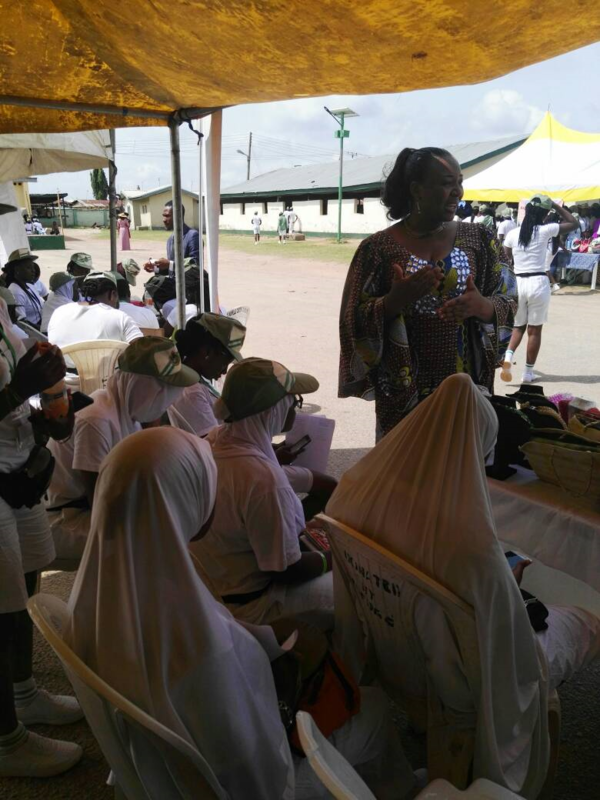 One of our advisory Board was on ground, Mrs Oby Ezeilo, she helped in making the program a success. 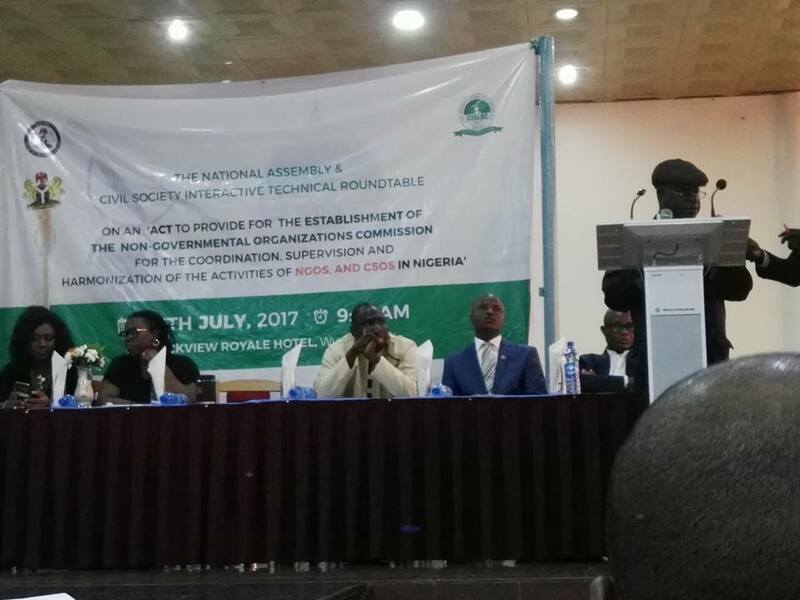 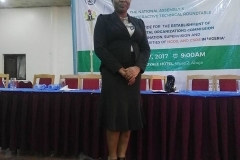 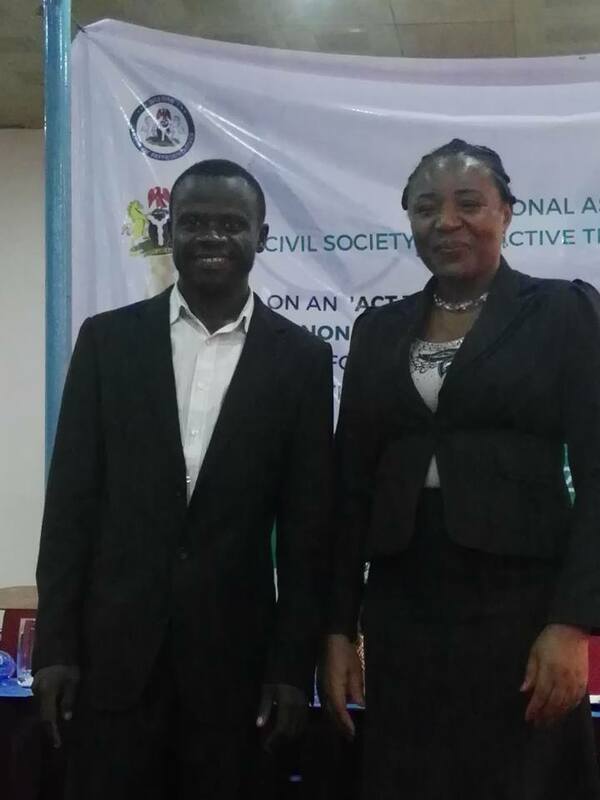 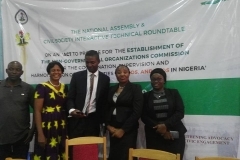 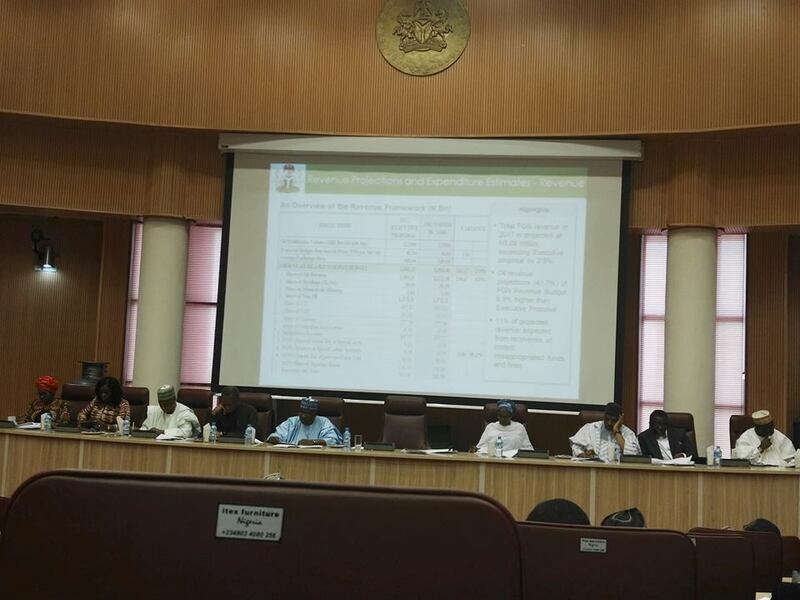 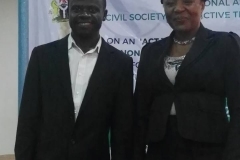 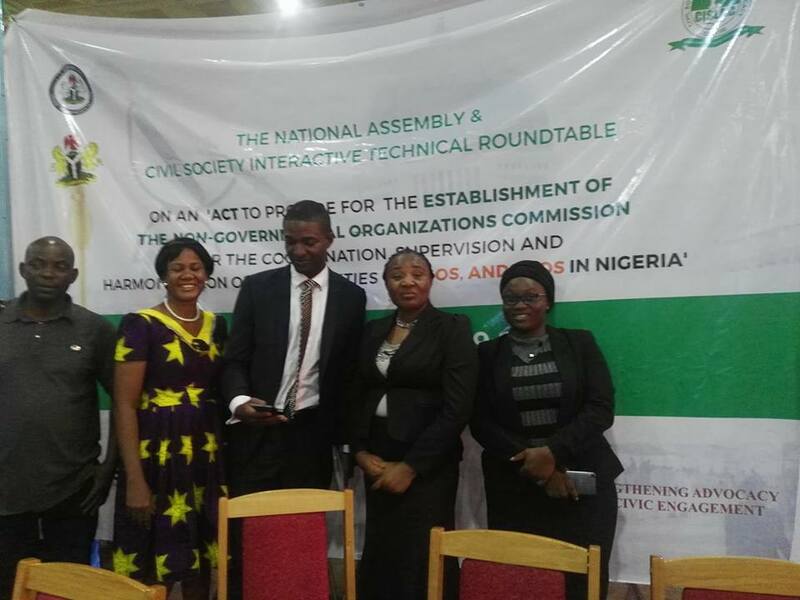 I represented our Organization on the National Assembly & Civil Society Interactive Technical Round table. 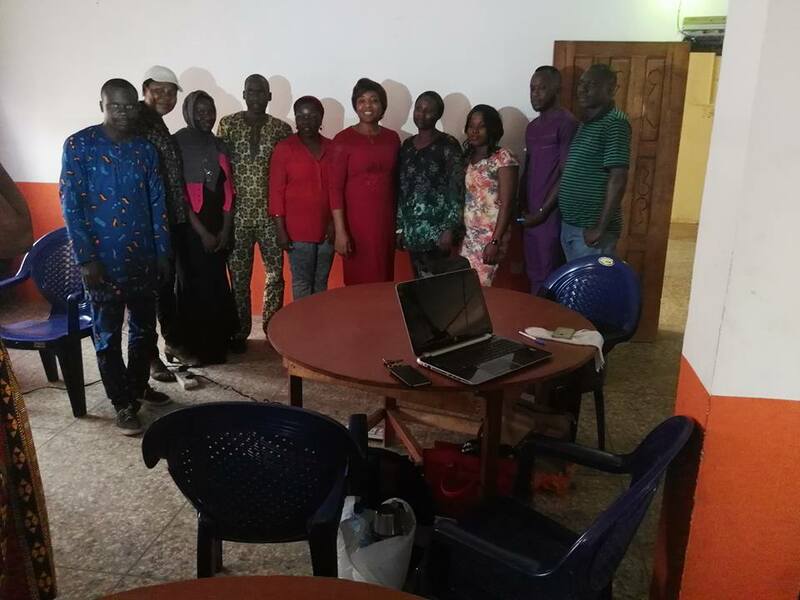 It was such a marathon and lasted for 9 hours.The effort was not in futility as we were invited to discuss about a bill that was sponsored by the Deputy Majority Speaker, Hon. 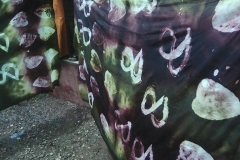 Umah Bubar Jibril. 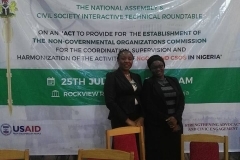 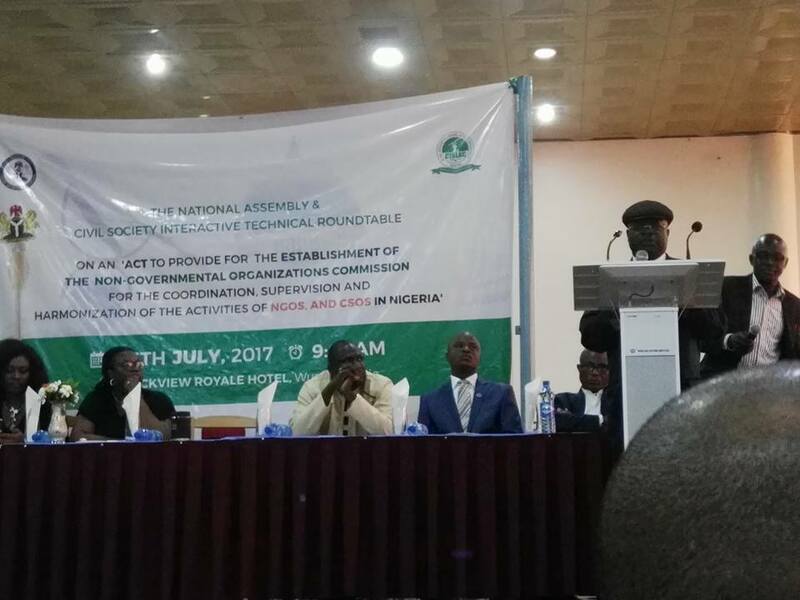 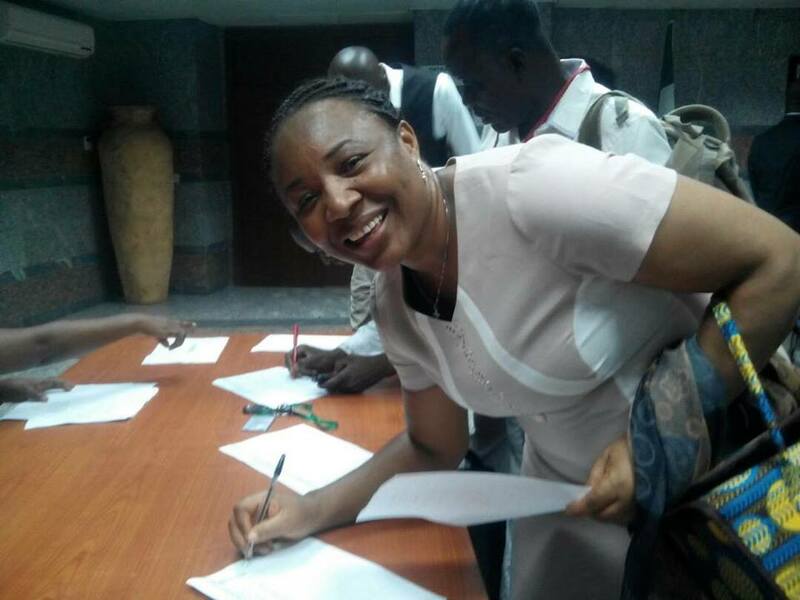 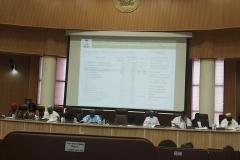 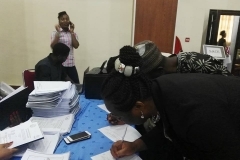 A ‘Bill to provide for the establishment of the Non Governmental Organization Commission for the Coordination, Supervision and Harmonization of the activities of NGOs and CSOs in Nigeria’. 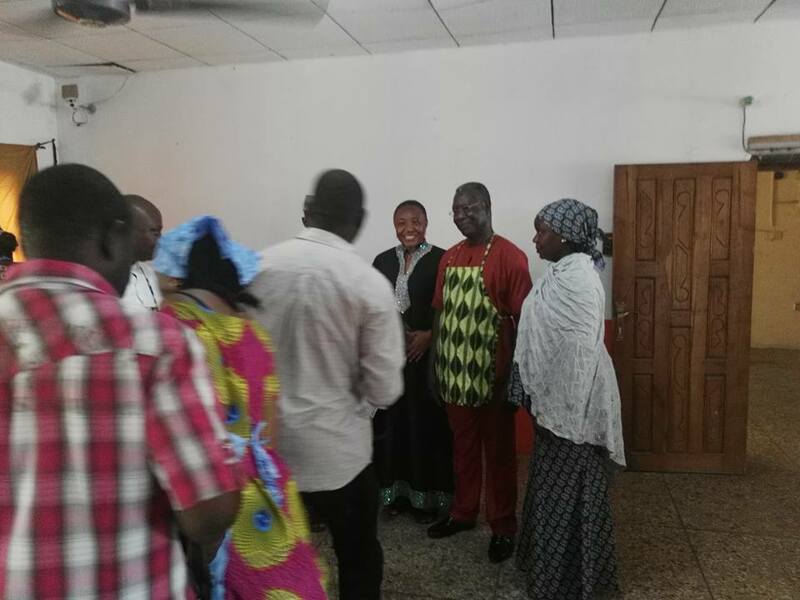 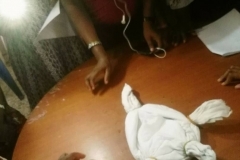 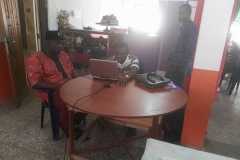 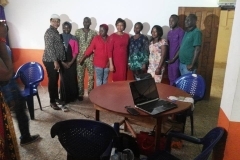 This quest was as a result of some unethical behaviors and dealings among some NGOs/CSOs. 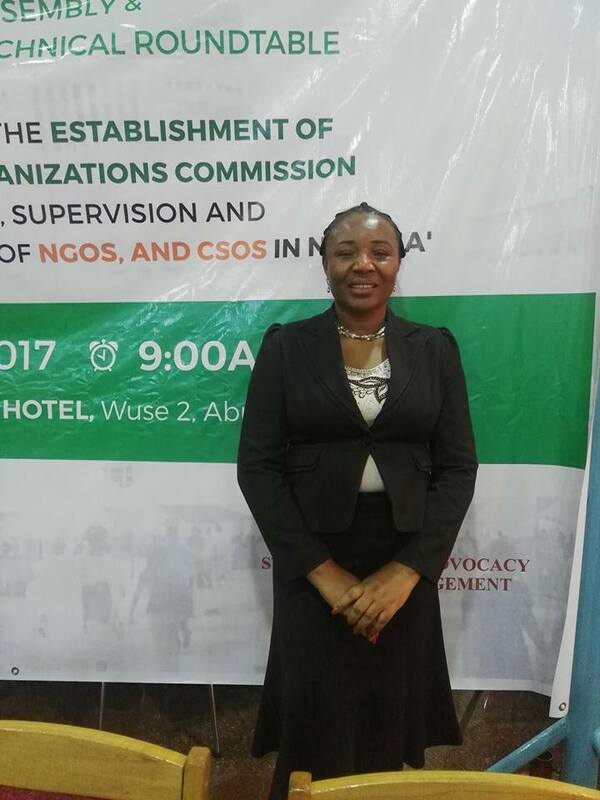 There’s know doubt about pockets of unethical behavior by some NGOs, but, is creating a new Commission the answer? 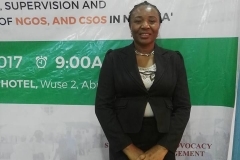 We have four Organizations, CAC, EFCC, FIRS and National planning Commission that is checkmating those menace already, what is the guaranty that creating a new commission will solve the problem. 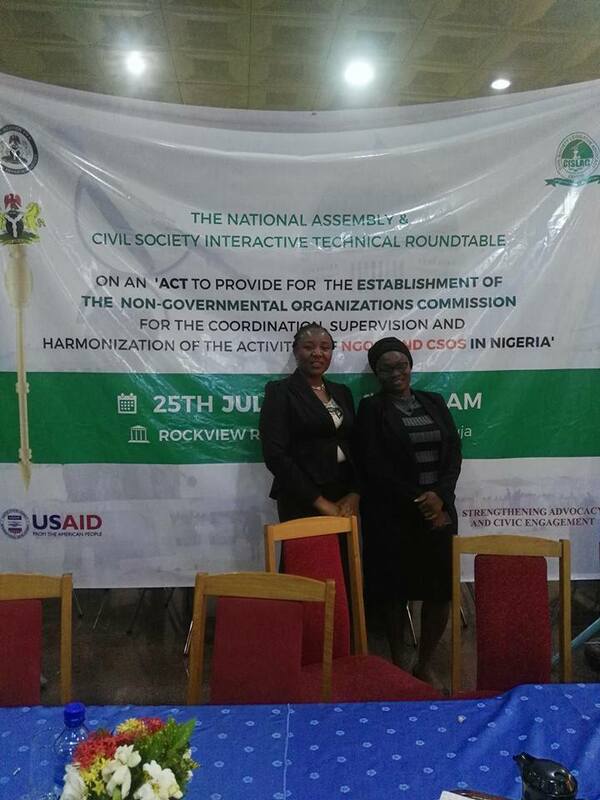 For the sake of ease of doing business, we all agreed that 4 existing Organisations should be strengthened, while NGOs/CSOs needs to look inward and tidy up the third sector for more transparency and accountability. 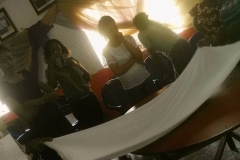 As you can see, it was a serious business and deserved all the time. 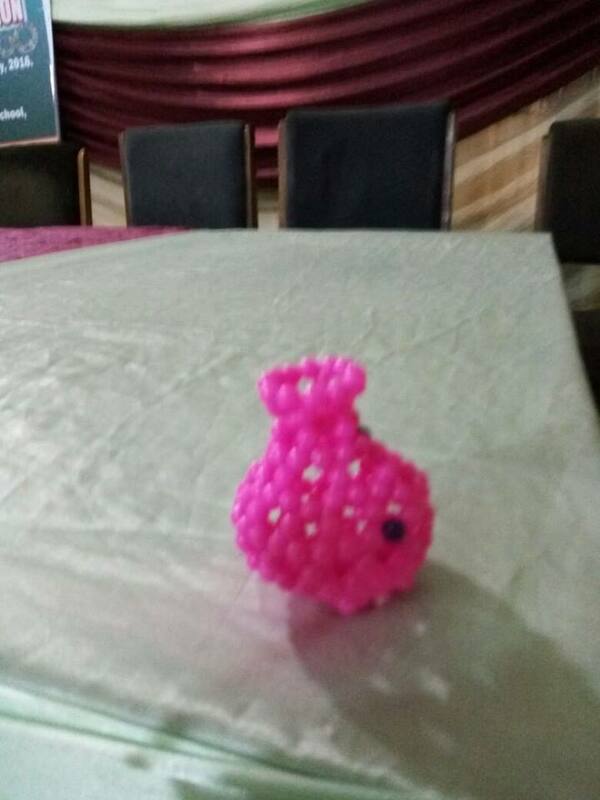 Some pictures from the event. 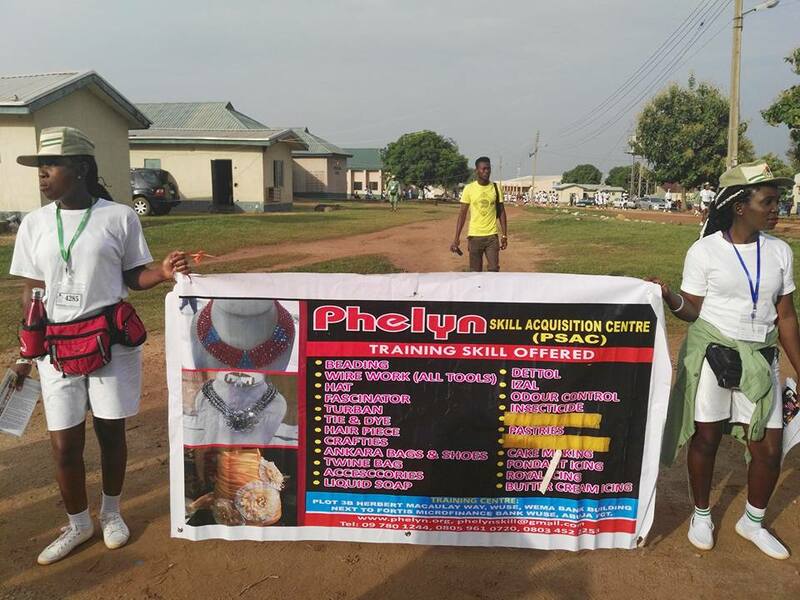 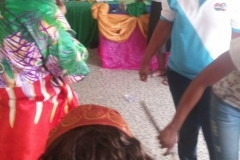 Just a little insight to all that happened at Phelyn Skill Center and it’s other engagements. 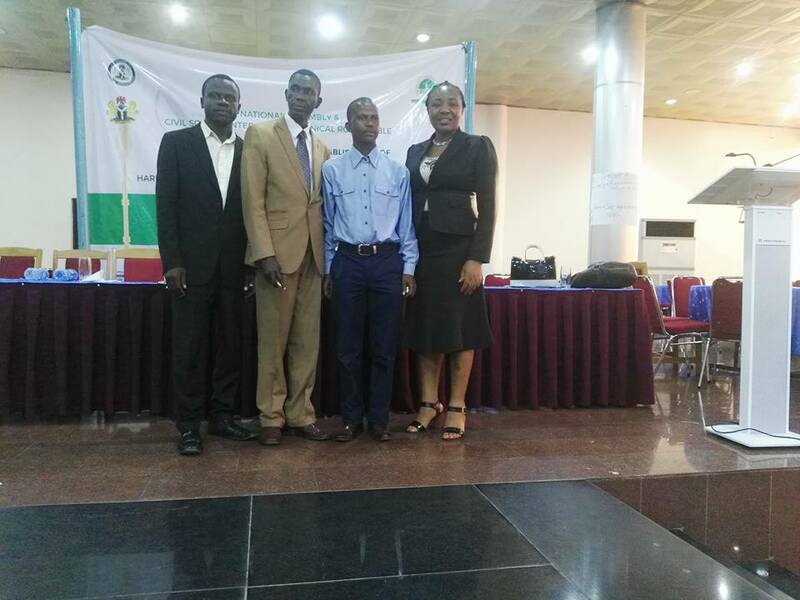 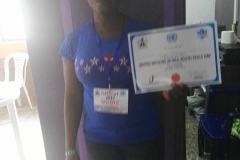 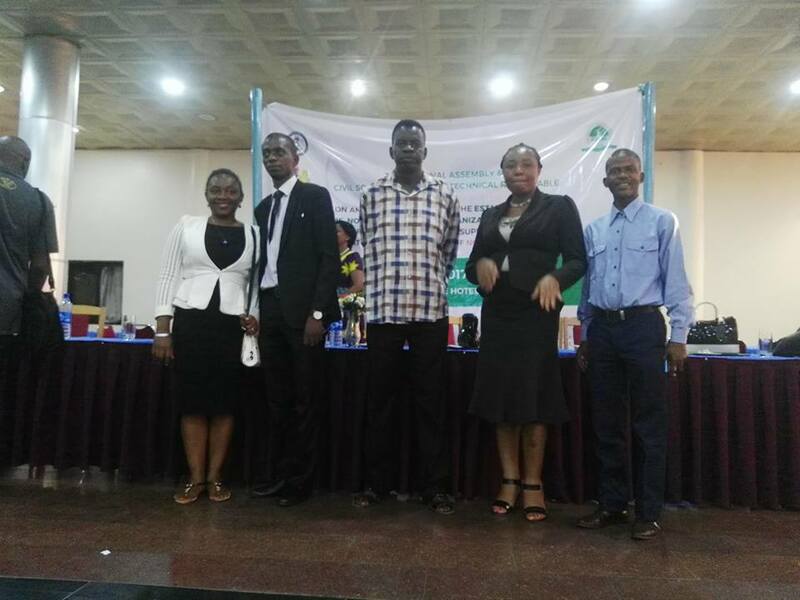 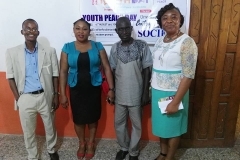 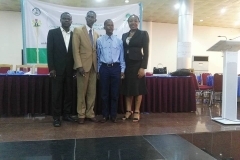 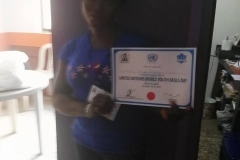 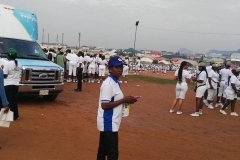 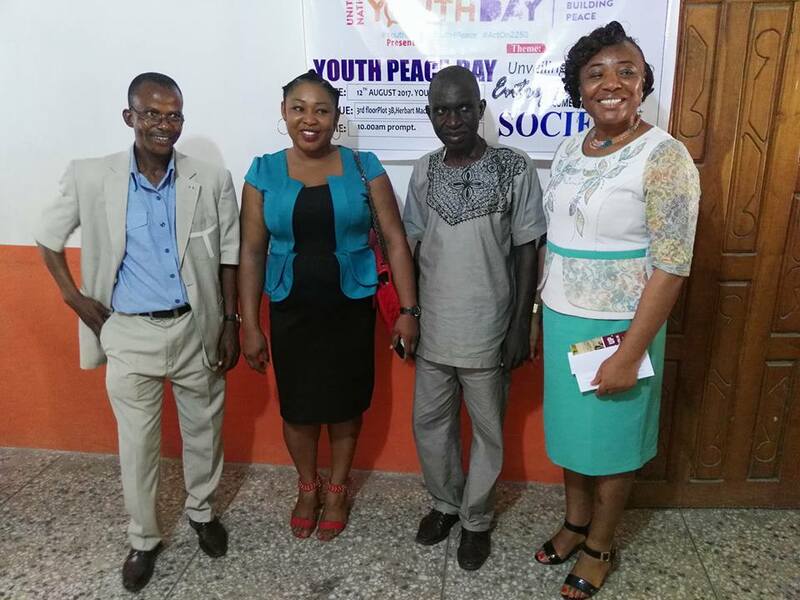 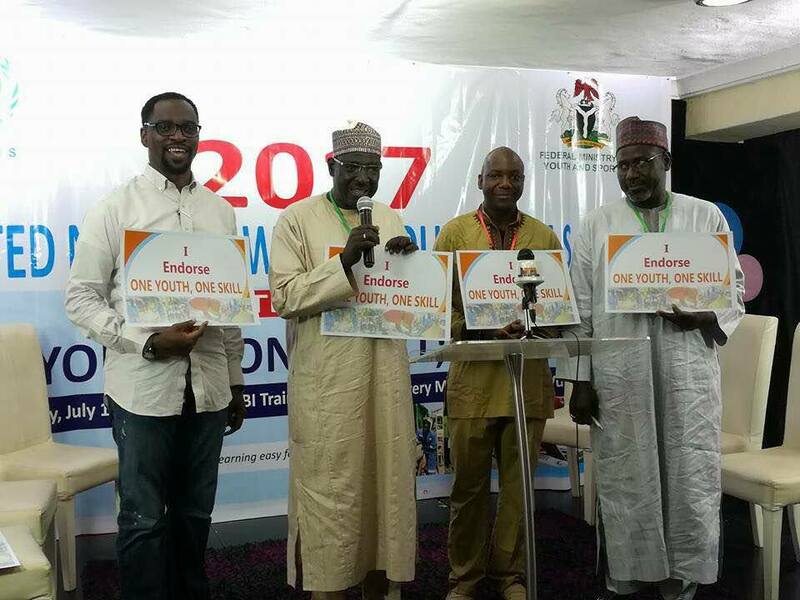 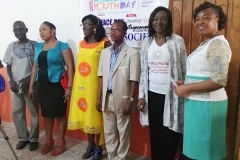 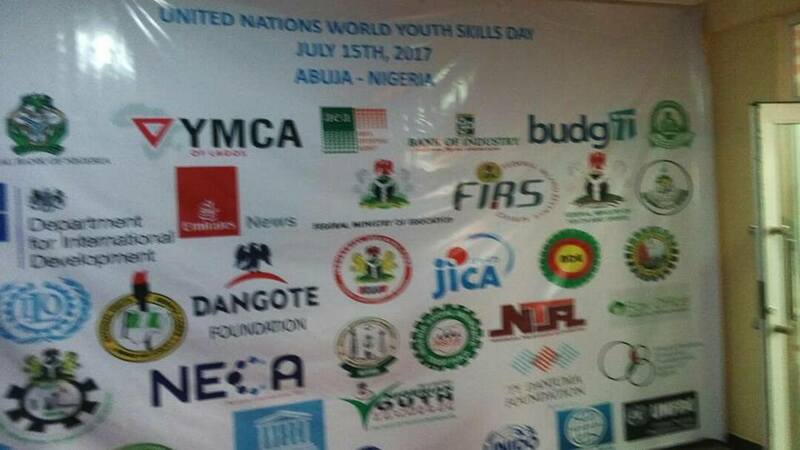 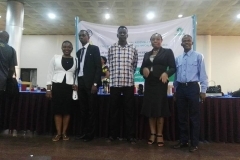 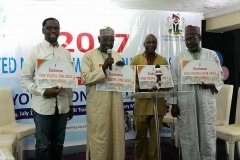 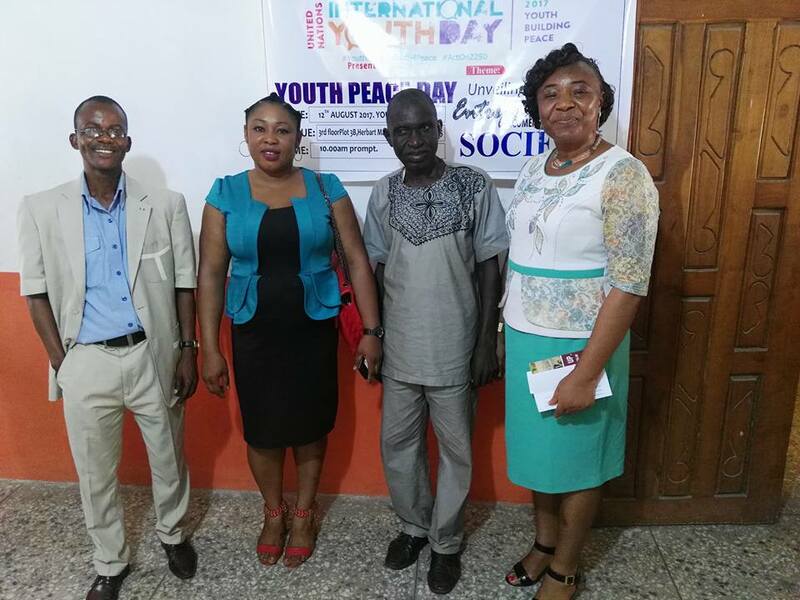 Yesterday, we celebrated UN World Youths Skill Day for the first time in Abuja. The aim of this is to encourage Youths to embrace skills as white collar jobs are know where to be found. 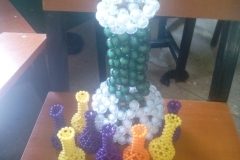 We were part of this from inception, as part of the planning committee. 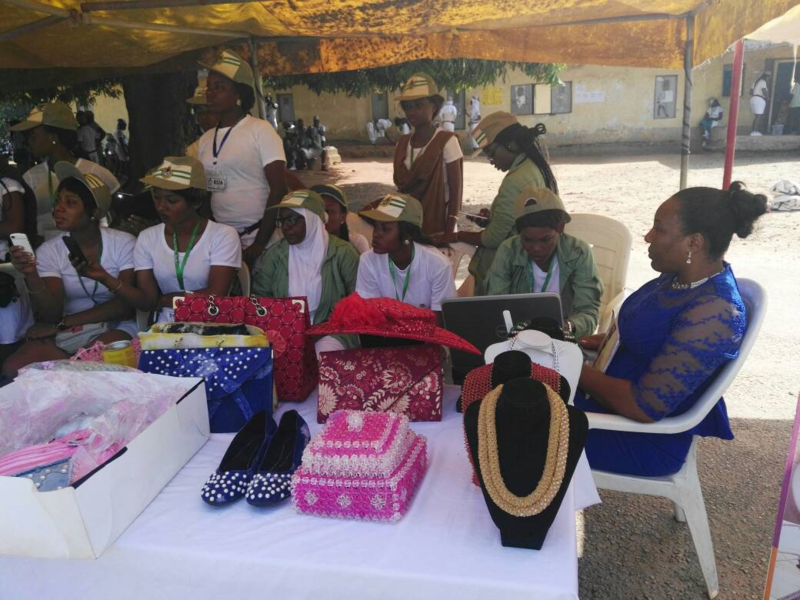 It came to live yesterday as a successful event with many dignitaries in attendance. 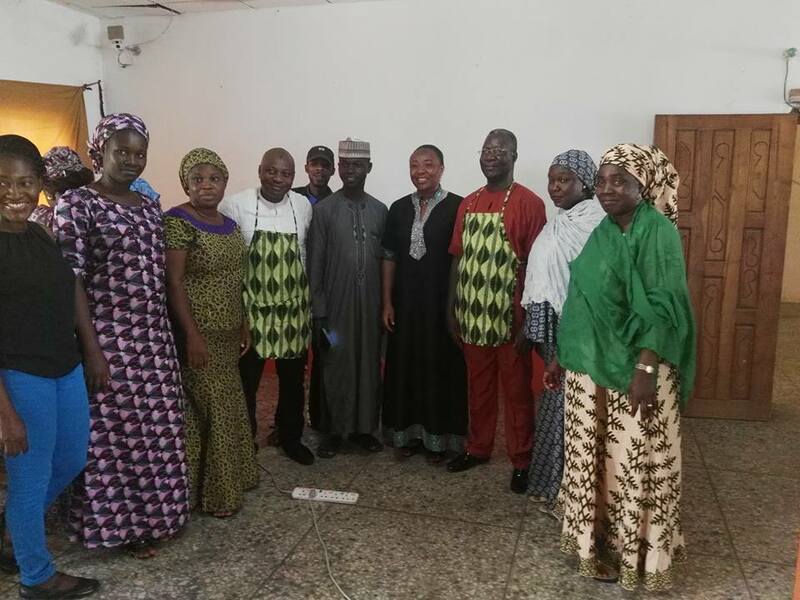 I have been engaged with many activities outside Abuja recently, hence, our Team has to be challenged. 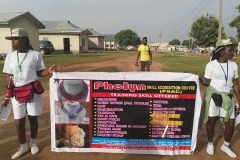 Phelyn Skill was represented by Miss Dorcas Edibo, who is also a member of Phelyn skill Team. 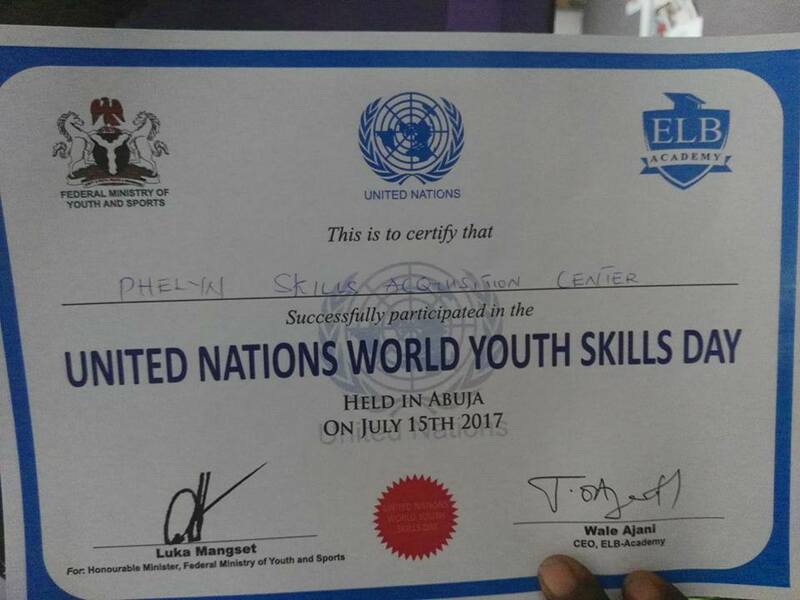 She has been on it until the event came to life yesterday.Enjoy some pictures from the event and our Certificate of participation. 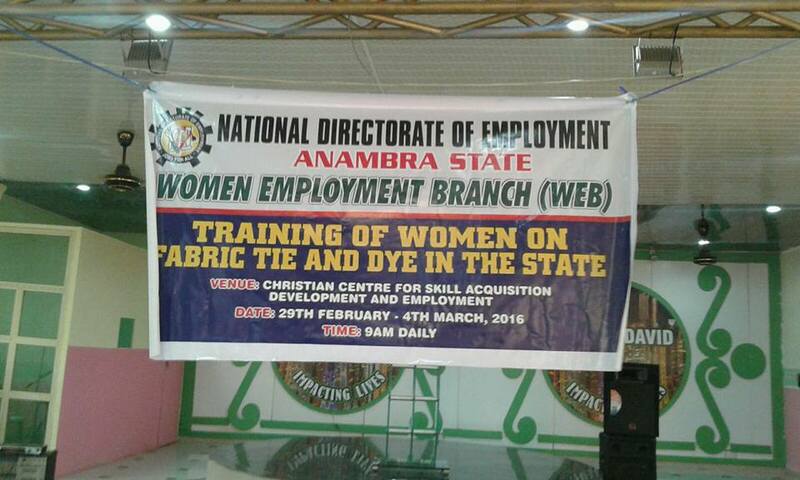 More news on our yesterday’s skill development training at the center will ready tomorrow. 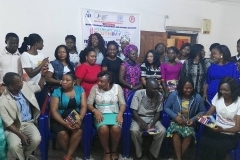 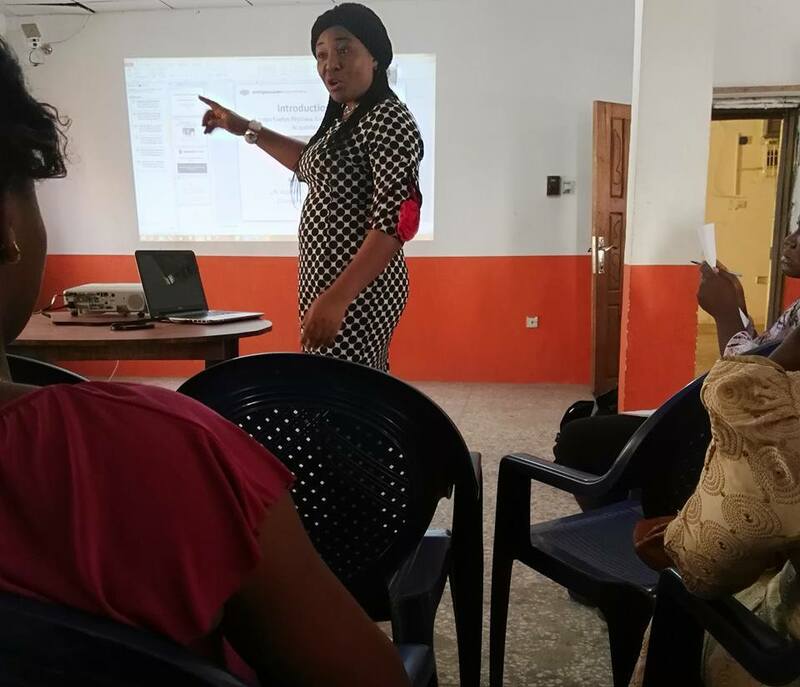 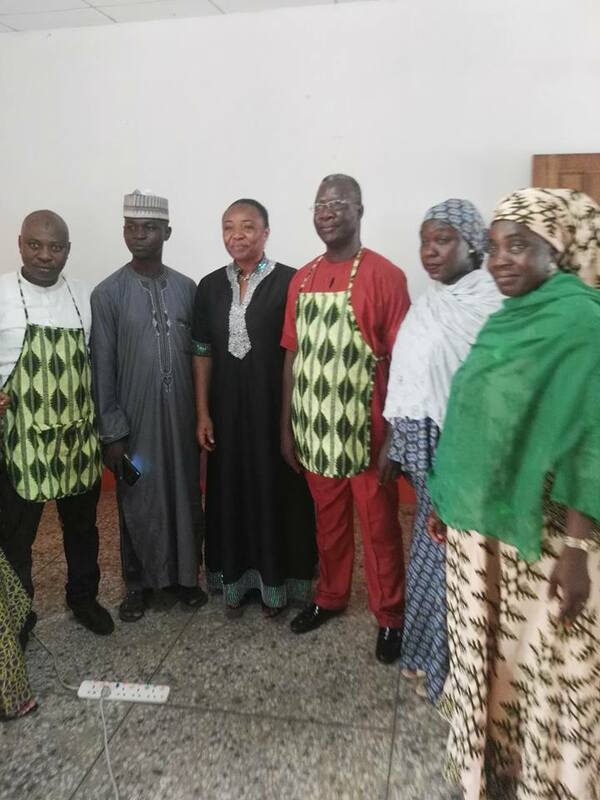 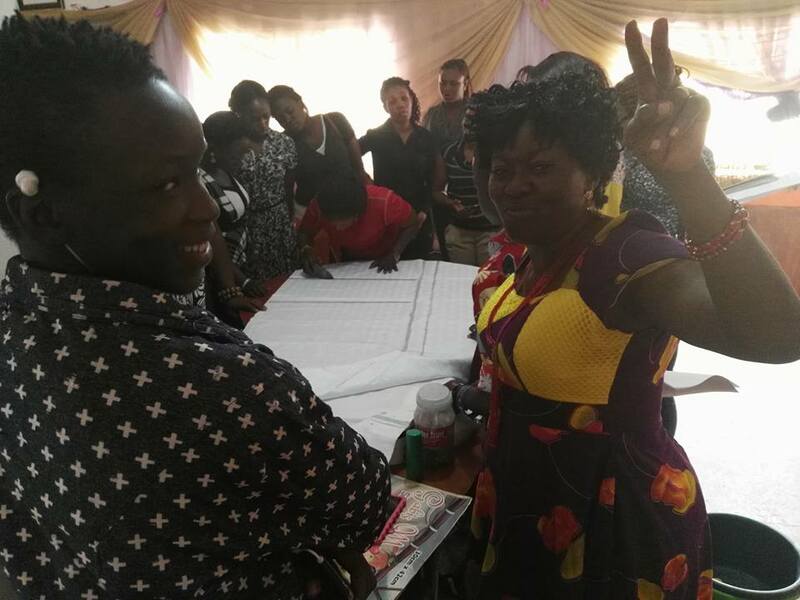 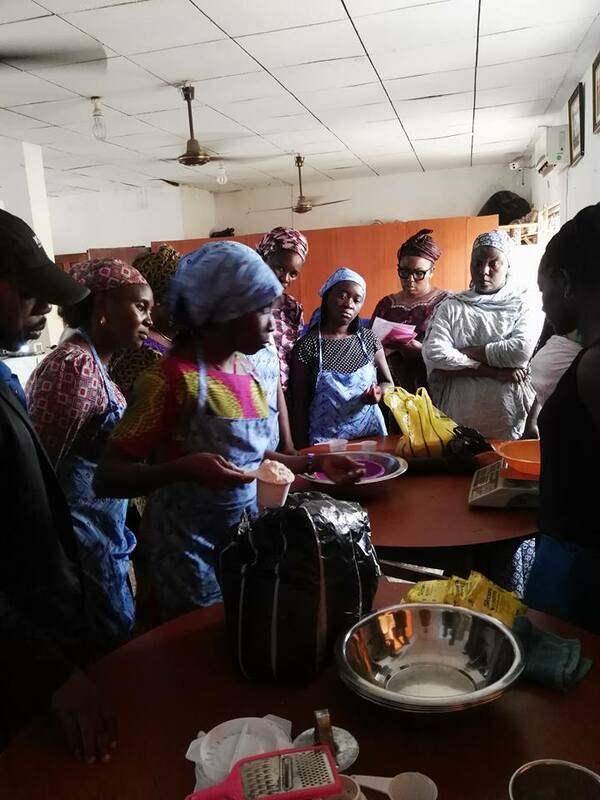 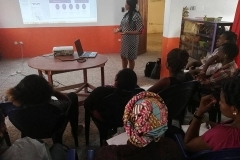 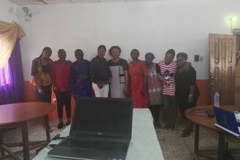 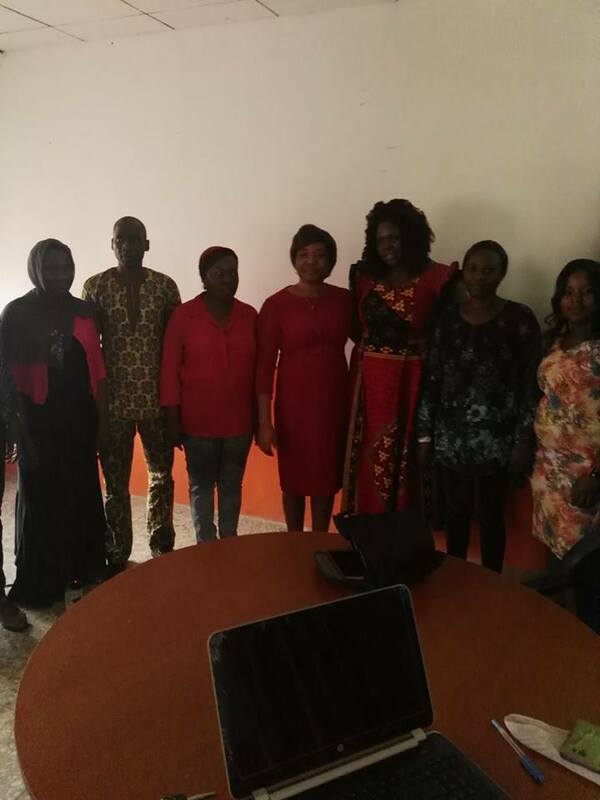 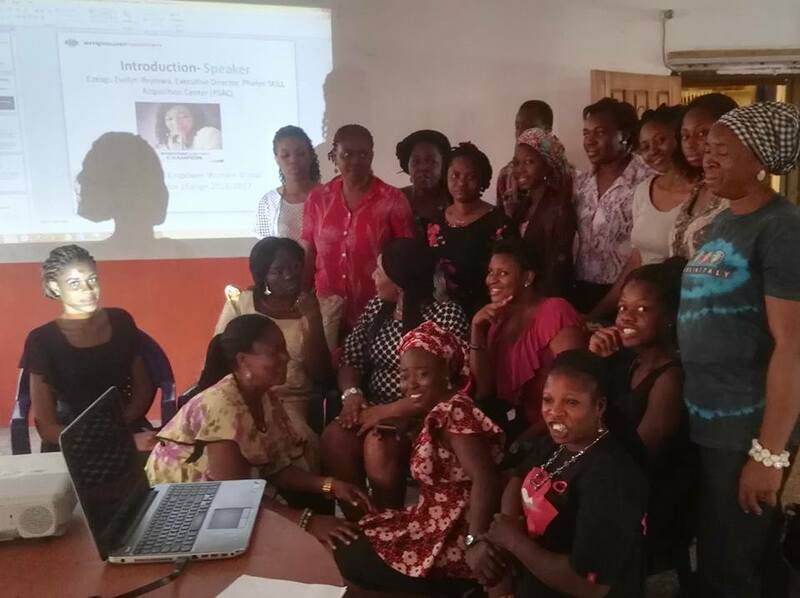 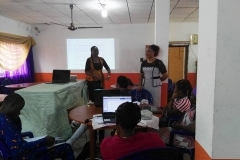 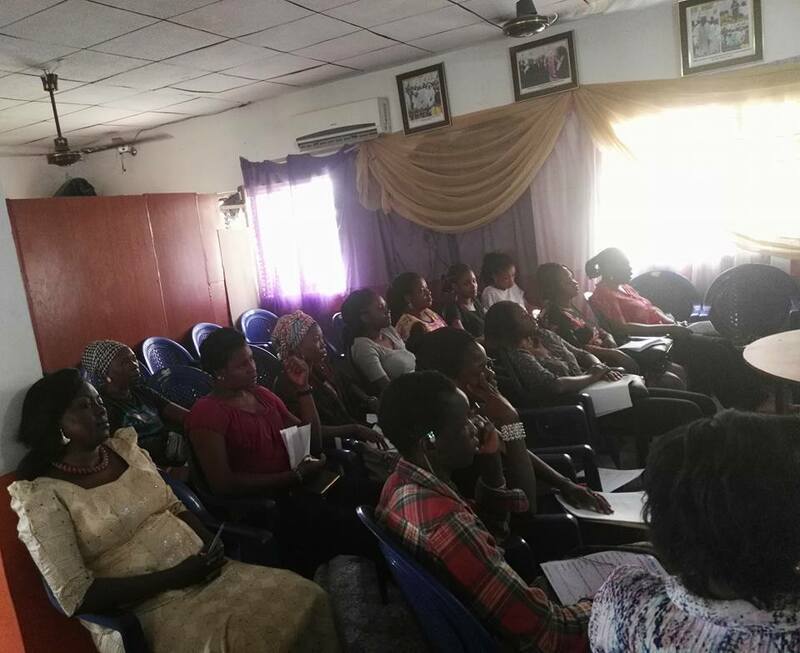 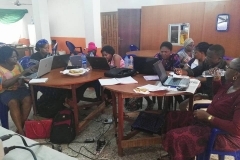 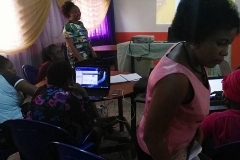 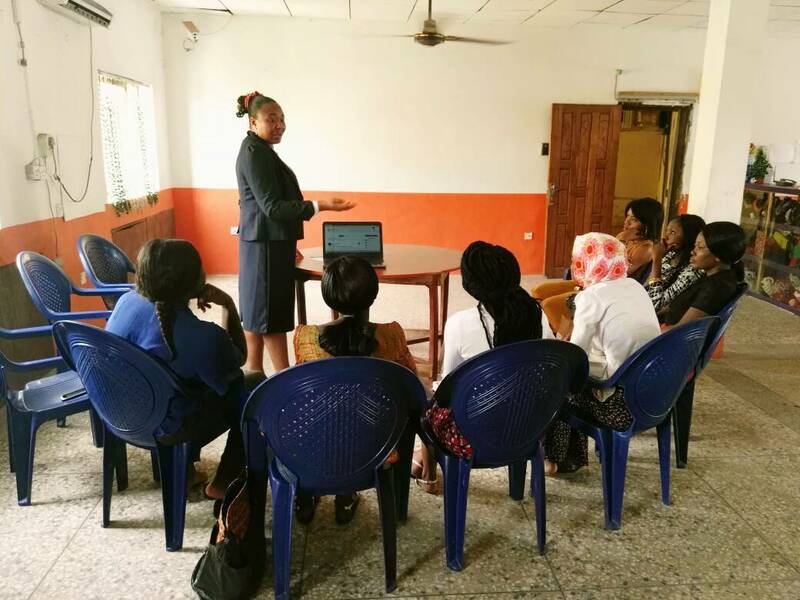 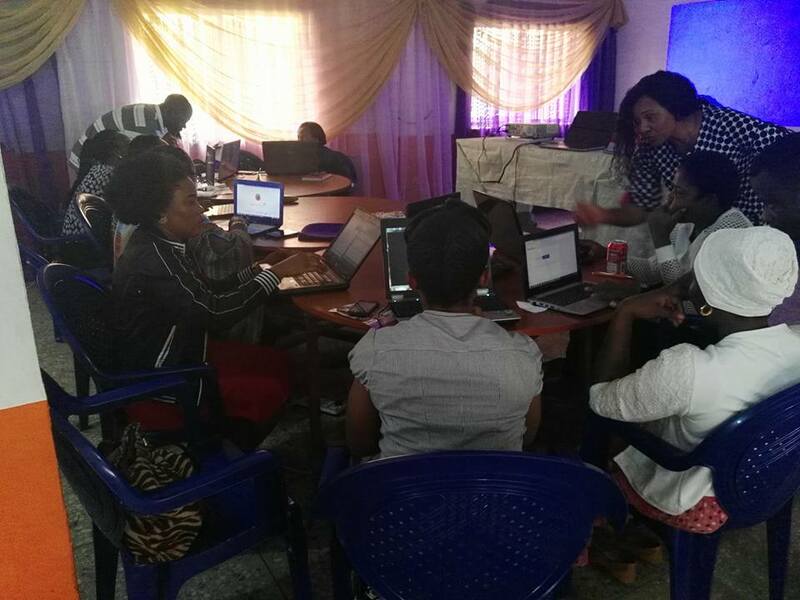 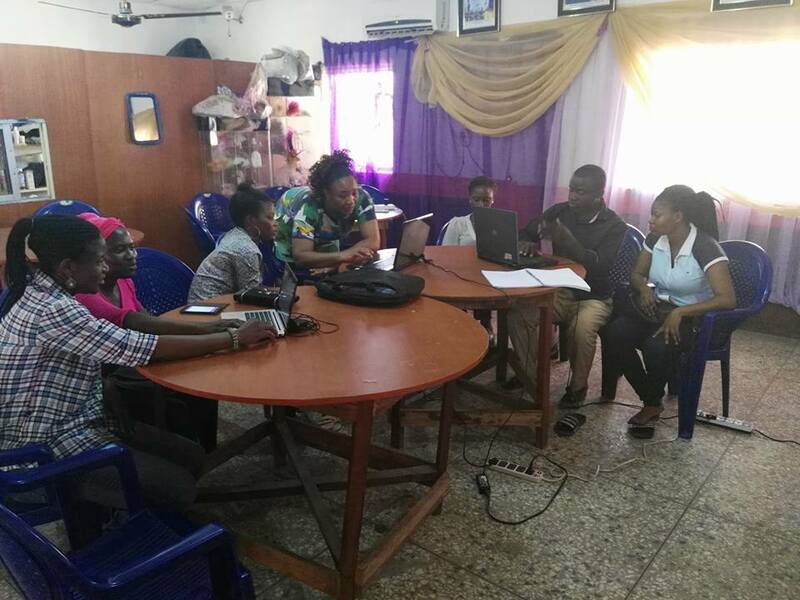 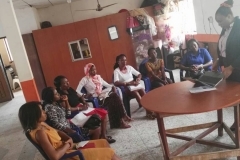 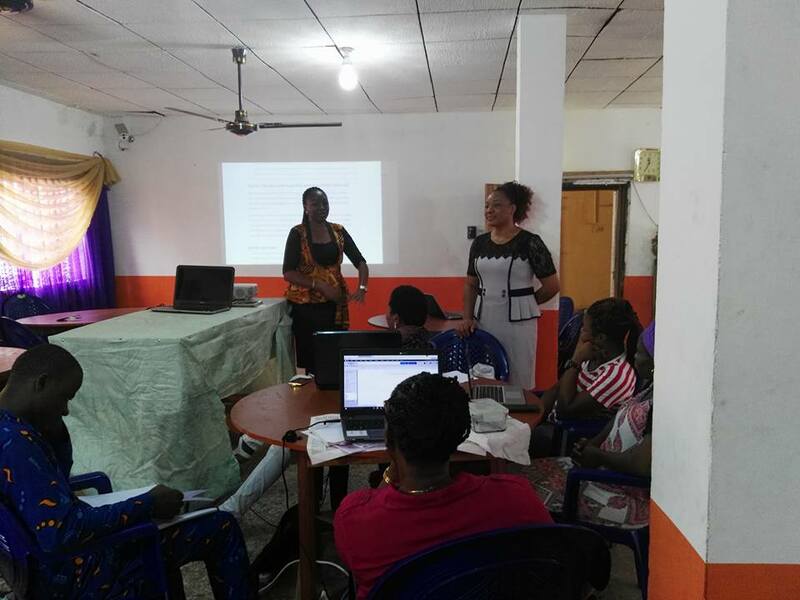 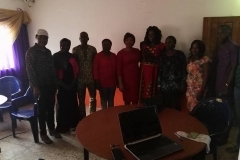 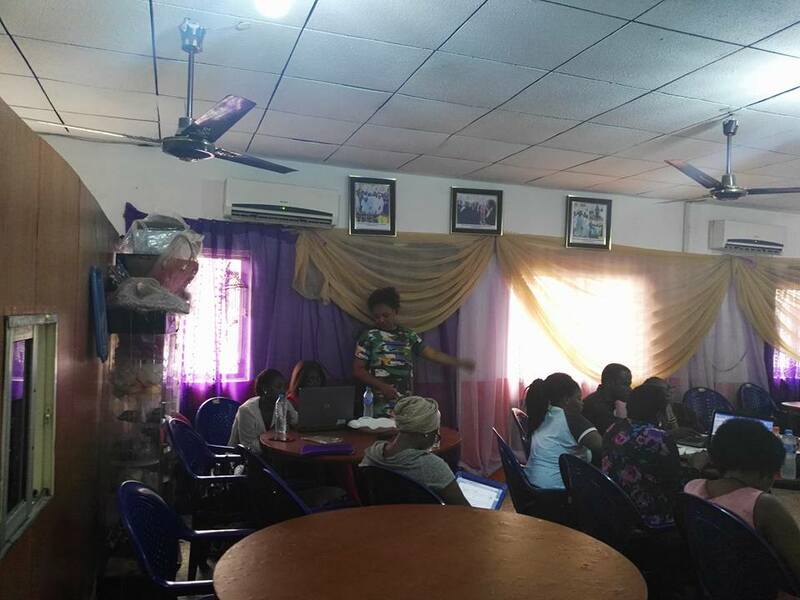 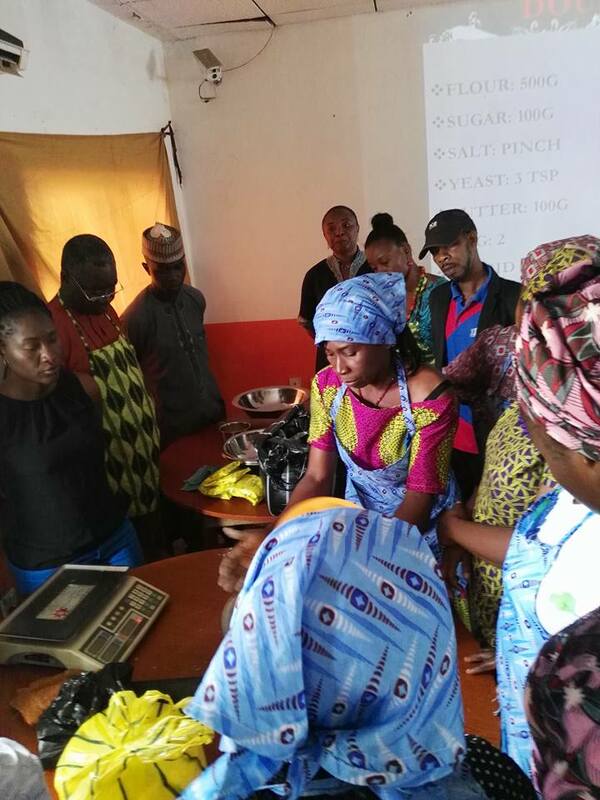 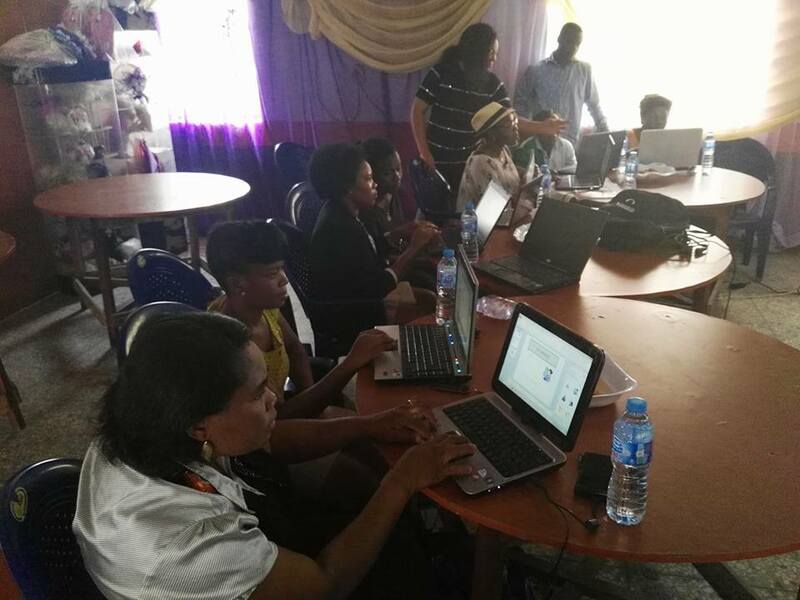 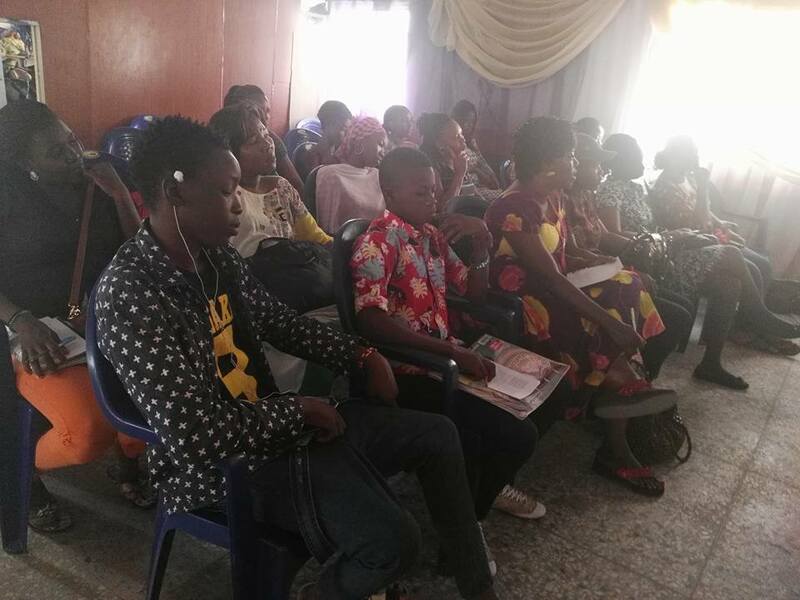 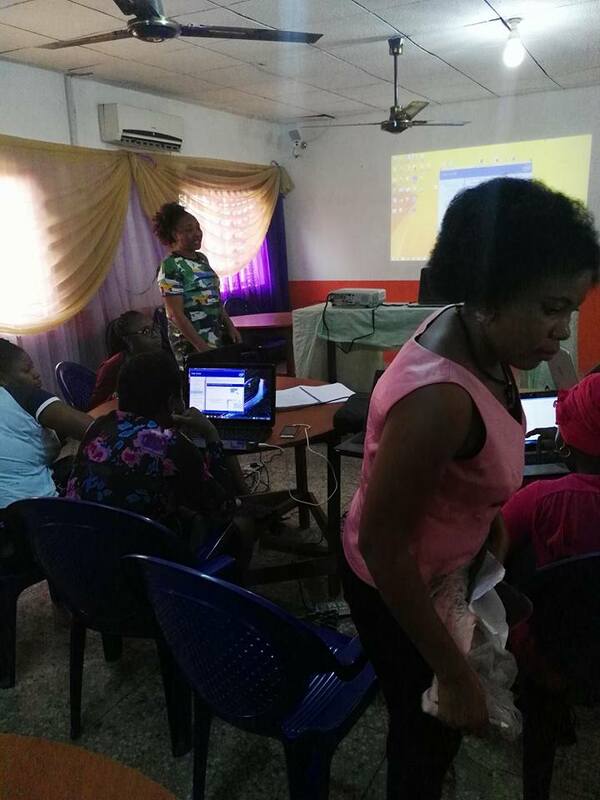 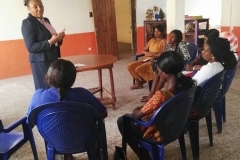 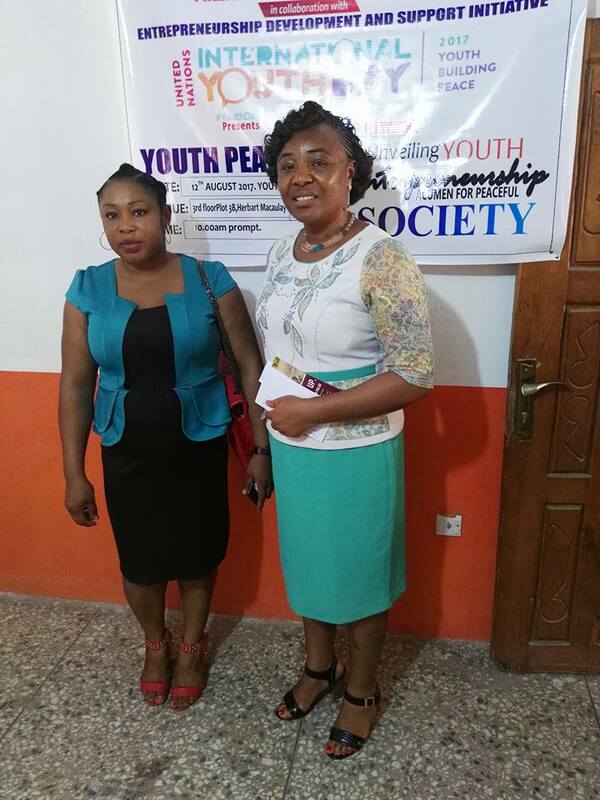 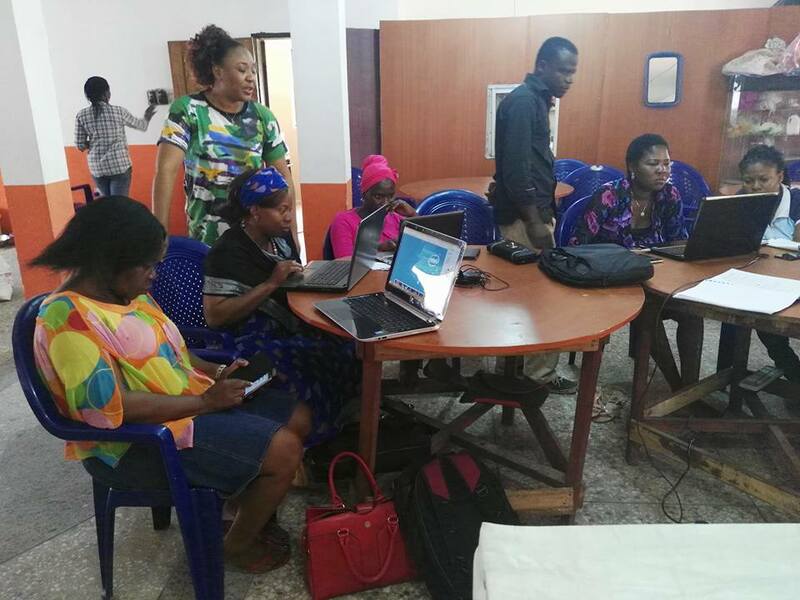 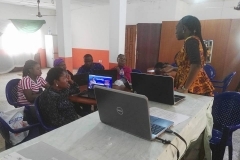 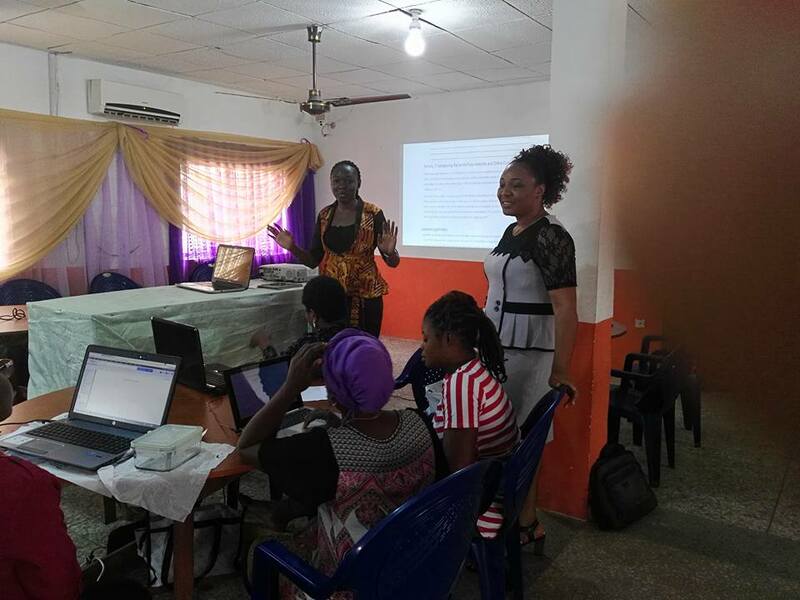 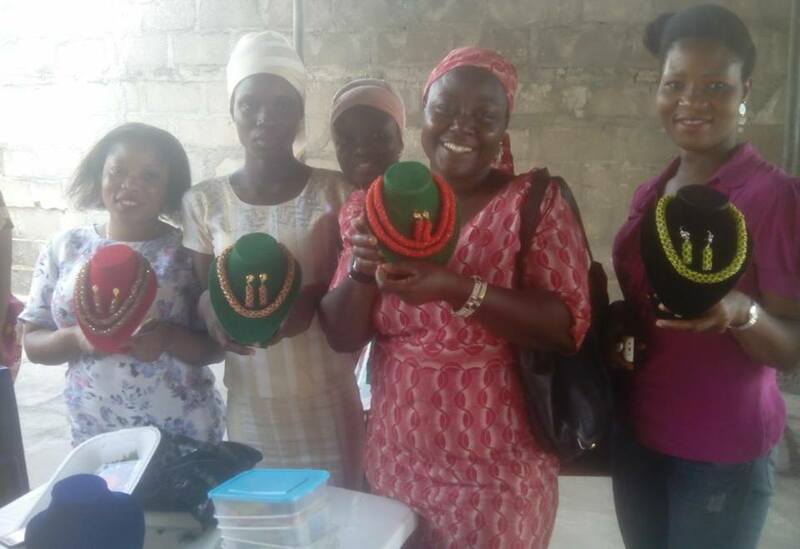 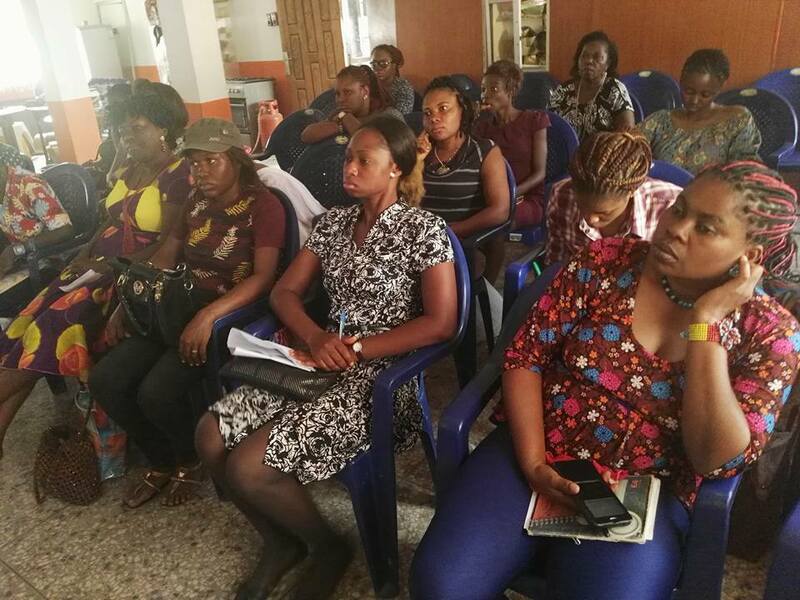 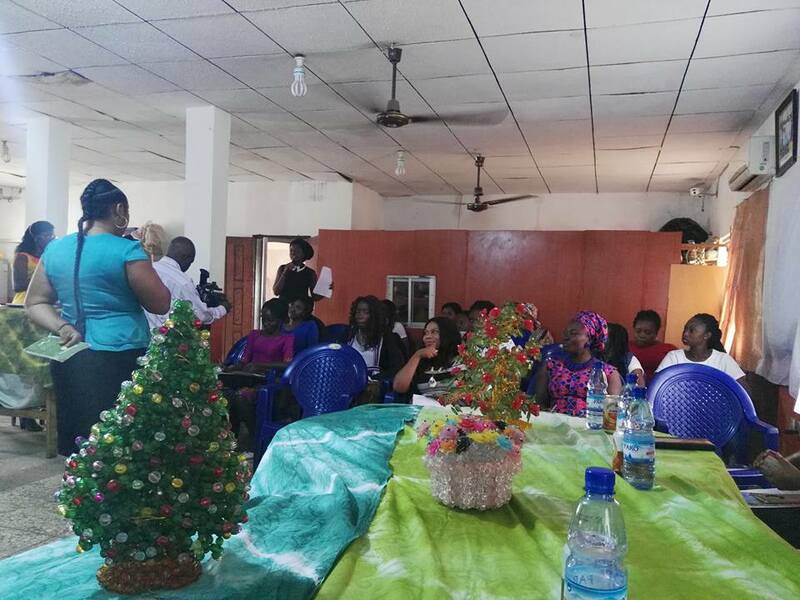 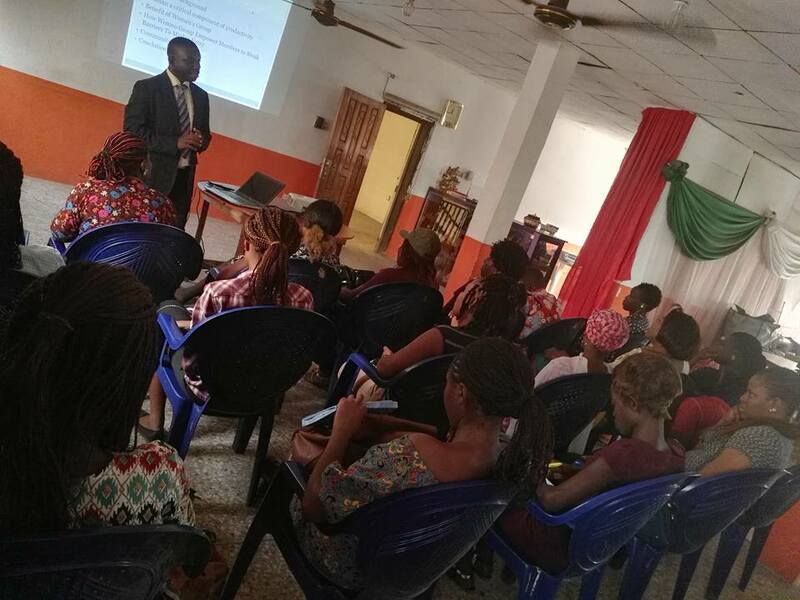 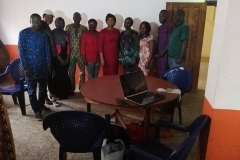 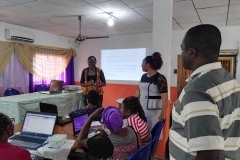 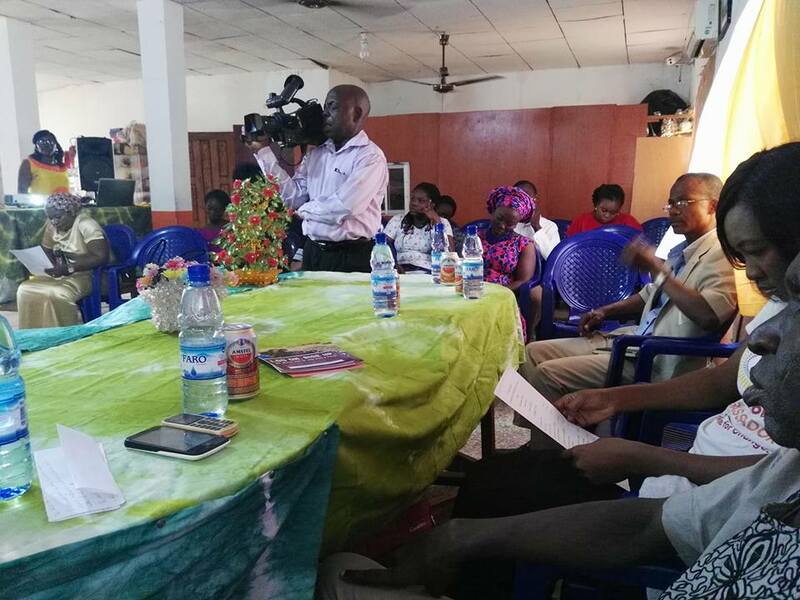 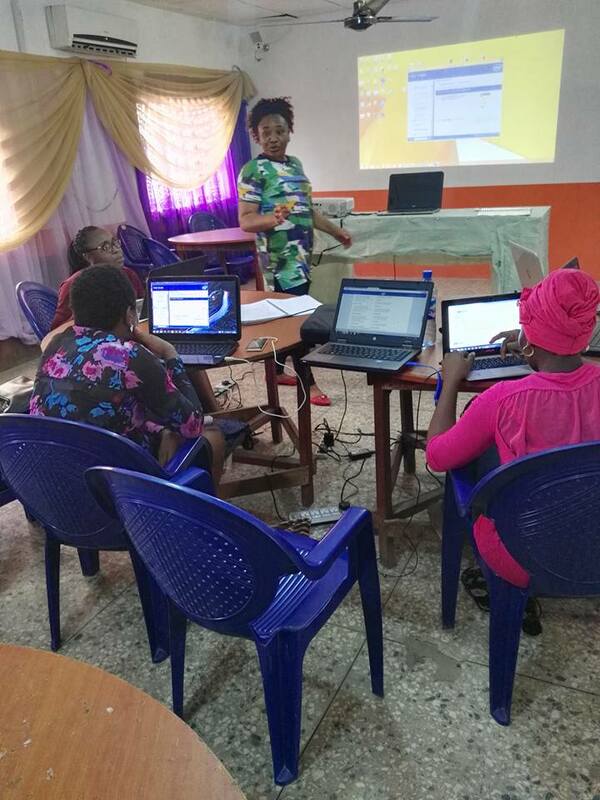 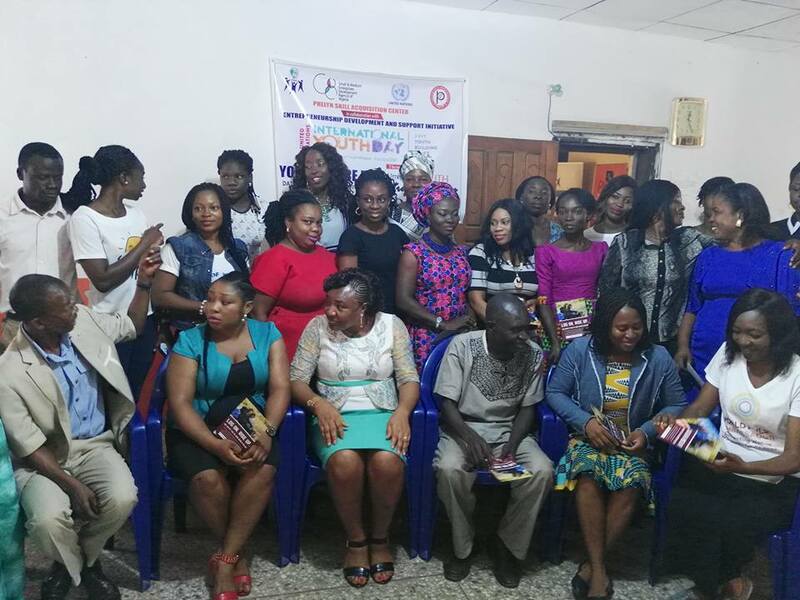 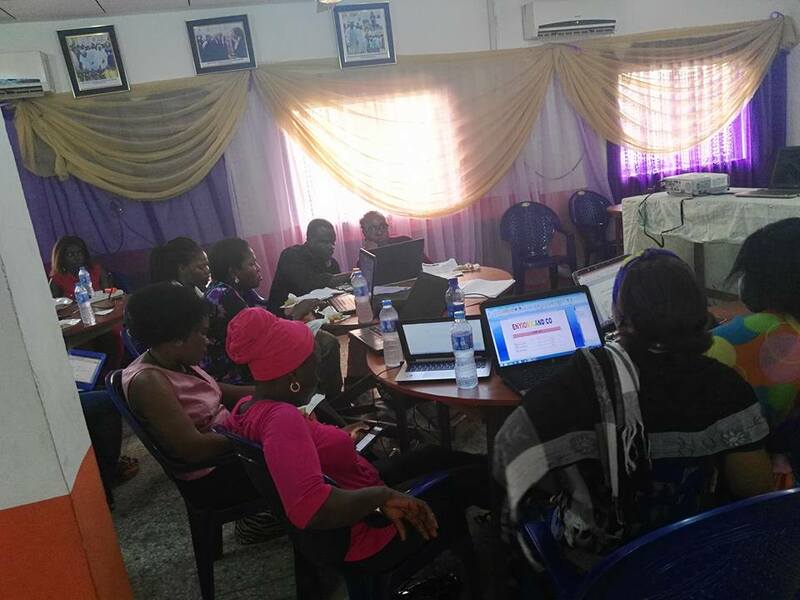 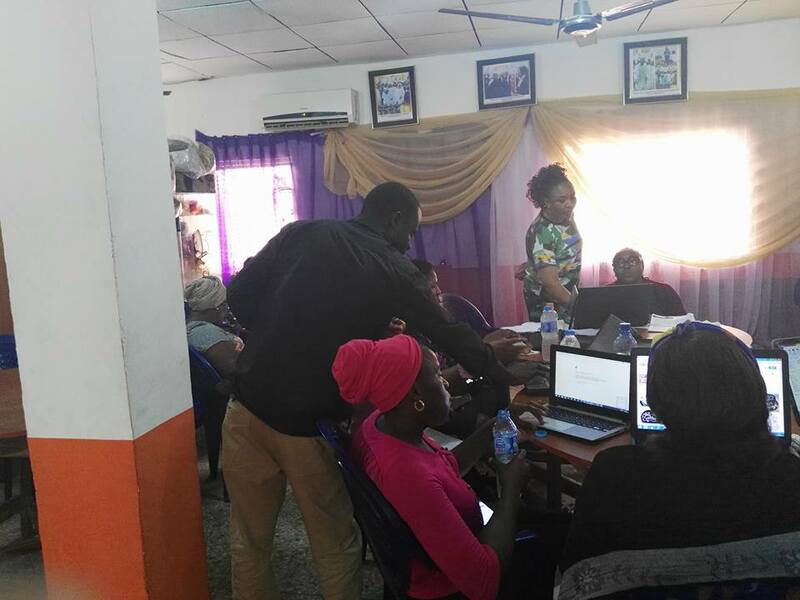 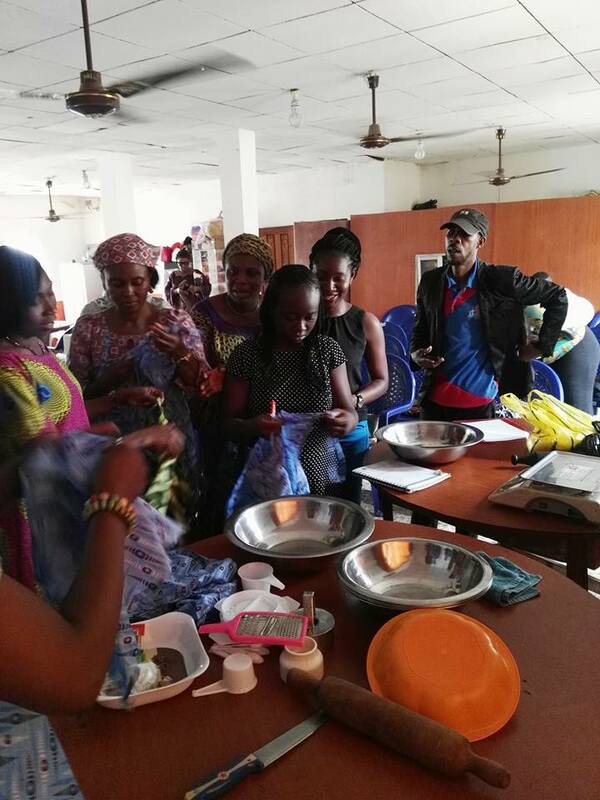 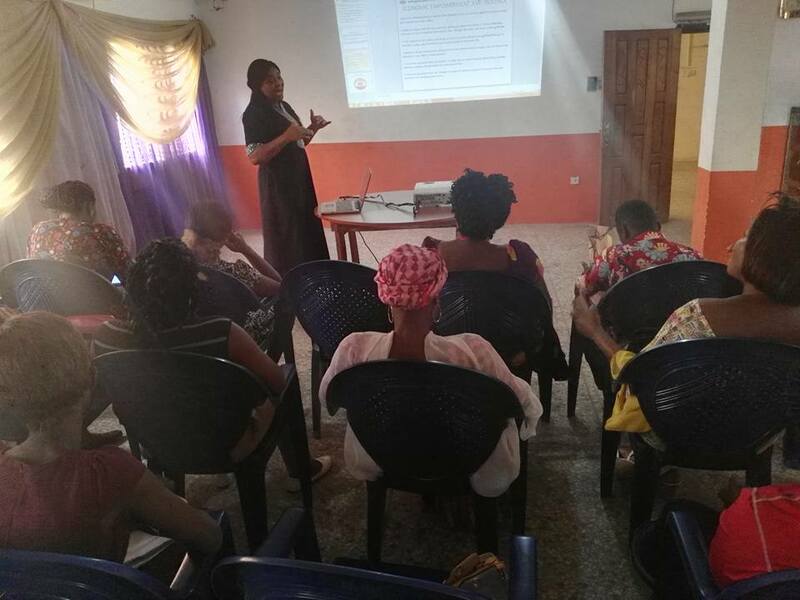 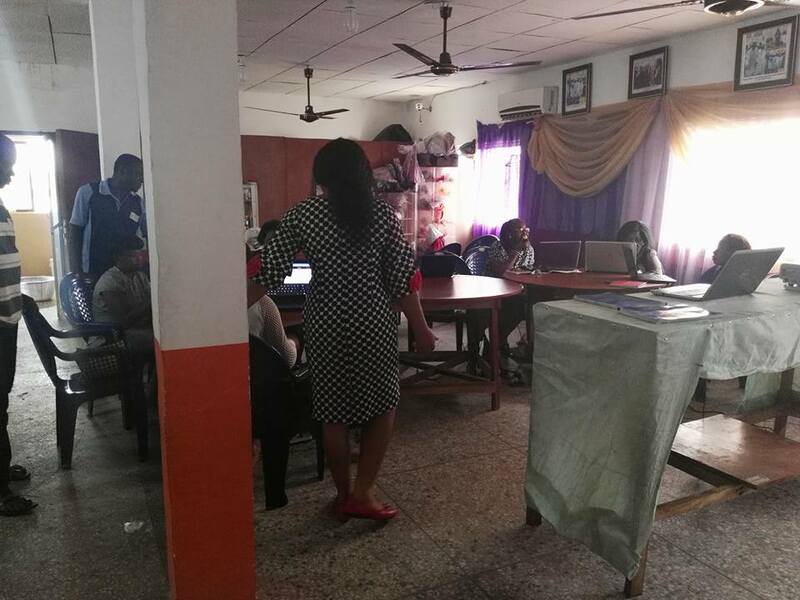 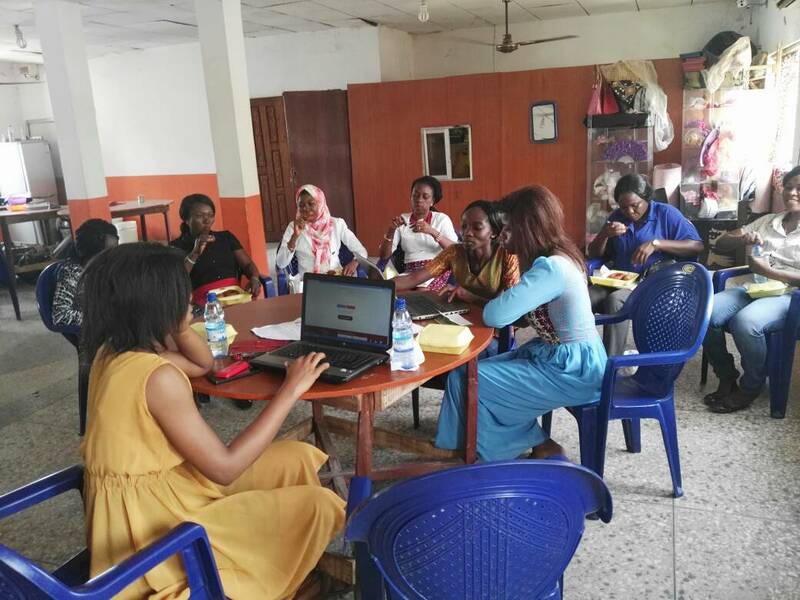 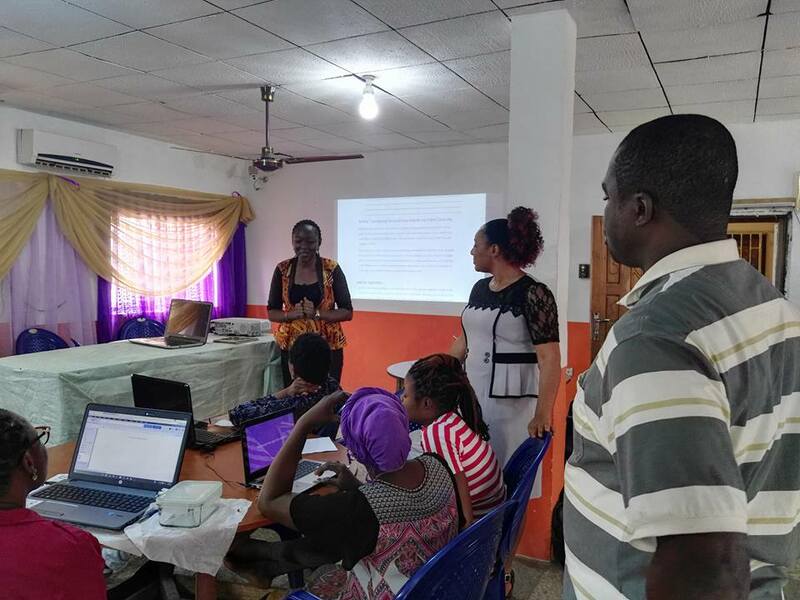 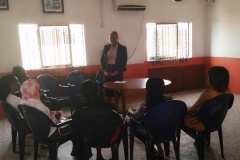 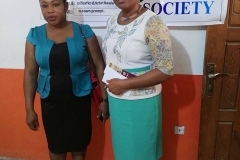 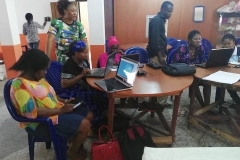 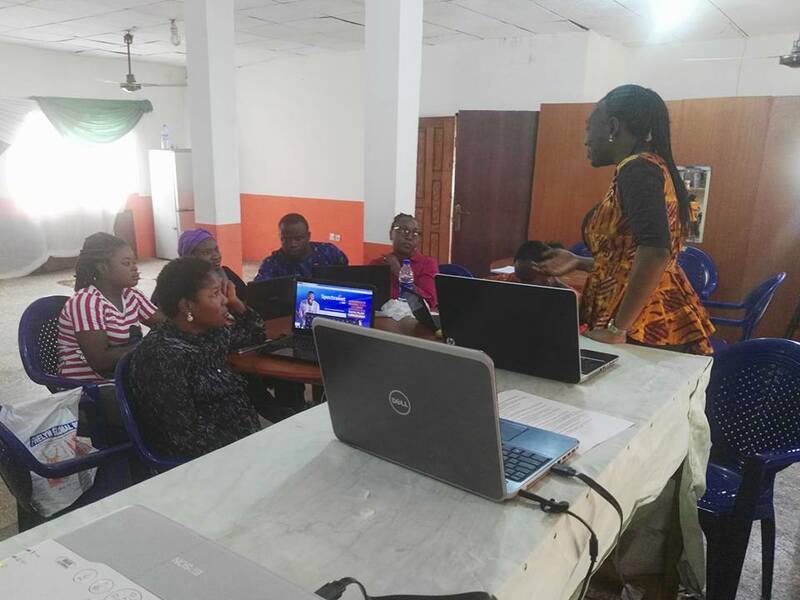 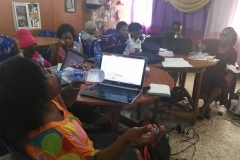 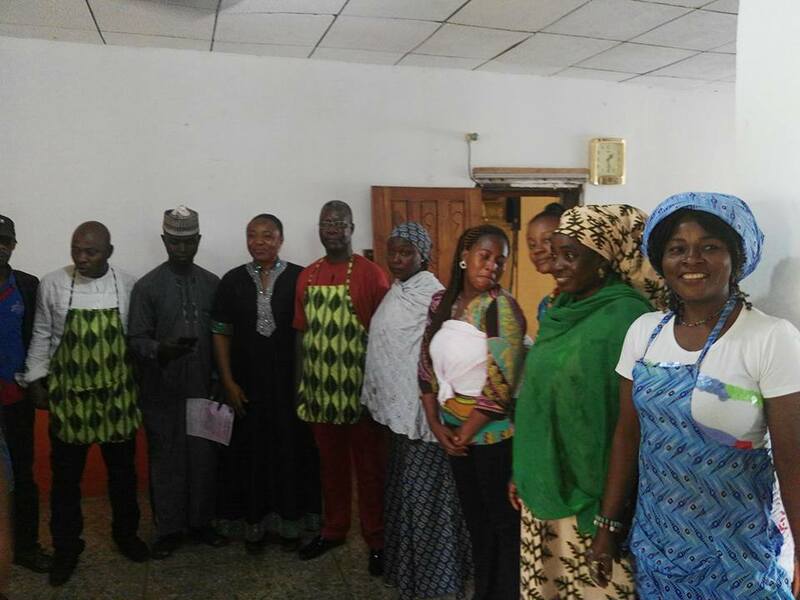 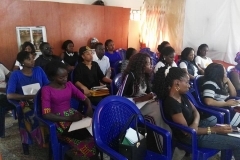 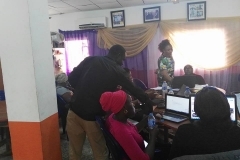 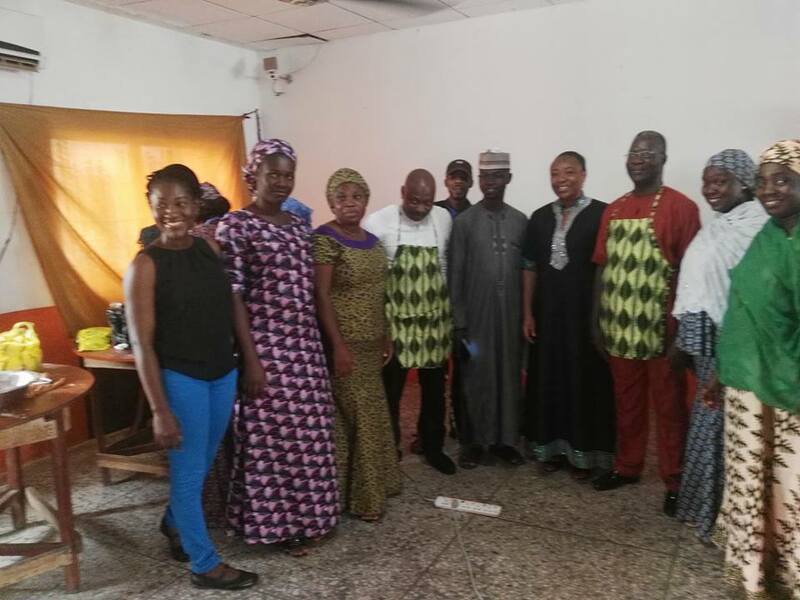 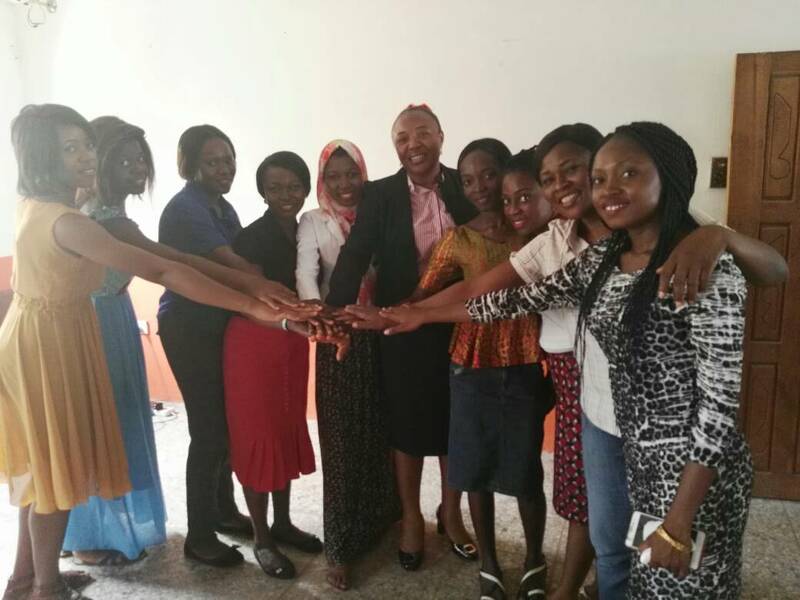 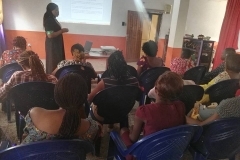 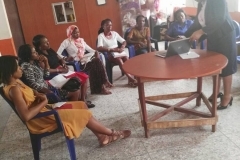 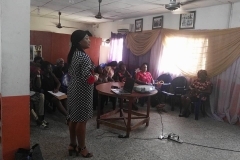 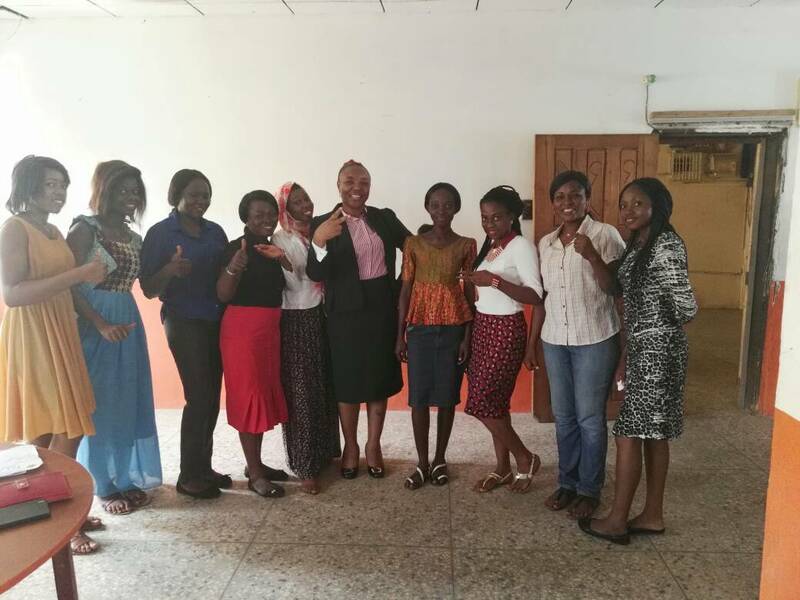 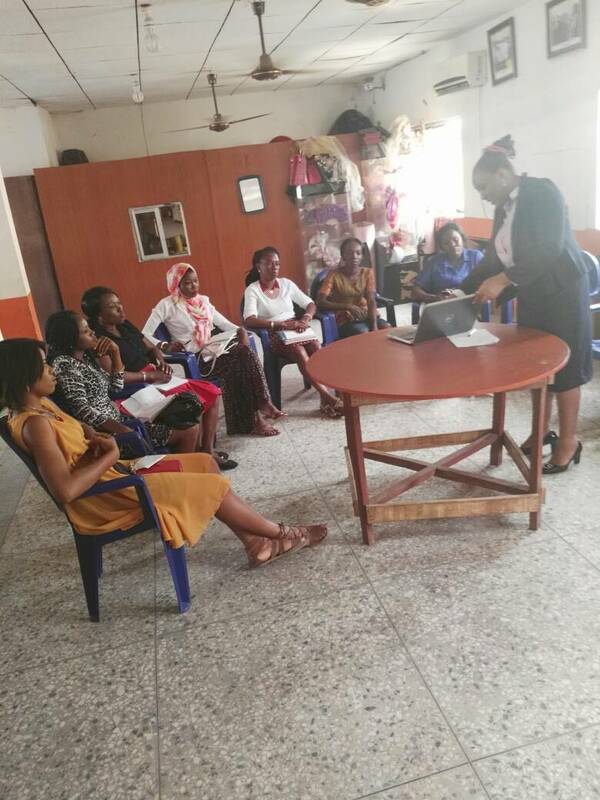 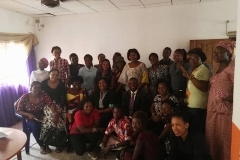 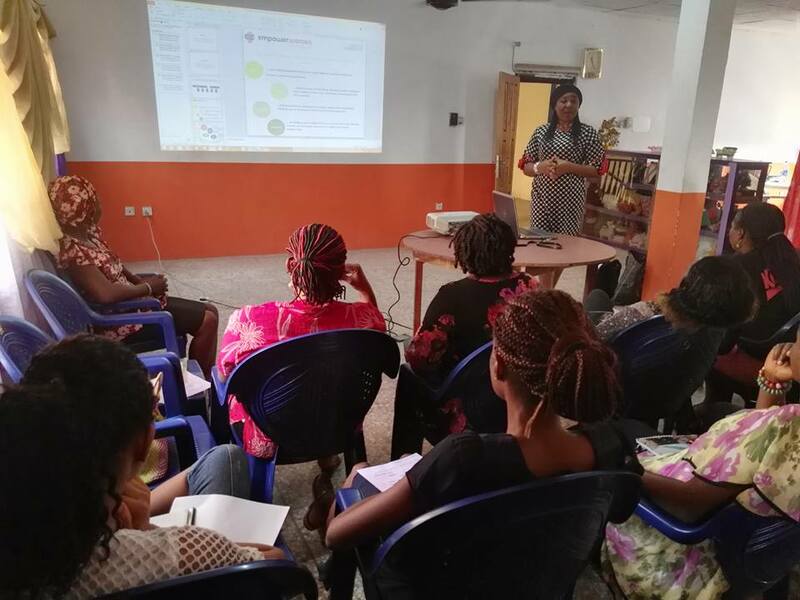 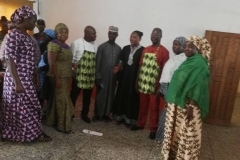 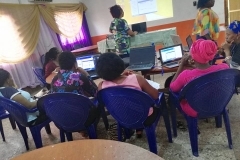 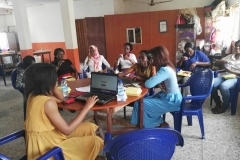 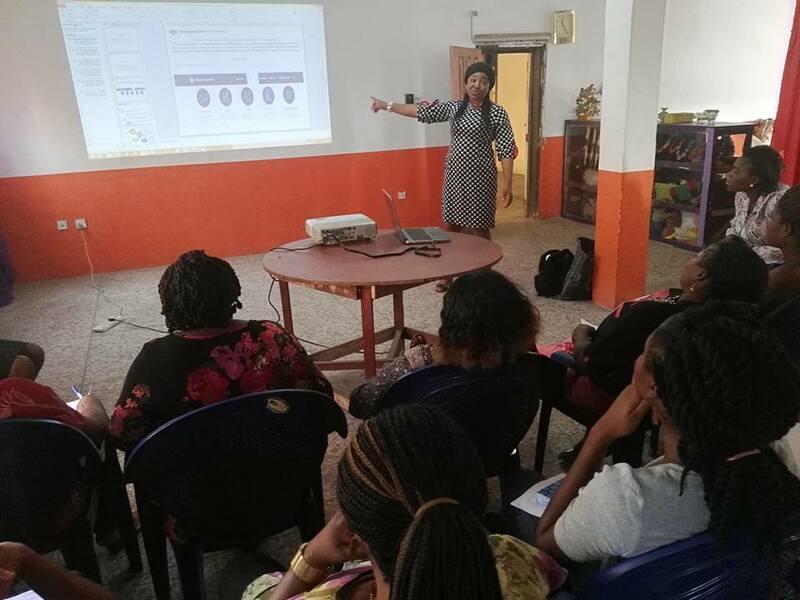 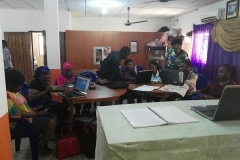 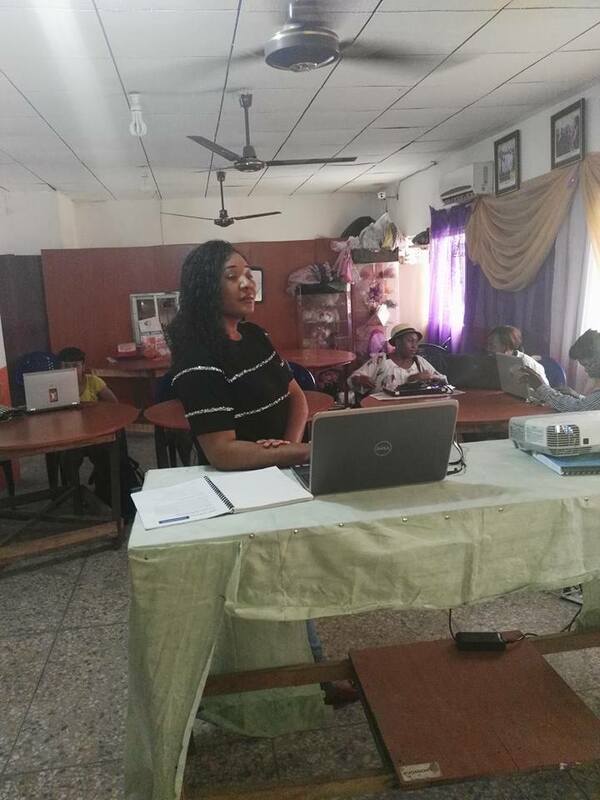 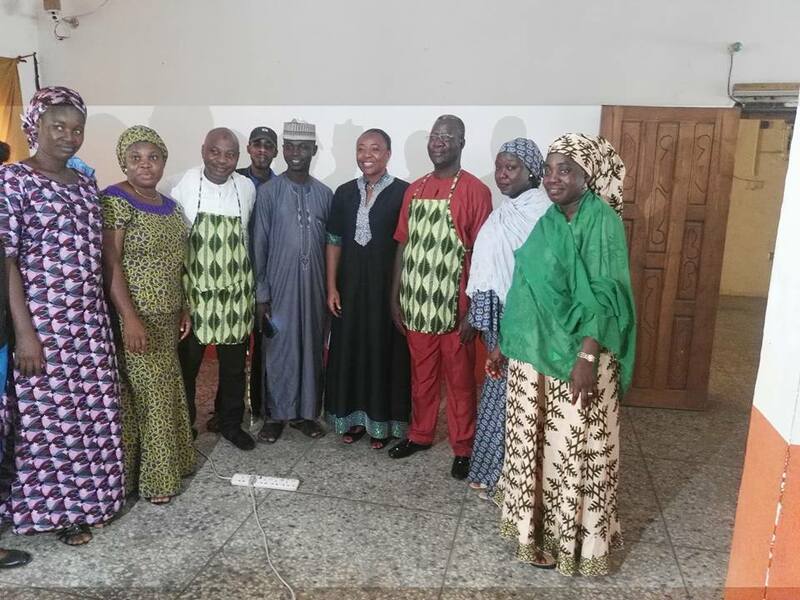 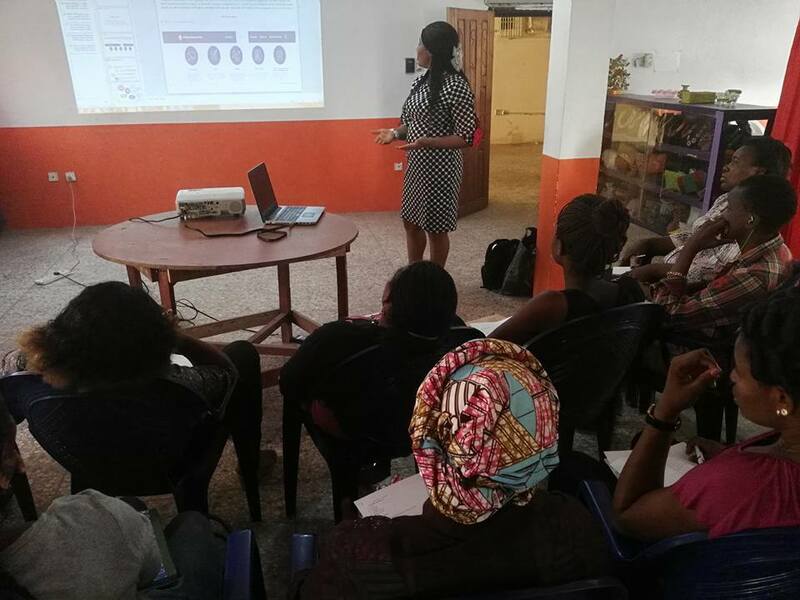 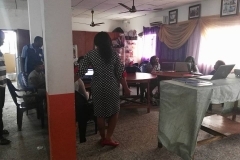 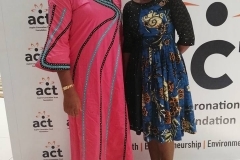 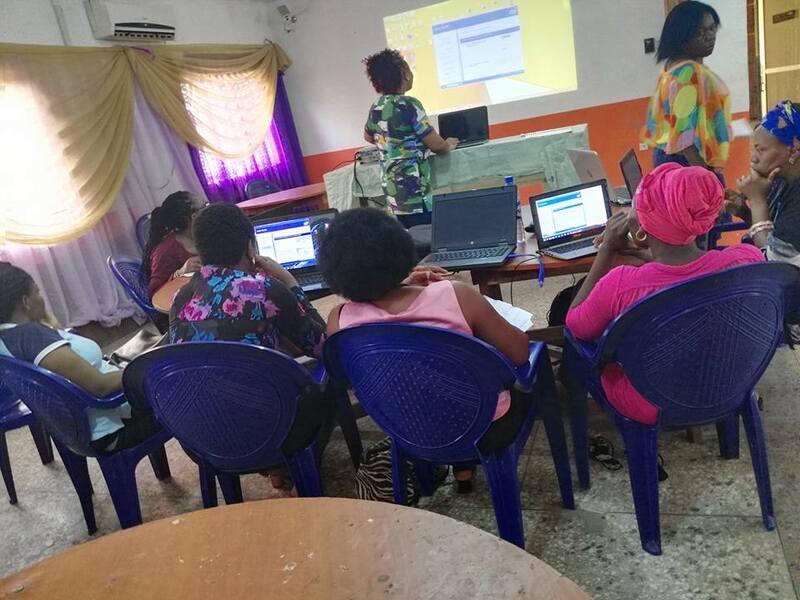 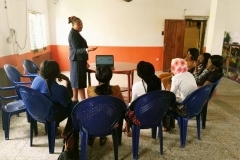 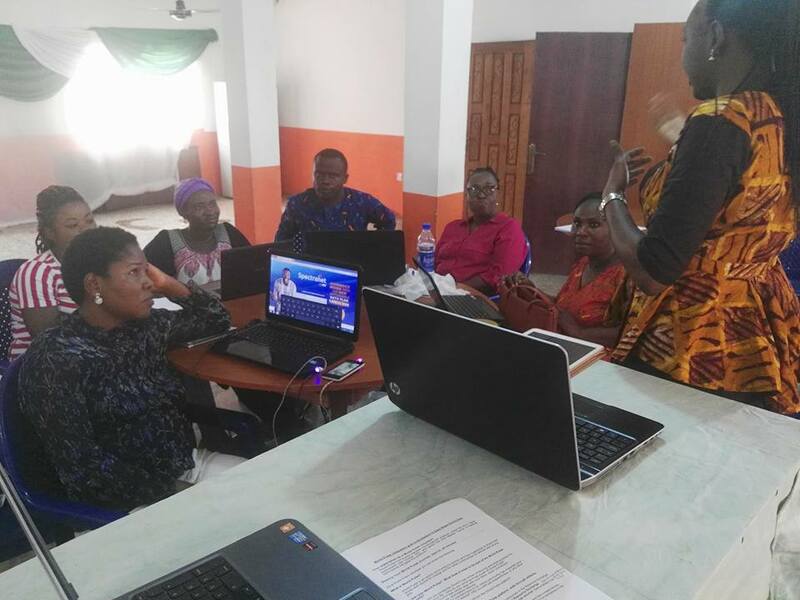 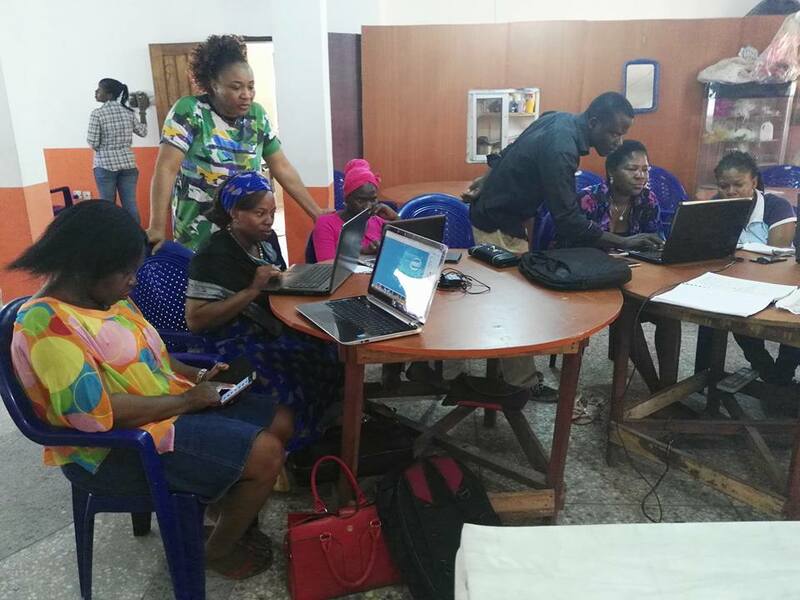 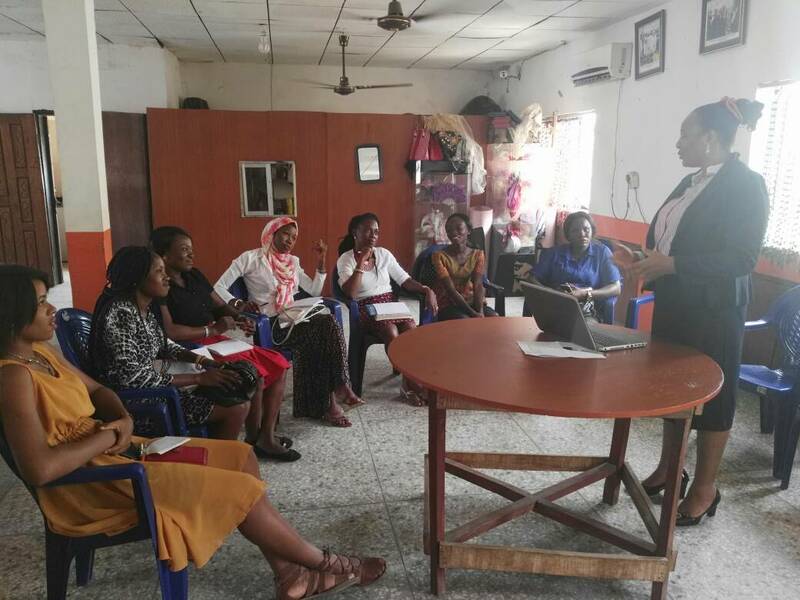 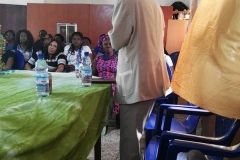 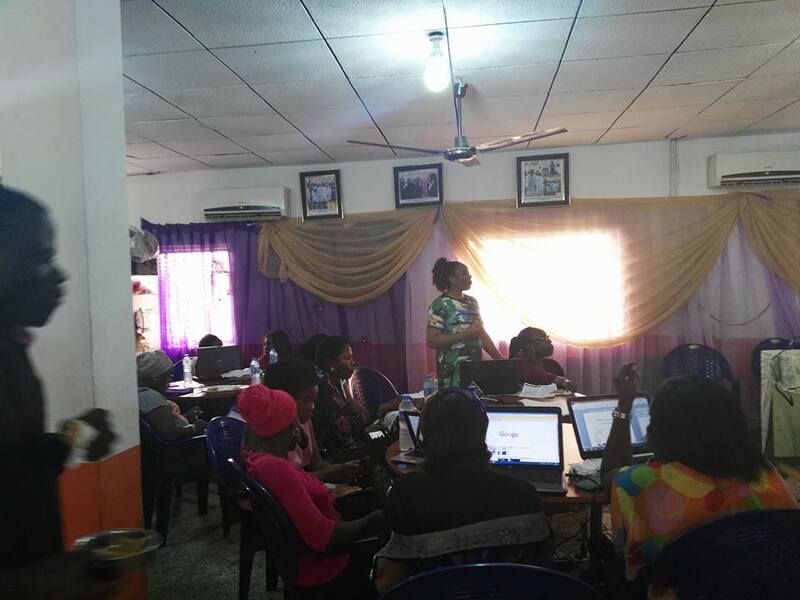 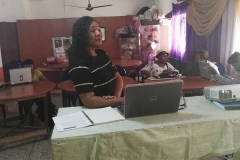 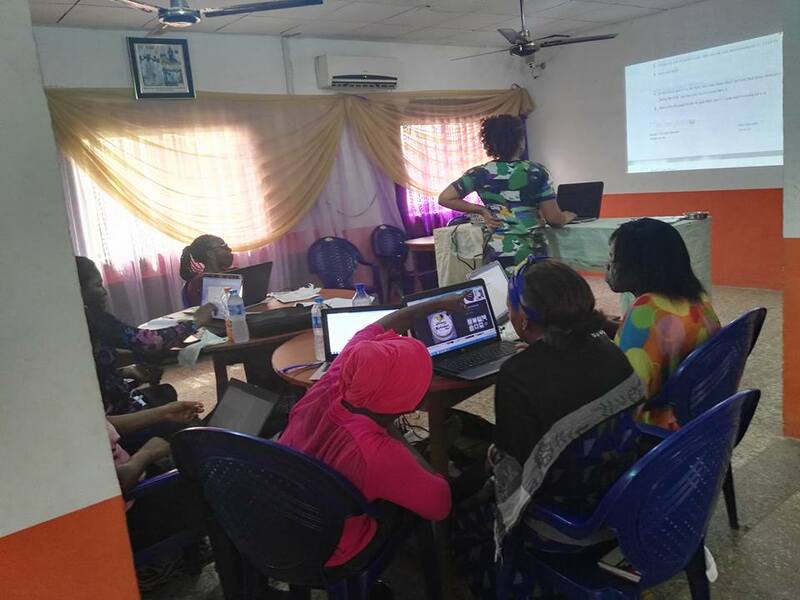 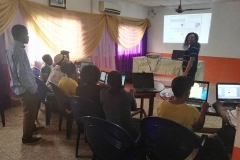 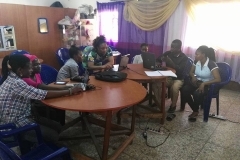 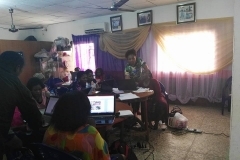 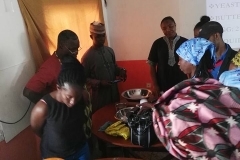 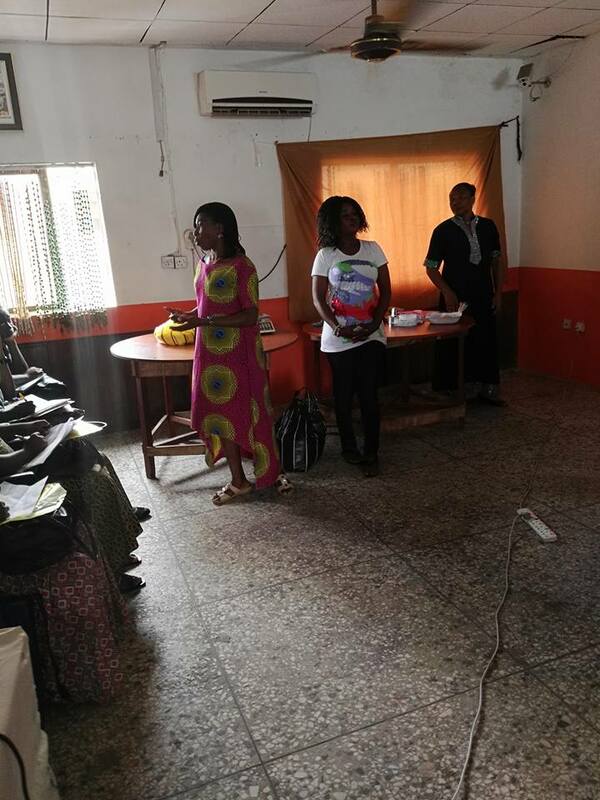 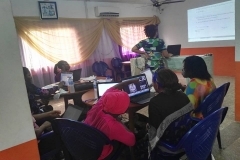 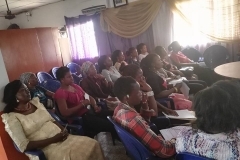 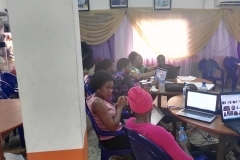 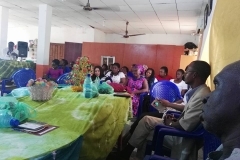 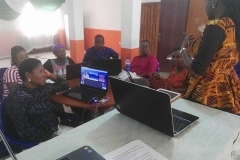 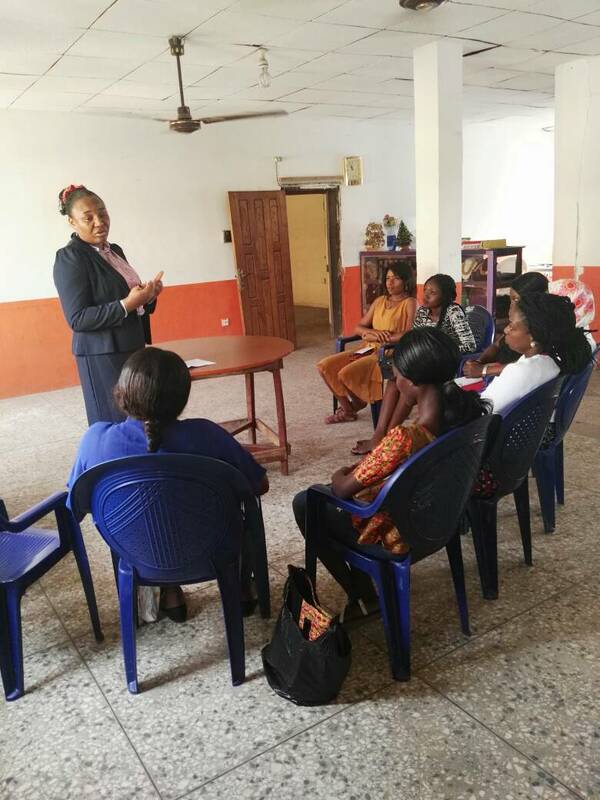 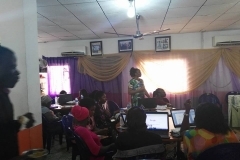 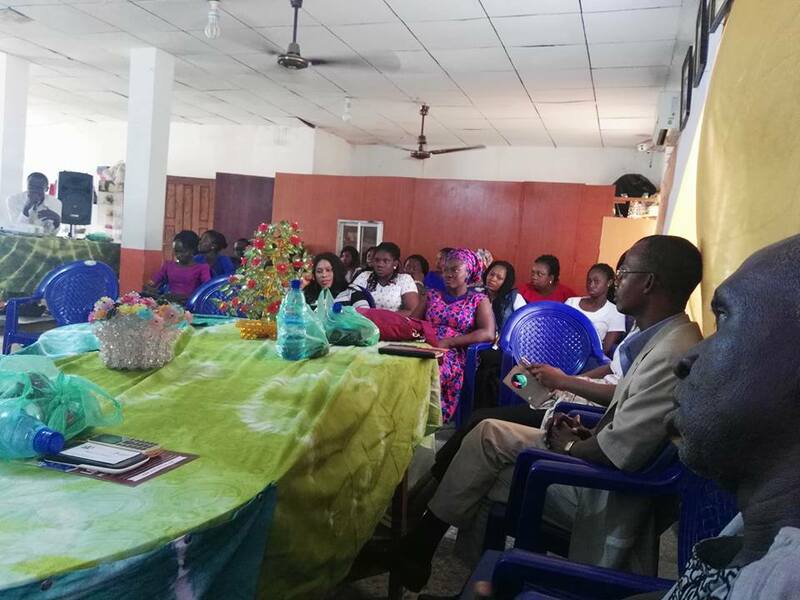 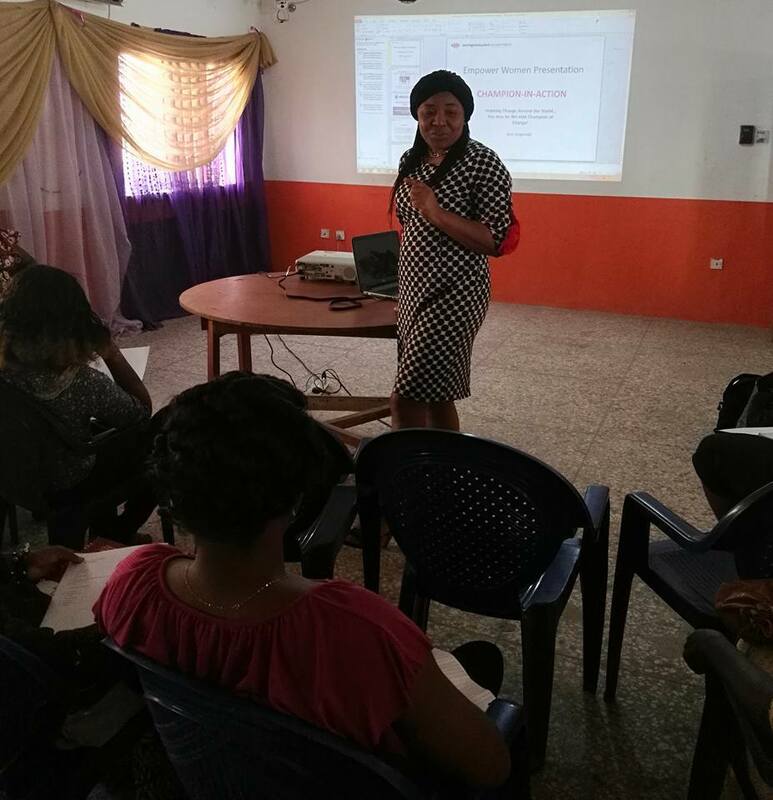 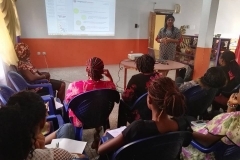 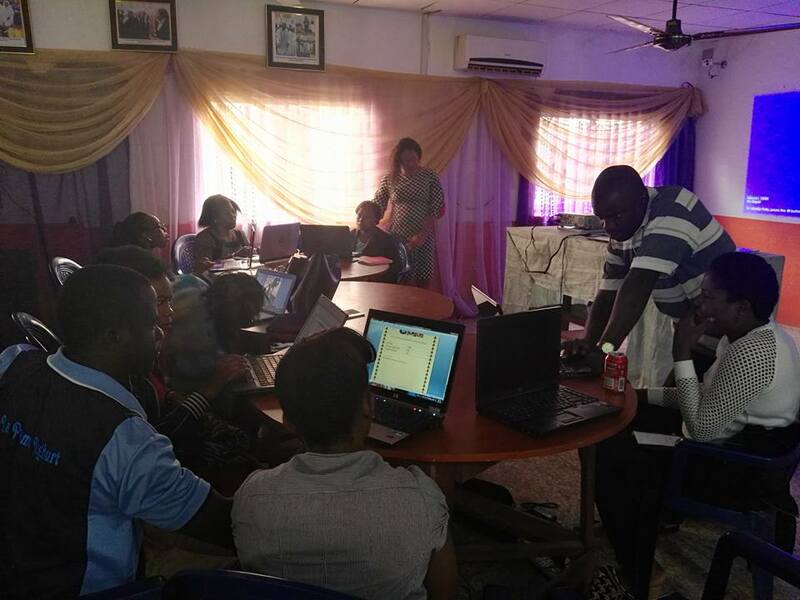 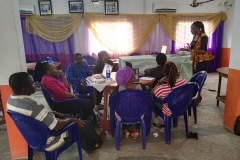 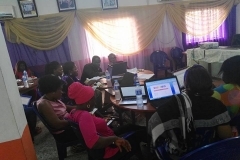 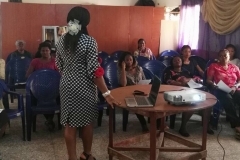 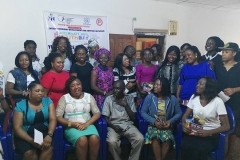 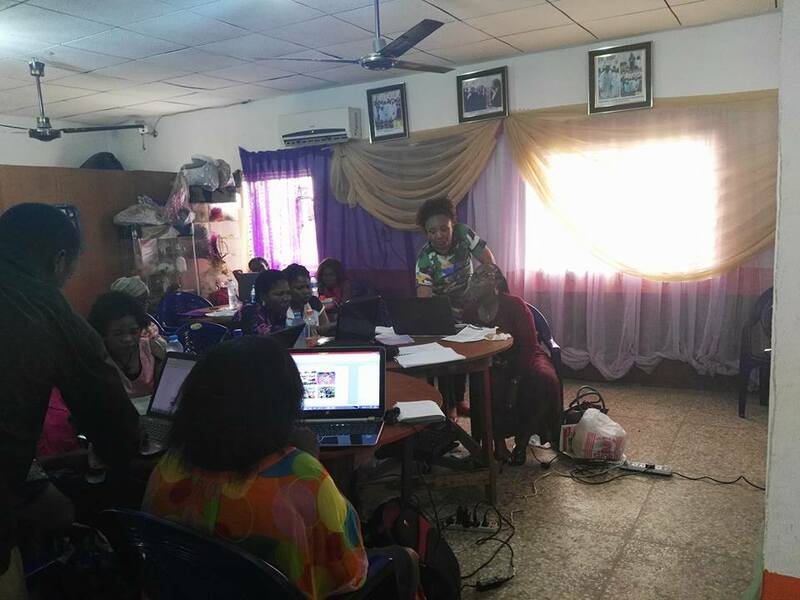 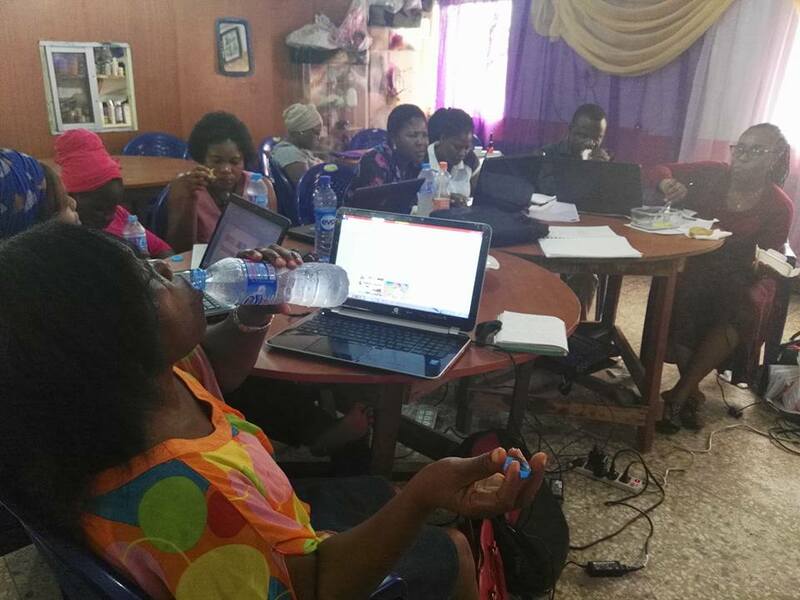 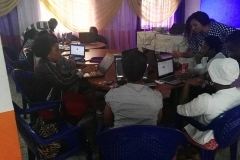 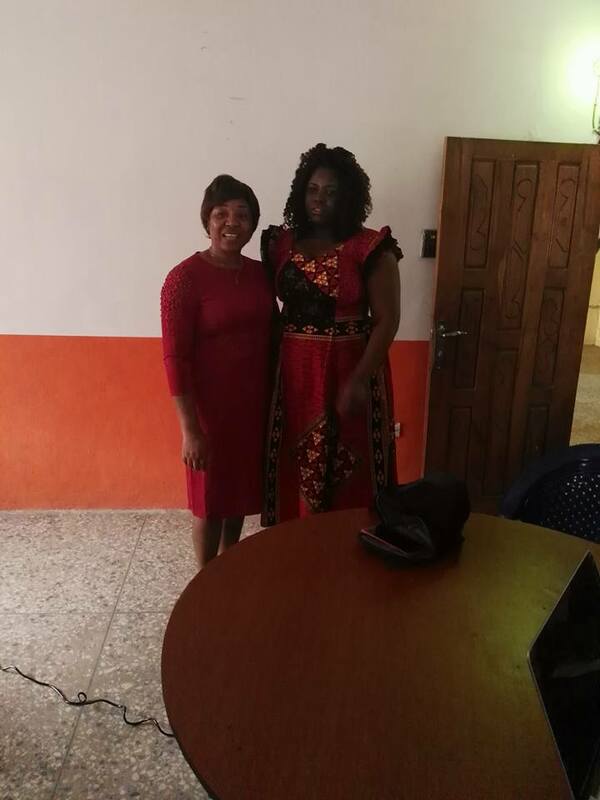 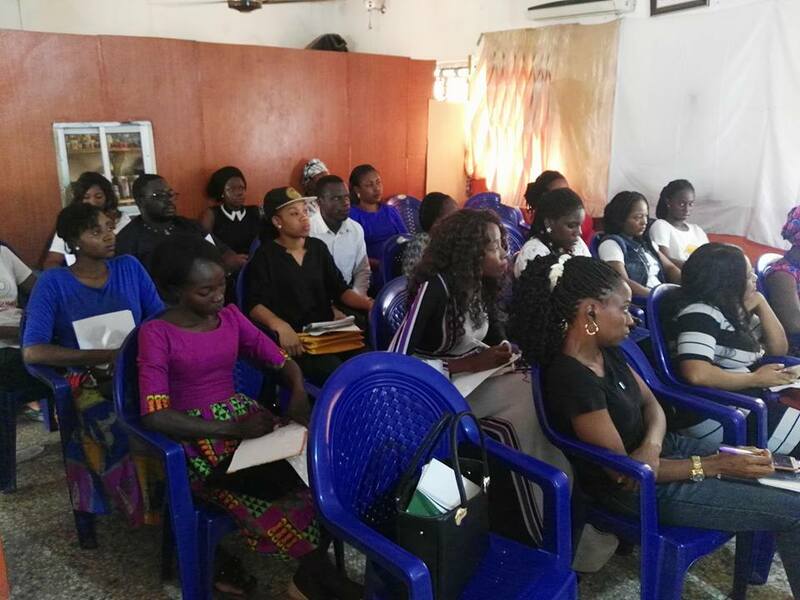 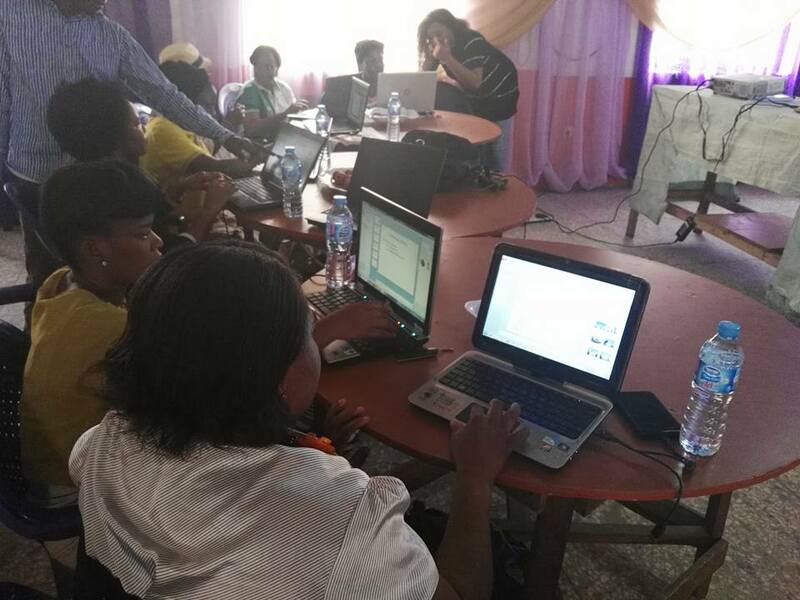 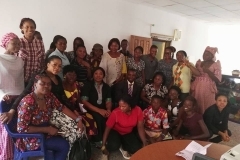 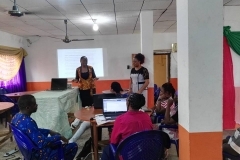 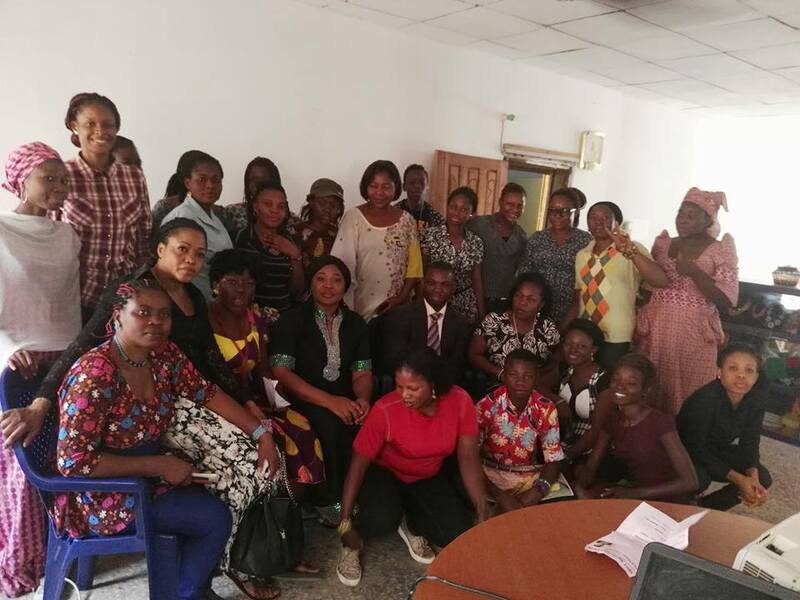 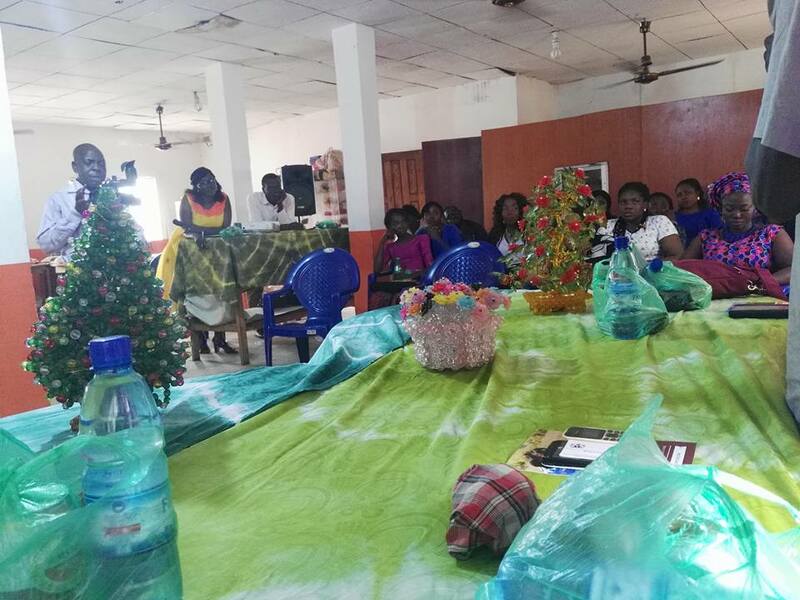 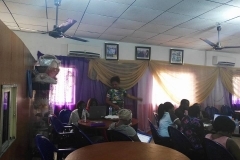 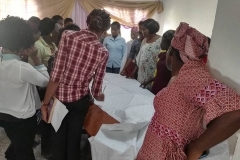 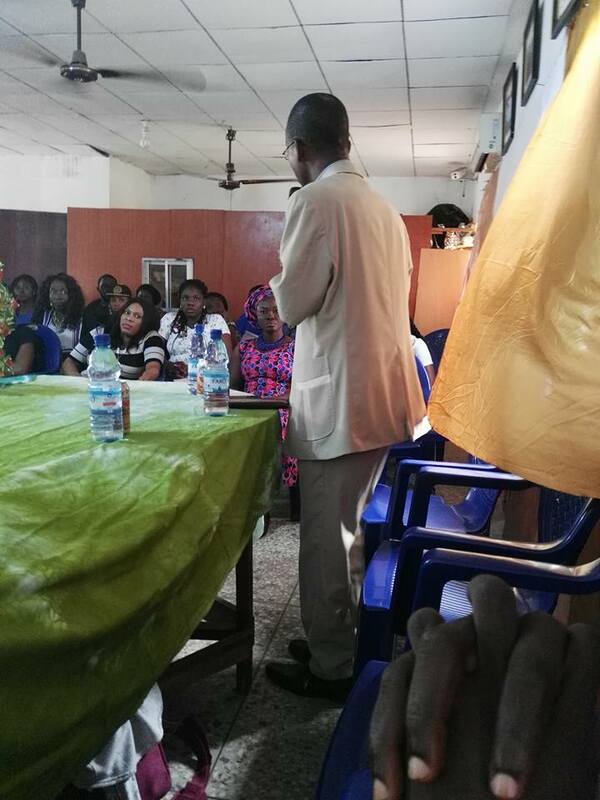 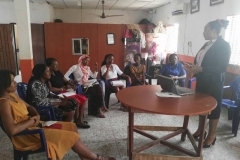 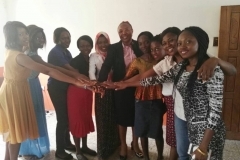 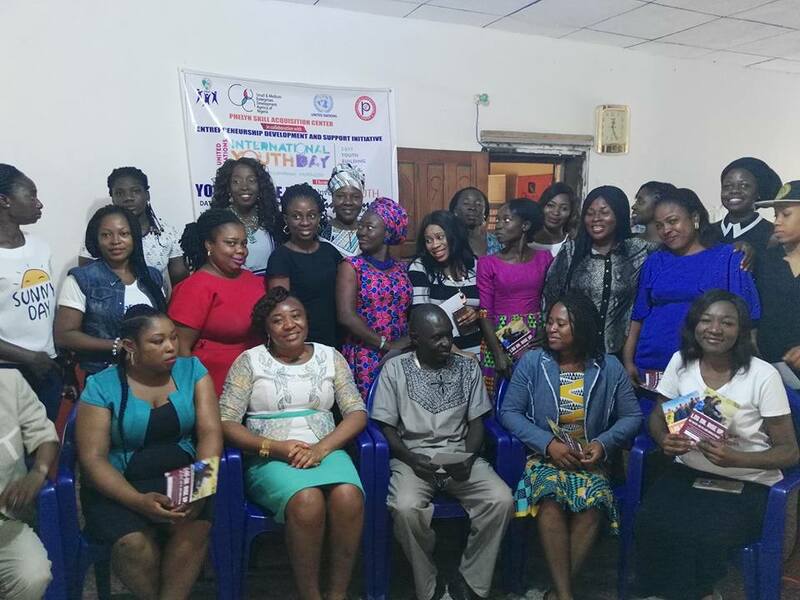 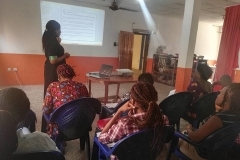 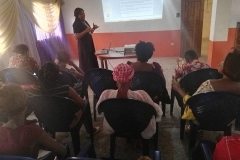 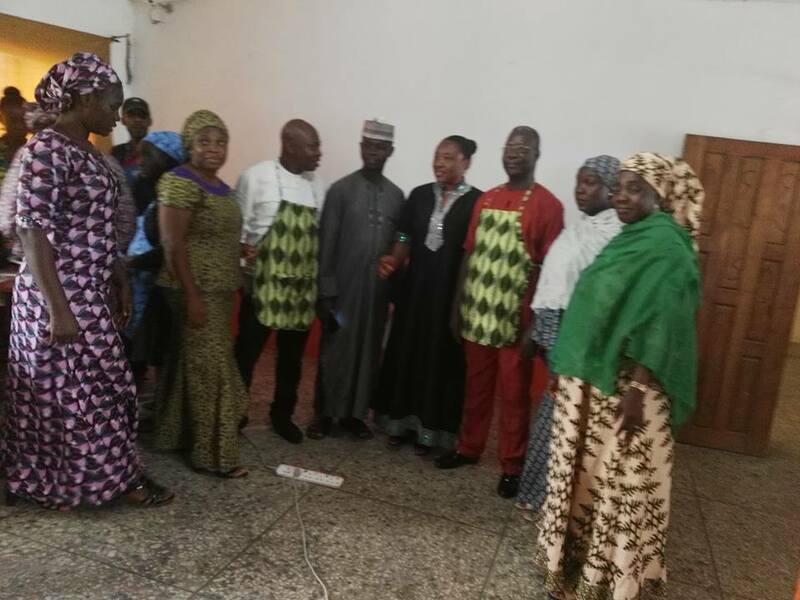 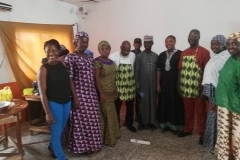 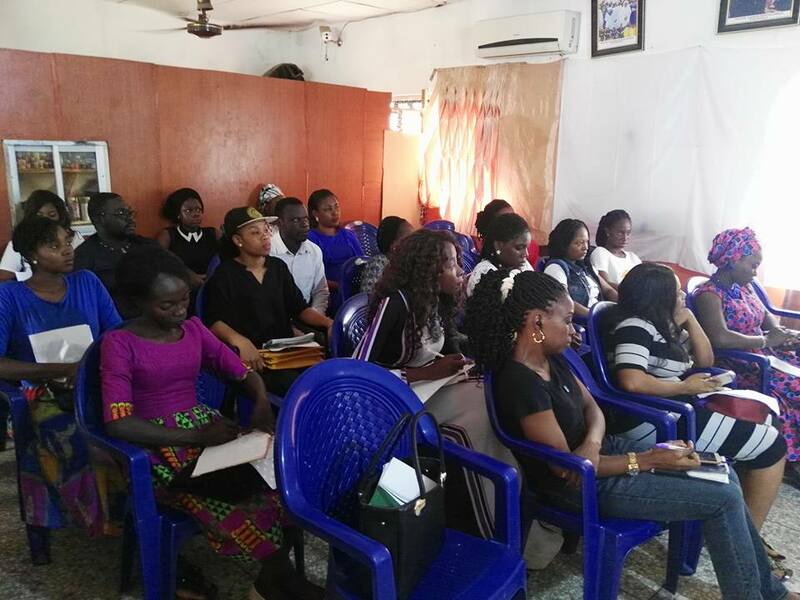 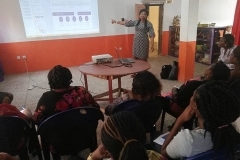 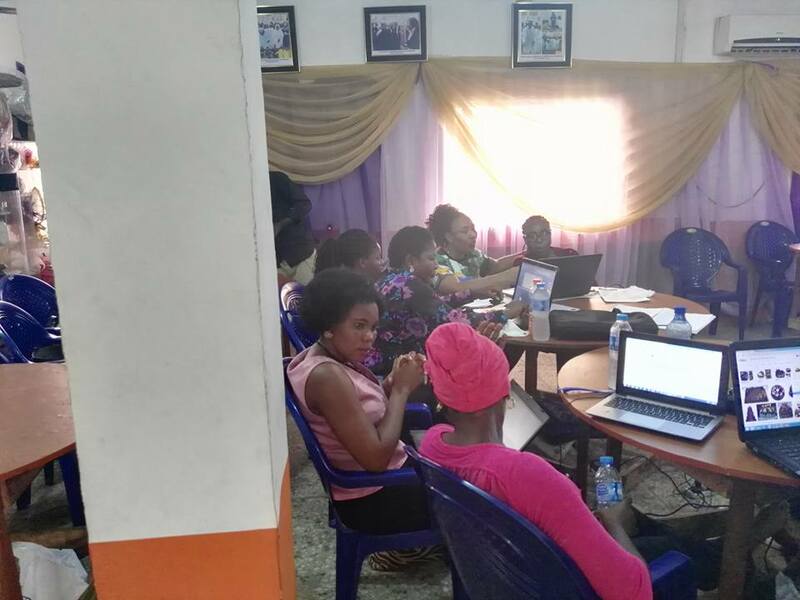 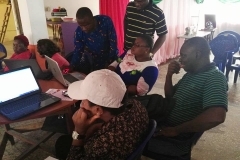 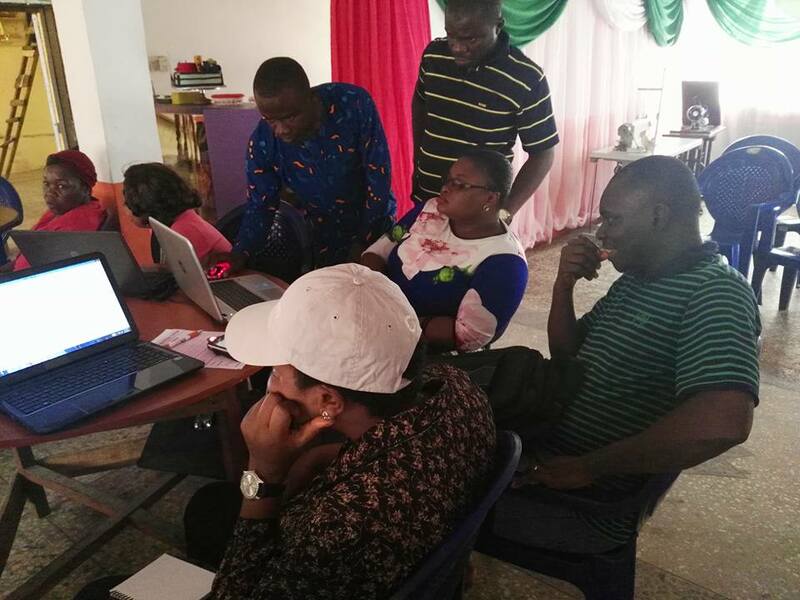 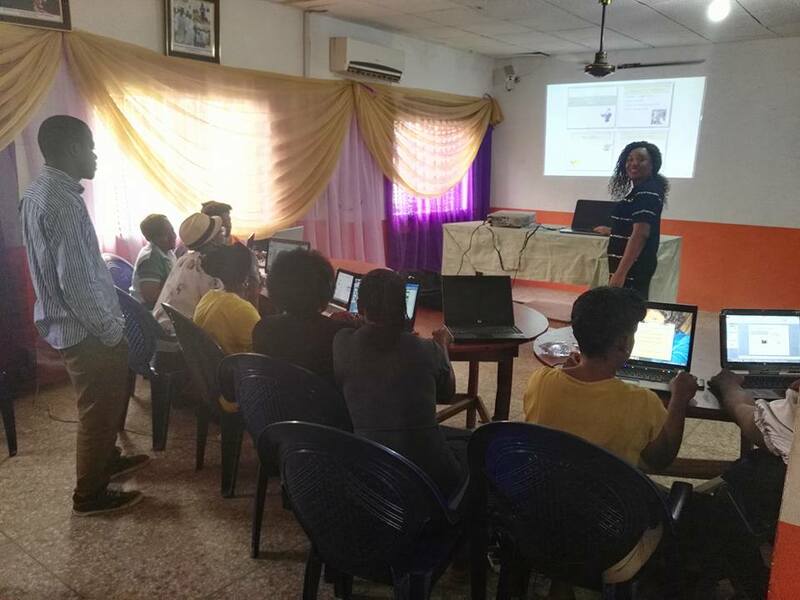 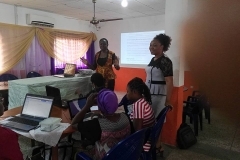 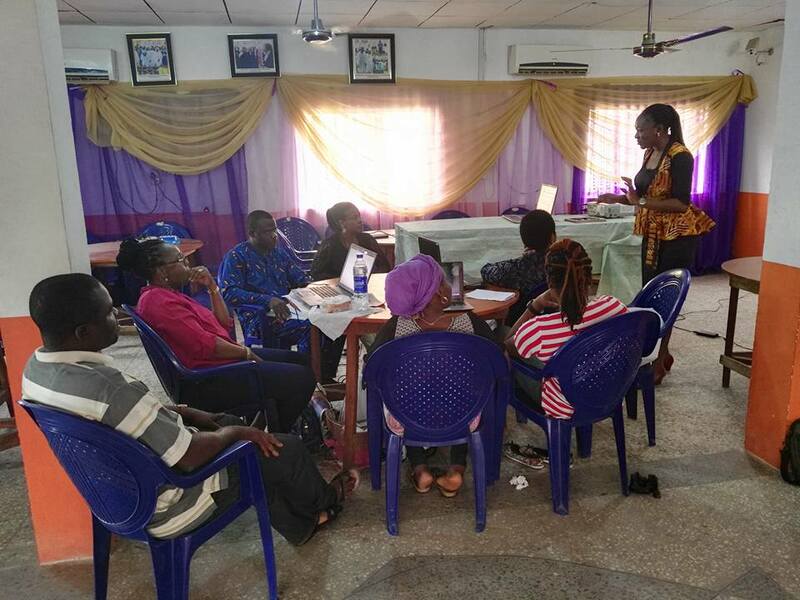 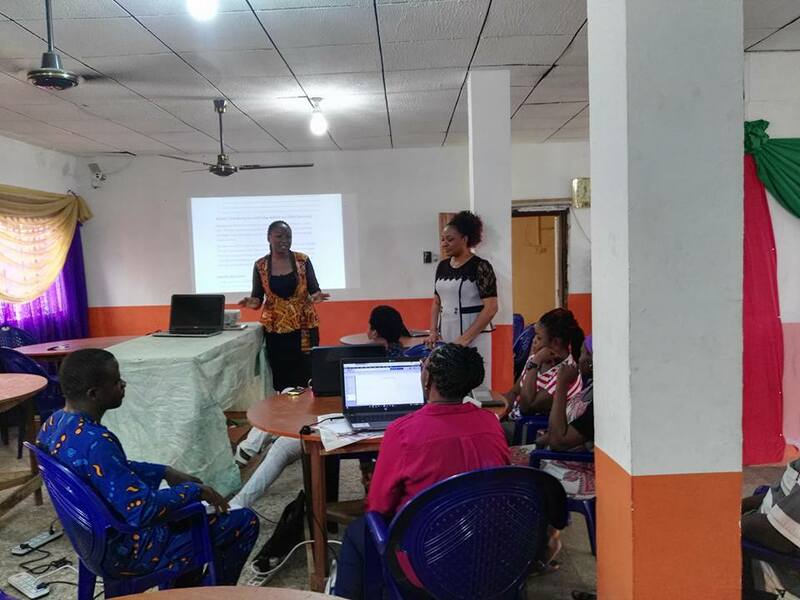 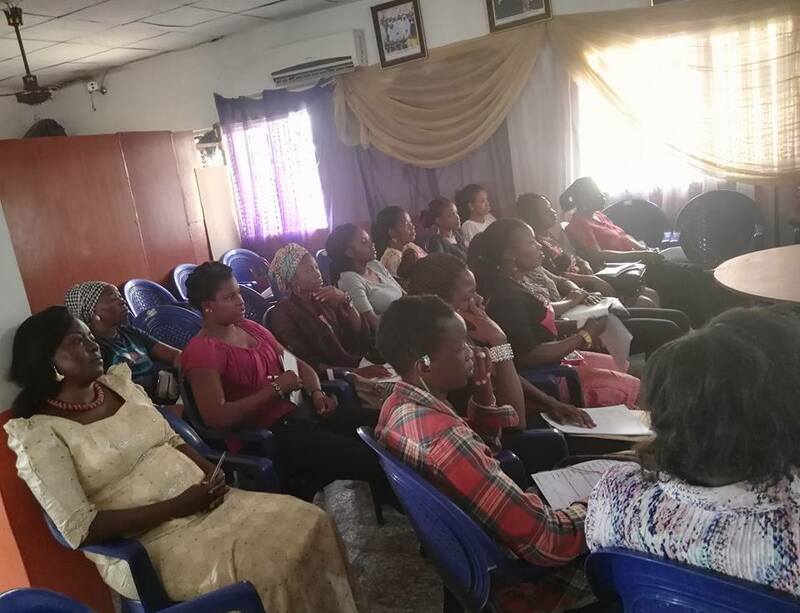 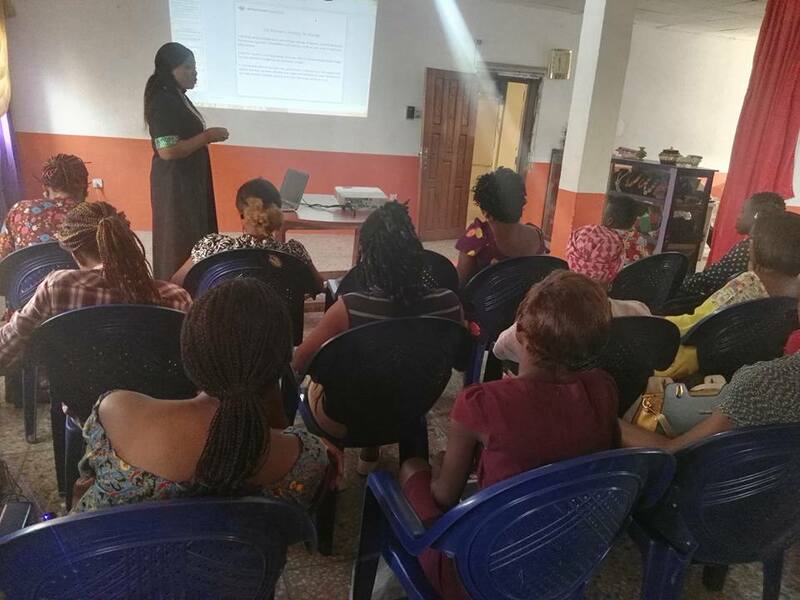 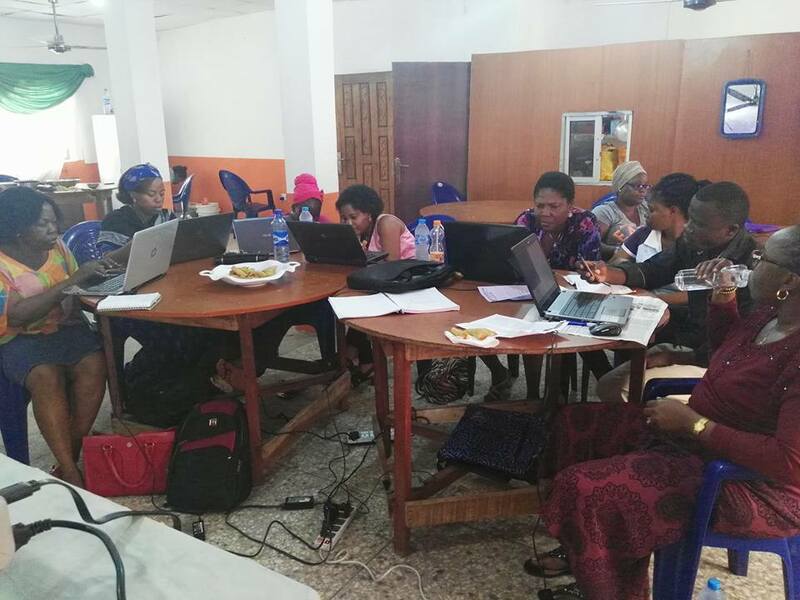 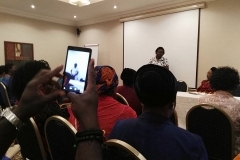 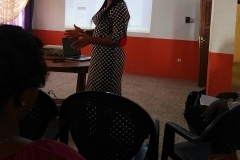 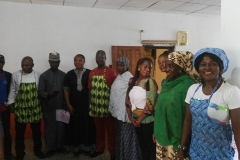 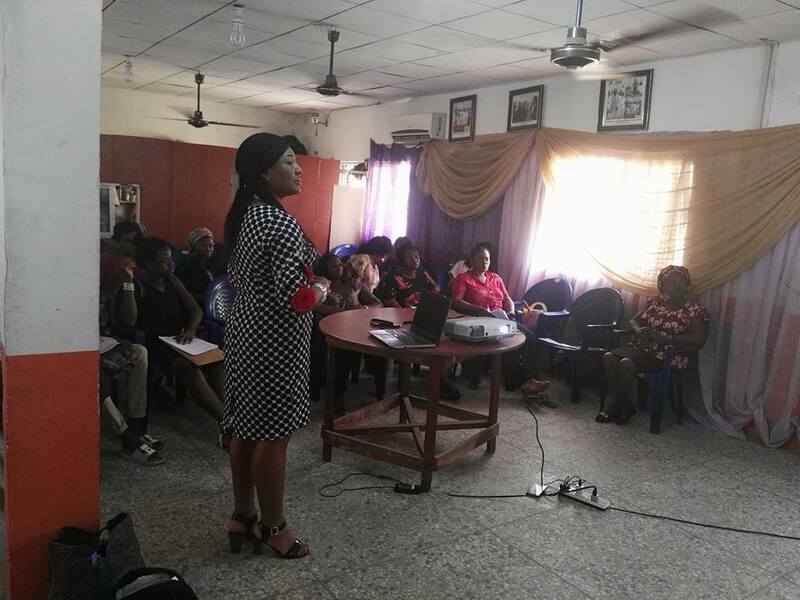 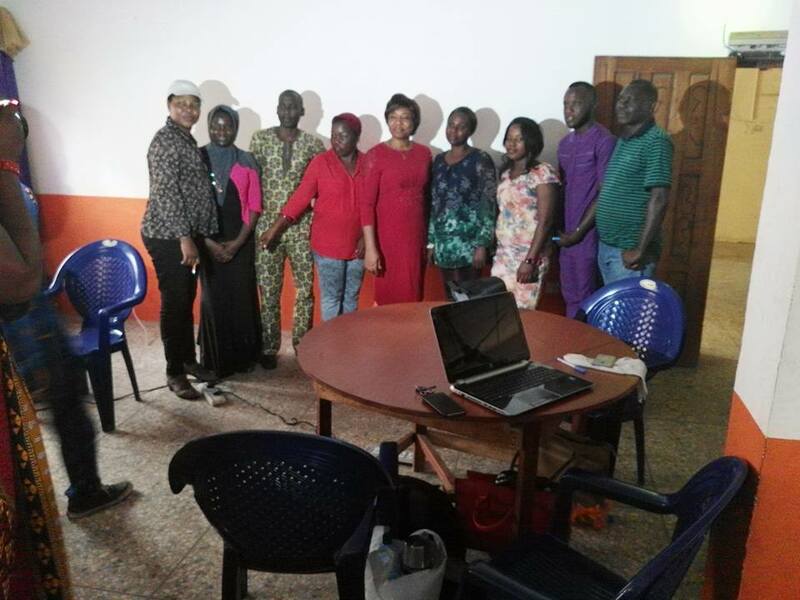 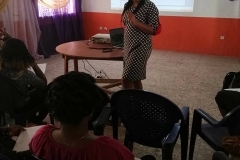 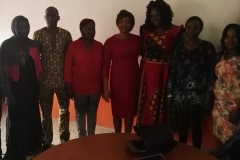 We started our Women’s Economic Empowerment training with our Partner, Small and Medium Enterprises Development Agency of Nigeria, SMEDAN yesterday. 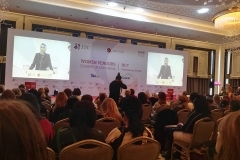 We tried to bring the training live, but the network was bad. 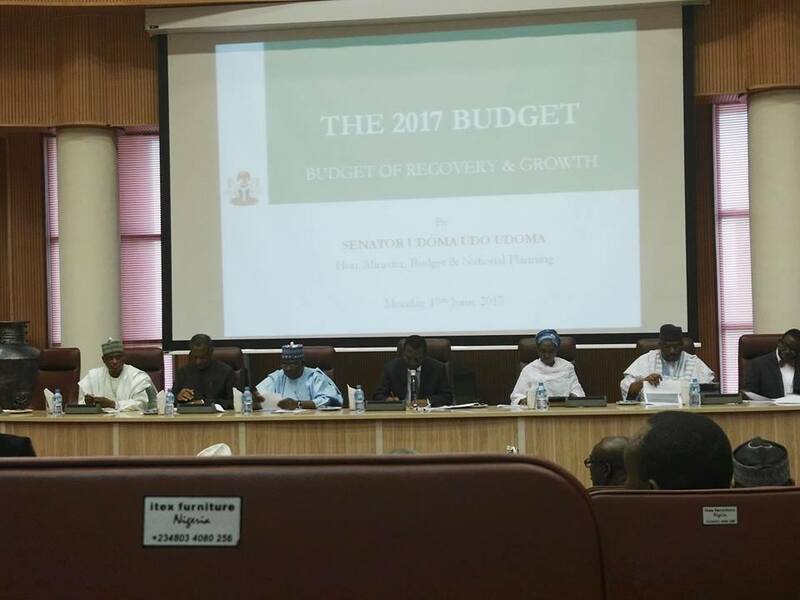 We sincerely hope, that subsequent ones will better. 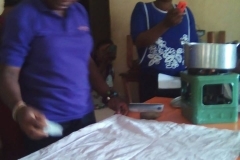 We were able to go live on twitter. 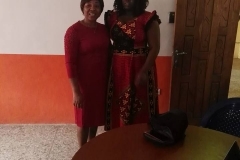 You can connect with us and view the video on @phelynskillcent, on twitter. 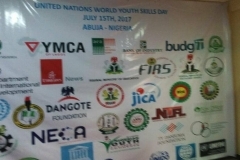 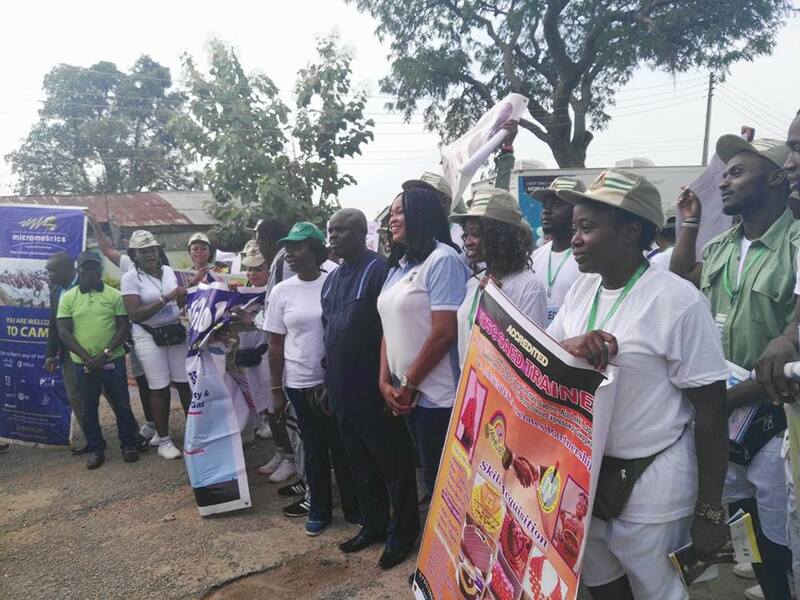 It was indeed an exciting outing, as our partners brought media people from Punch and Leadership Newspaper’s to cover the event. 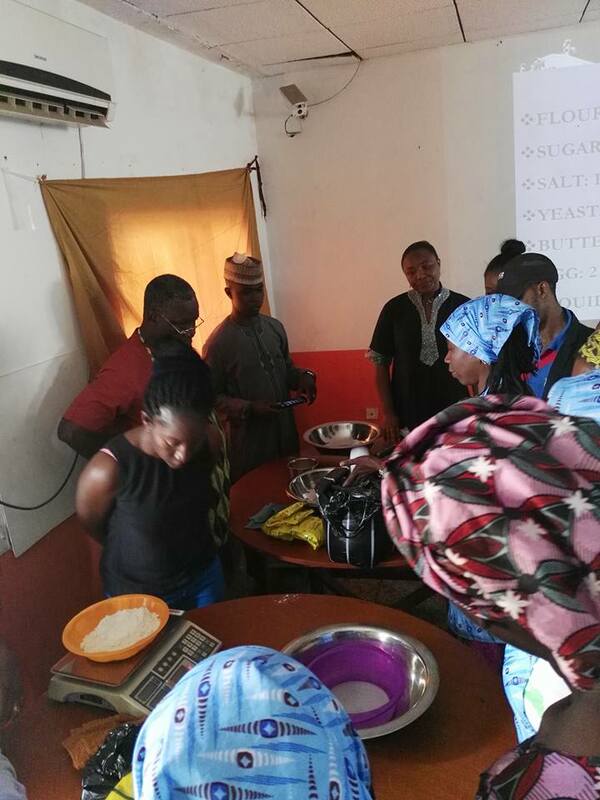 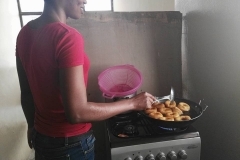 We had some men among us, and they were all eager to learn how to make small chops and the rest of the snacks. 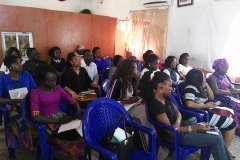 One striking thing that happened yesterday was that, one of the men said, “He will be willing and ready to challenge any woman after the training” and he said this while I was interviewing him on Twitter live yesterday. 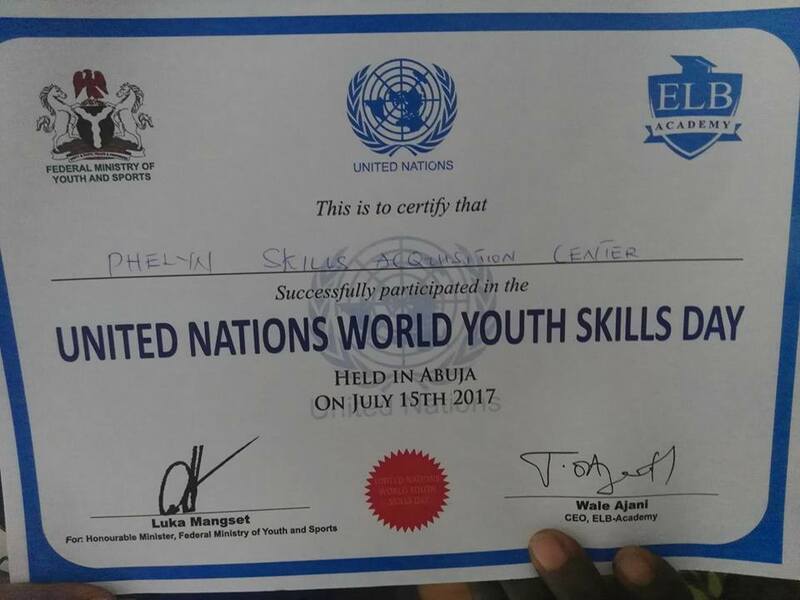 This got me thinking! 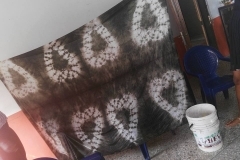 Hmmm! 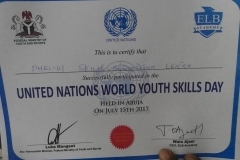 We need to tighten our belt further. 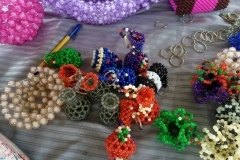 Check us out on the pictures below. I see this as a Gender Equality in action and a welcome development. 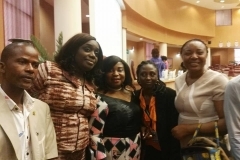 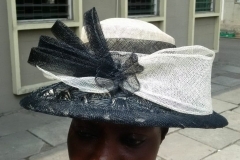 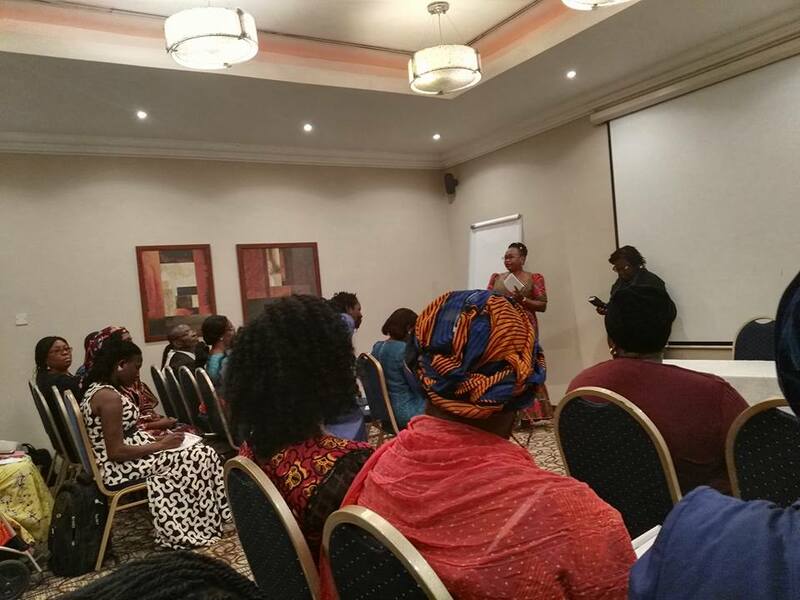 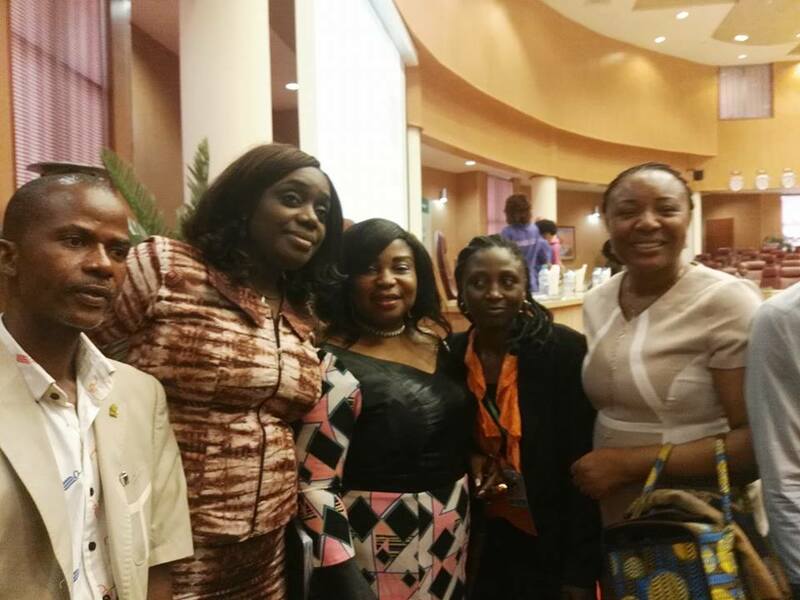 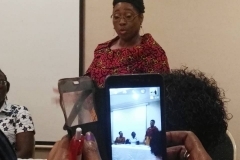 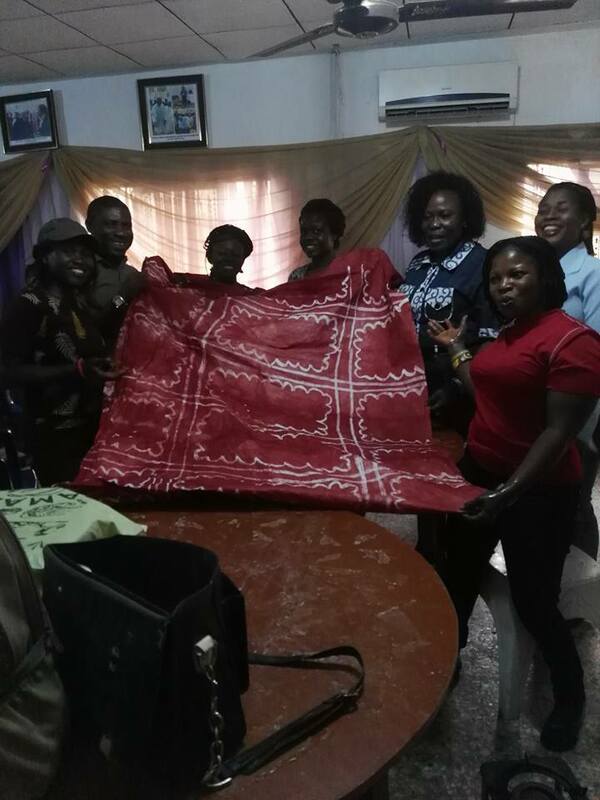 I was inspired even more, after meeting with AWDF Team from Accra, Ghana yesterday at Lagos. 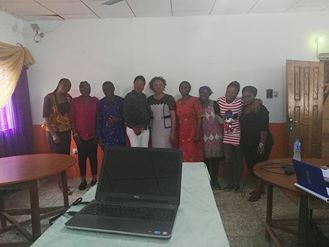 It was all about explaining who AWDF are, what they do and the latest addition to their portfolio, “Leading from the South” . 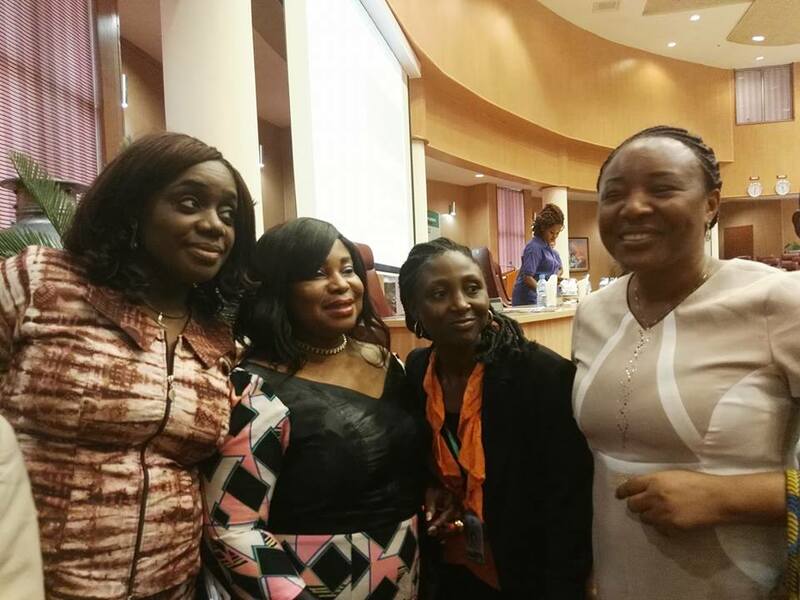 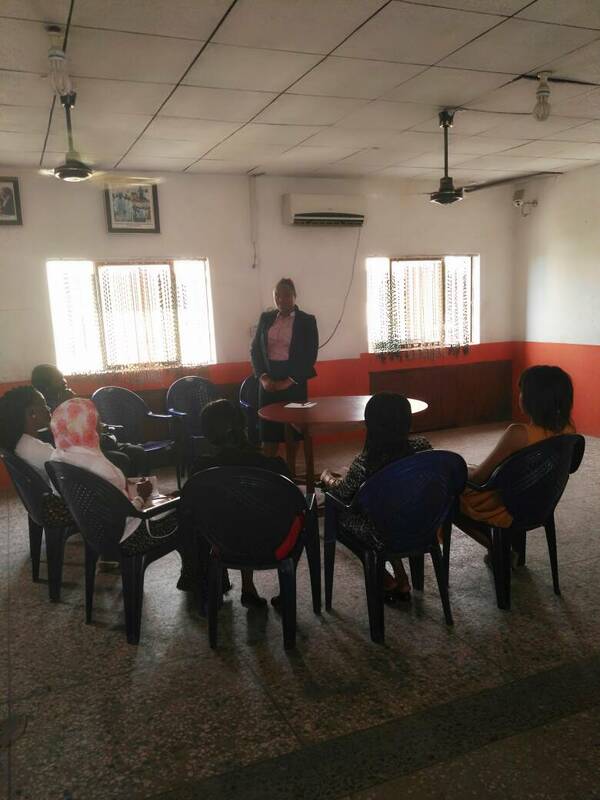 We also had a discussion on how to move Women’s movement in Nigeria forward. 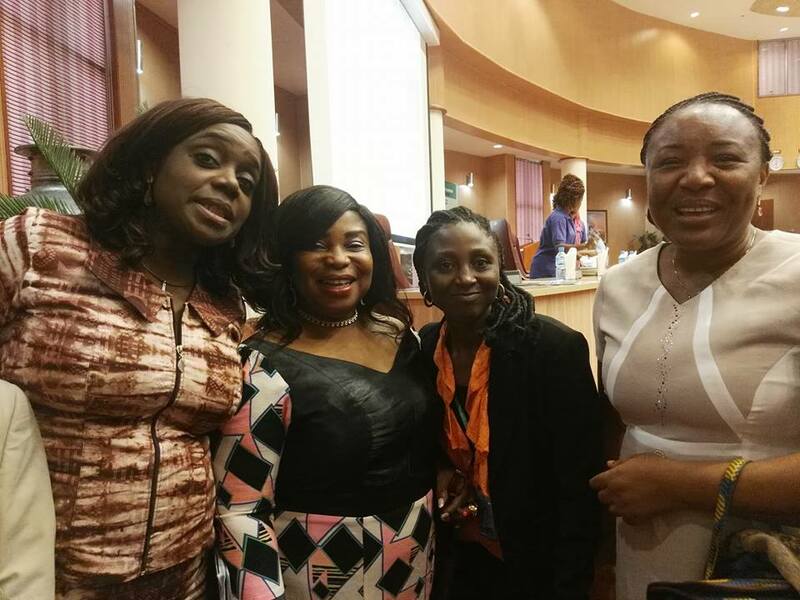 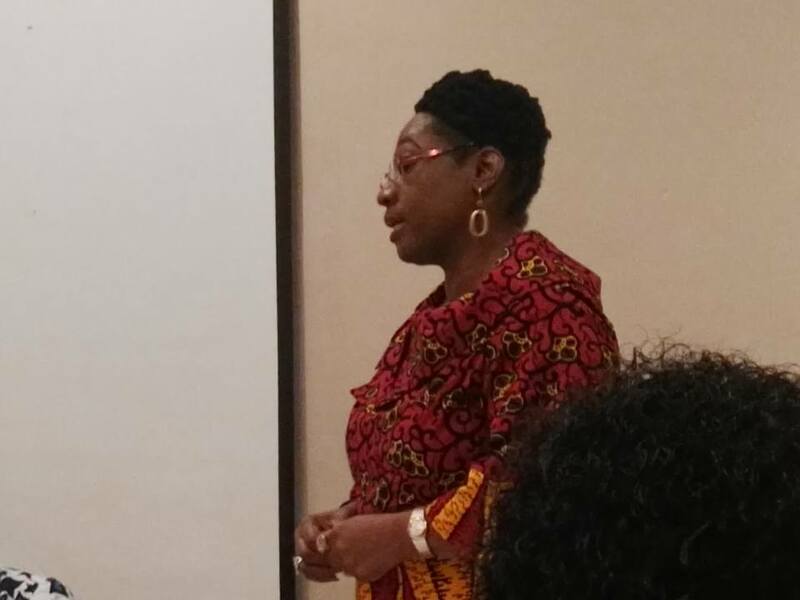 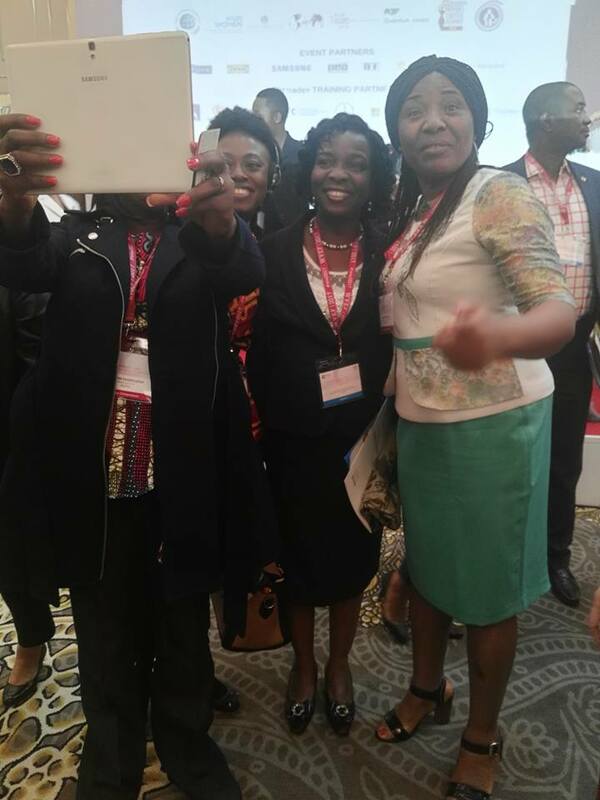 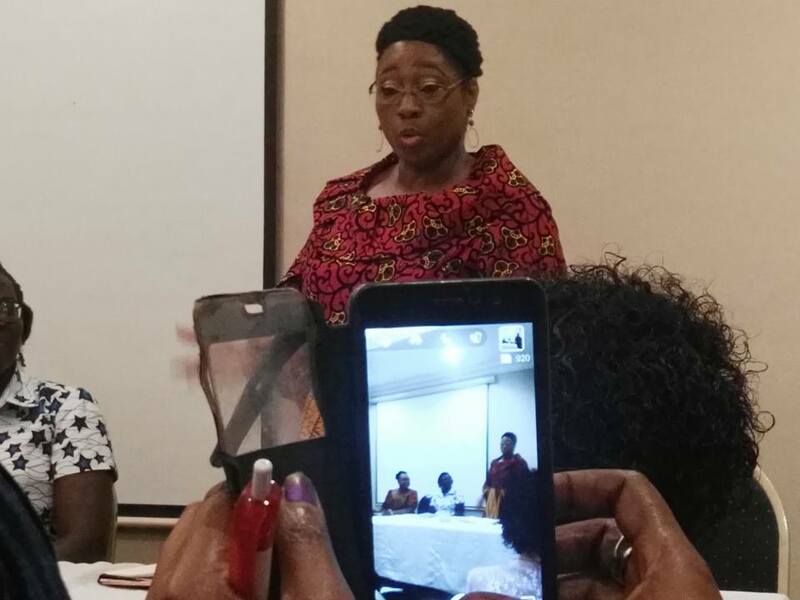 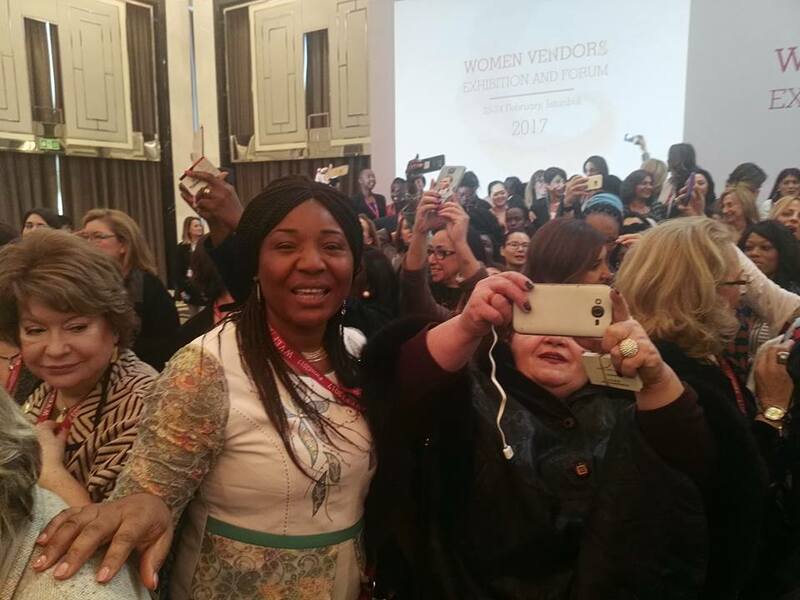 AWDF is the biggest funding organisation for women’s movement in Africa. 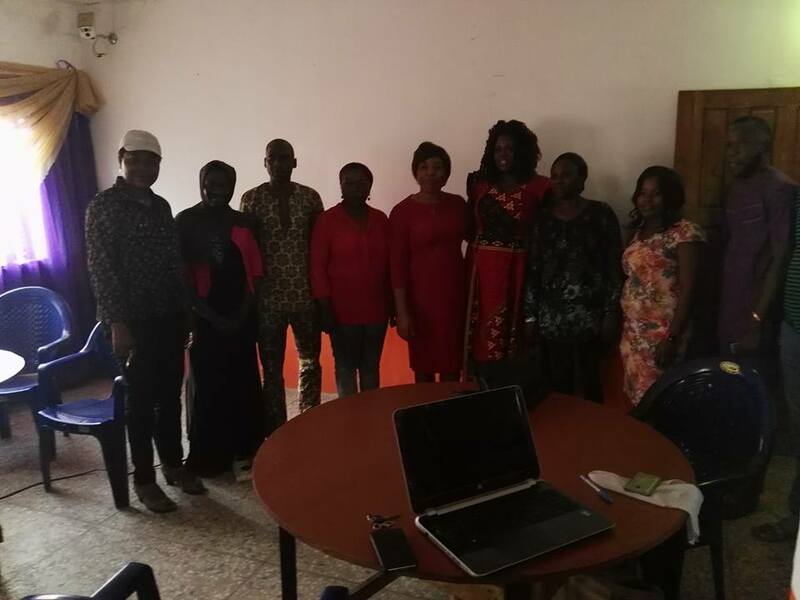 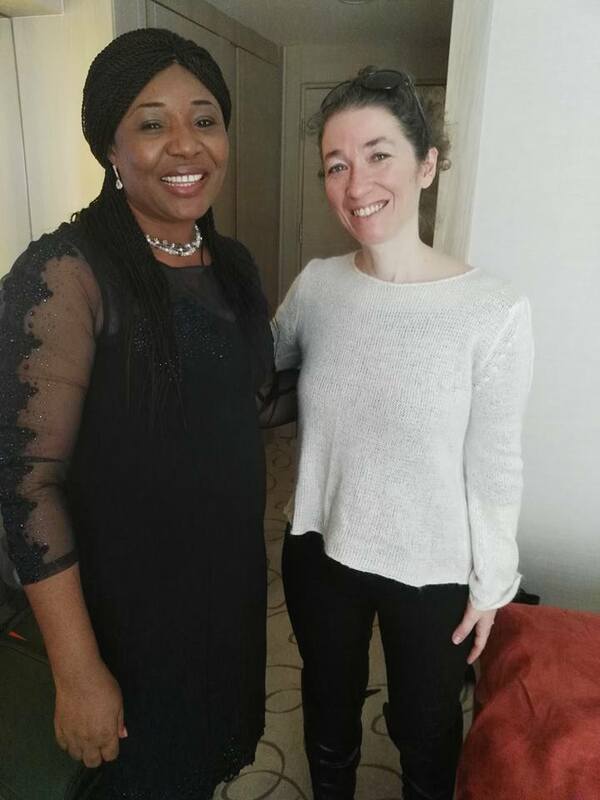 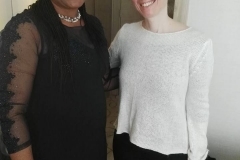 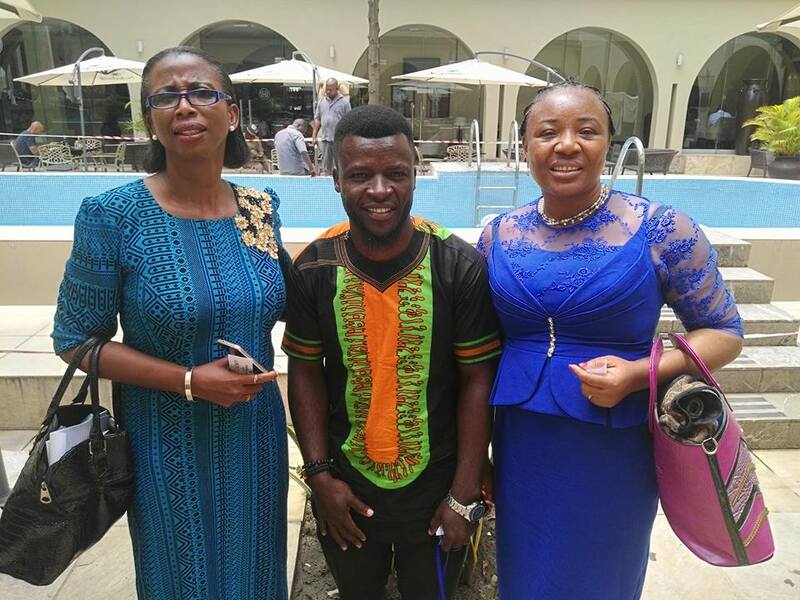 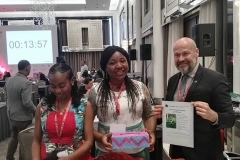 So excited to meet AWDF Team, which comprises of Eleru, AWDF focal point in Nigeria, Rissi, their program Manager and Beatrice, their Grant manager. 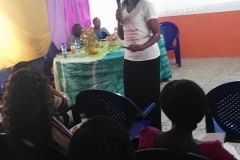 So much encouragement by Eleru to women Leaders on how to access leading from the South Grant. 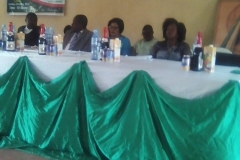 All the invited partners expressed satisfaction at the end of the meeting.Below are some pictures from the event. 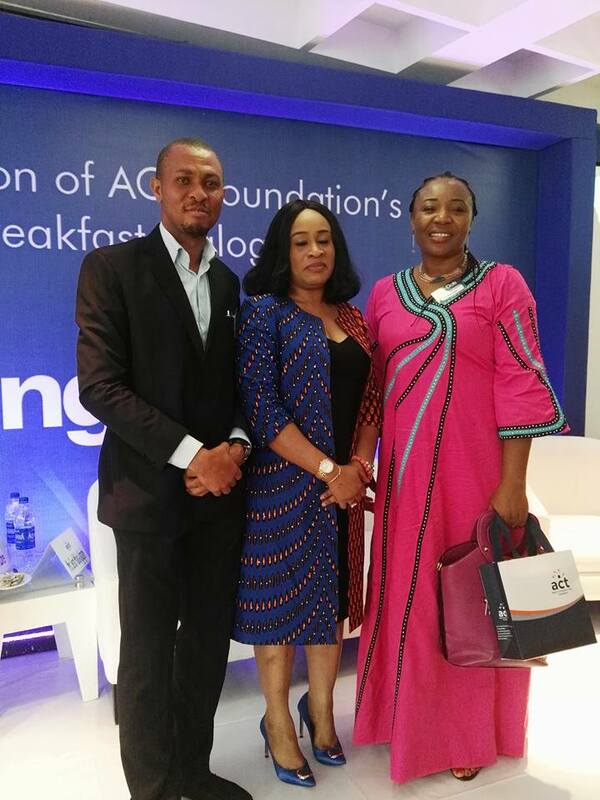 So excited to be at Aspire Coronation Trust Foundation breakfast dialogue. 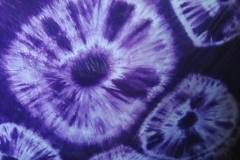 Something big is about to shape the Social space. 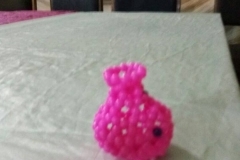 Watch out! 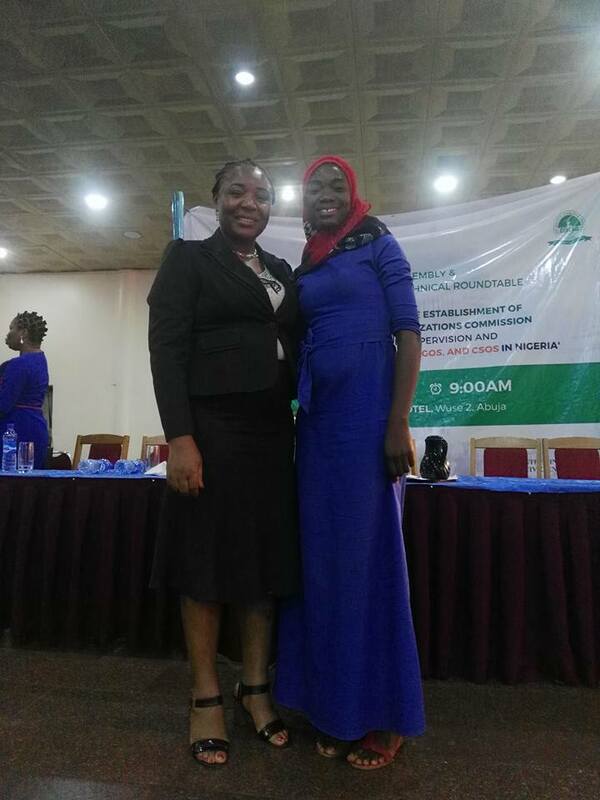 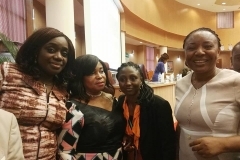 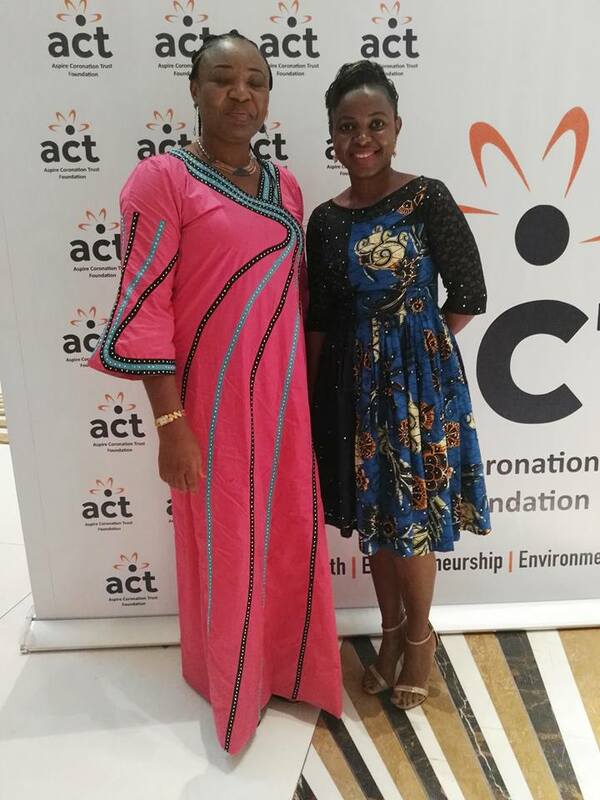 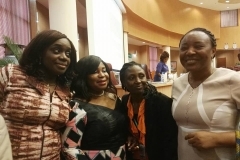 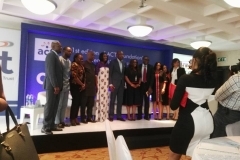 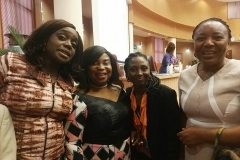 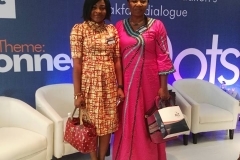 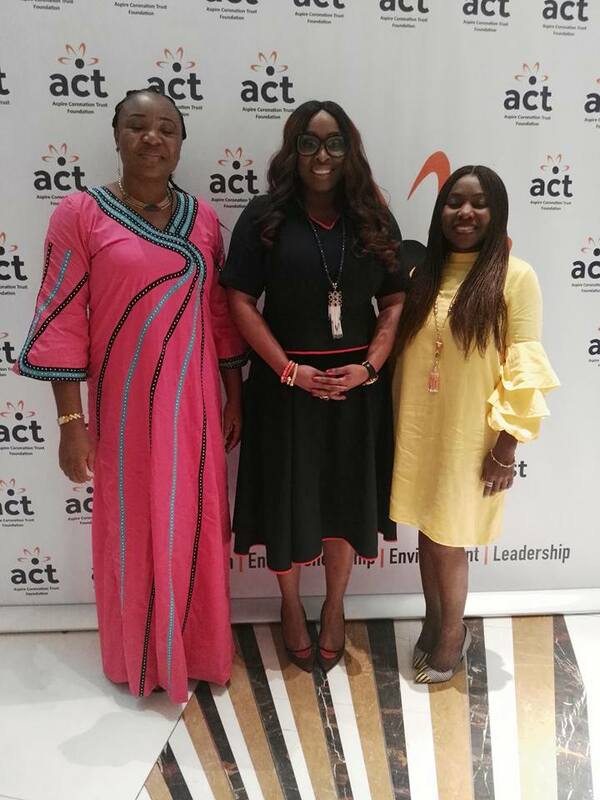 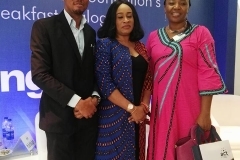 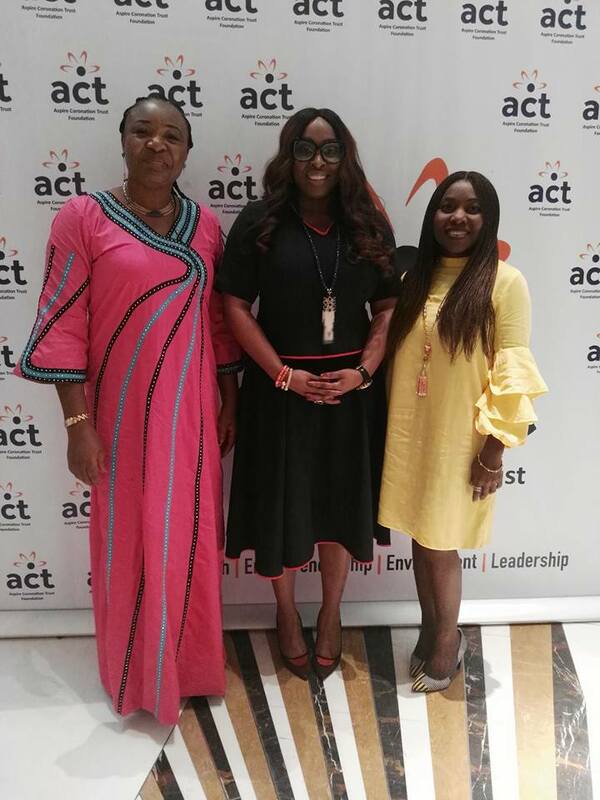 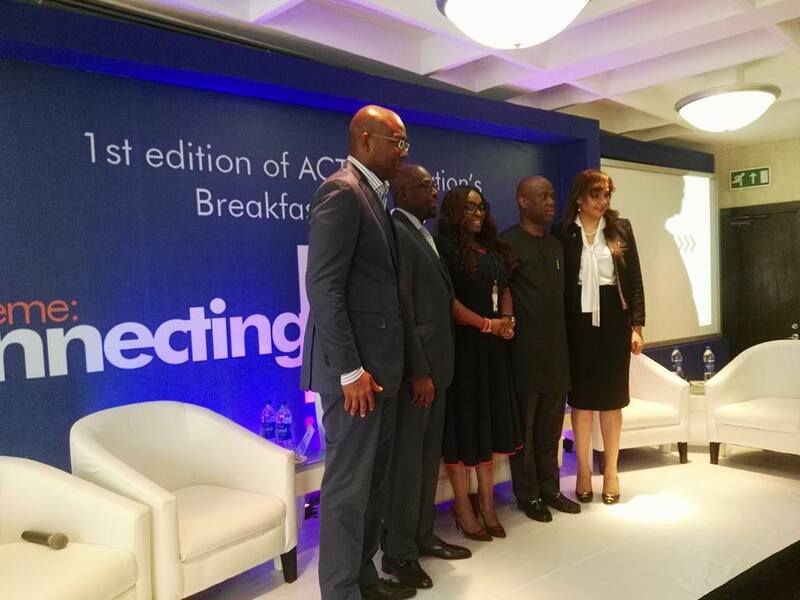 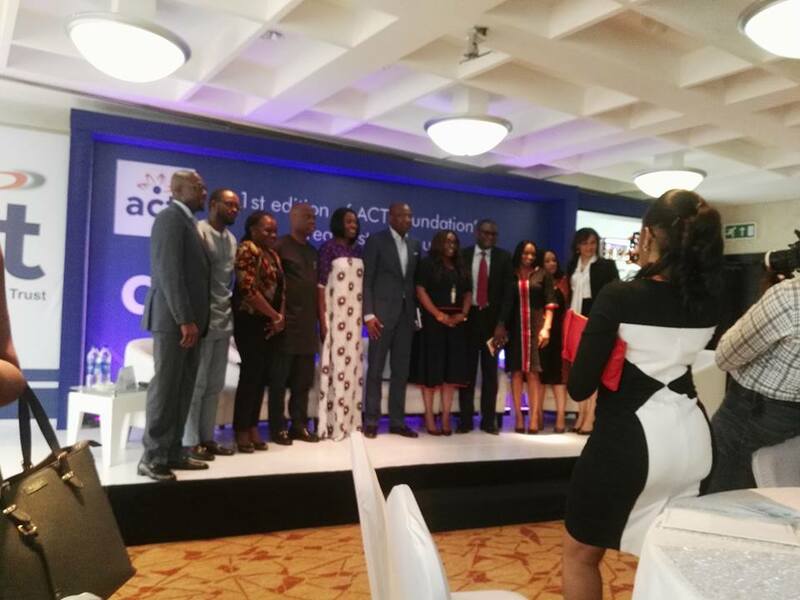 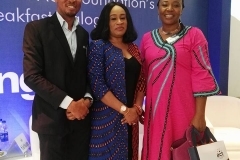 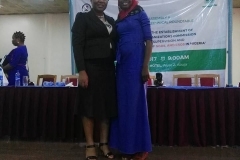 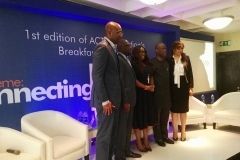 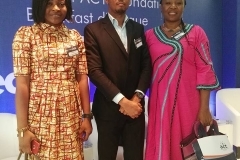 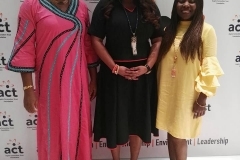 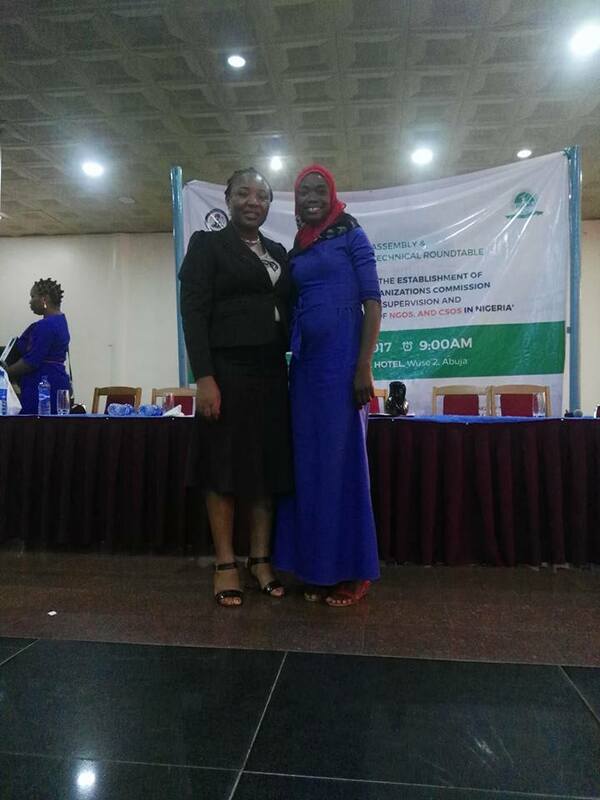 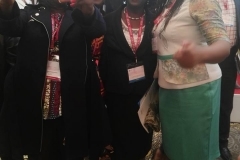 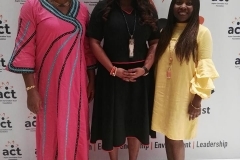 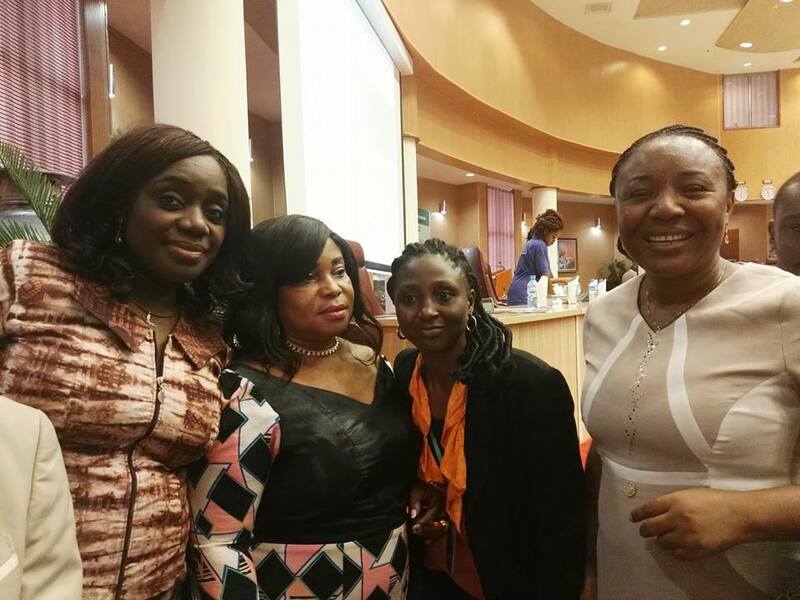 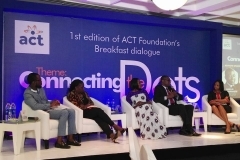 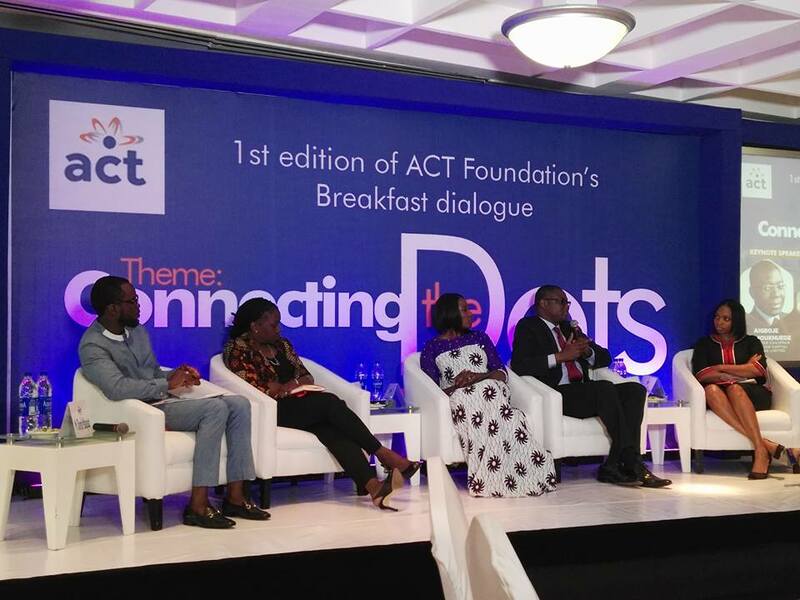 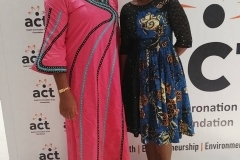 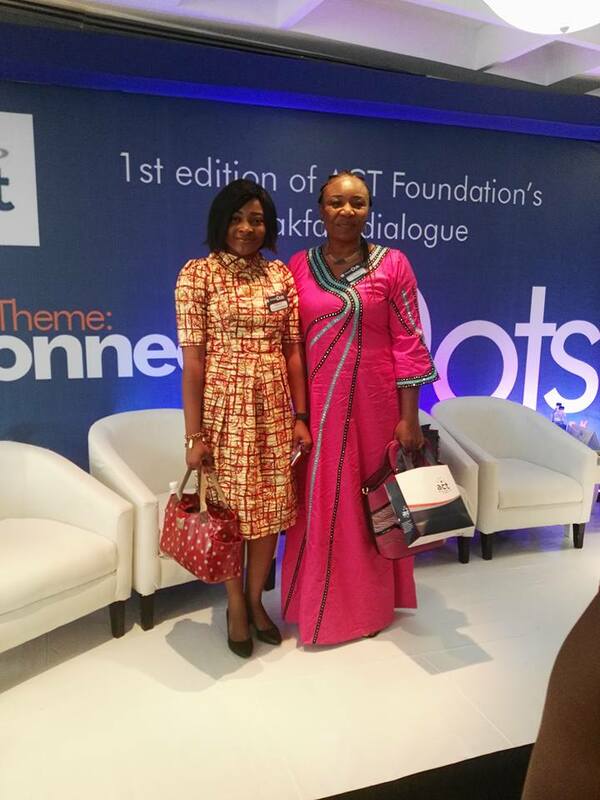 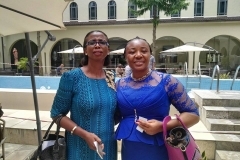 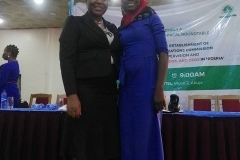 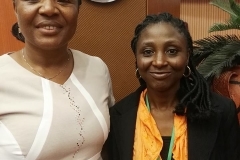 I had the opportunity to meet Osayi Alike, CEO, ACT Foundation, Ini Abimbola, Crystal Sunmbo Efusanya Chigbu, Rebecca, Tochukwu etc.The Panelists were wonderful people from different Foundations like: Innocent Chukwuma, Country Director, The Ford Foundation, Serah Makka Ugbabe, Country Director, One Campaign, Eme Esin, Country Director, International Finance Corporation Nigeria etc.The Theme of the dialogue was all about connecting the dots, Partnership that works and the best practices. 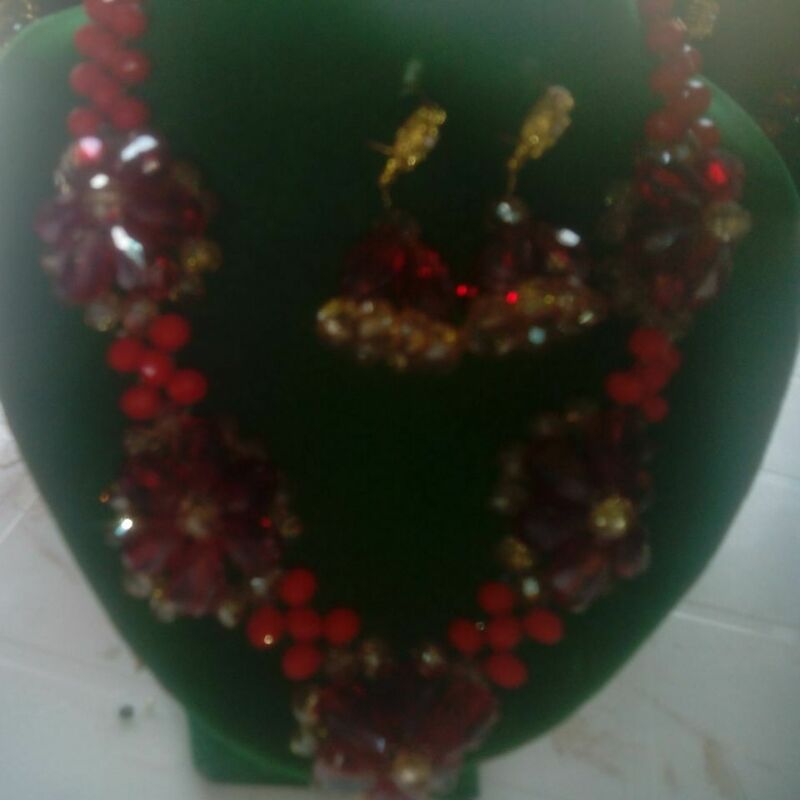 It was indeed, an eventful outing! 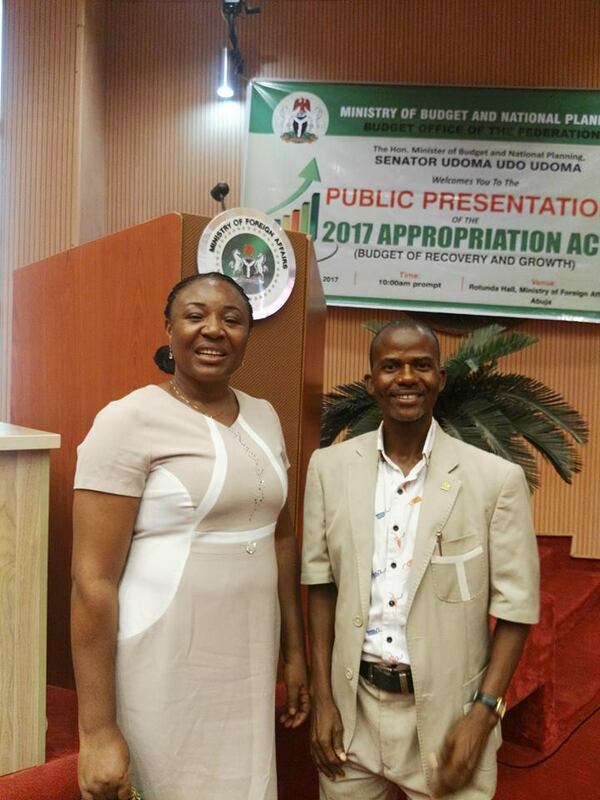 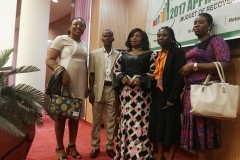 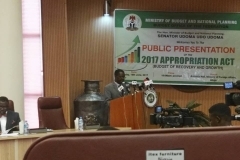 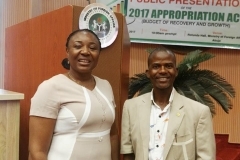 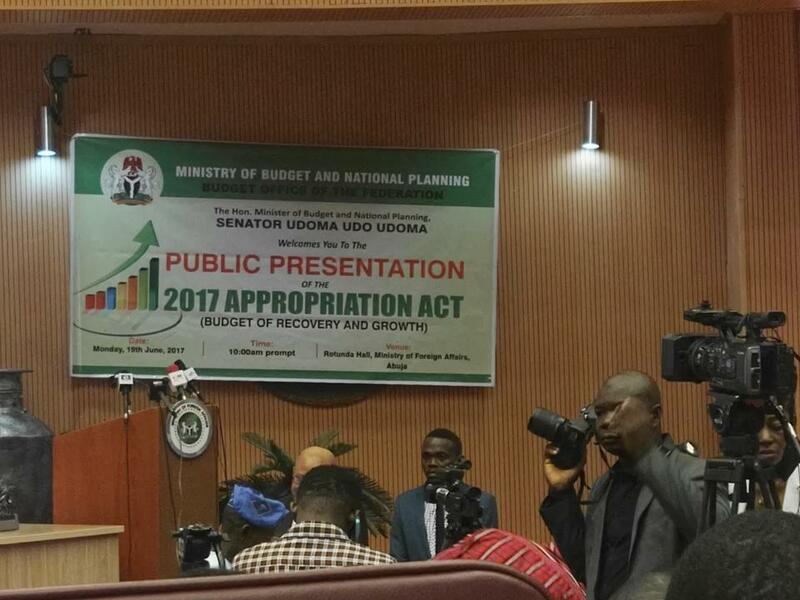 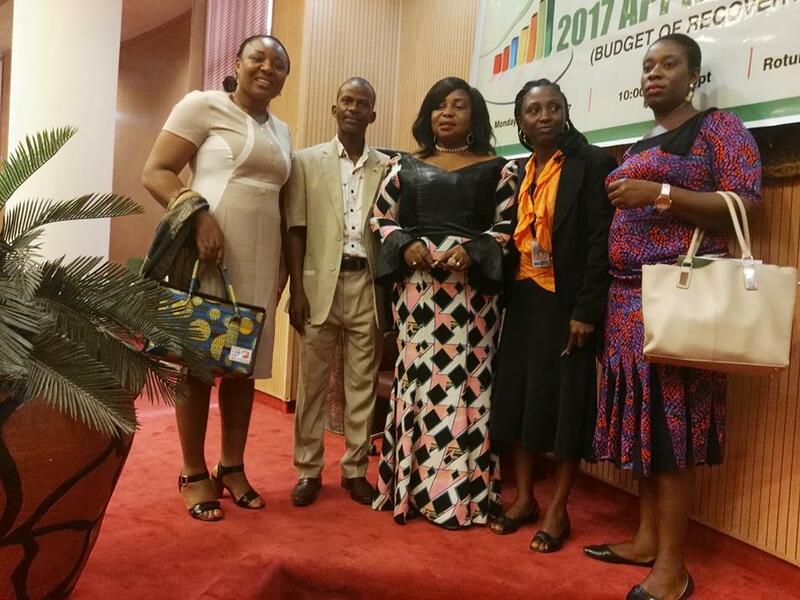 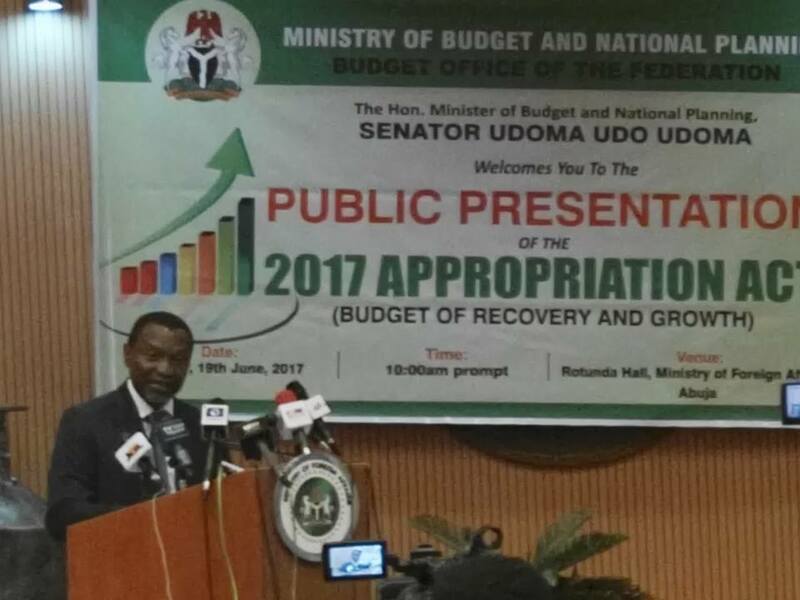 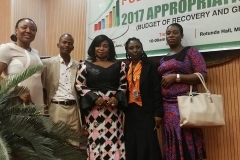 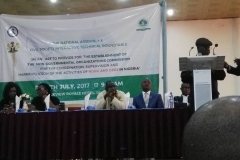 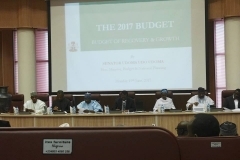 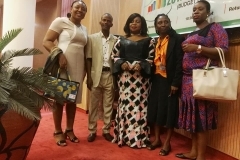 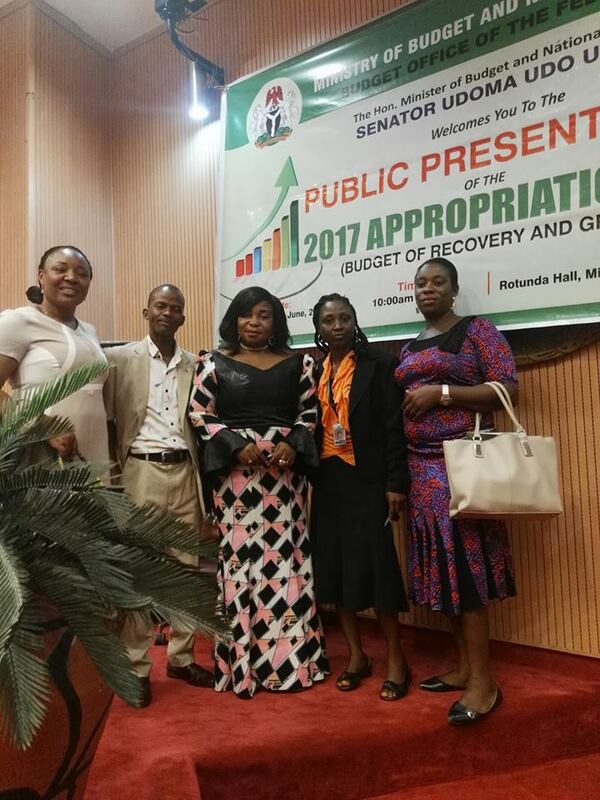 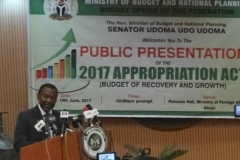 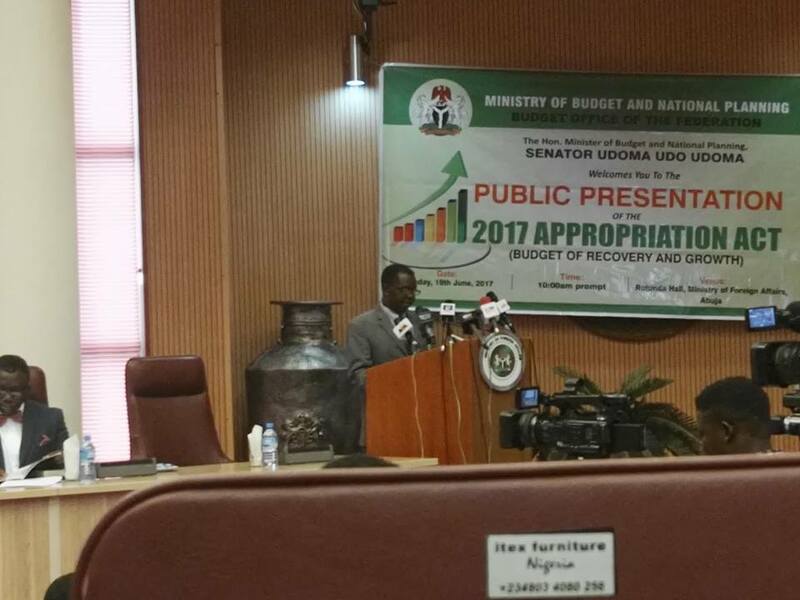 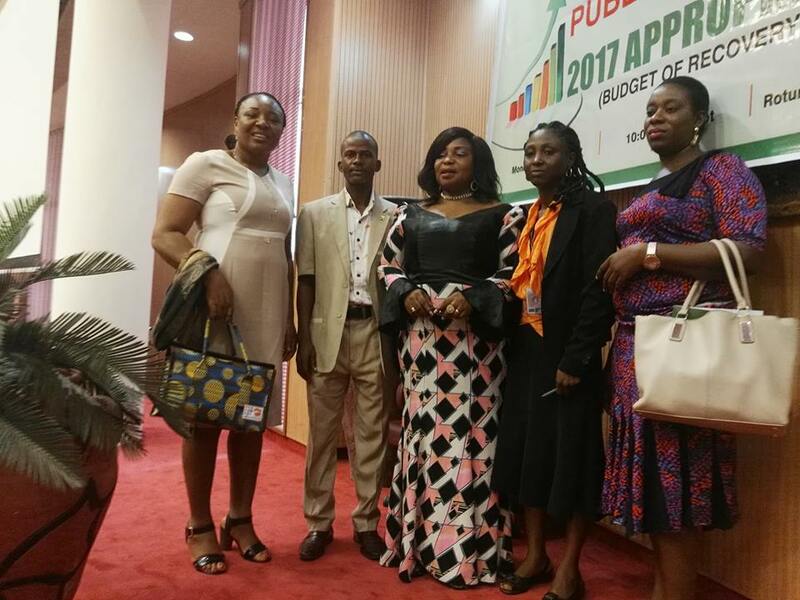 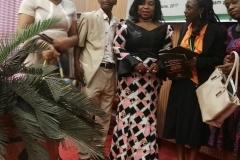 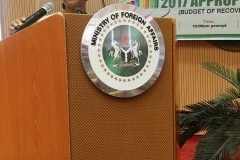 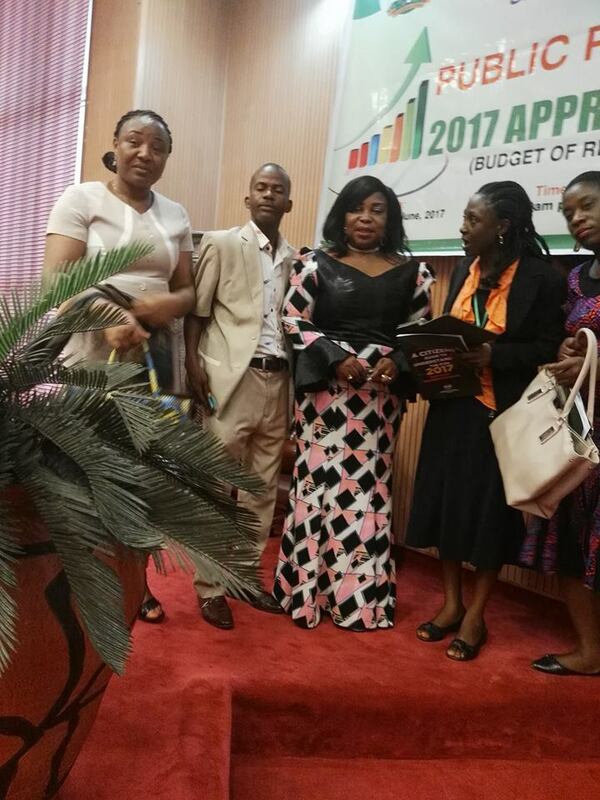 Our dear Organisation, Phelyn Skill Center was invited alongside other stake holders, by the Honourable Minister of Budget and Planning to the 2017 Budget presentation called “Budget of recovery”. 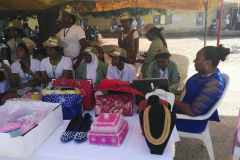 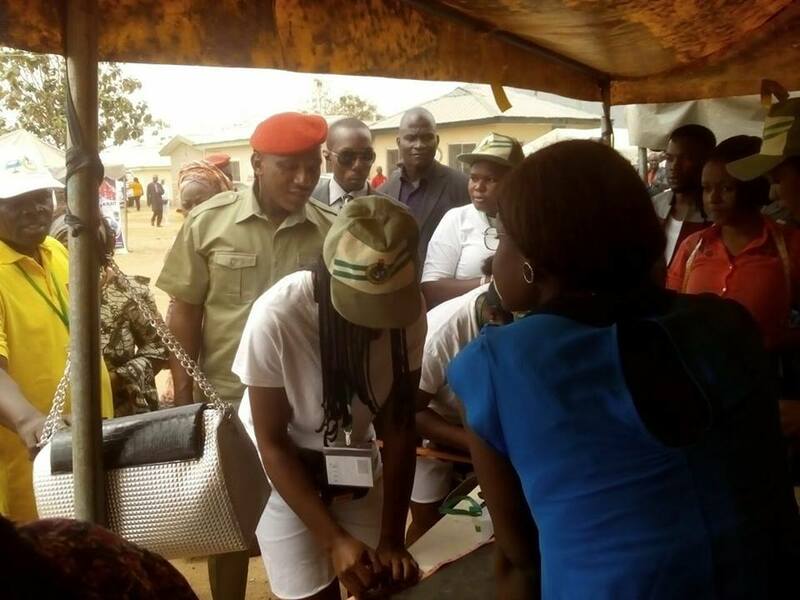 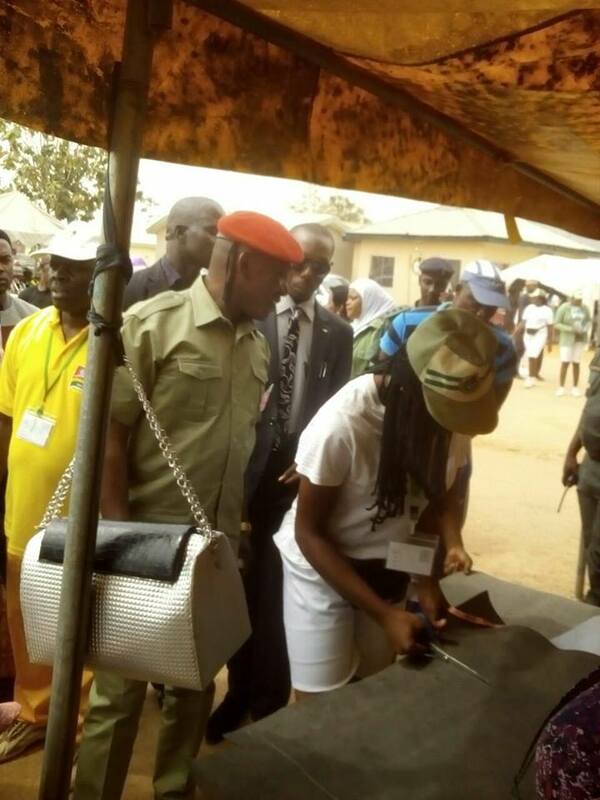 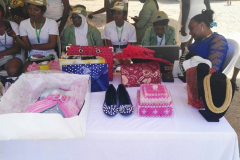 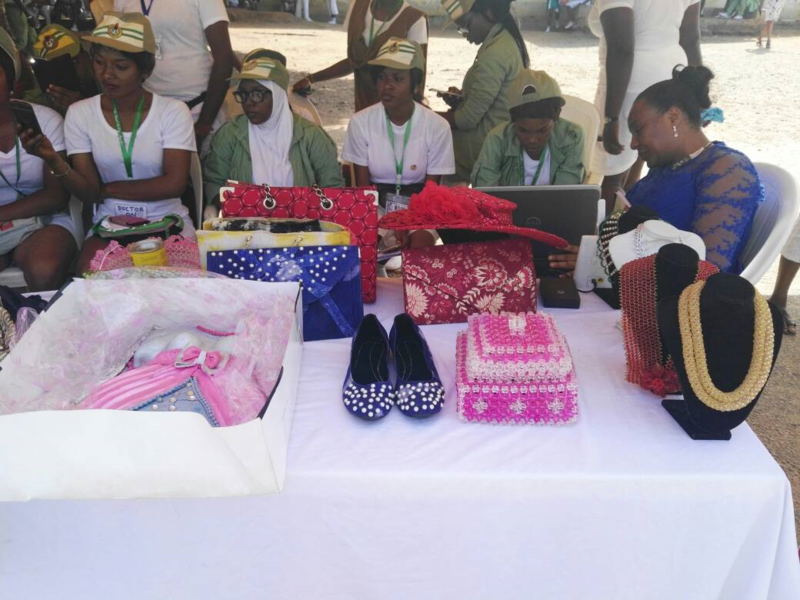 We are currently at the NYSC Camp to train Youths on Vocational skills, this is to expose Youths on the importance of job creation and self employment. 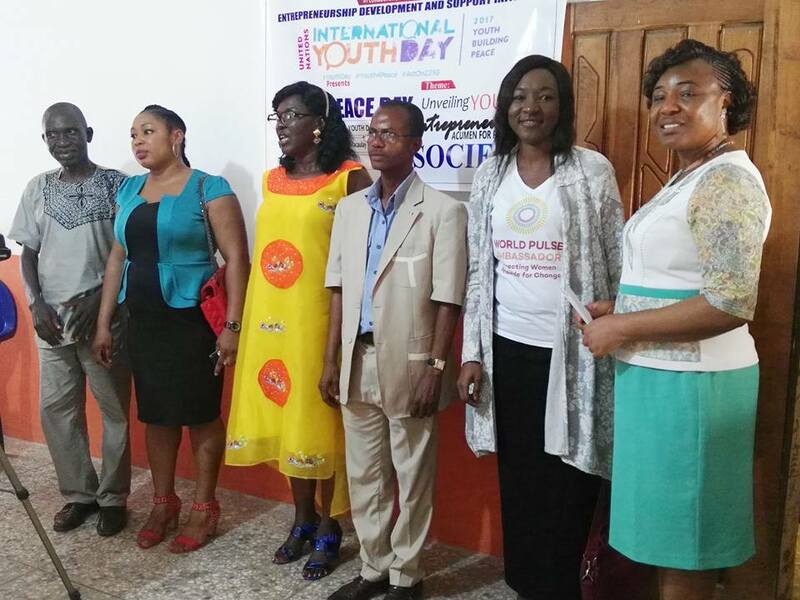 We also used that opportunity to facilitate World Pulse Program to the Youths. 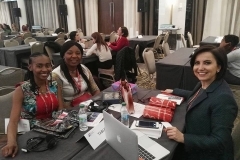 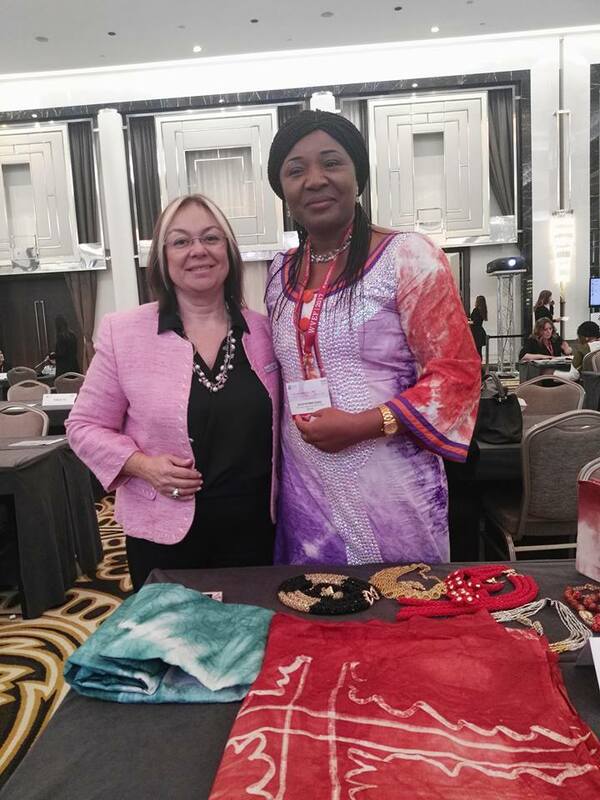 World Pulse is a global platform, set up to assist women and girls connect to other women and find resources and elevate their voice. 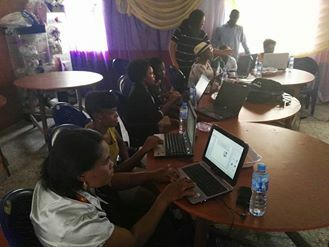 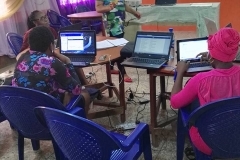 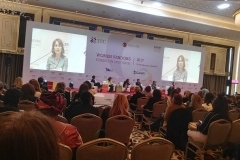 We are supporting ICT for women because technologies represent a significant opportunity for advancing gender equality, women’s empowerment and equitable development. 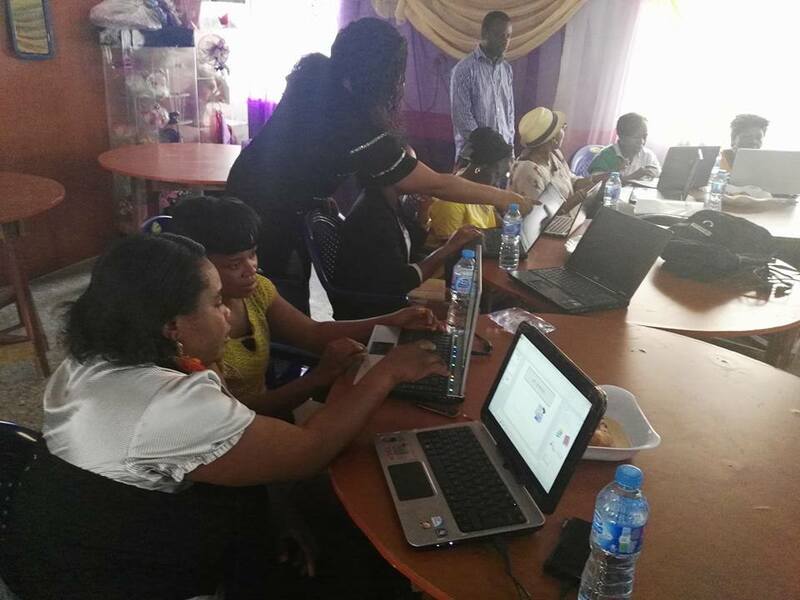 As we work towards bridging the technology gap, we joined women and the Web Alliance project to deliver Technology and Women in our community. 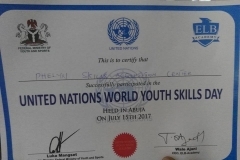 The project was divided into 3 sections, the living room section, WWA World Pulse facilitation and WWA-WP_Intel Certification. 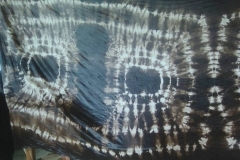 Our first outing was in May with living room session. 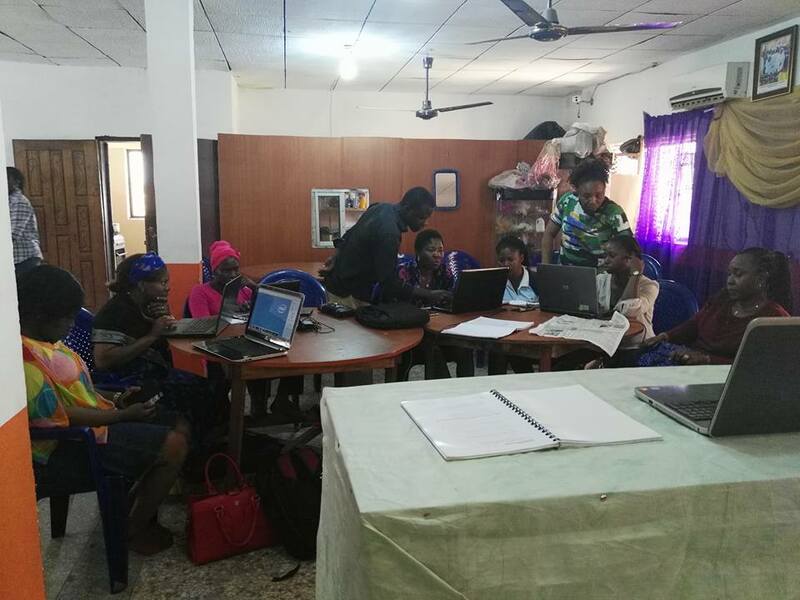 We had 10 women that was introduced to internet free basics and we also connected to the world pulse community. 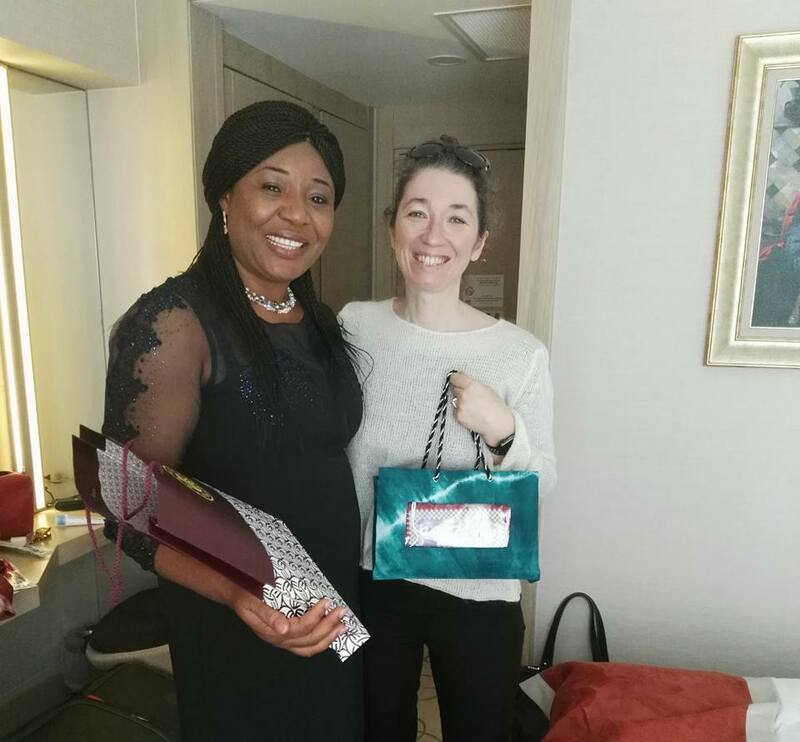 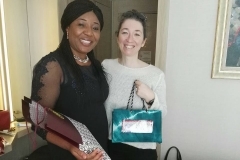 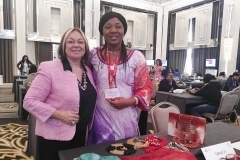 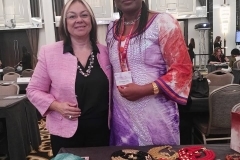 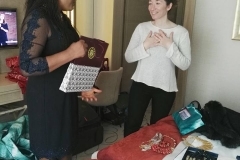 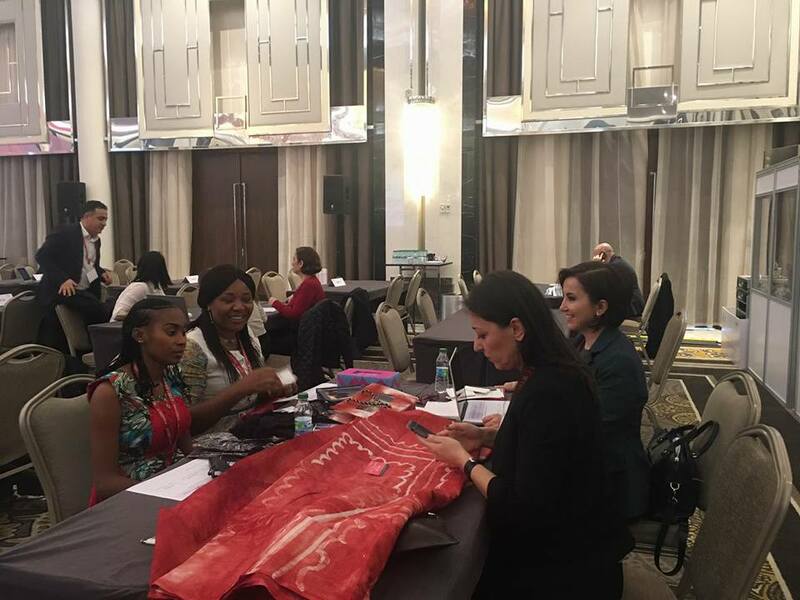 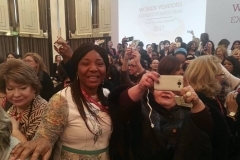 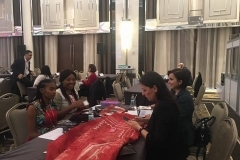 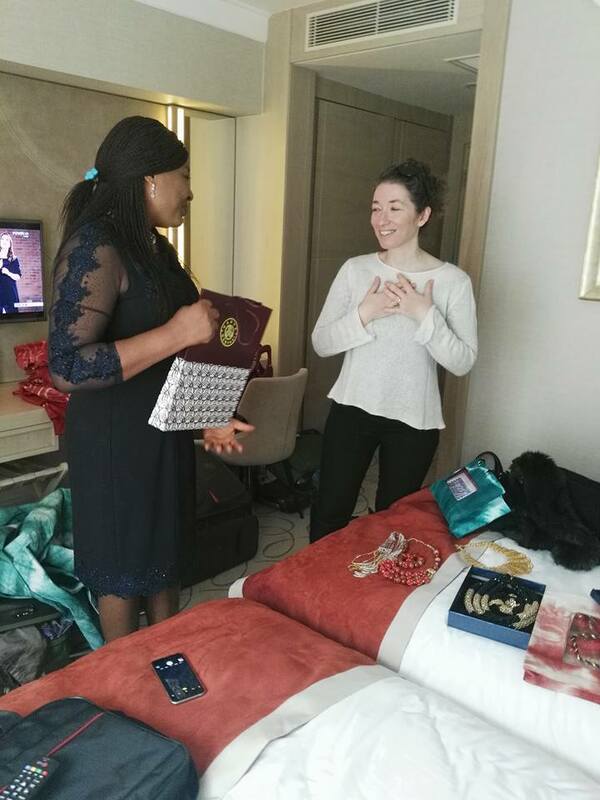 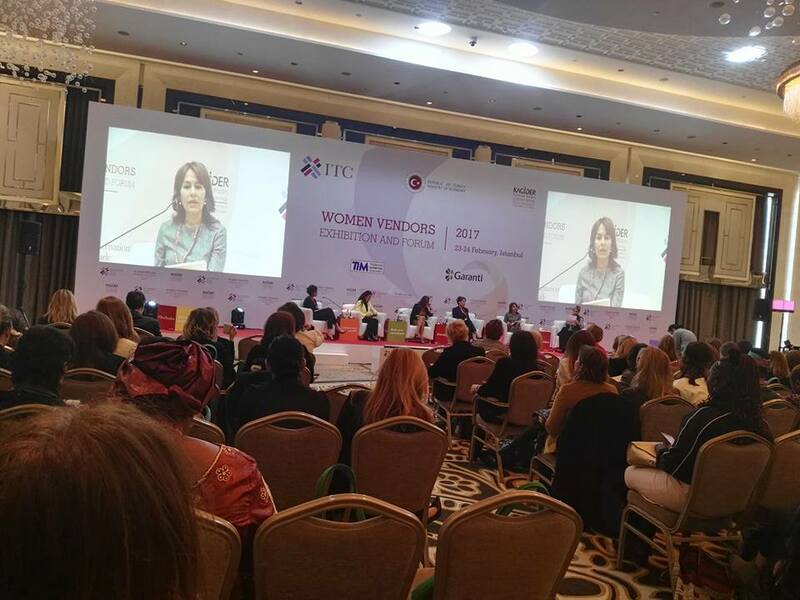 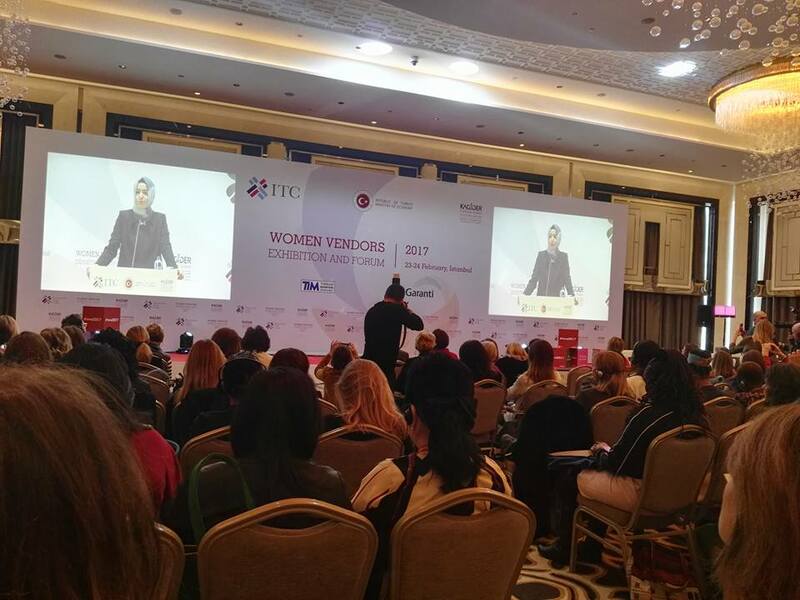 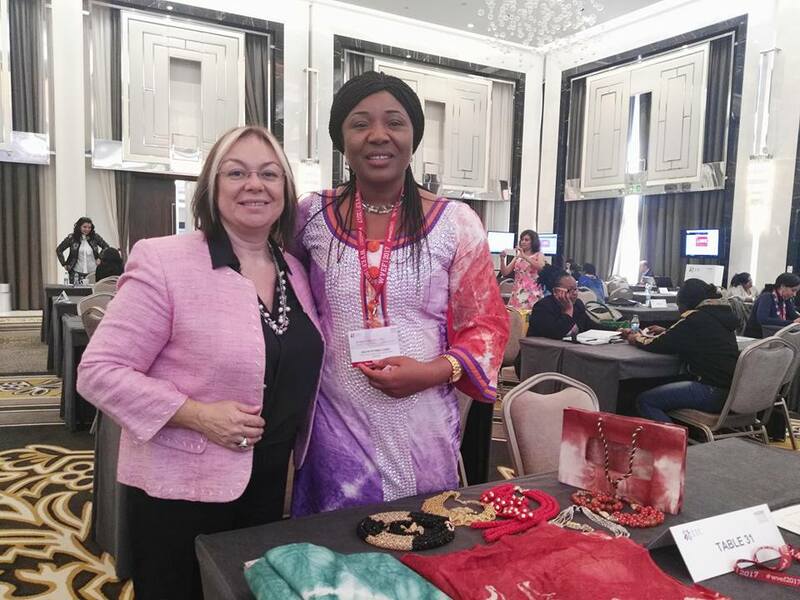 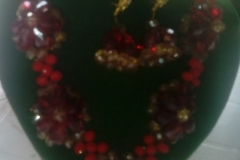 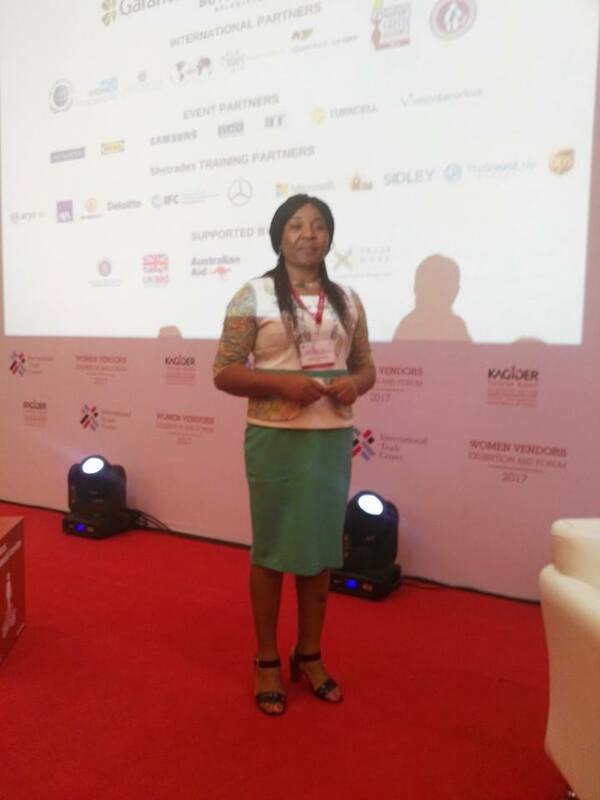 On 21st February, I left Nigeria for Istanbul to attend an event on Women Vendors Exhibition Forum. 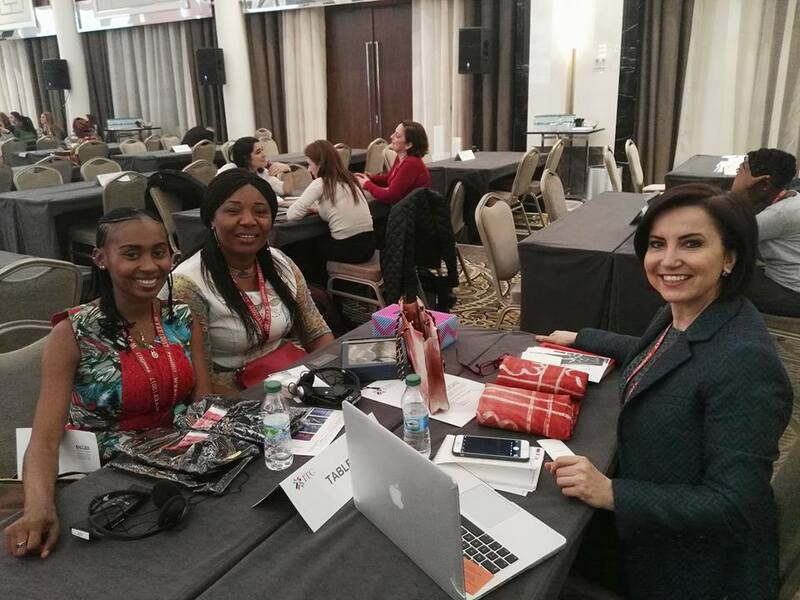 We are on, live from Hilton Bomonti Hotel, Istanbul. 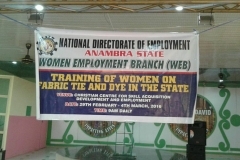 I will get back to you with details of this event later. 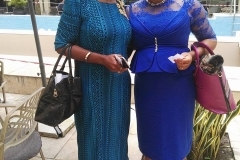 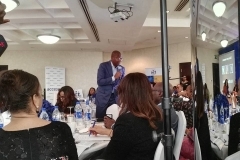 Enjoy some pix from my trip down to today’s event at Hilton Bomonti Hotel. 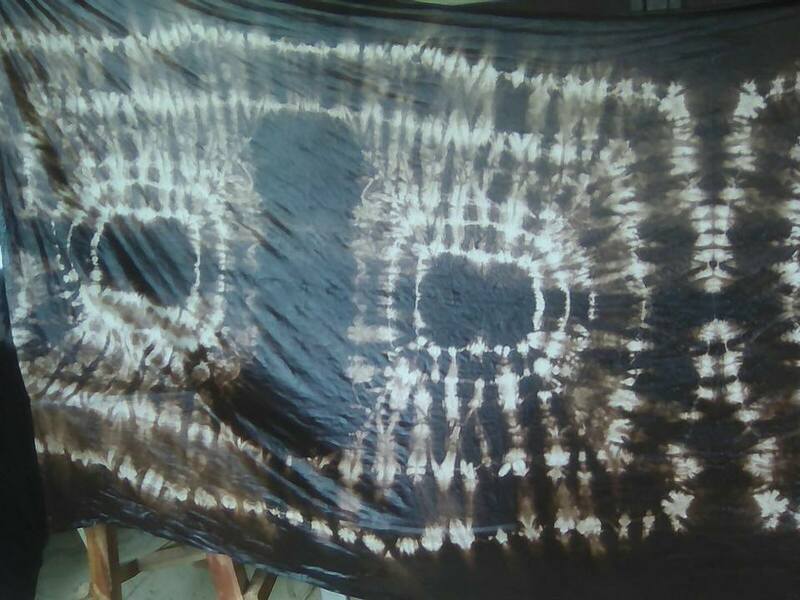 See you later. 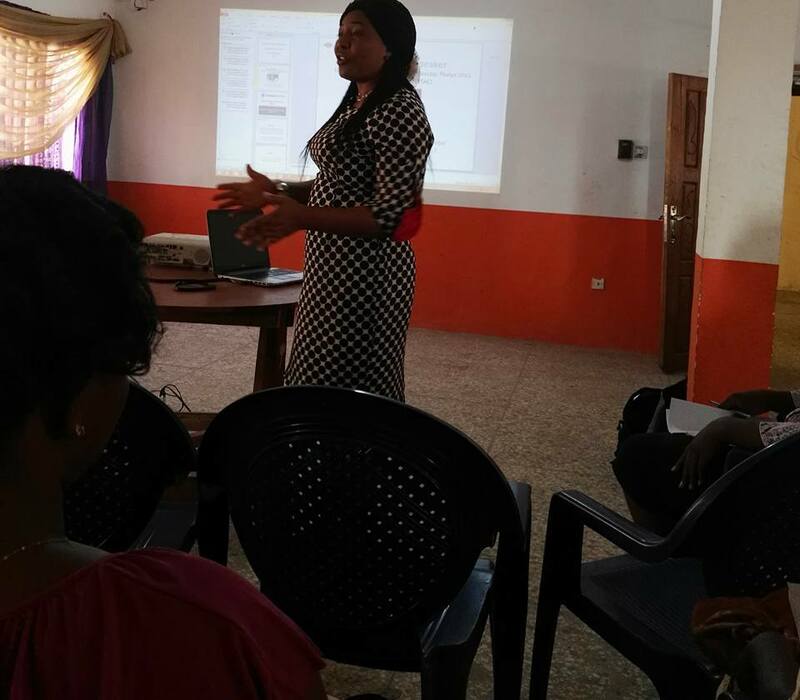 I just want to share an update on yesterdays training. 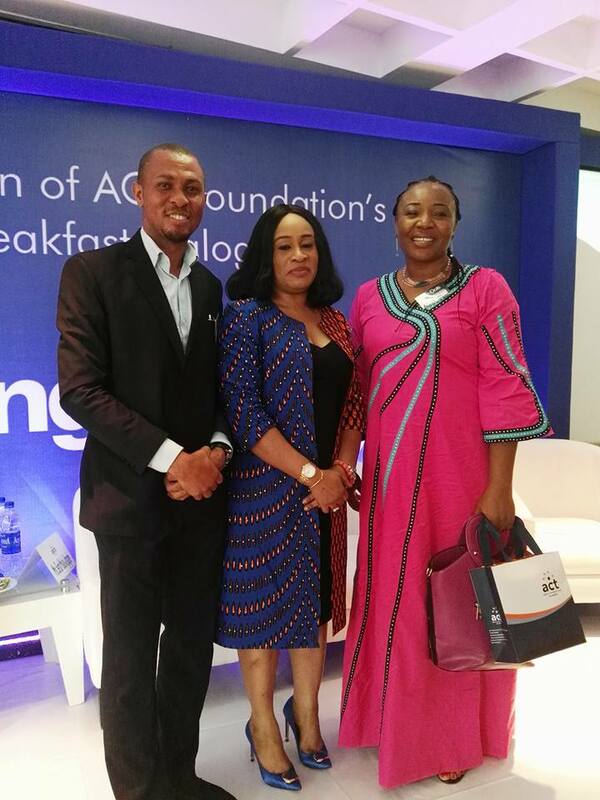 It was a successful outing as we had two special guests. 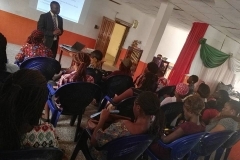 After my presentation on Women Economic Empowerment, one of our guest, former World Bank Consultant, Mr Dennis, who is a “Heforshe gender advocate, also presented a topic on women groups. 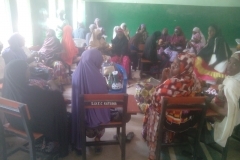 He was of the opinion that women can achieve more if they can work together, and through their activities, they can as well reach out to other women at the grassroot. 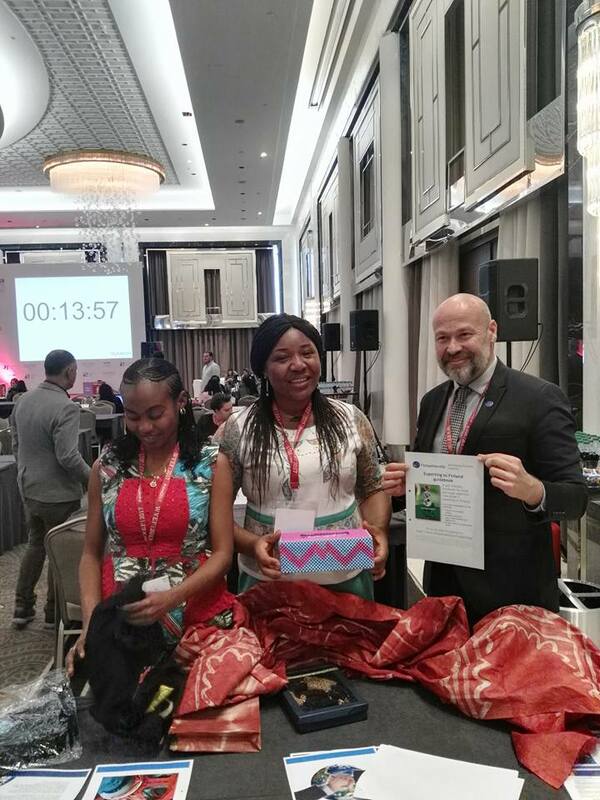 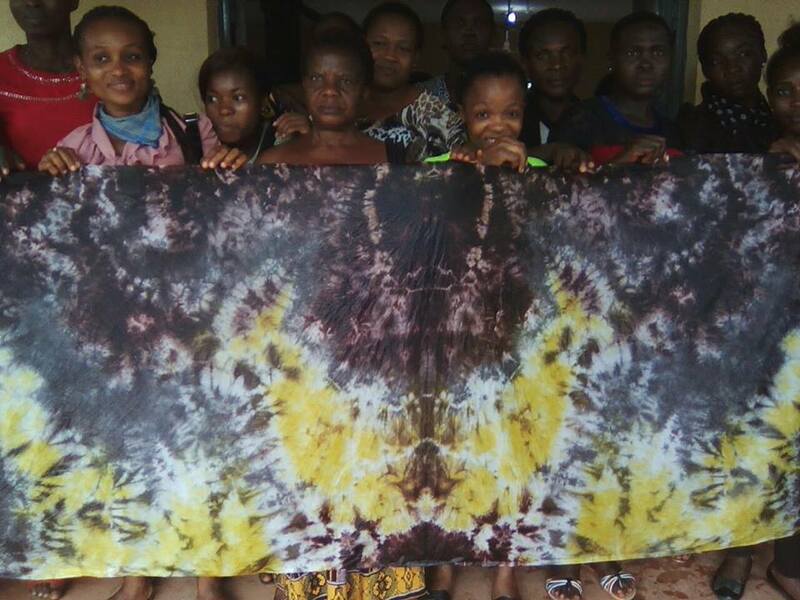 I quite agree with all he said, and I believe women can Achieve more if they can work together.After his presentation, we went further to empower the women by training them on Batik. 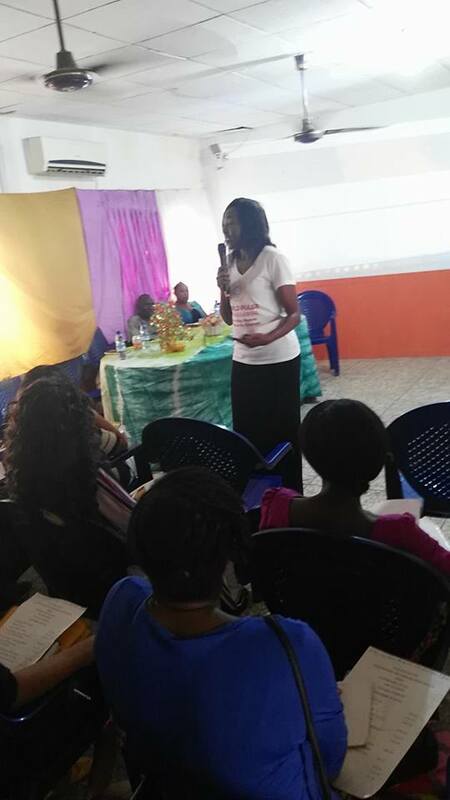 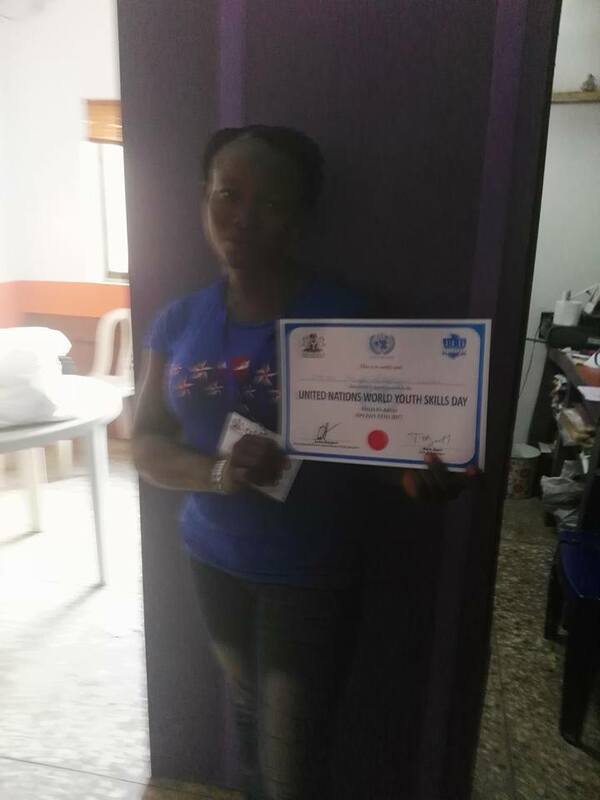 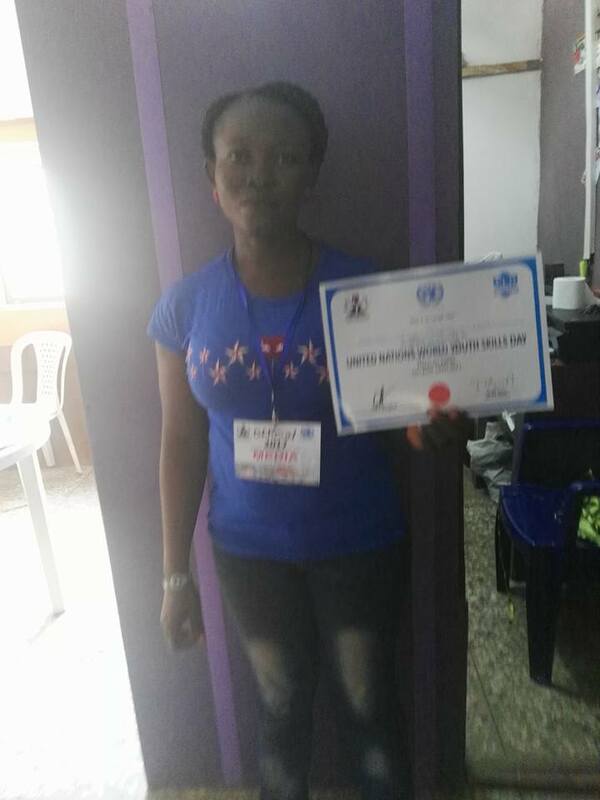 While we were rounding up, we had the presence of one of us, Empower Women Champion, Barister Carol Ajie. She came around, she was speechless having seen what the women were able to achieve. 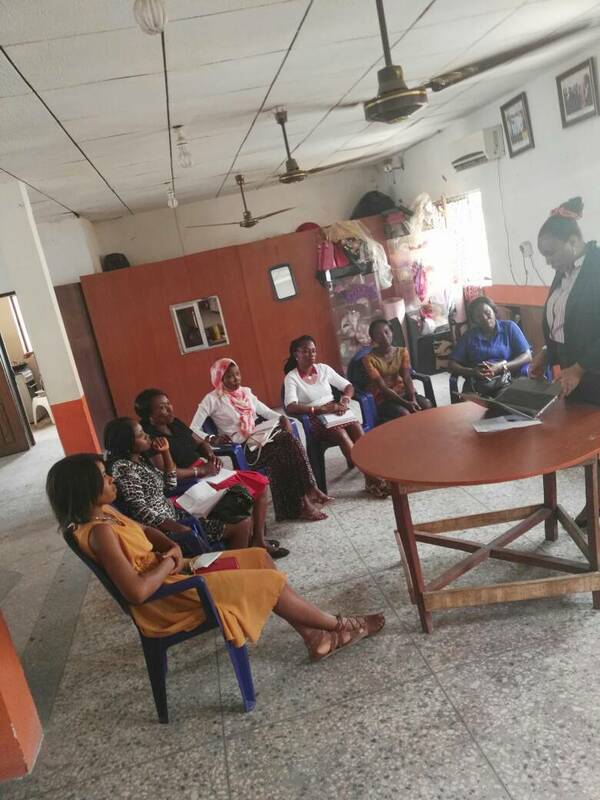 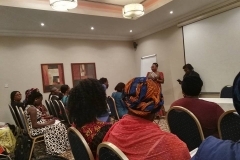 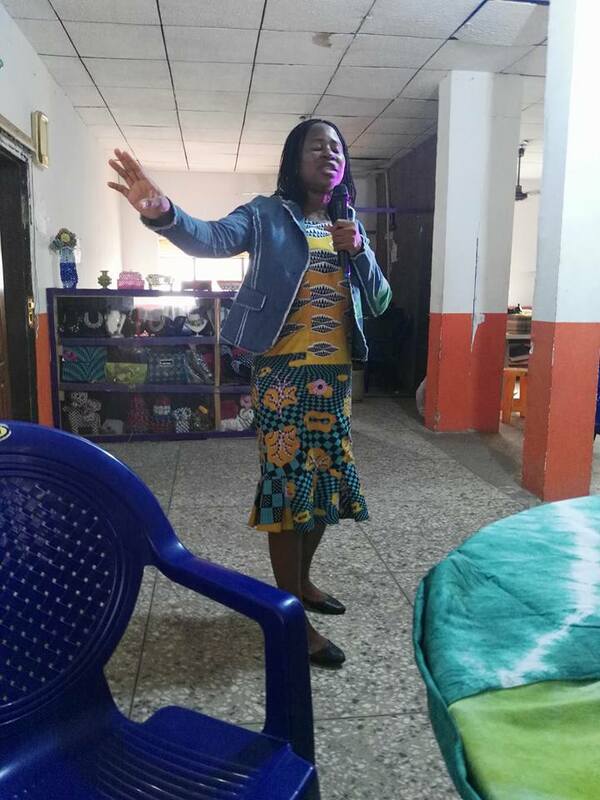 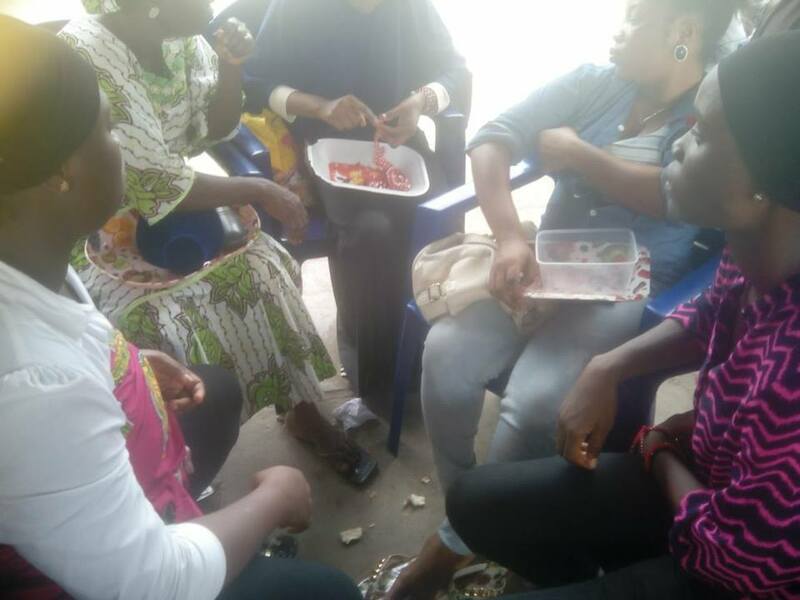 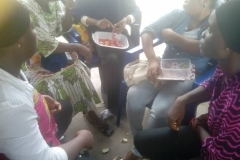 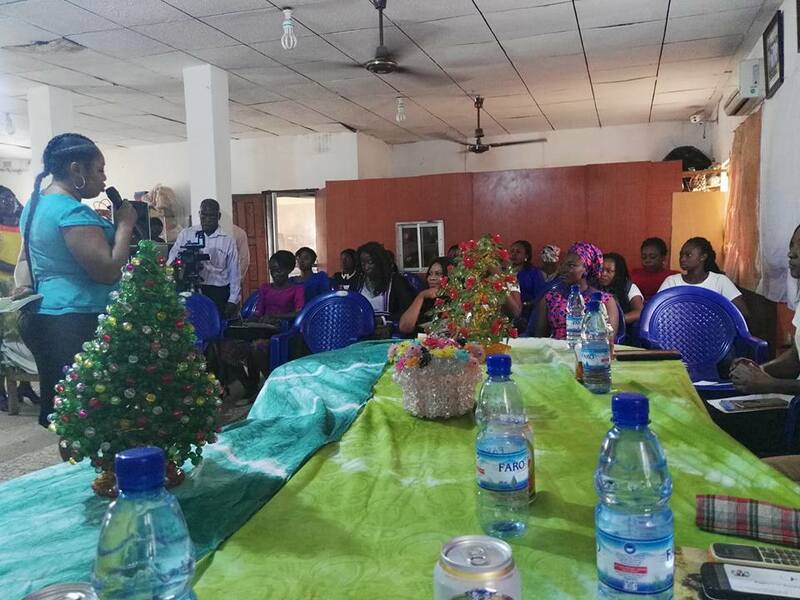 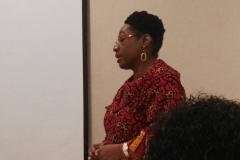 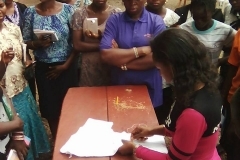 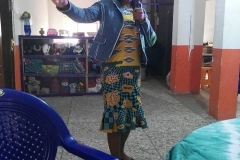 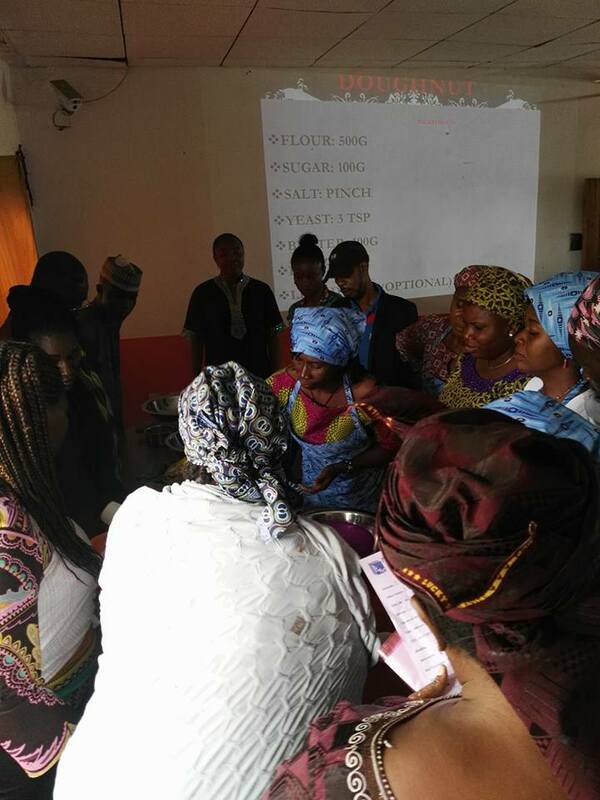 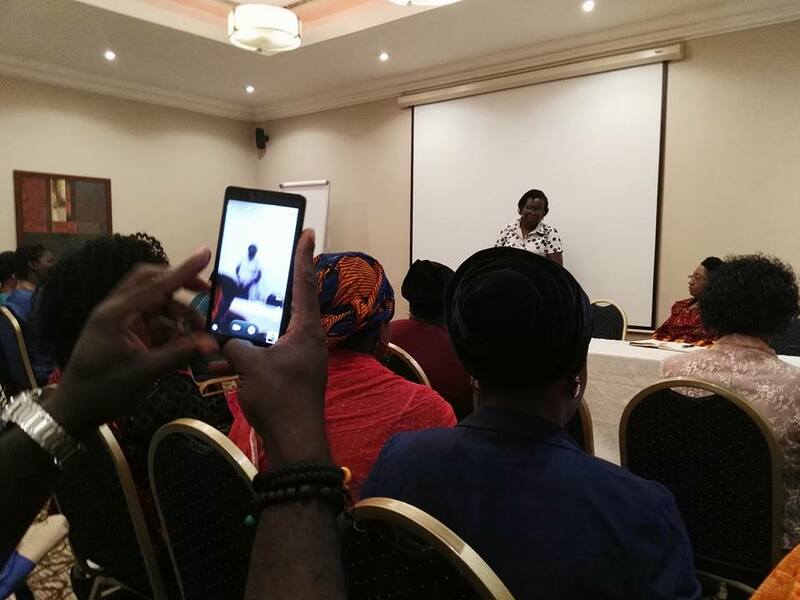 After my presentation on Empower women last week, some women has joined the movement, while I was able to sort out some issues that stopped some from joining. 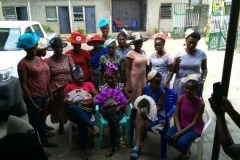 It was fun filled all the way and indeed, one of the best outing I ever had. 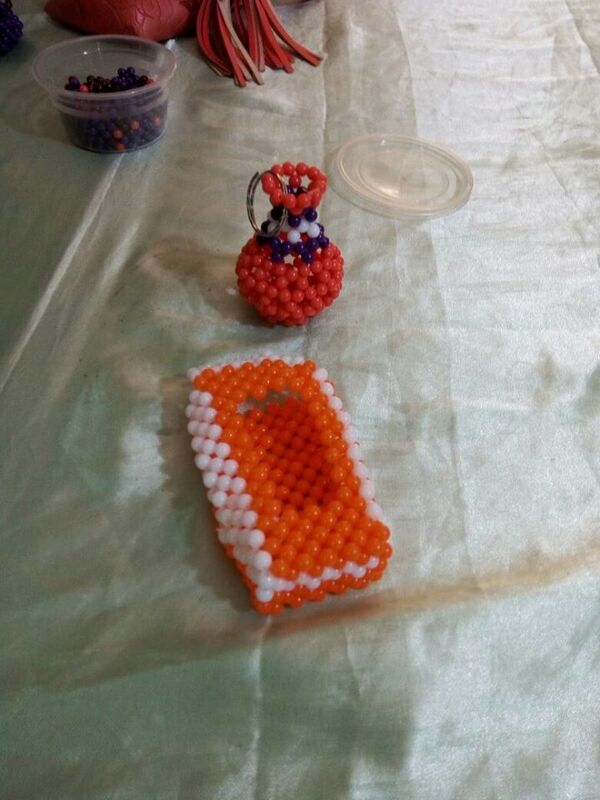 Enjoy these pictures from yesterdays event. 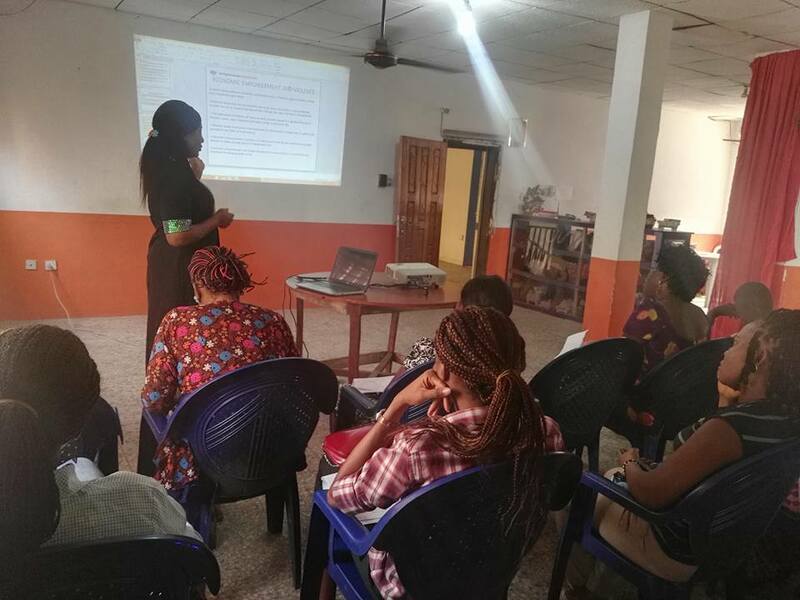 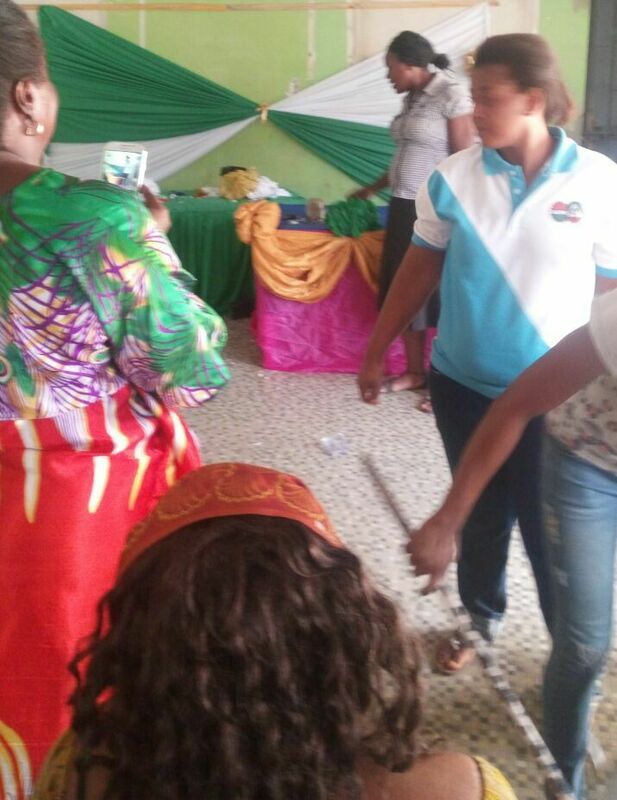 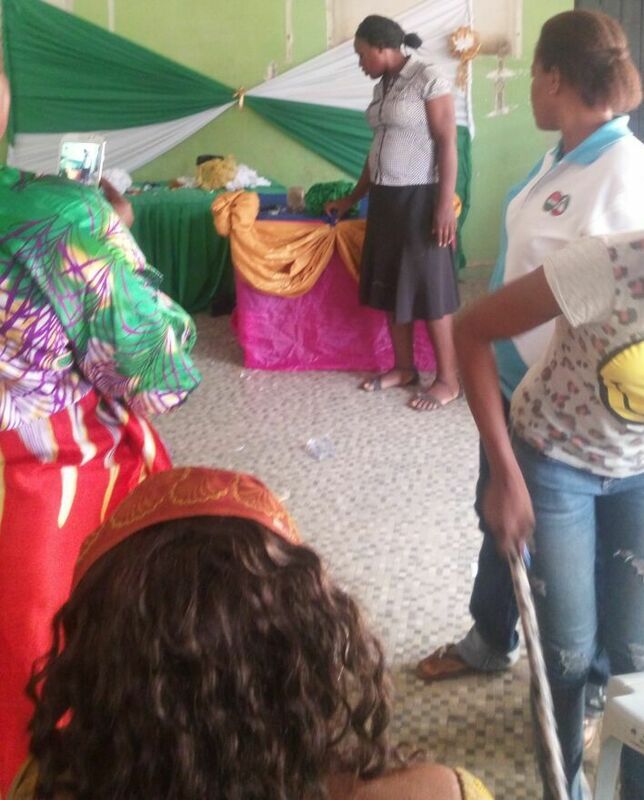 It was an exciting outing today at Phelyn skill center We commenced the ”Champion in action” with a presentation by Ifeyinwa Evelyn Ezeagu. 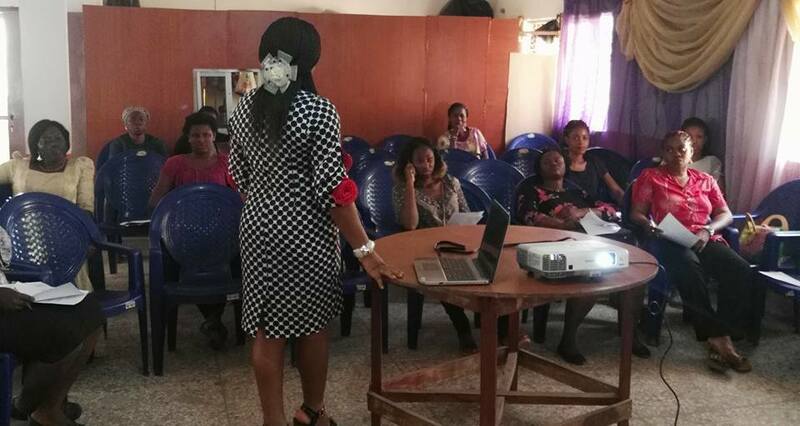 The presentation was more of interaction with participants, and it lasted for 2 hours, 10am – 12 noon. 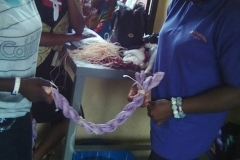 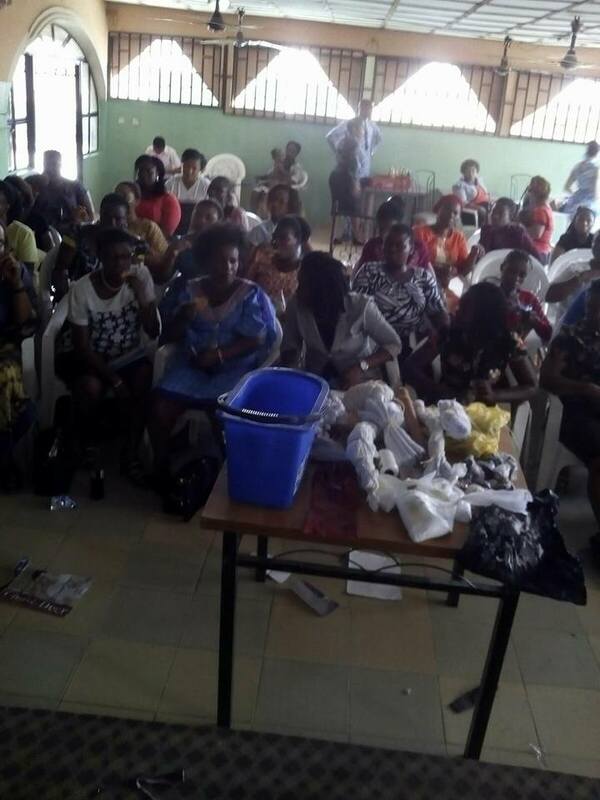 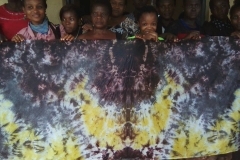 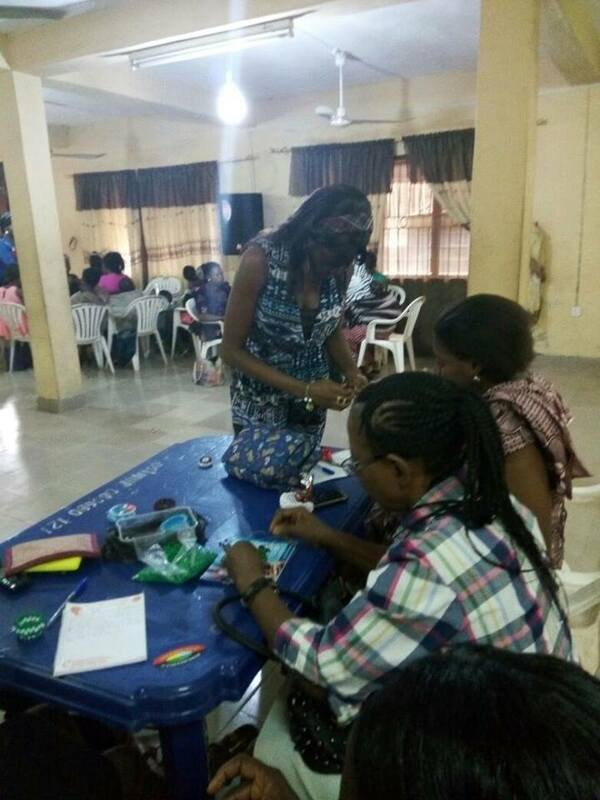 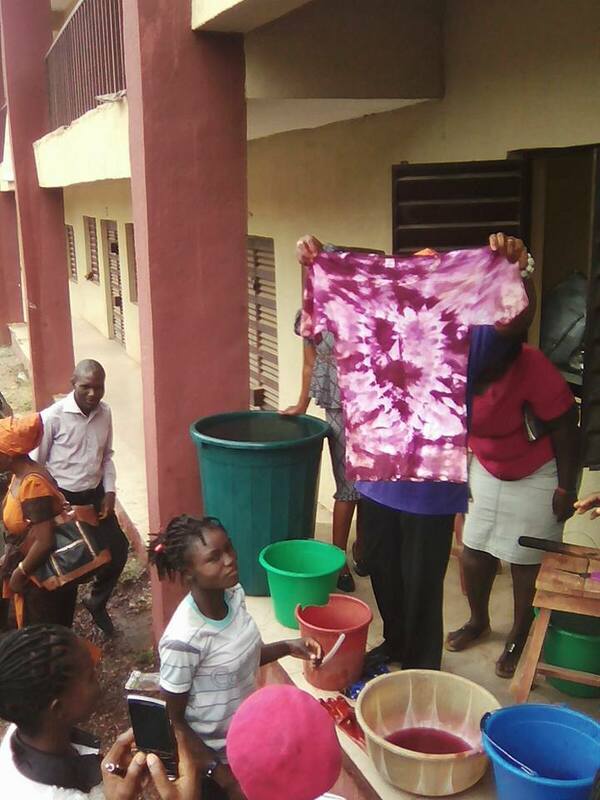 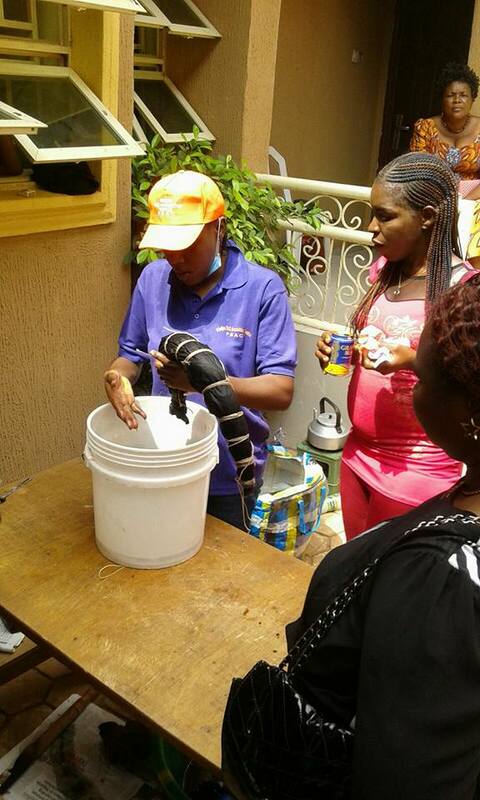 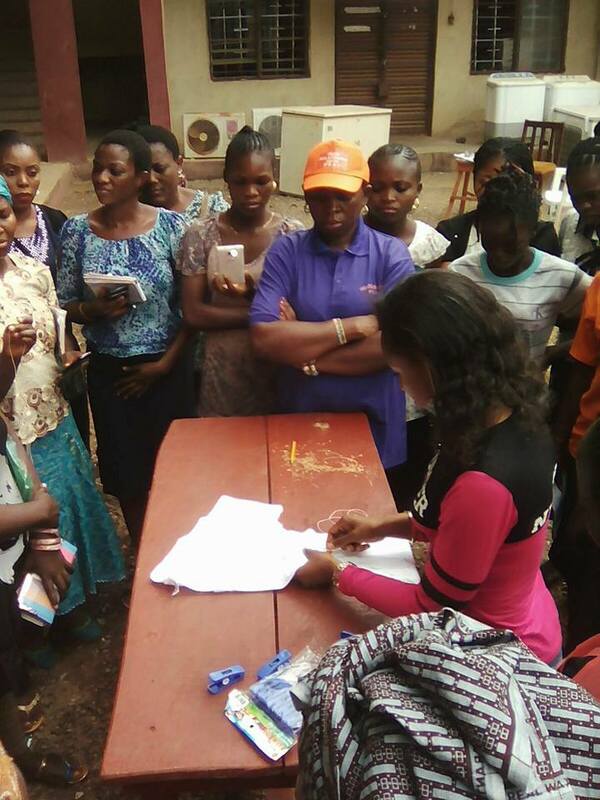 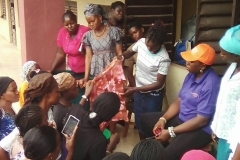 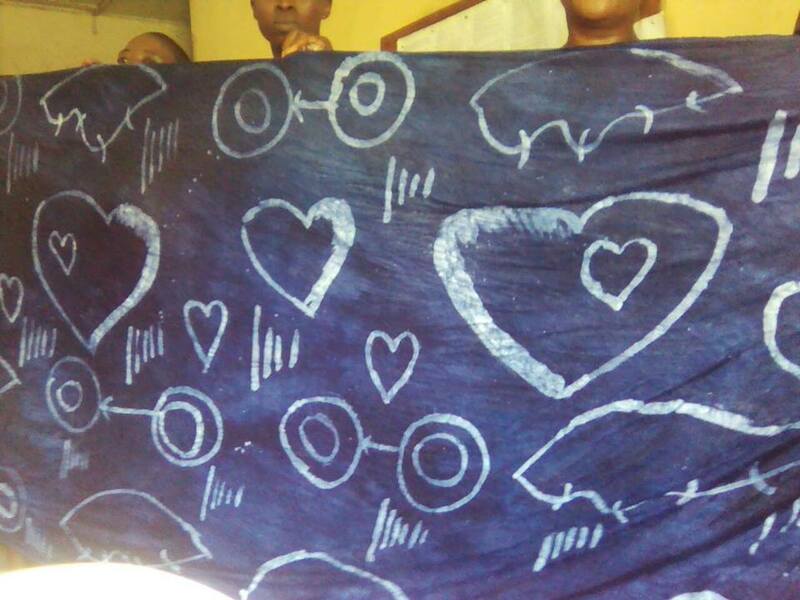 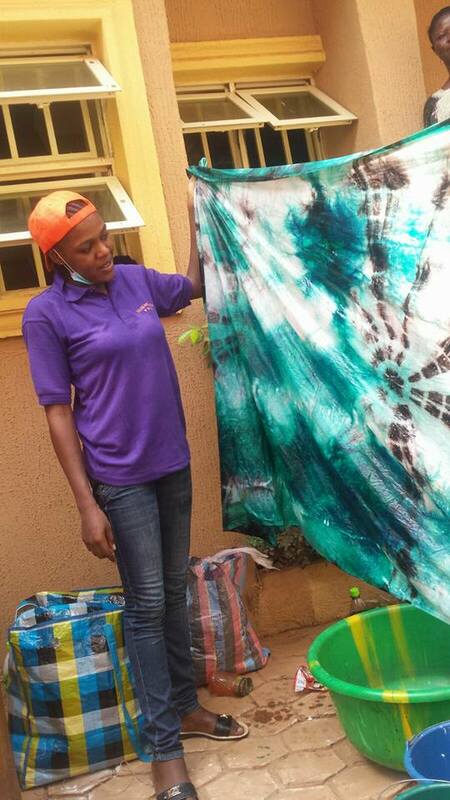 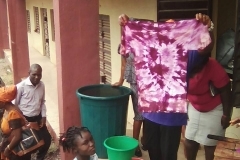 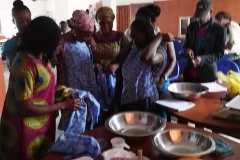 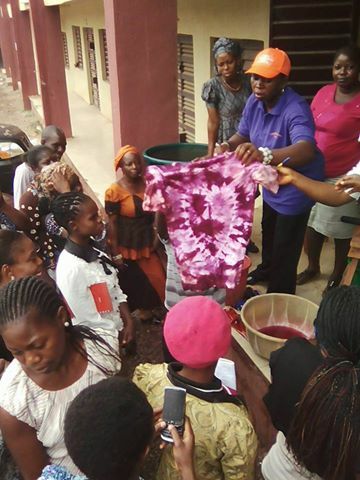 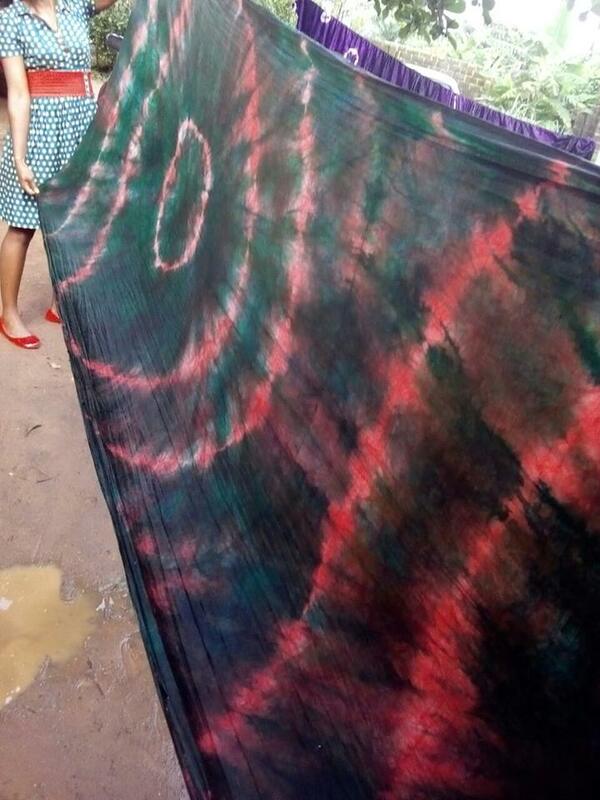 Participants were introduced to Tie and dye by one of PSAC facilitator, Ann Omodara. 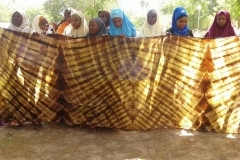 We went for launch, courtesy of PSAC Team. 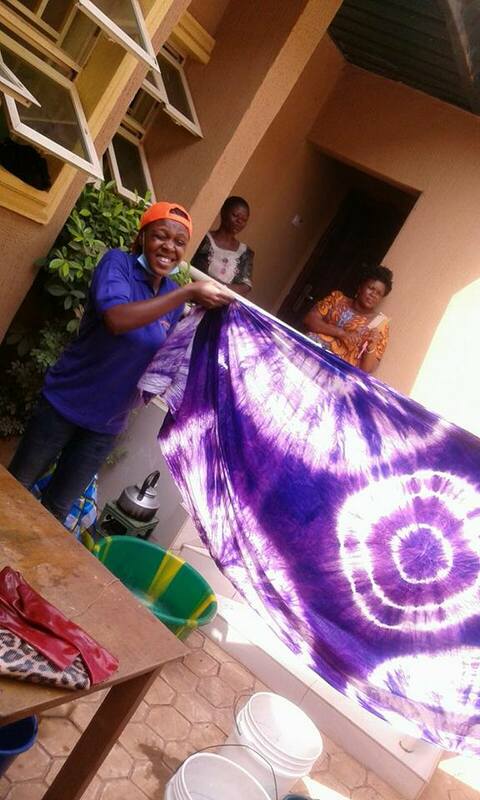 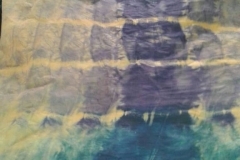 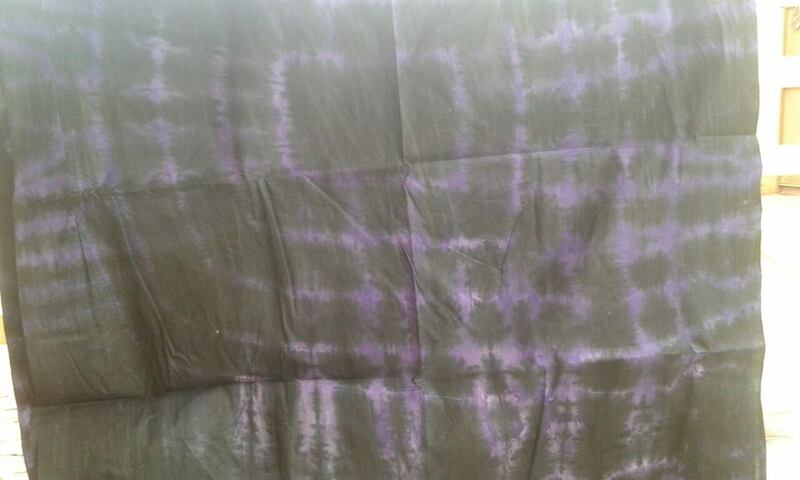 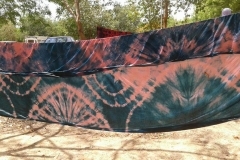 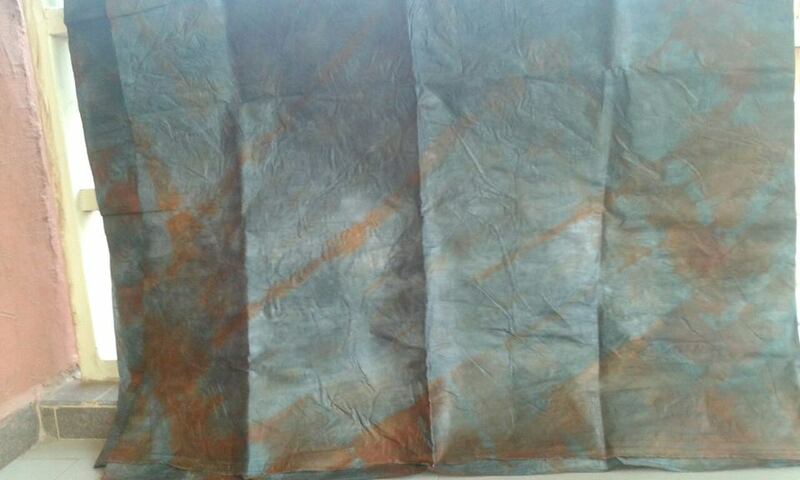 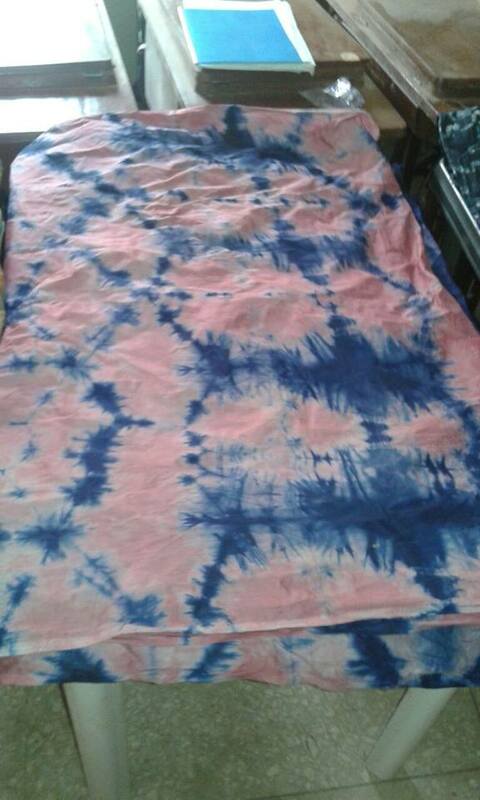 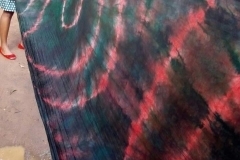 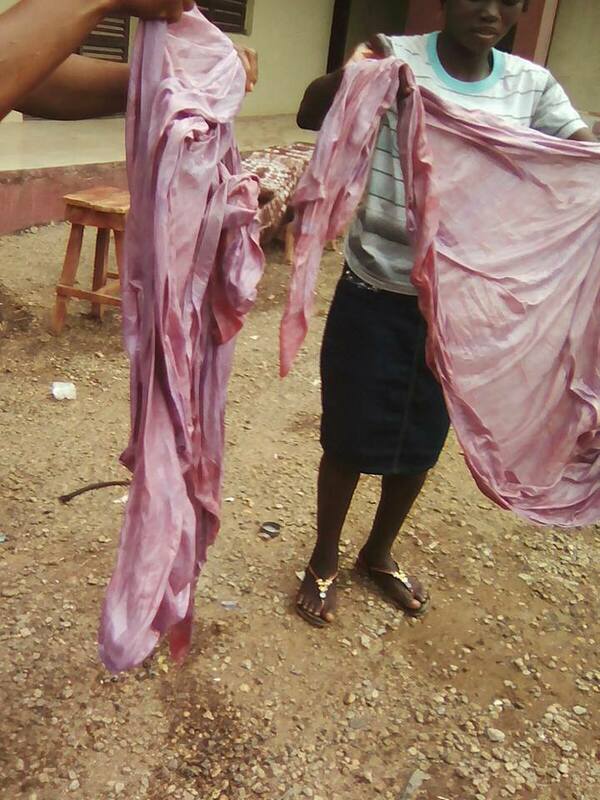 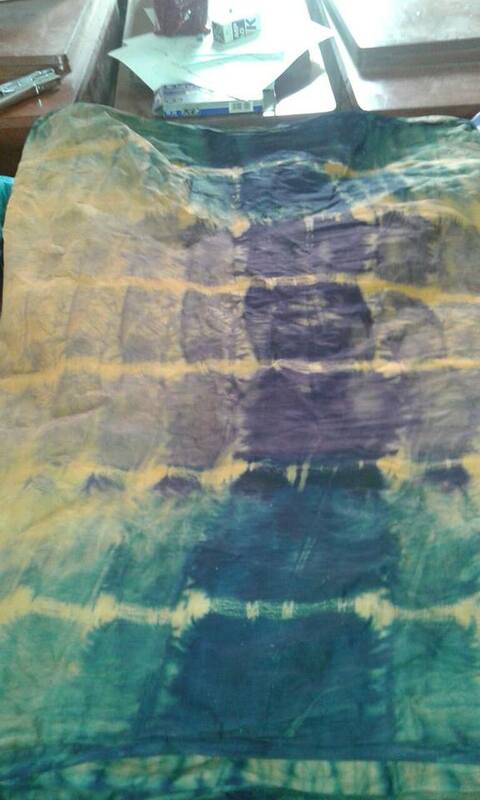 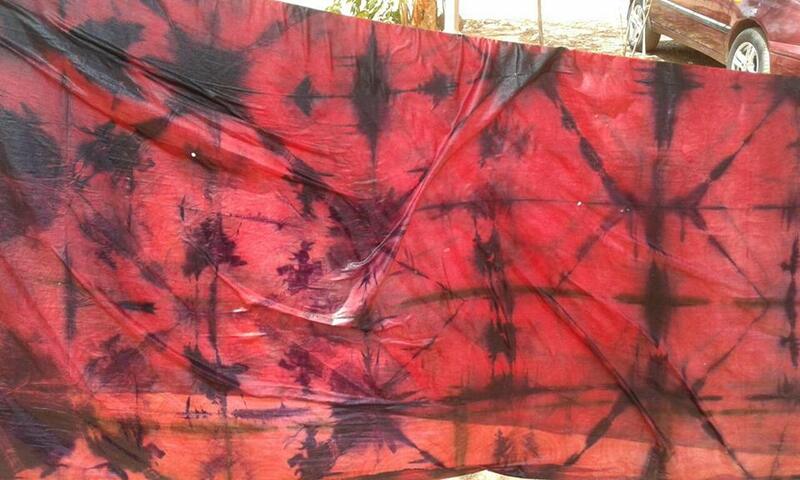 We resumed practical work on Tie and dye and reclying of of old clothes. 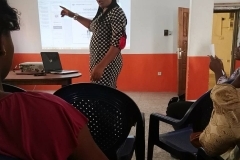 Eventually, the whole training lasted for 7 hours. 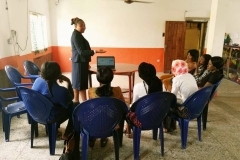 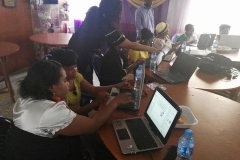 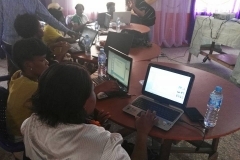 The outcome of this training is that most of the participants will sign up with Empower Women. 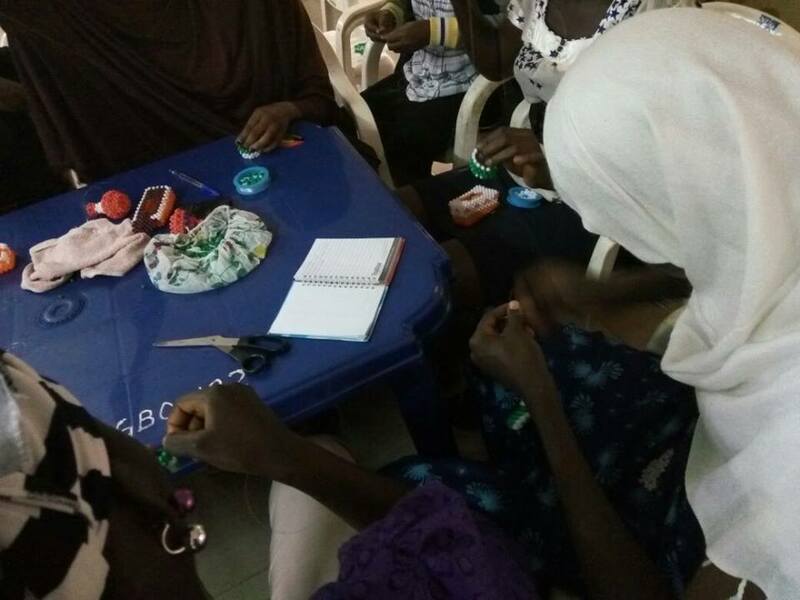 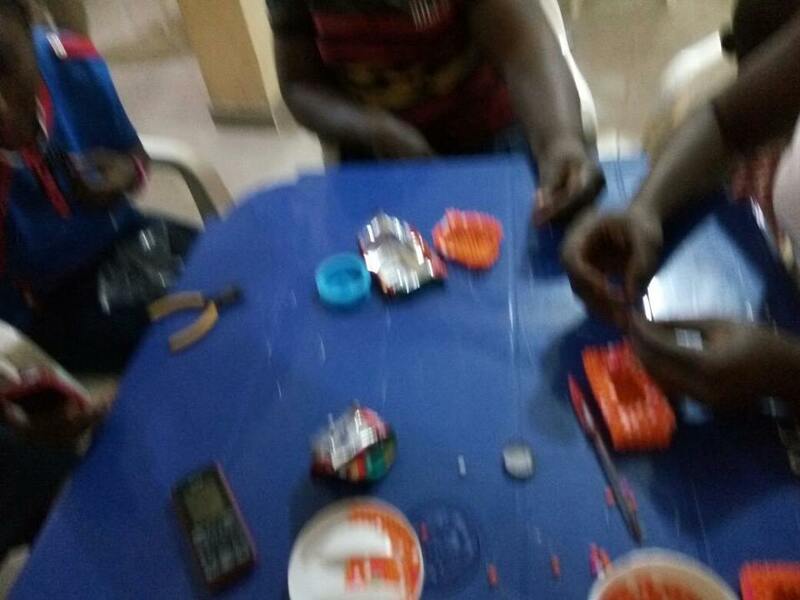 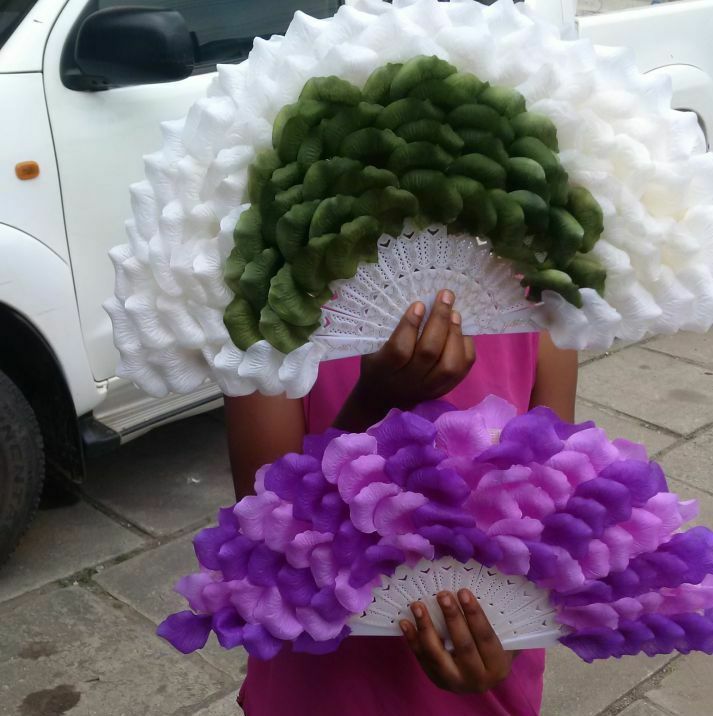 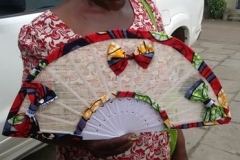 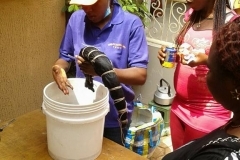 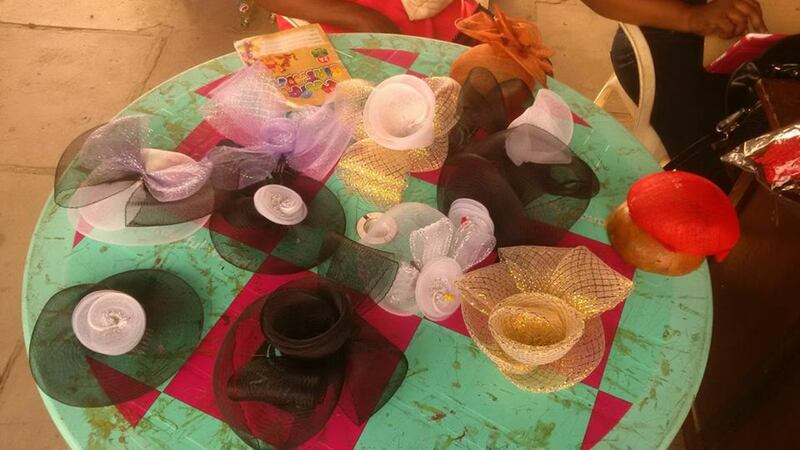 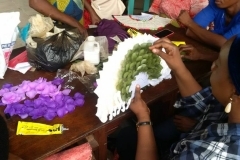 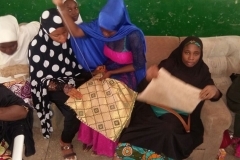 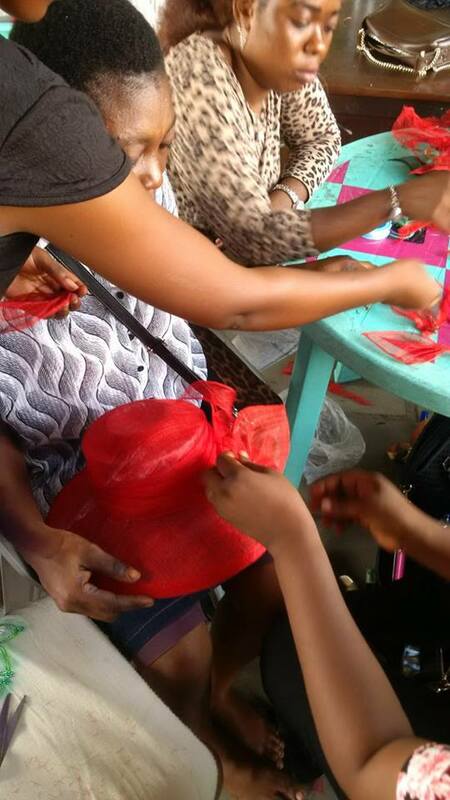 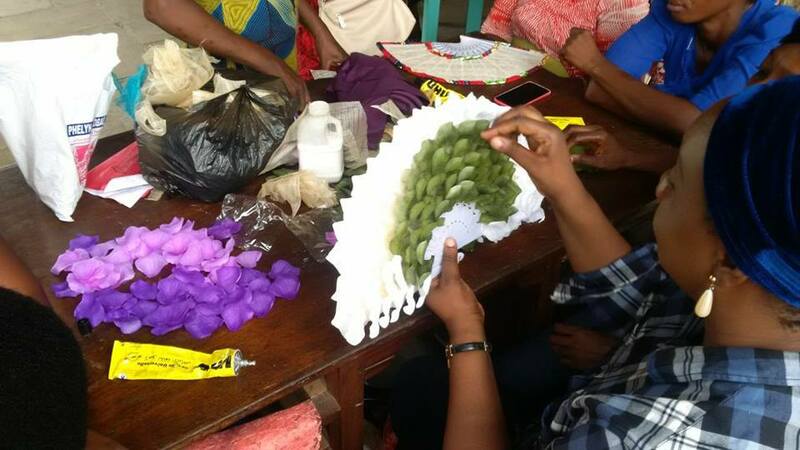 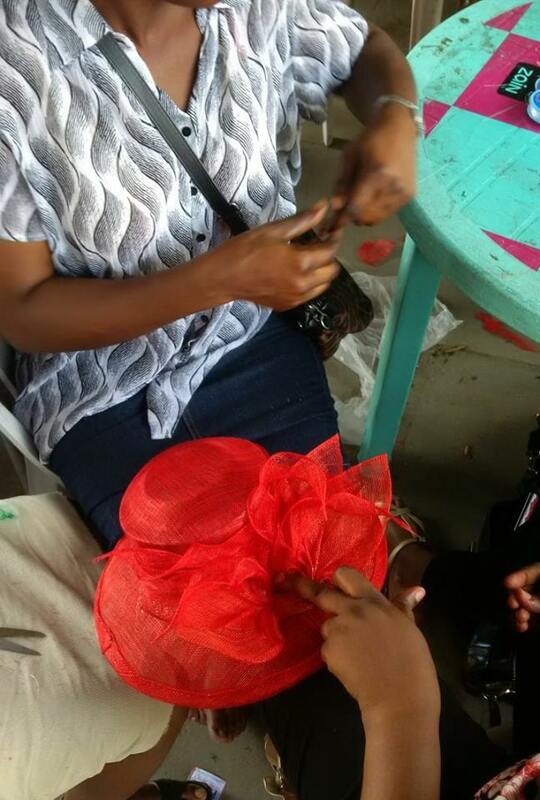 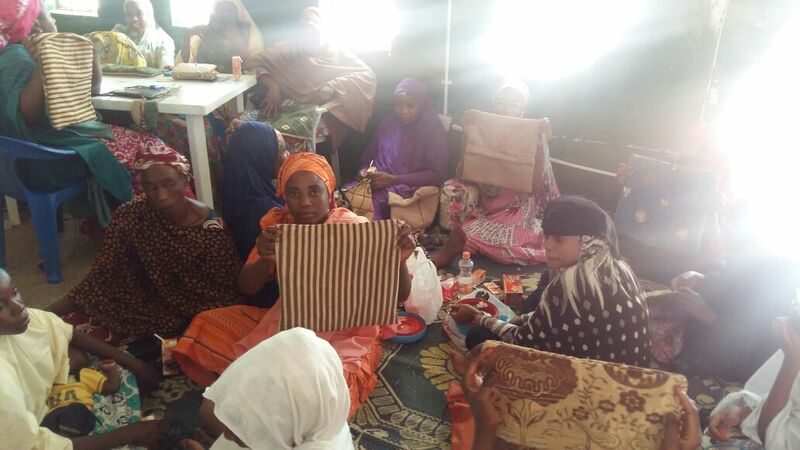 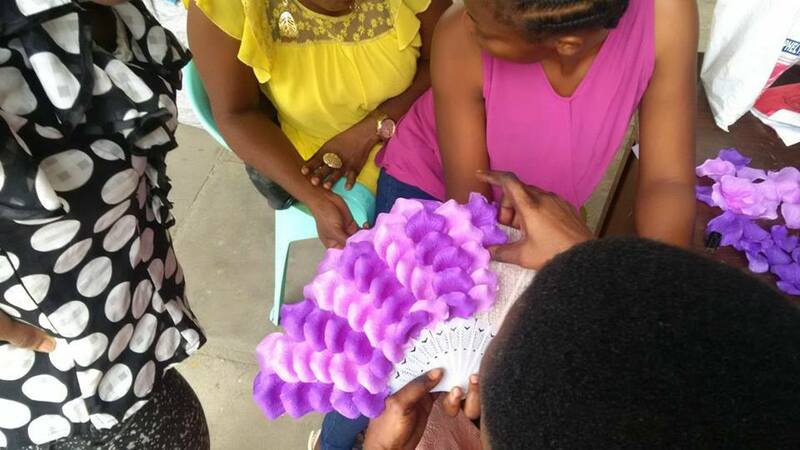 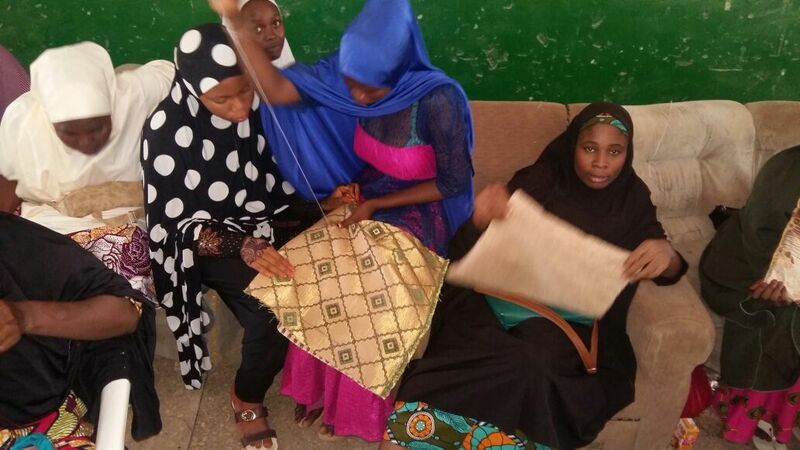 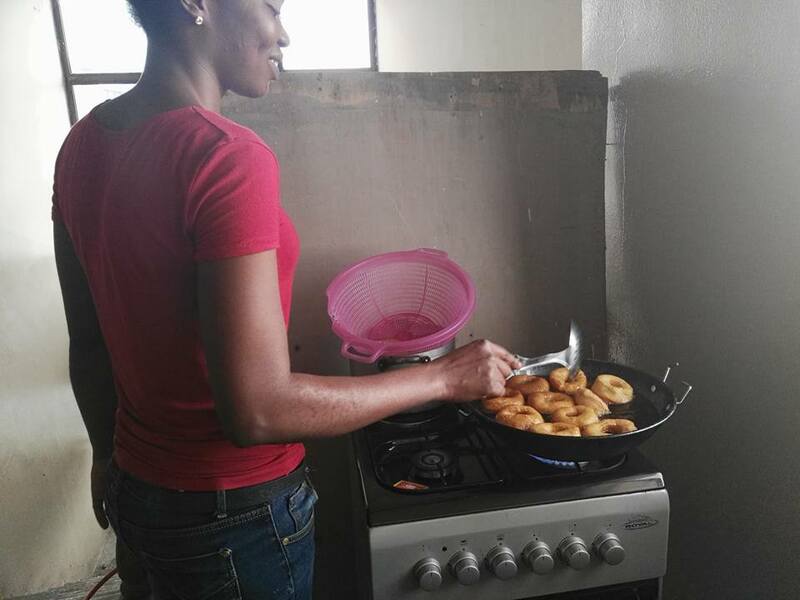 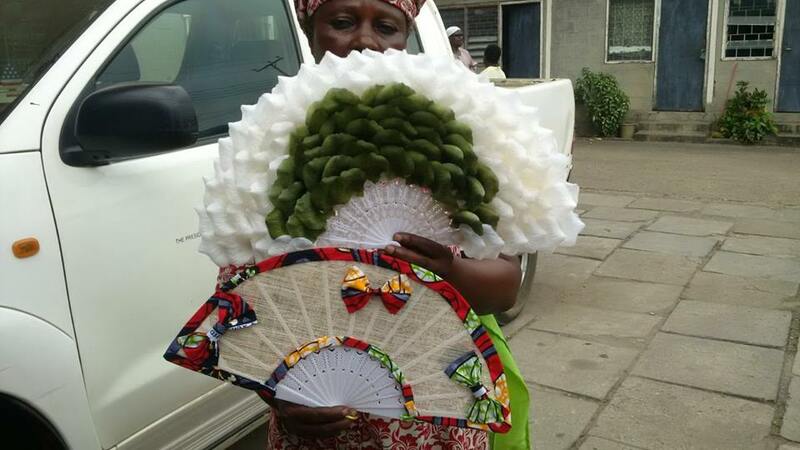 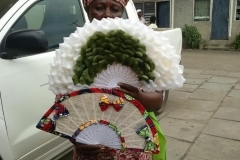 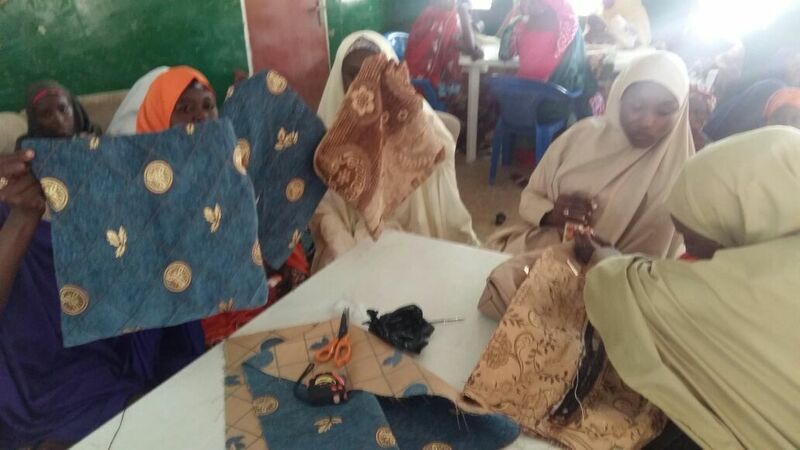 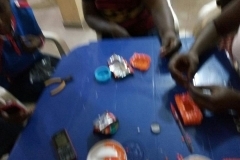 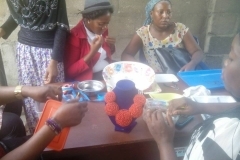 They also learnt a new skill that can as well help them generate income. 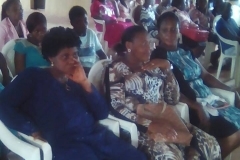 We will round up the program by next week Saturday. 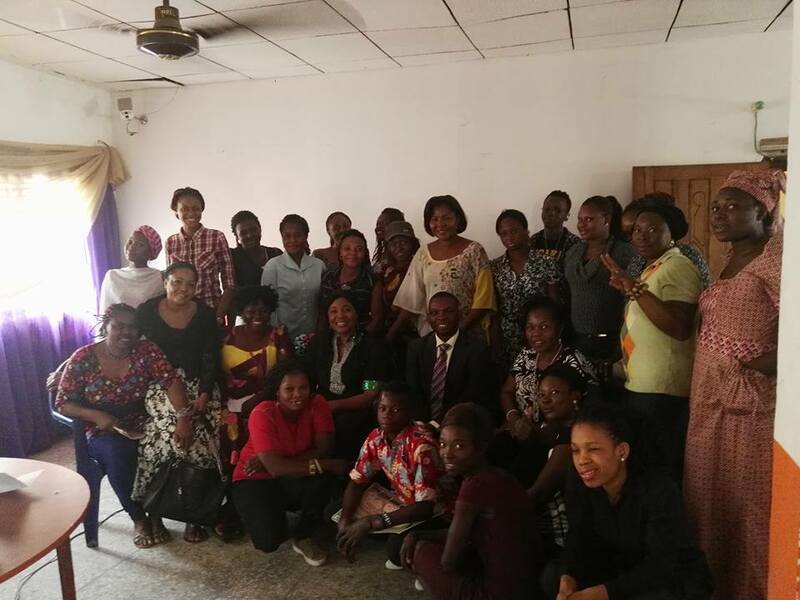 The Lagos training has come to an end. 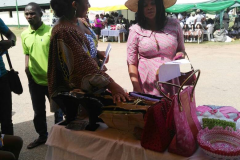 Below are pictures of women, showcasing their products. 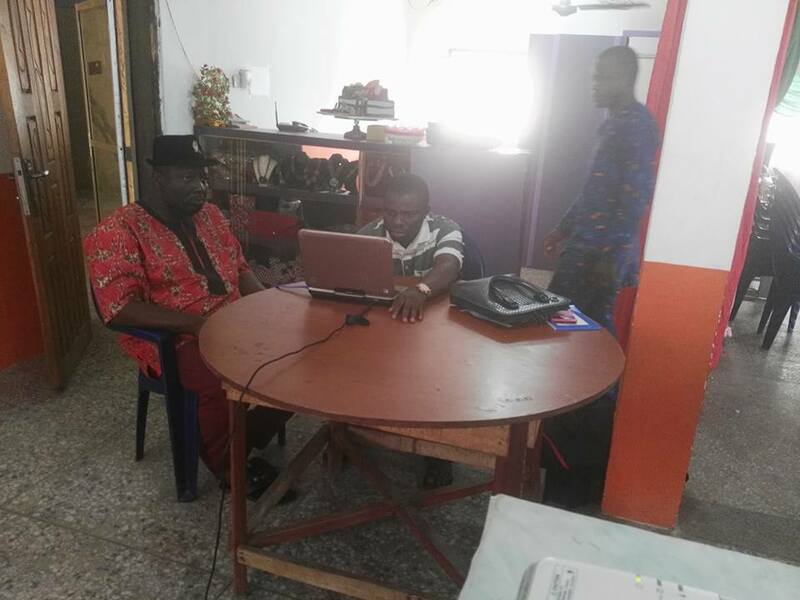 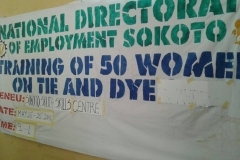 Today is the graduation ceremony, so a lot is happening at NDE office, Yaba. 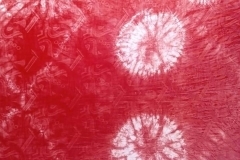 More news and details about the event will come your way later. 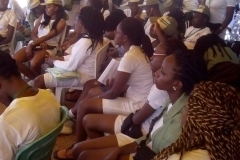 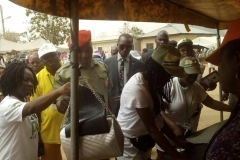 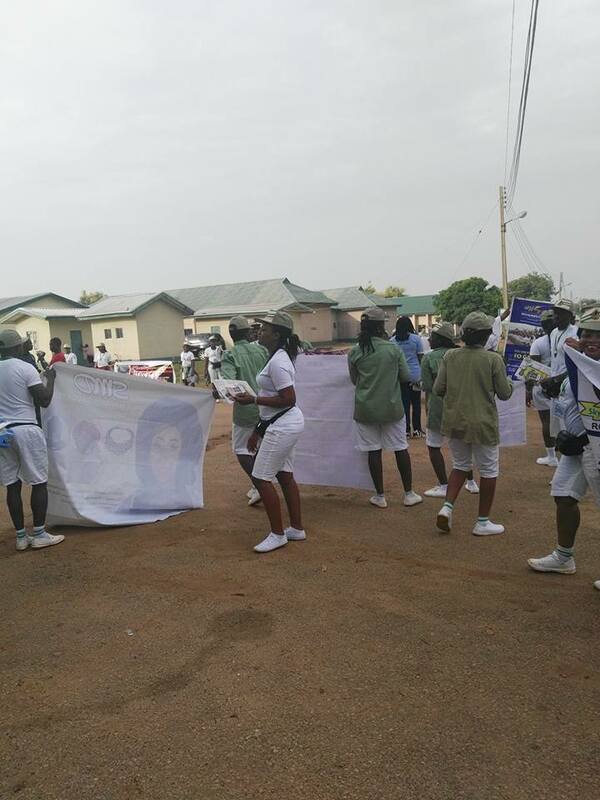 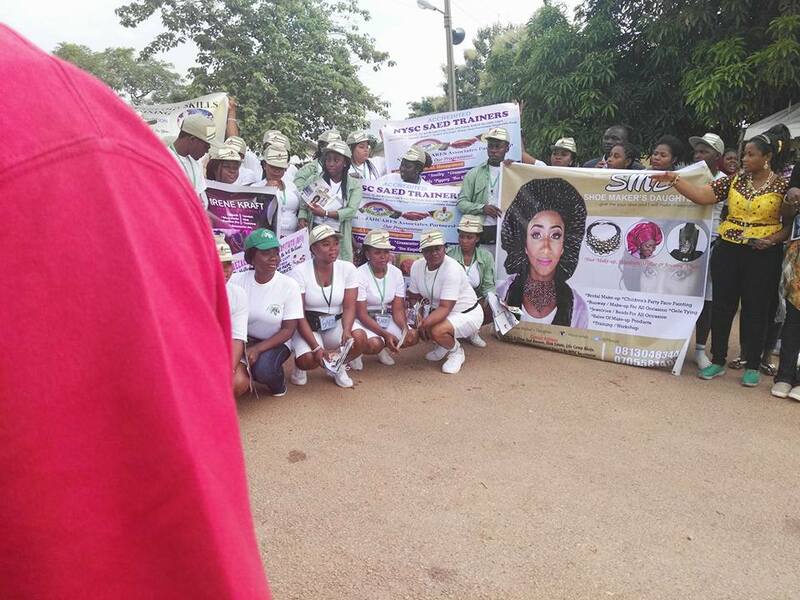 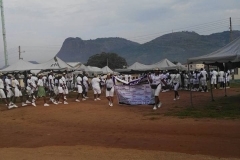 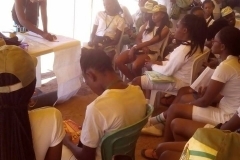 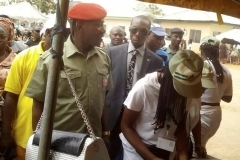 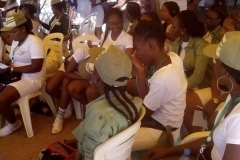 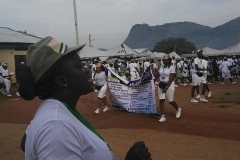 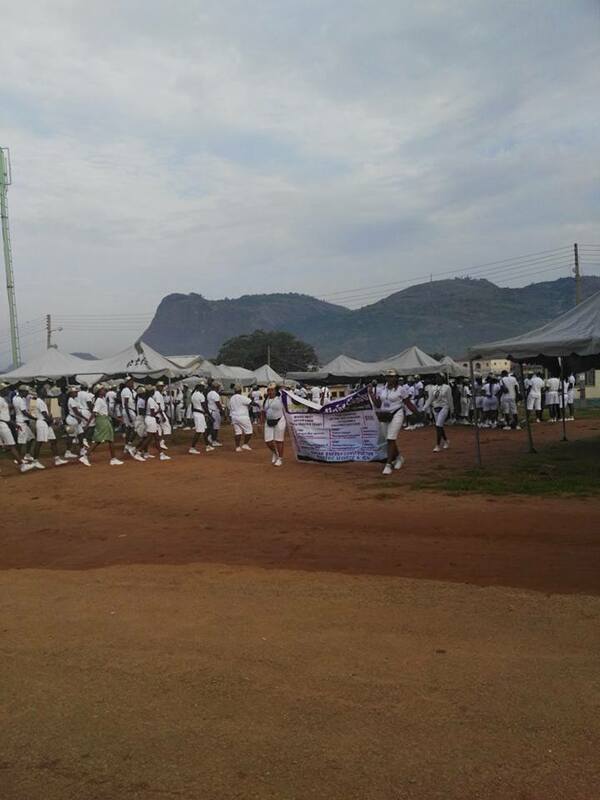 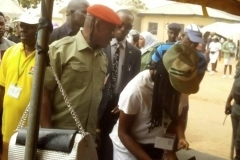 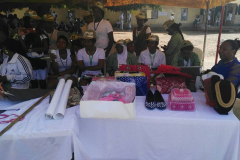 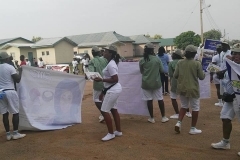 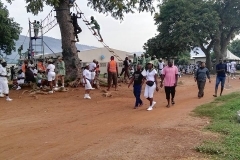 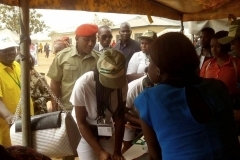 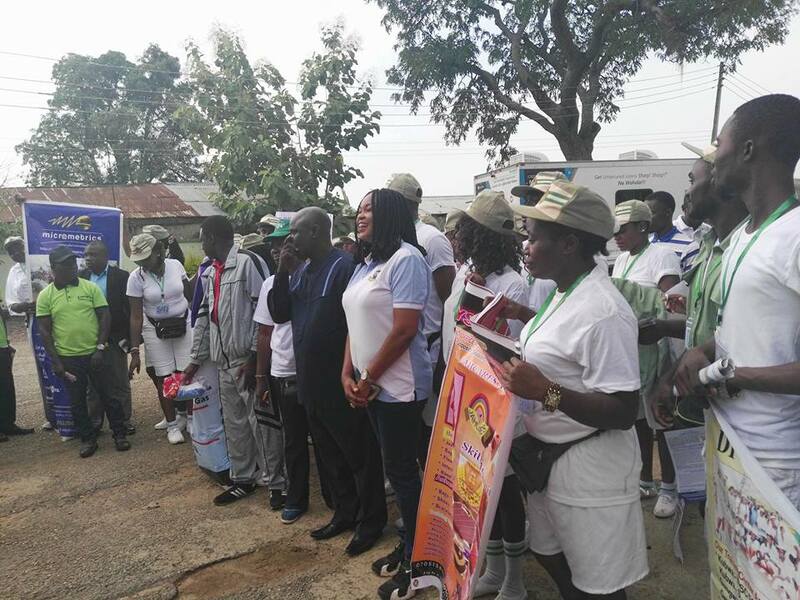 SAED in Partnership with PSAC trained some NYSC members at kubwa orientation camp. 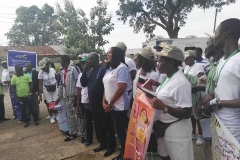 The Minister of Youth and Sports, Solomon Dalong was at the camp. 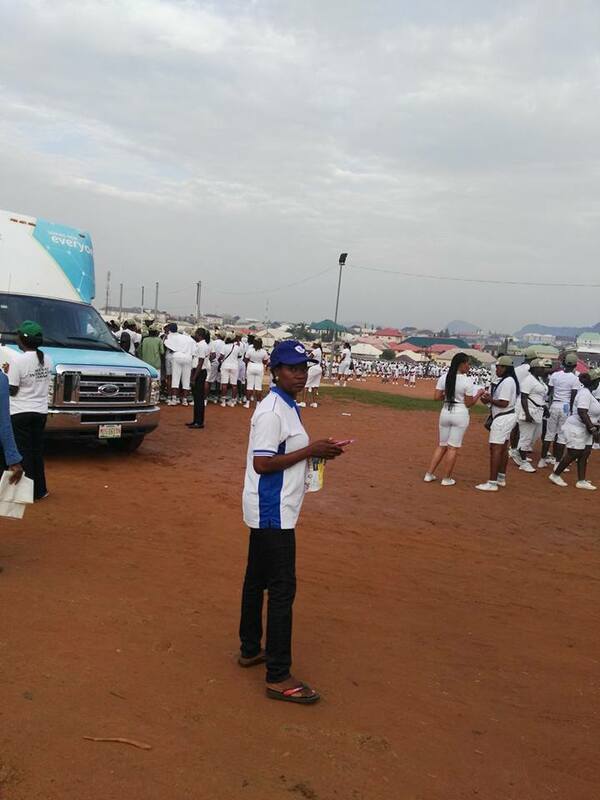 He was there twice, early in the morning and later in the day. 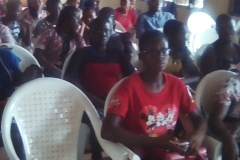 He came to see how the youths were coping with the training. 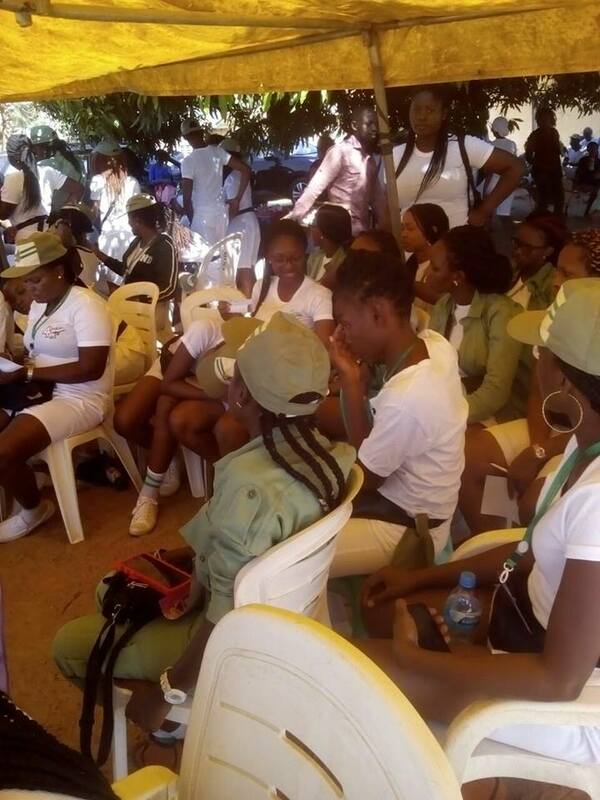 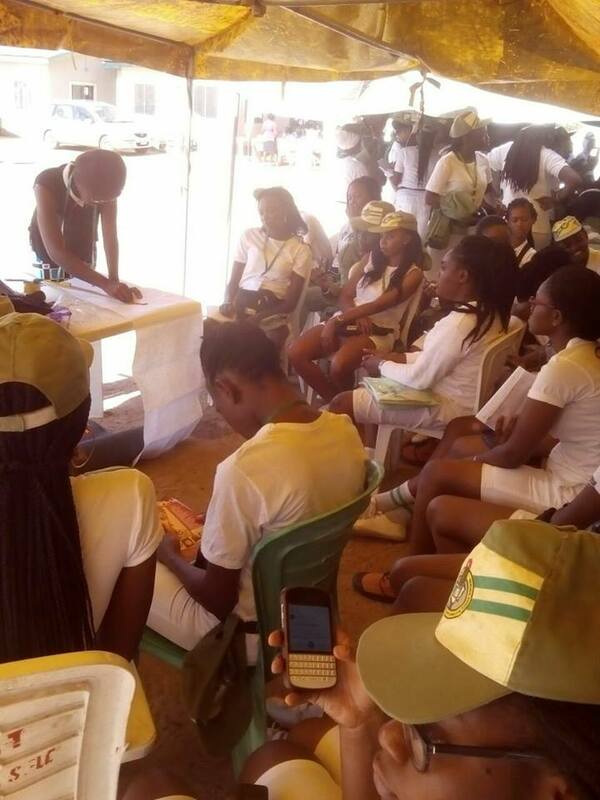 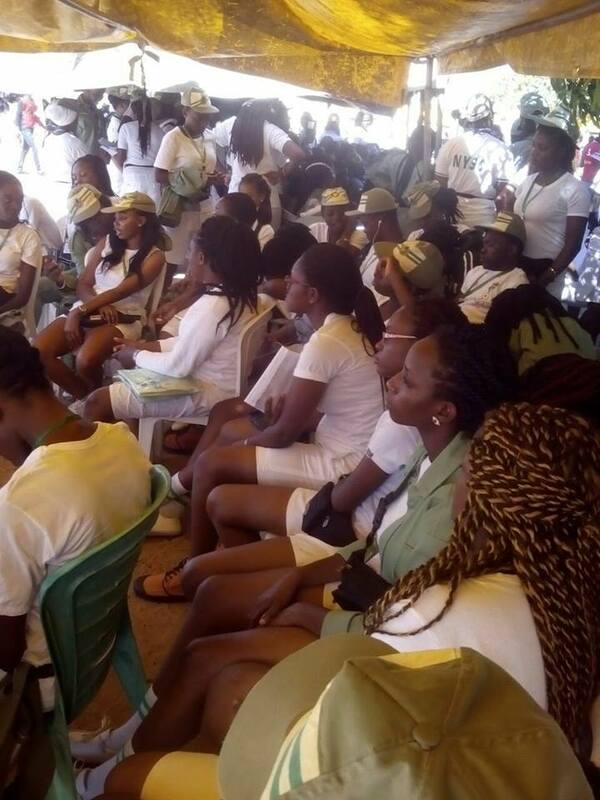 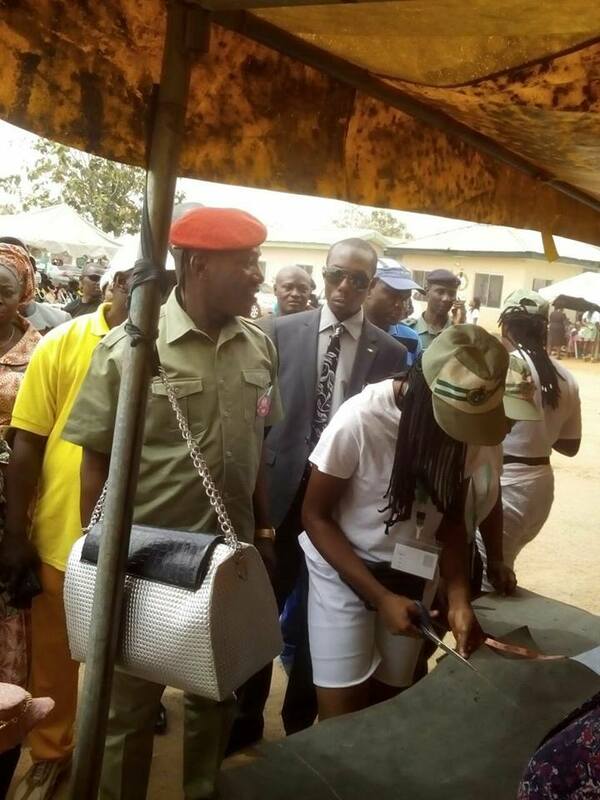 90% of these corp members are females. 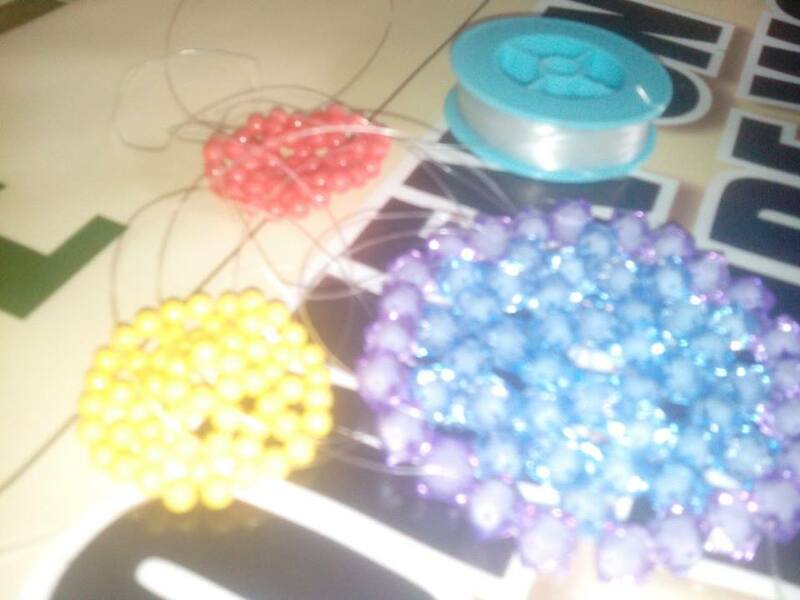 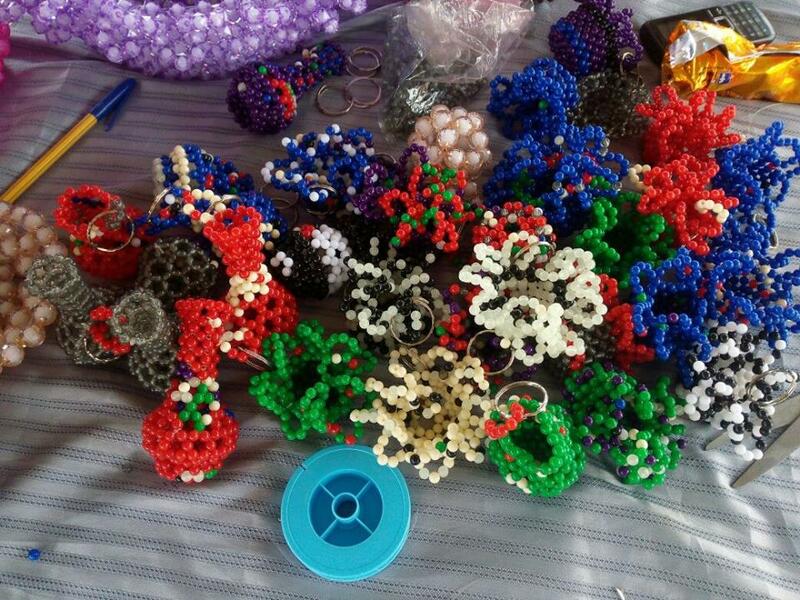 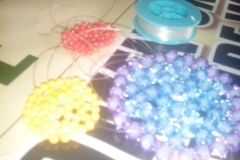 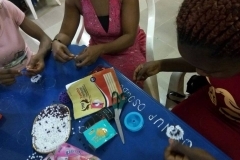 They were excited to learn bead making and bag. 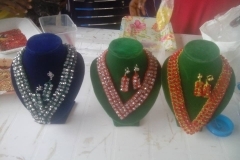 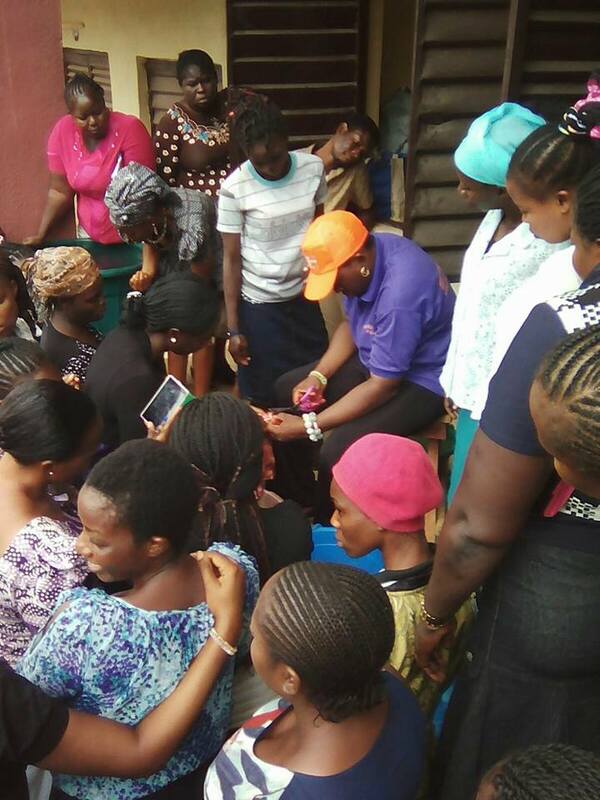 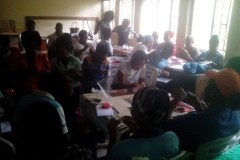 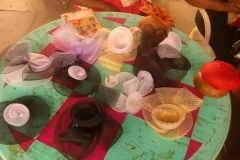 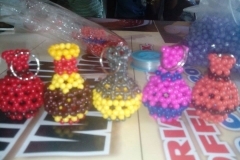 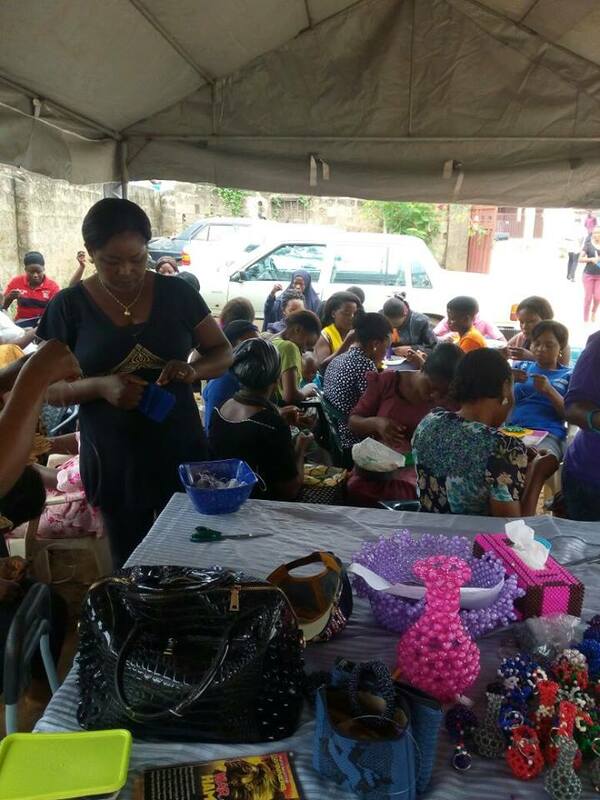 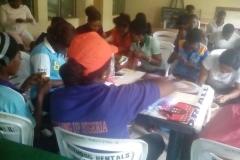 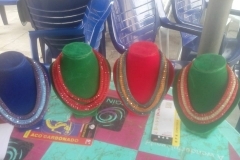 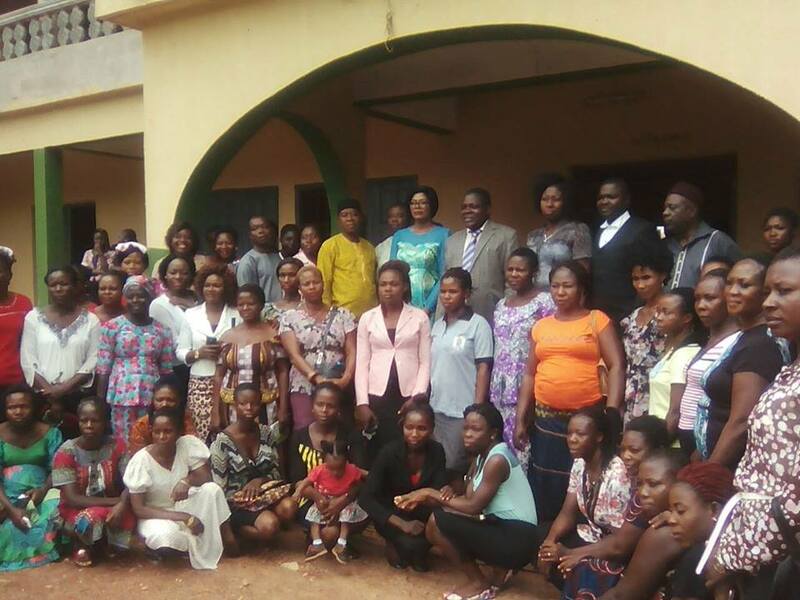 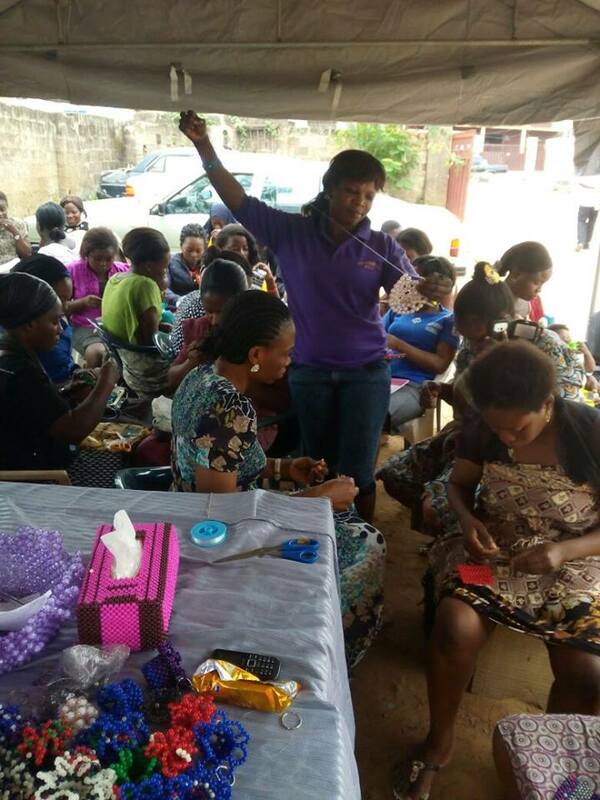 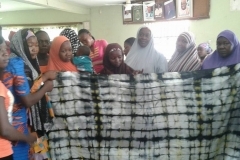 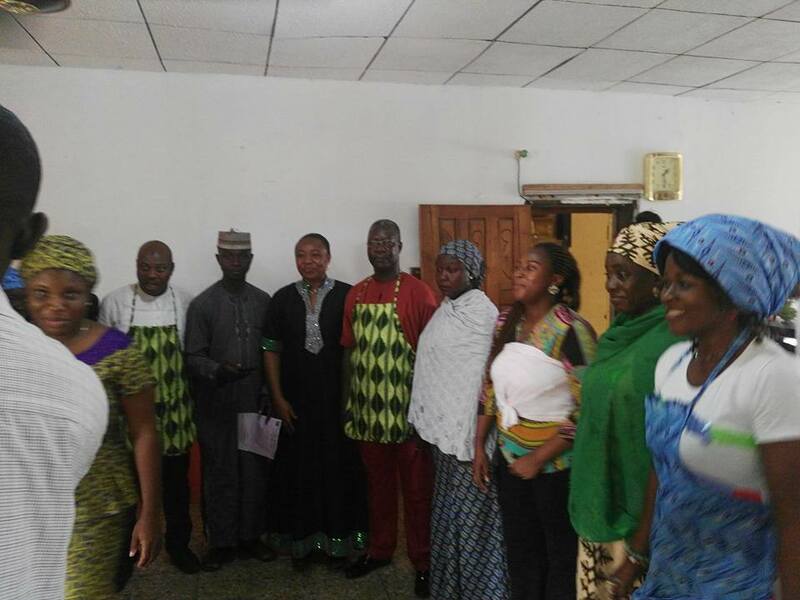 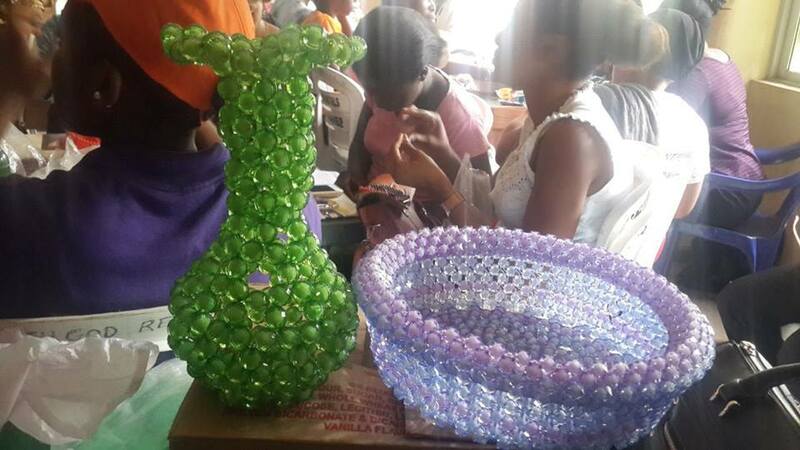 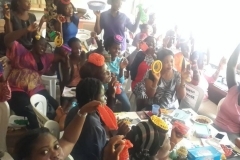 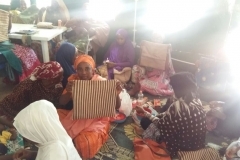 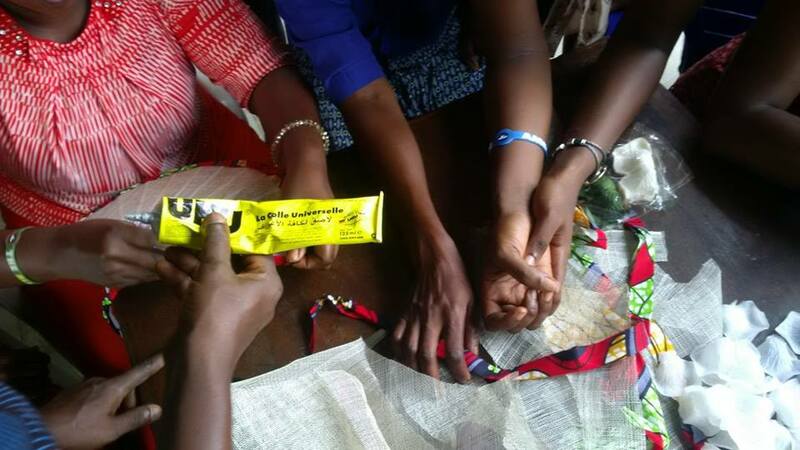 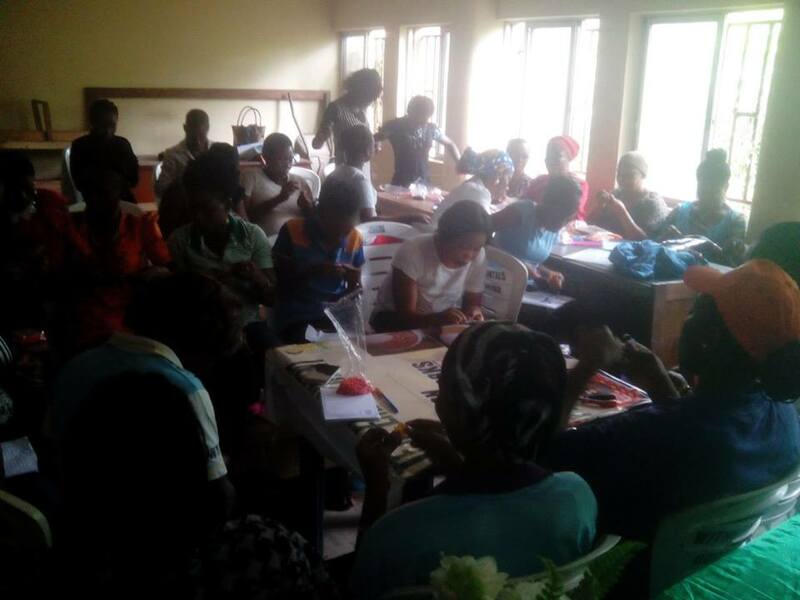 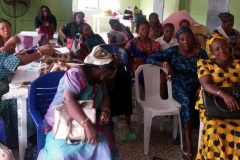 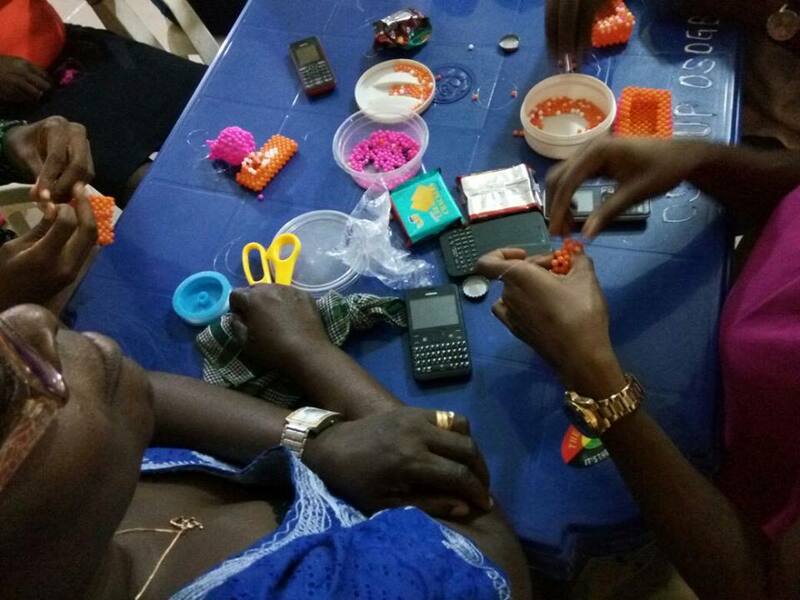 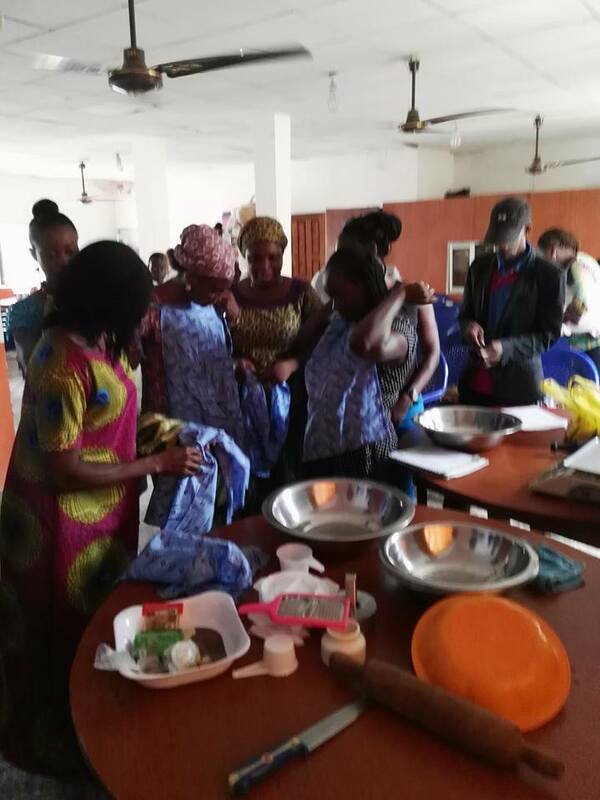 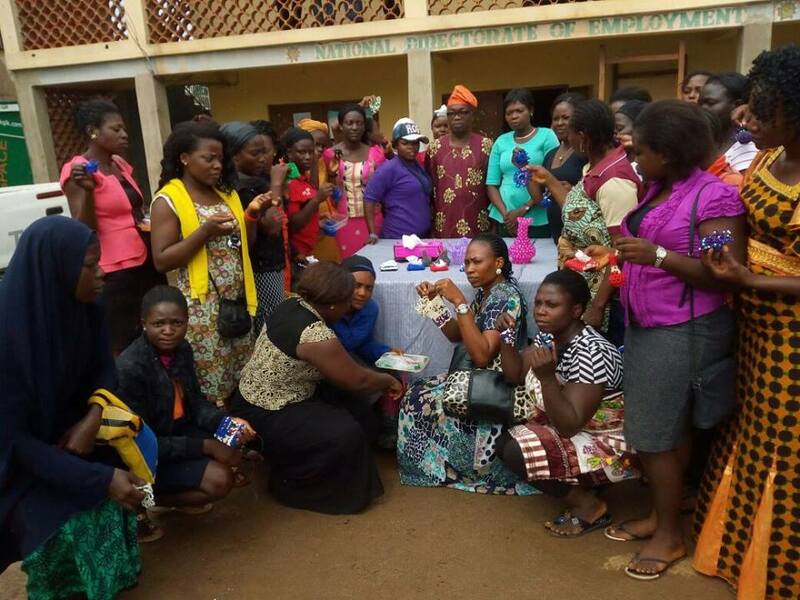 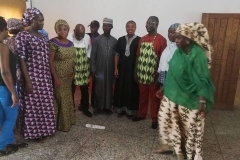 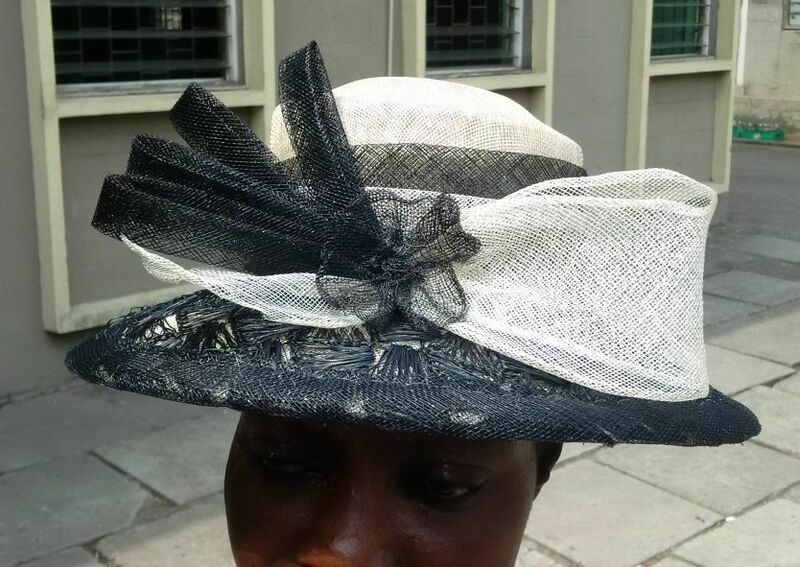 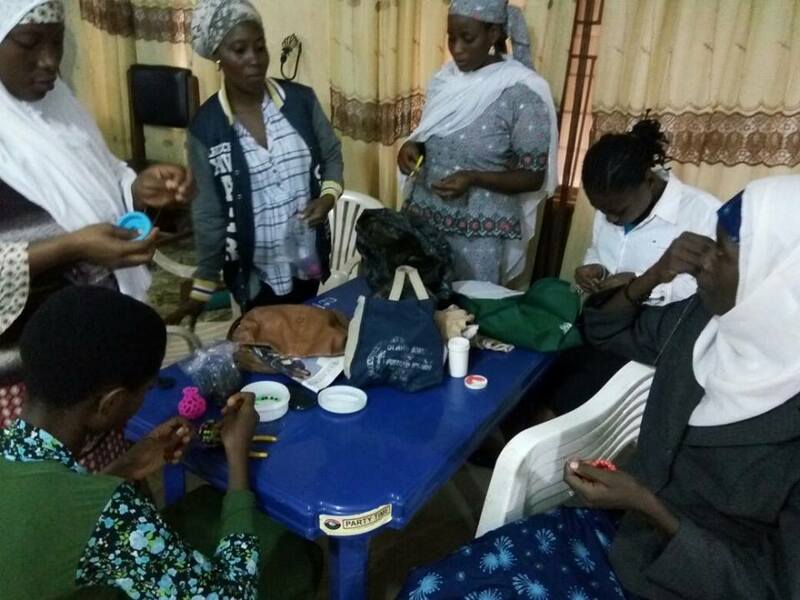 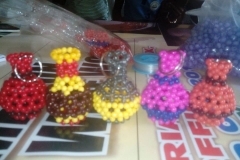 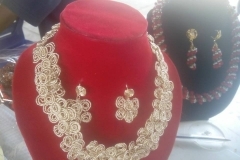 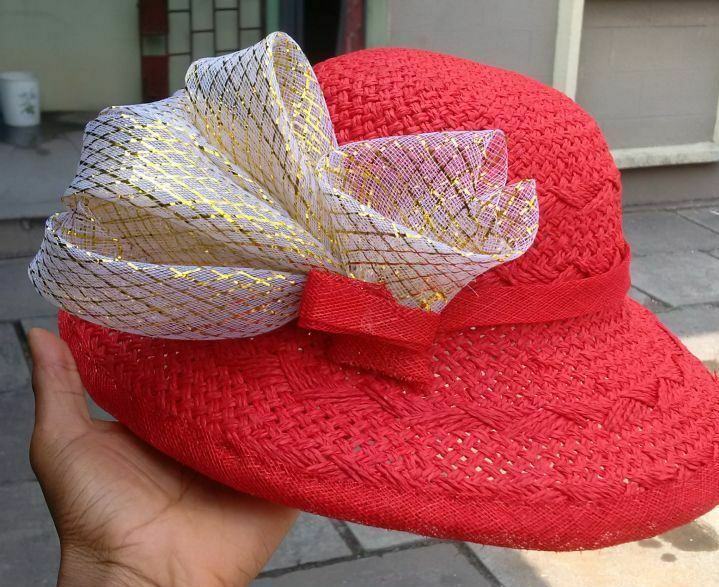 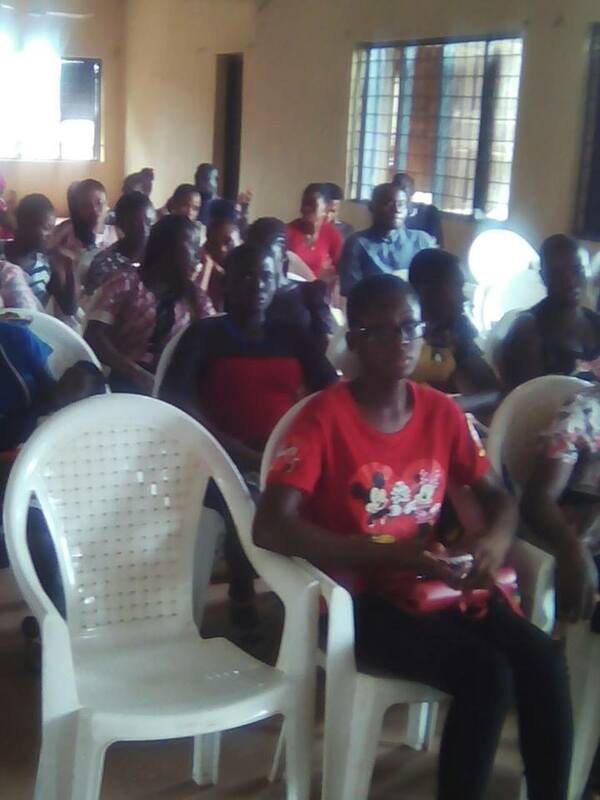 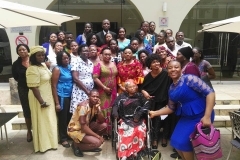 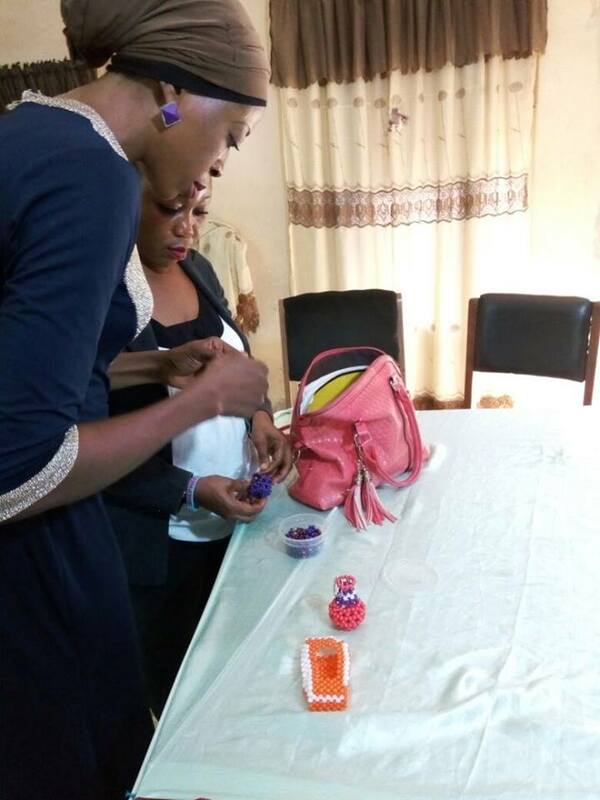 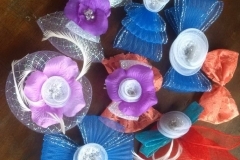 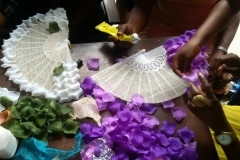 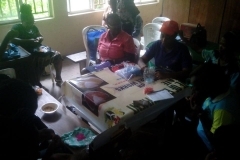 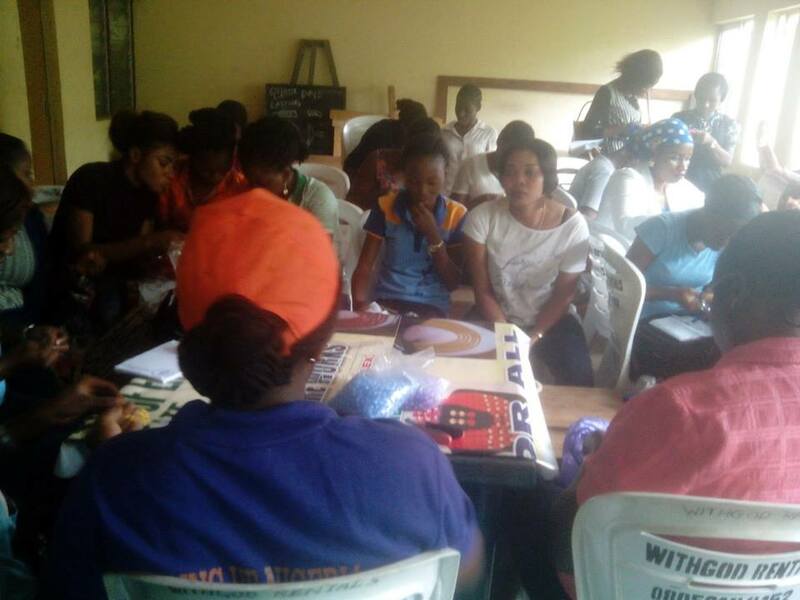 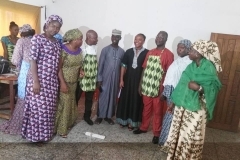 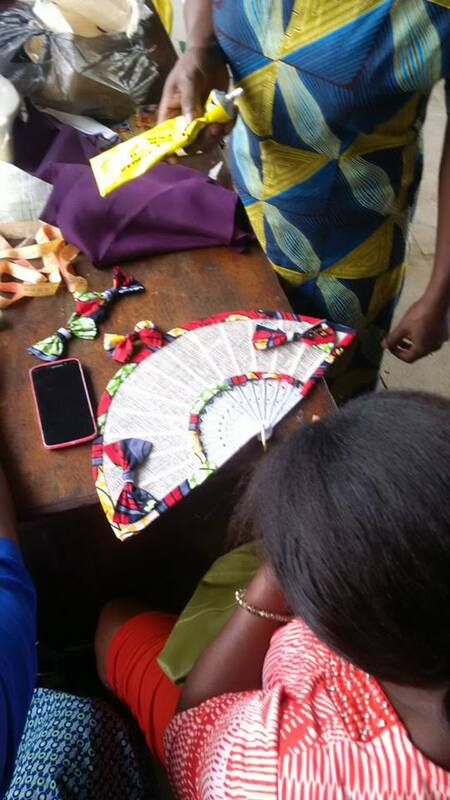 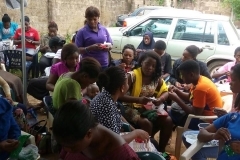 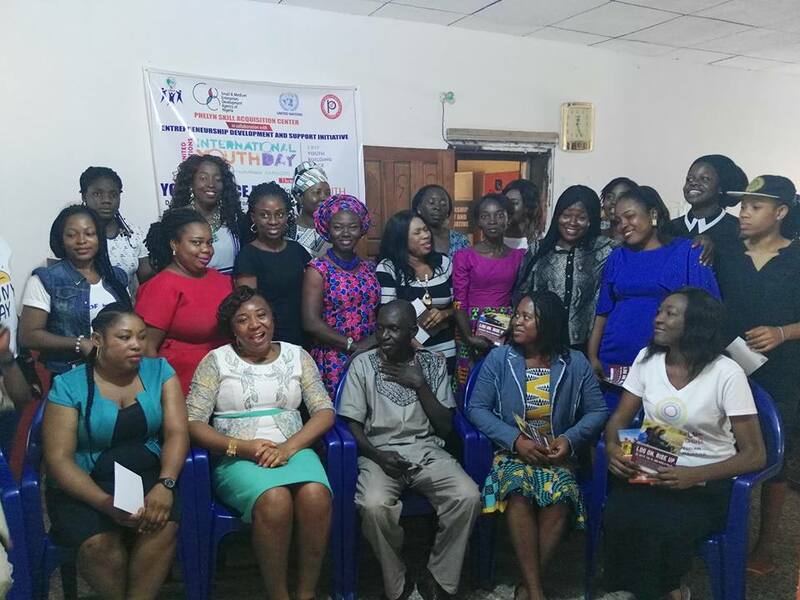 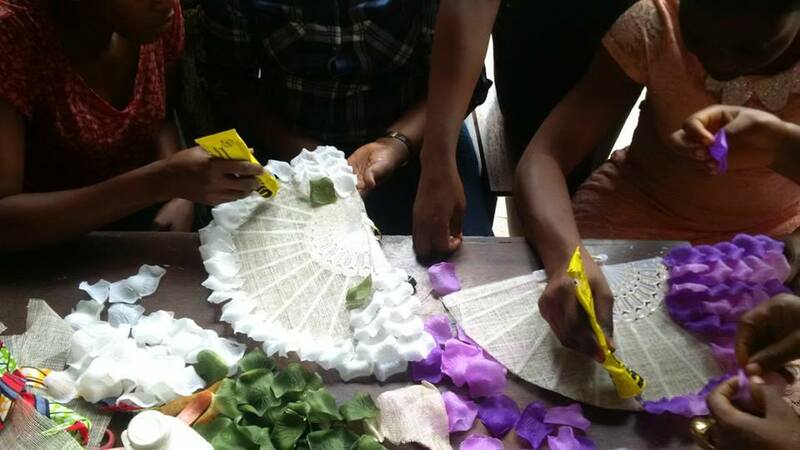 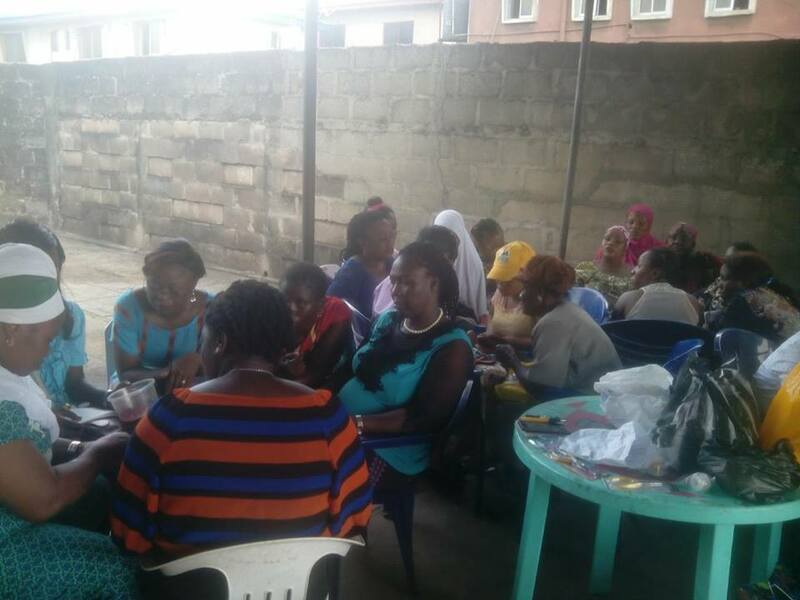 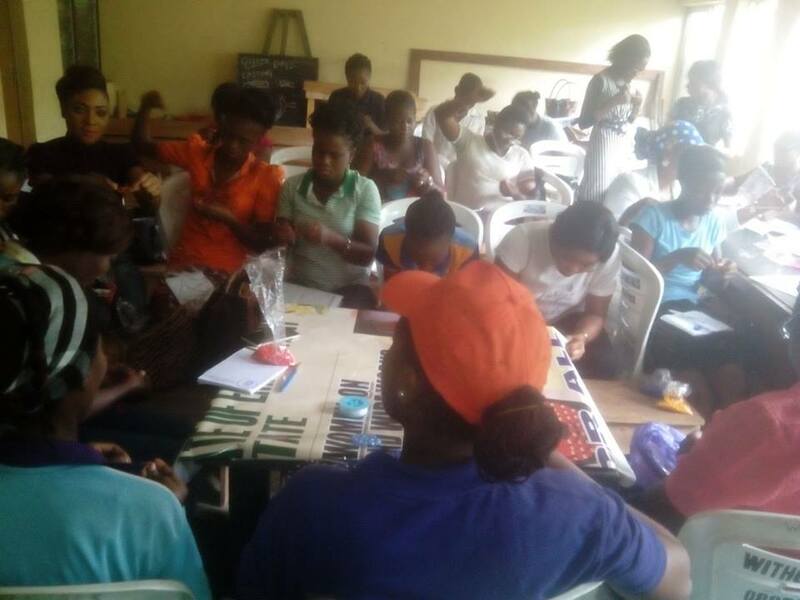 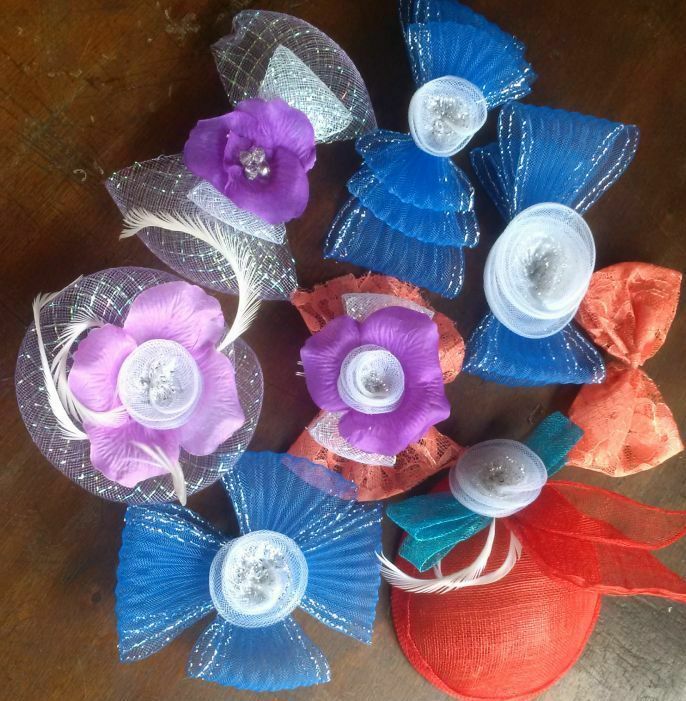 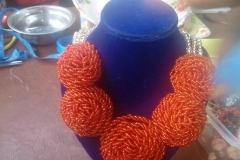 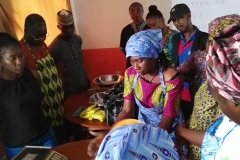 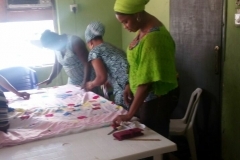 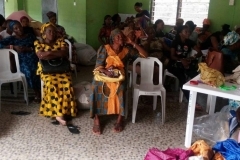 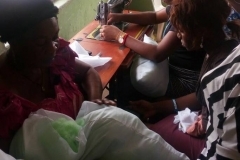 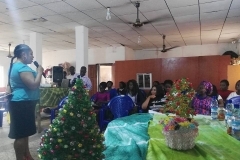 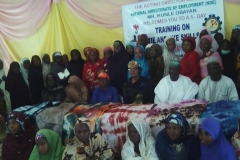 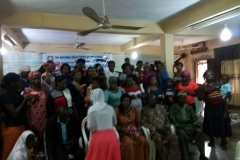 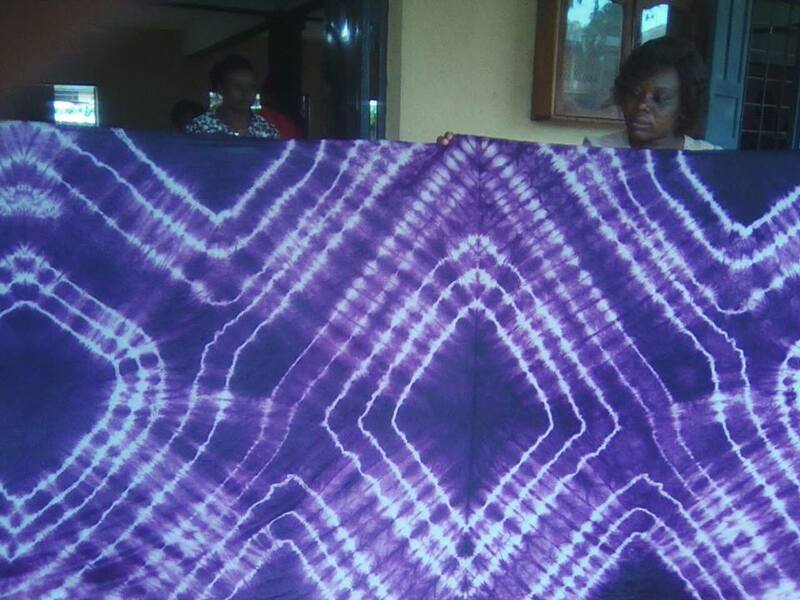 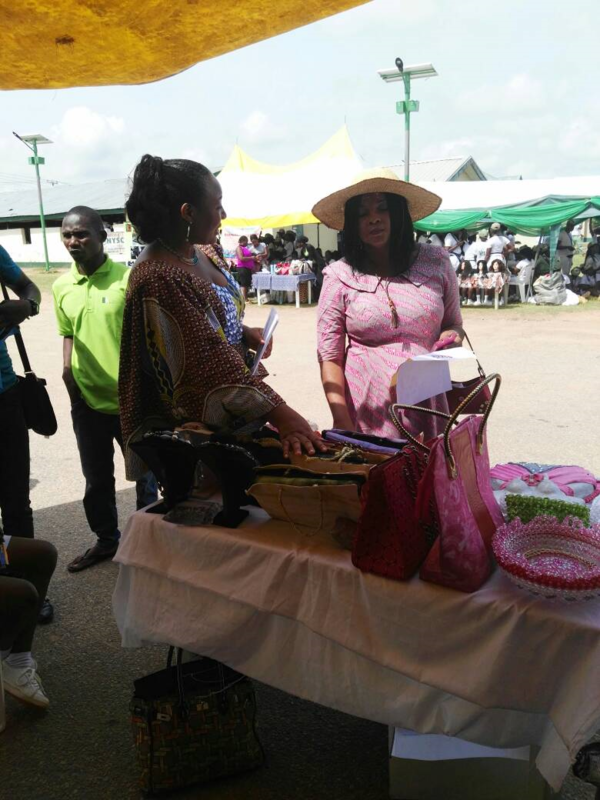 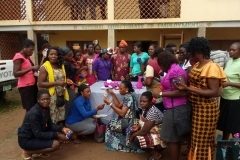 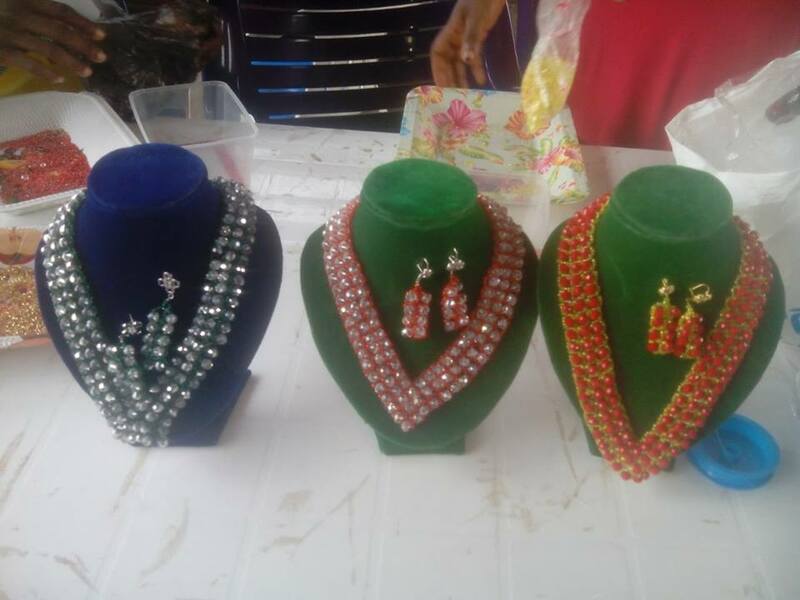 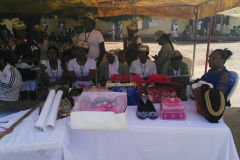 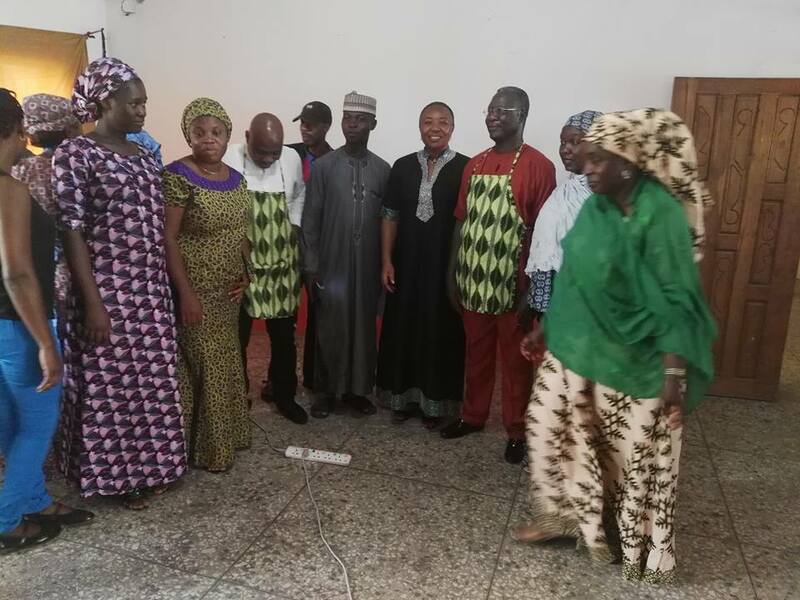 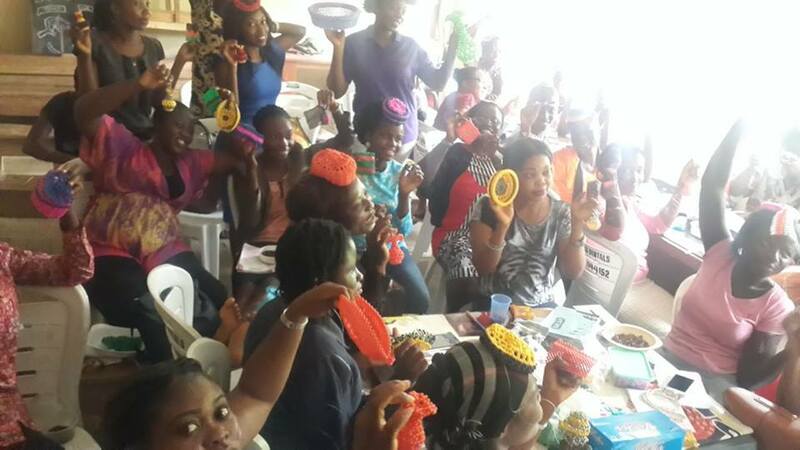 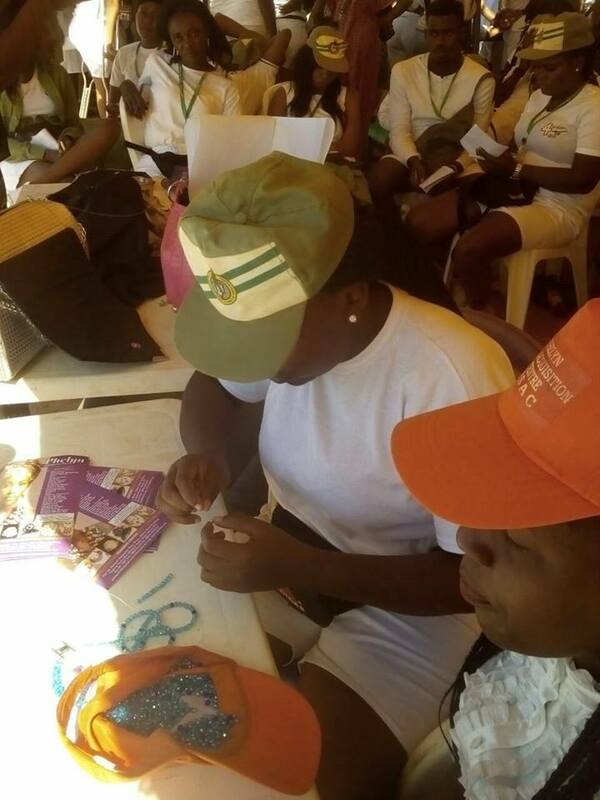 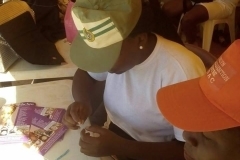 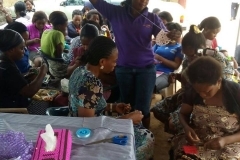 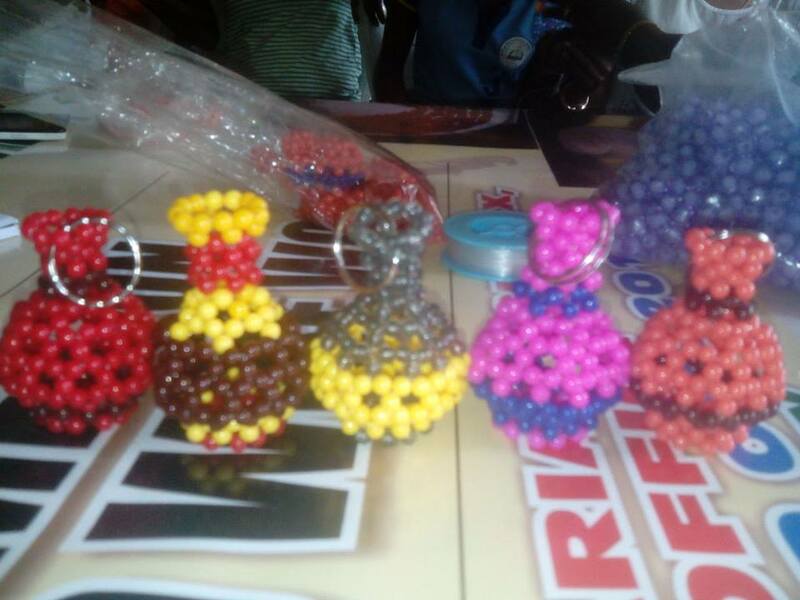 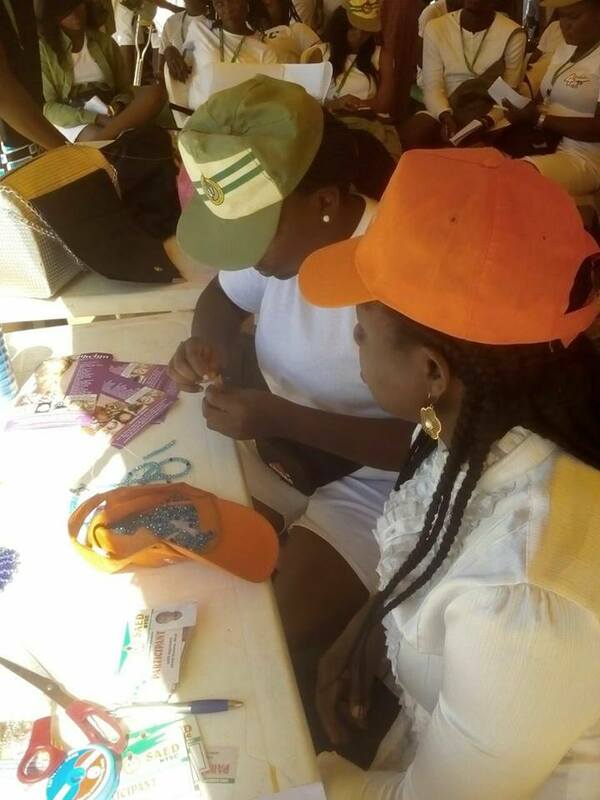 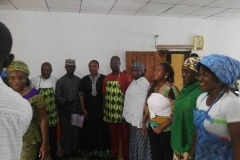 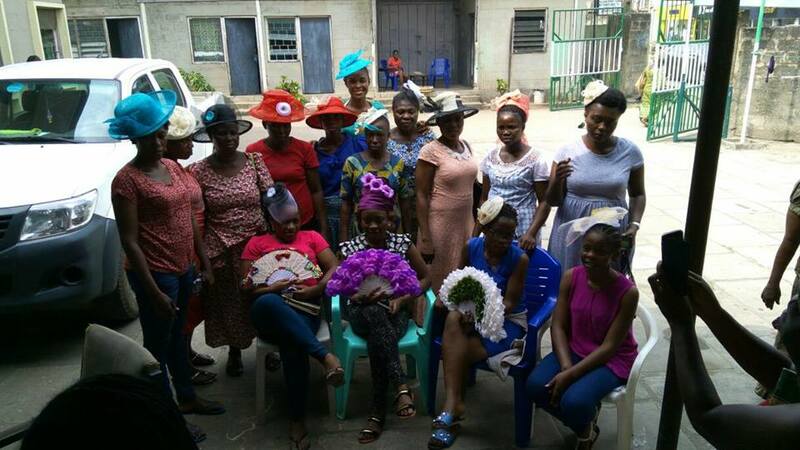 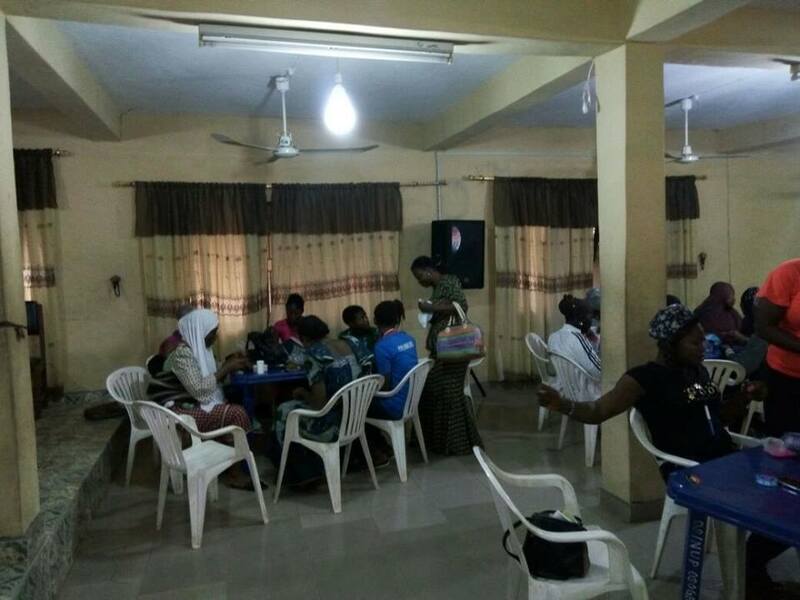 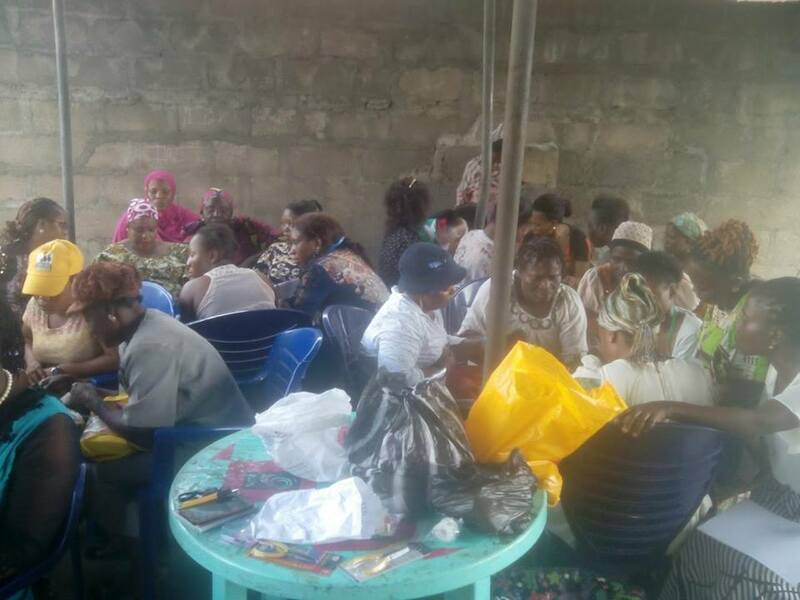 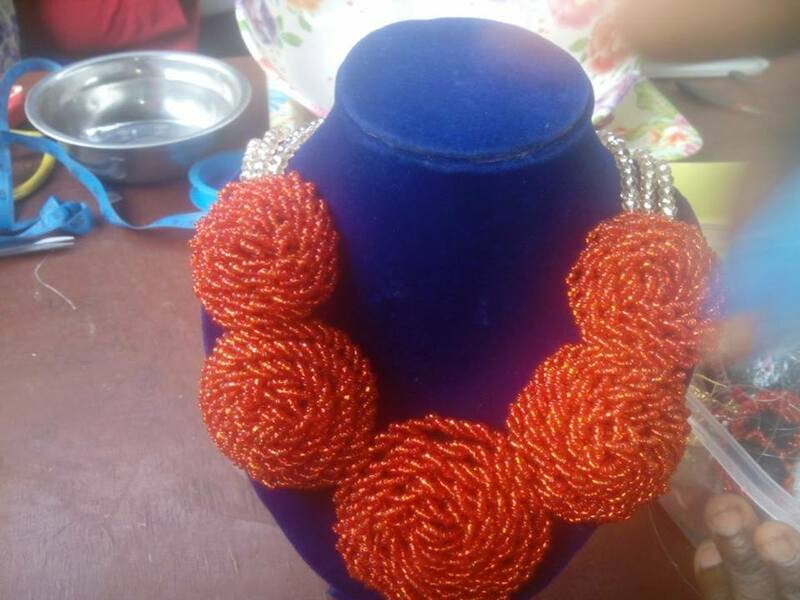 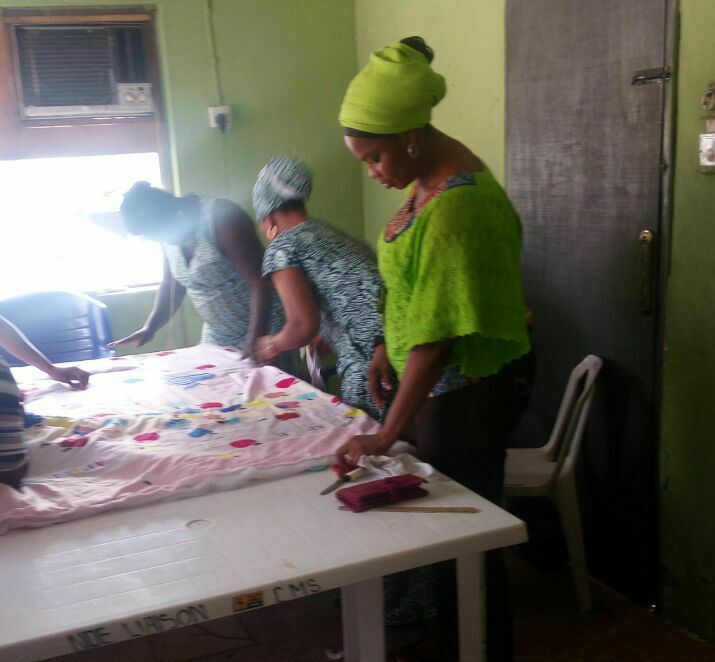 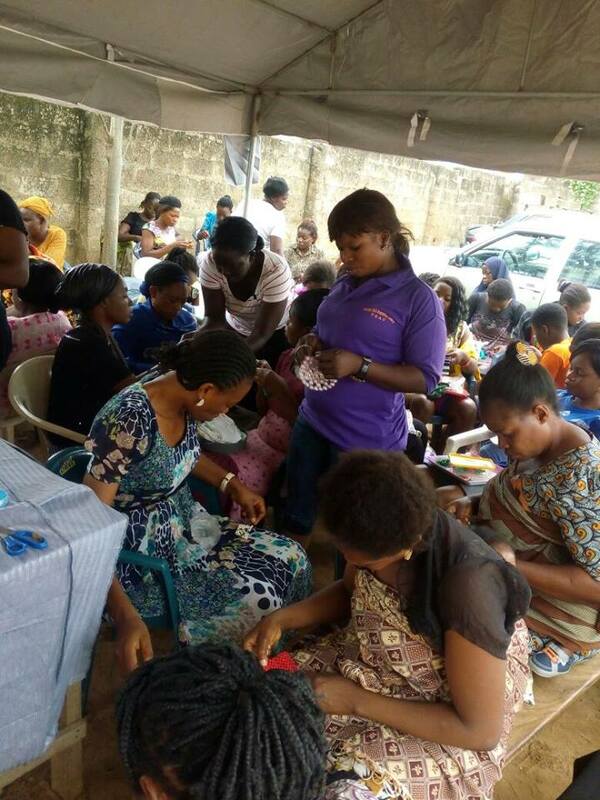 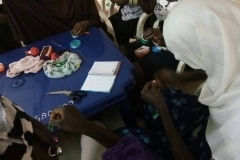 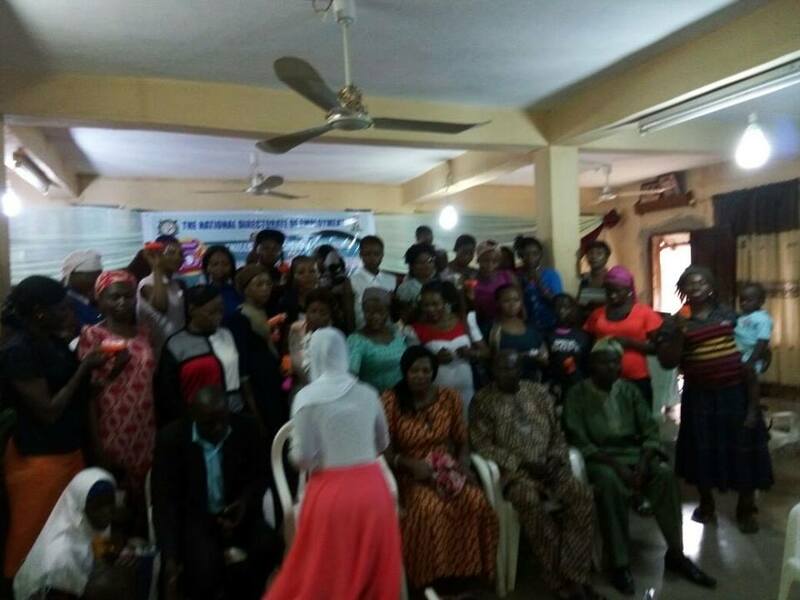 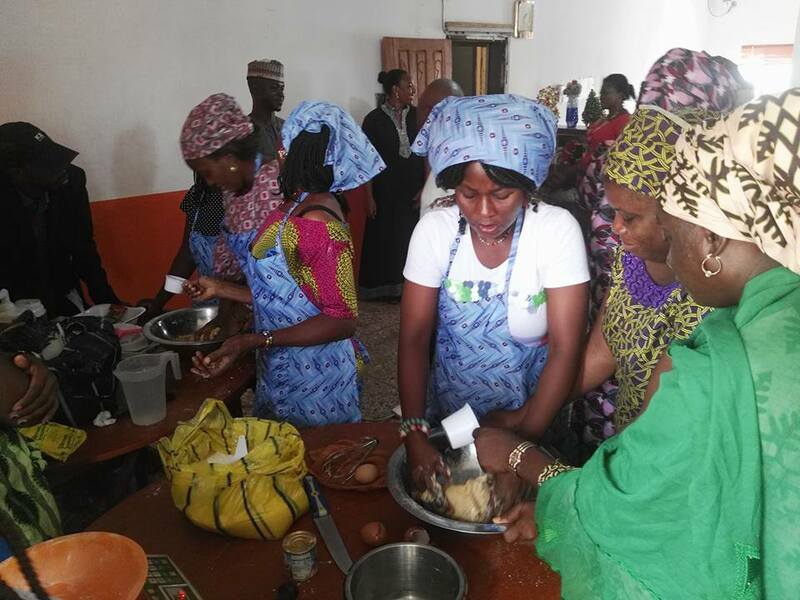 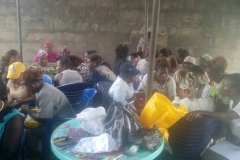 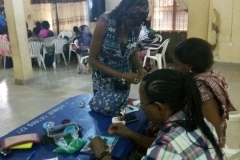 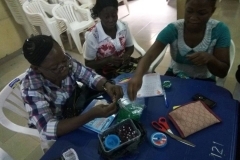 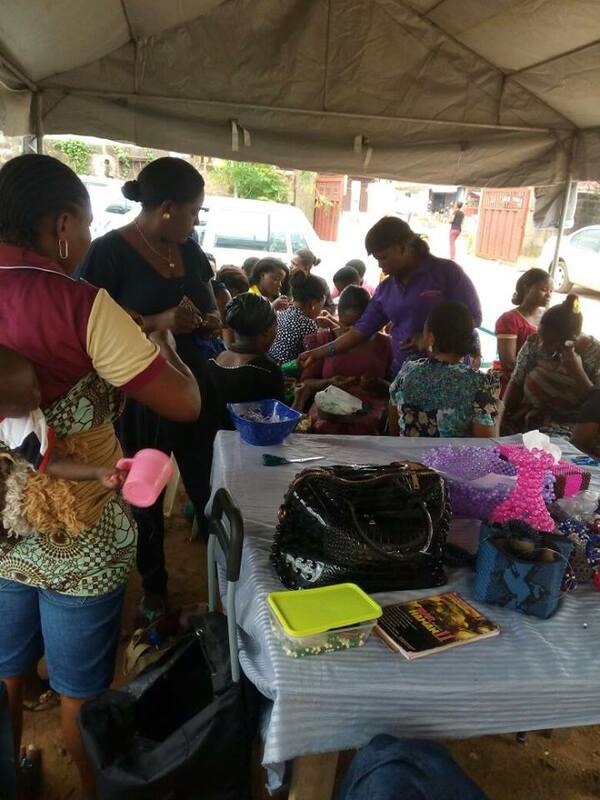 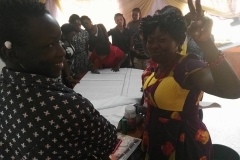 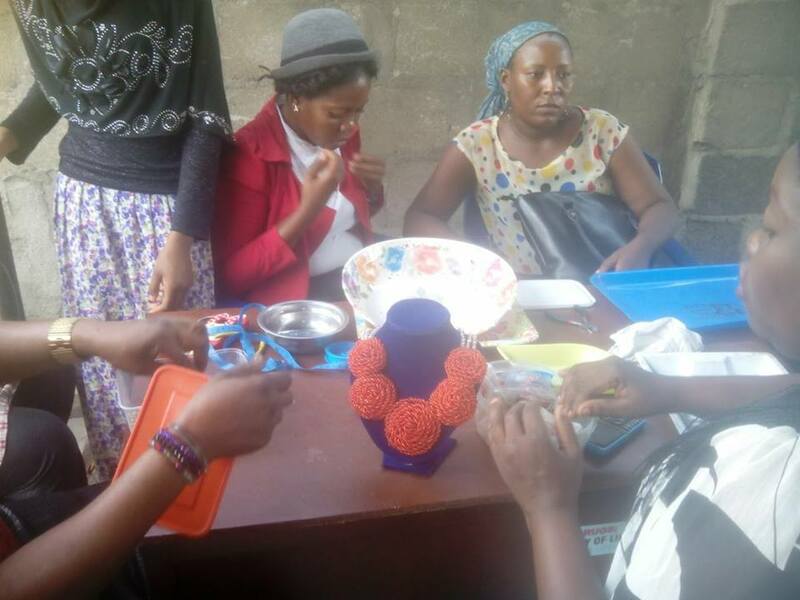 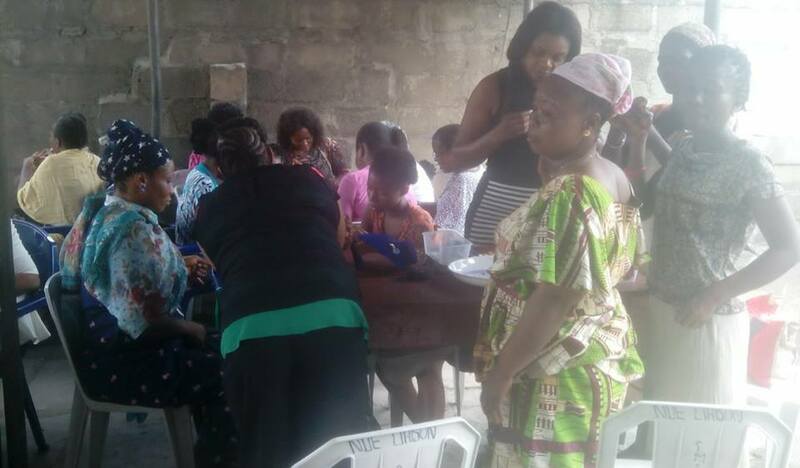 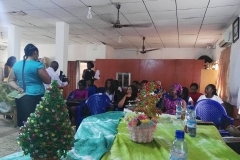 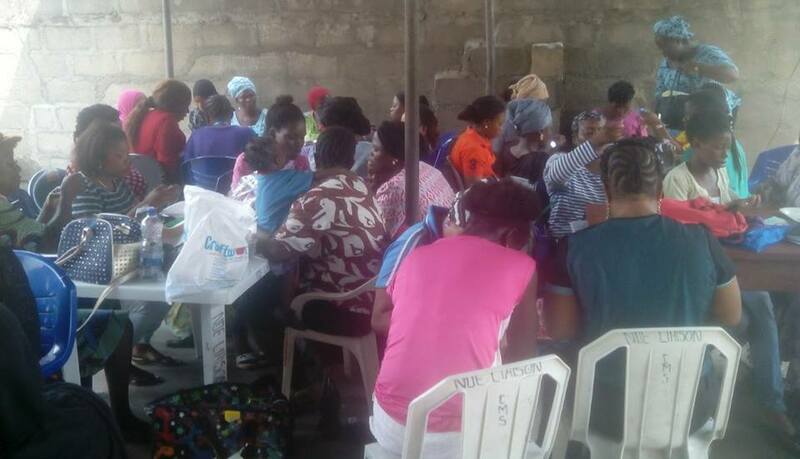 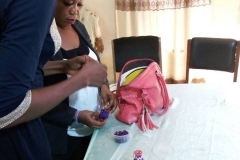 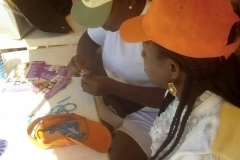 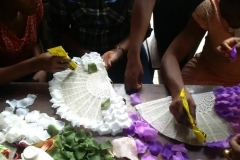 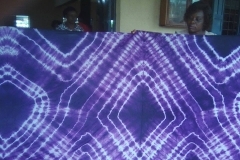 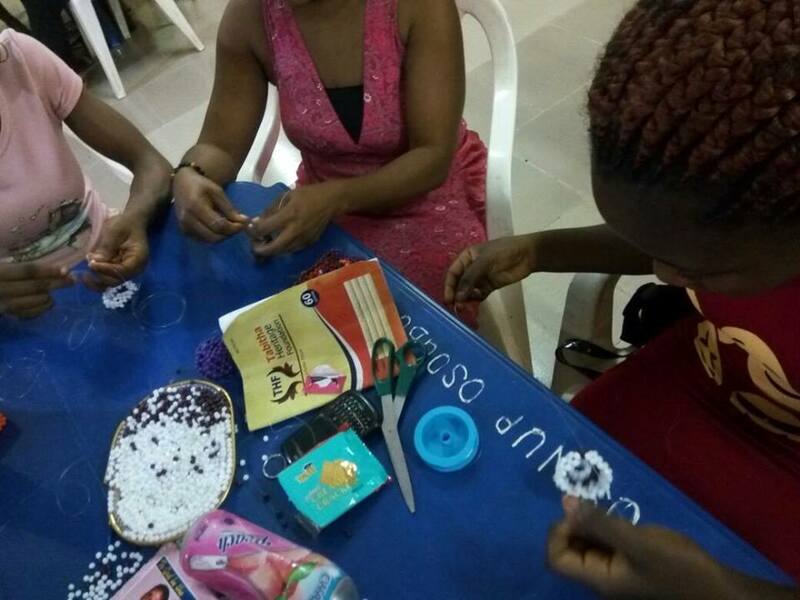 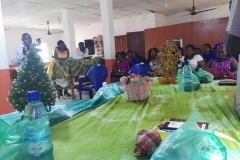 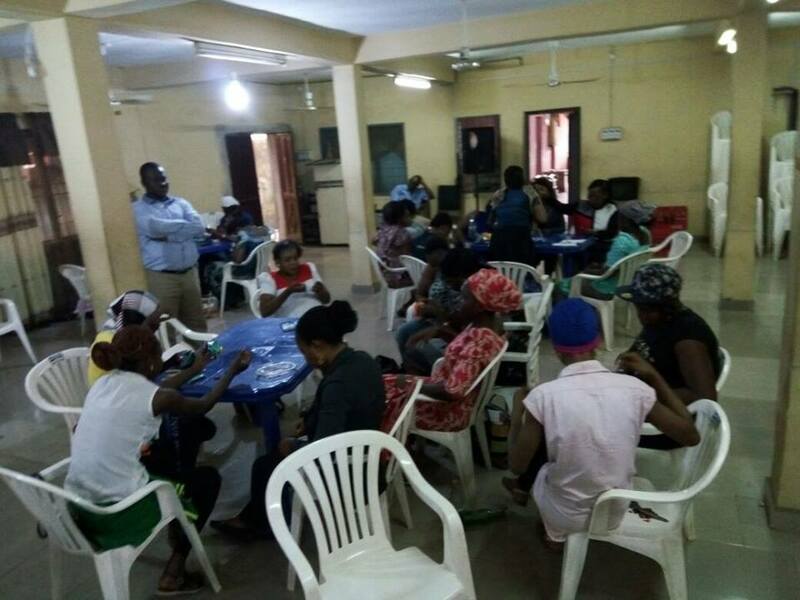 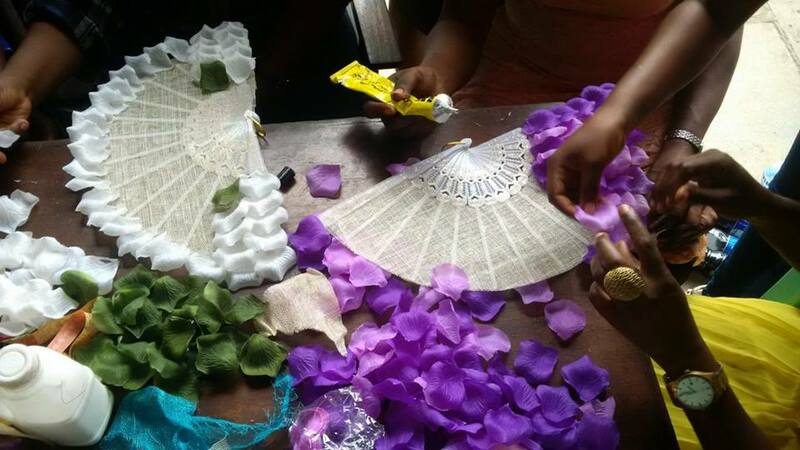 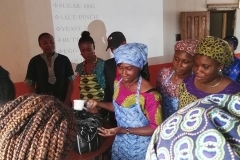 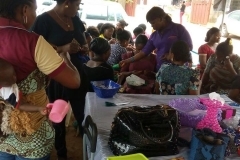 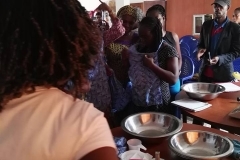 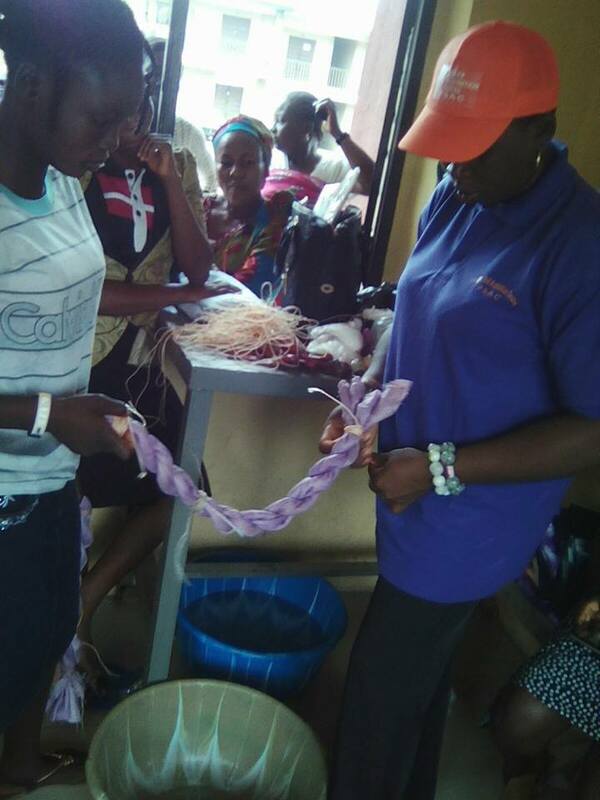 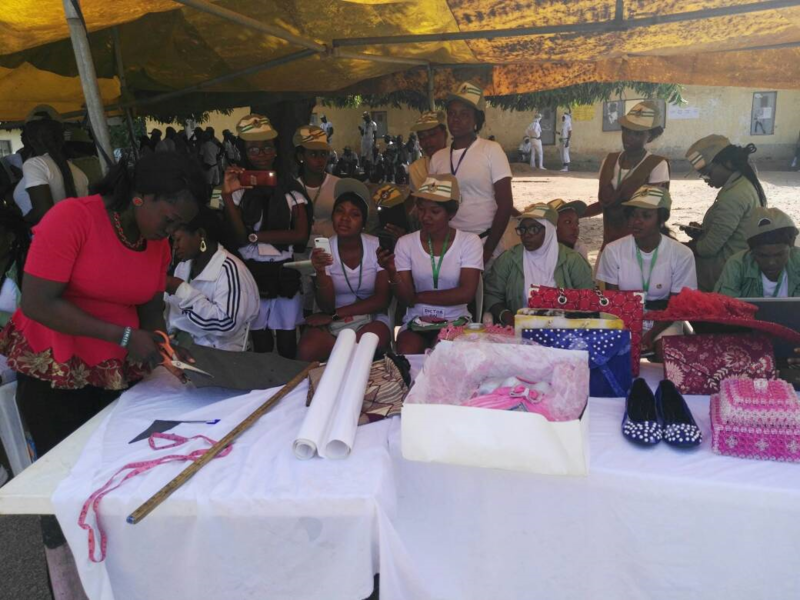 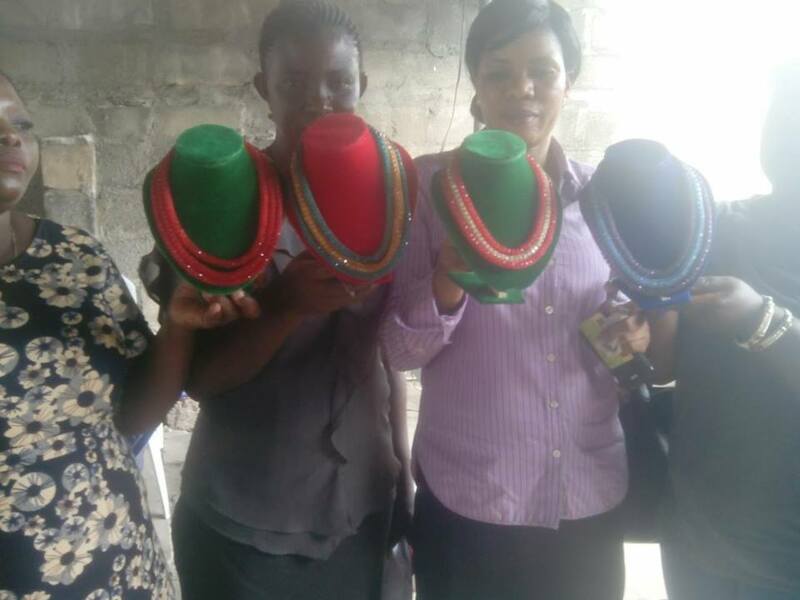 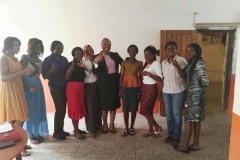 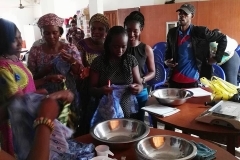 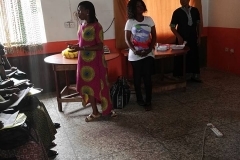 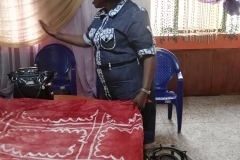 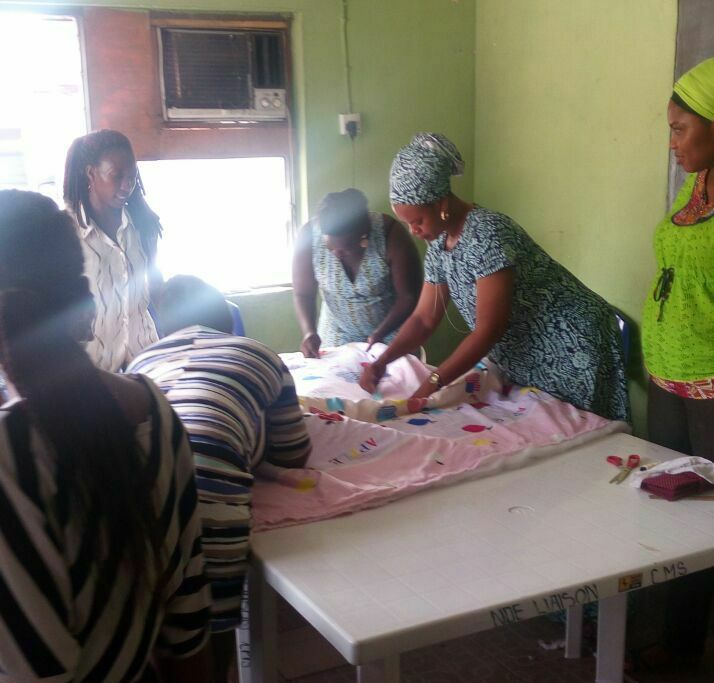 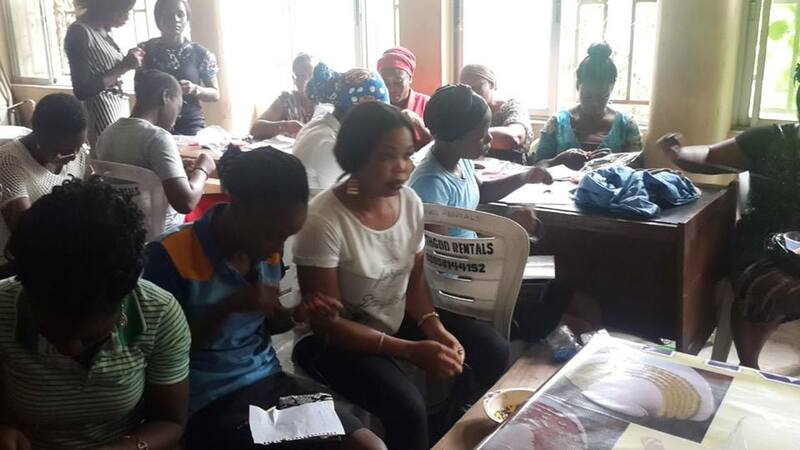 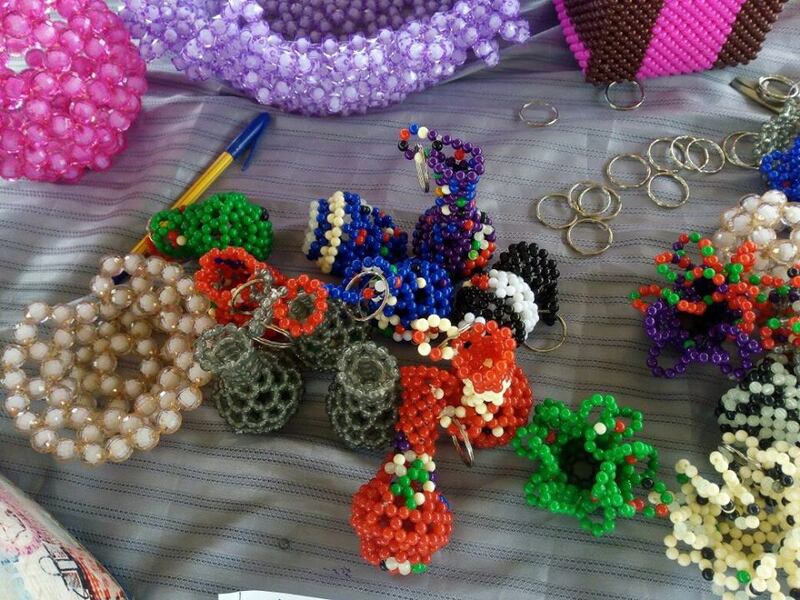 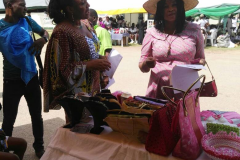 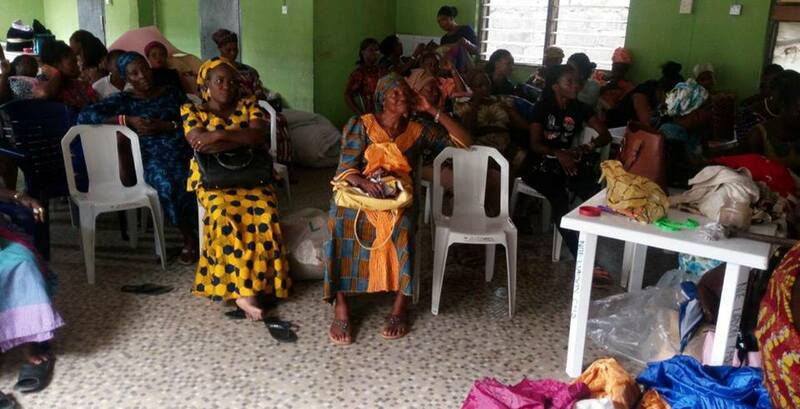 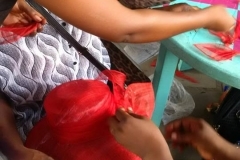 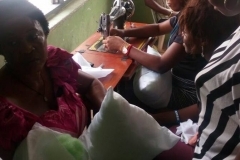 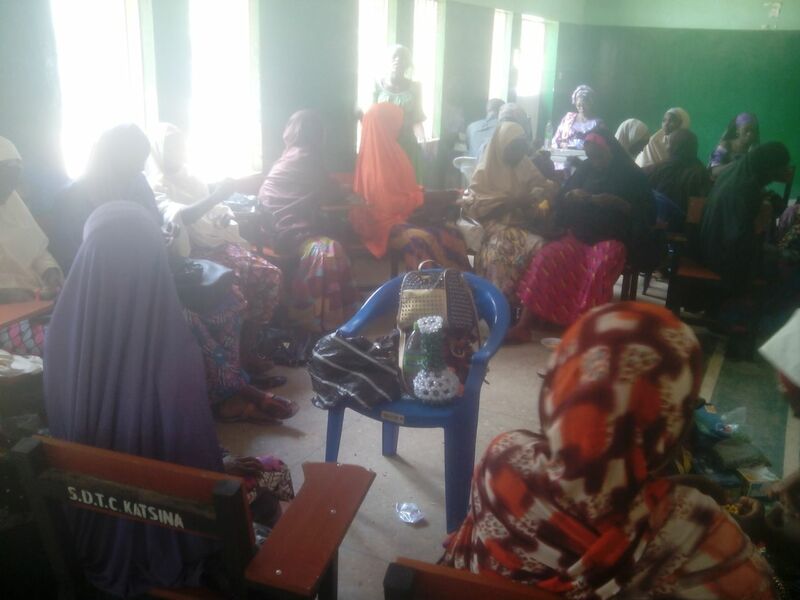 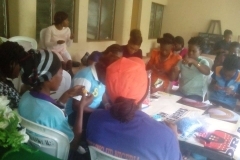 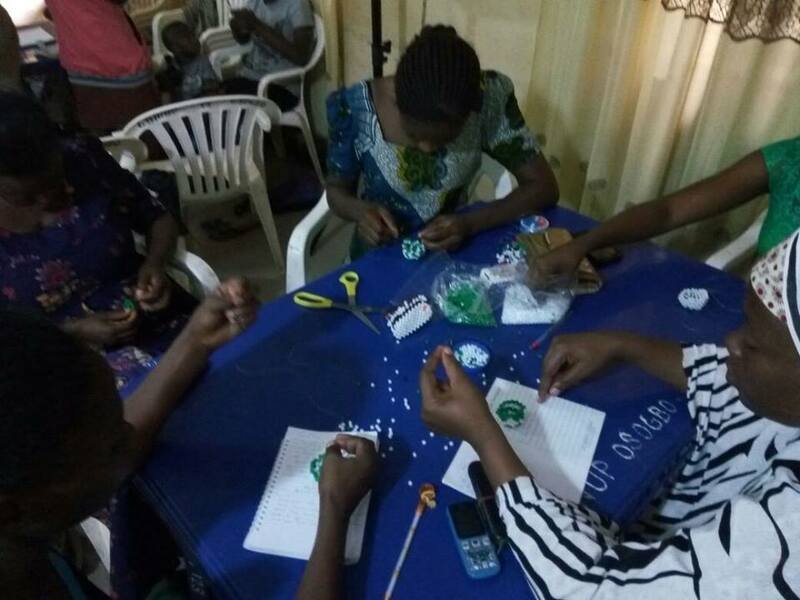 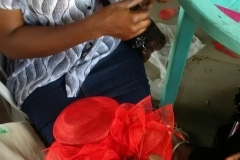 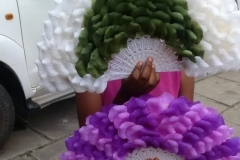 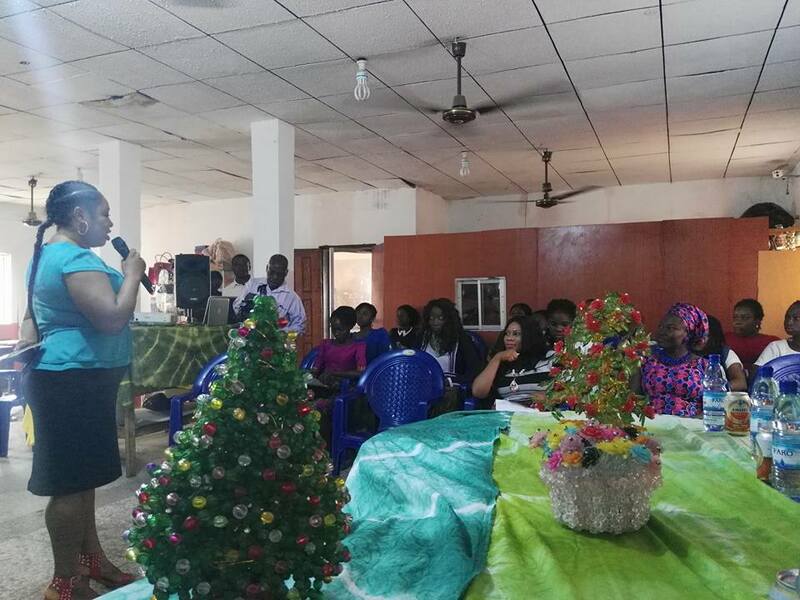 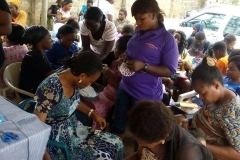 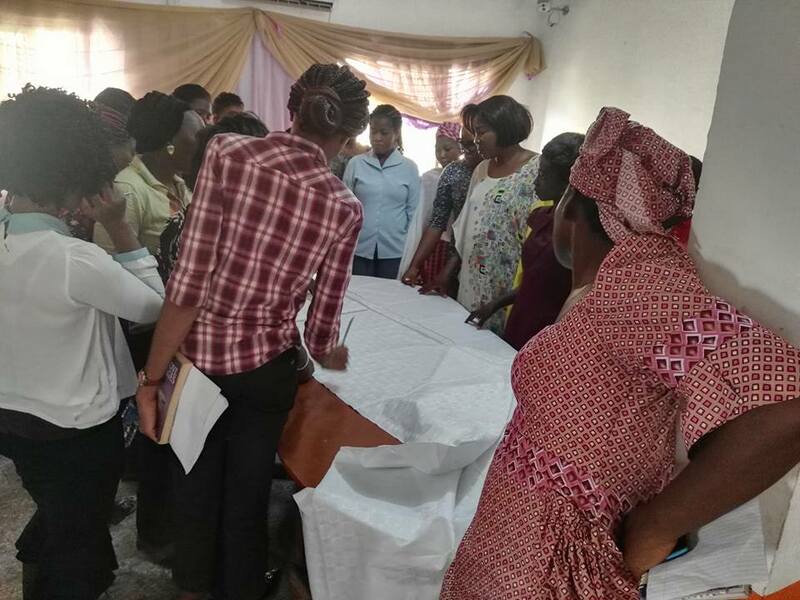 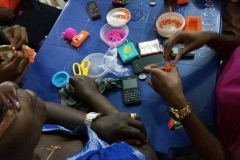 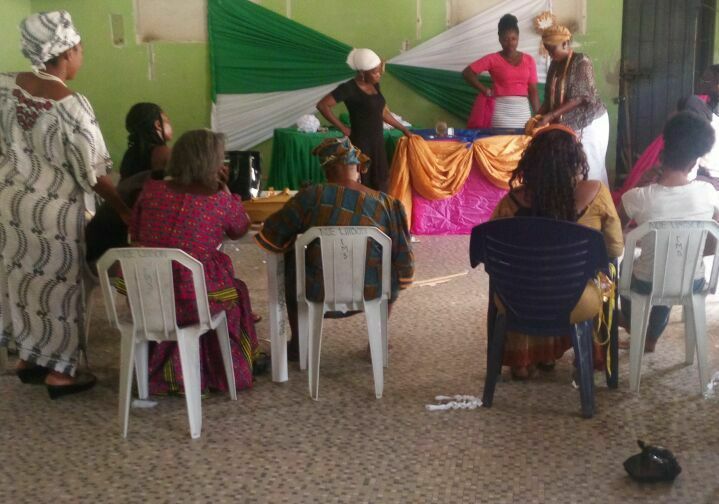 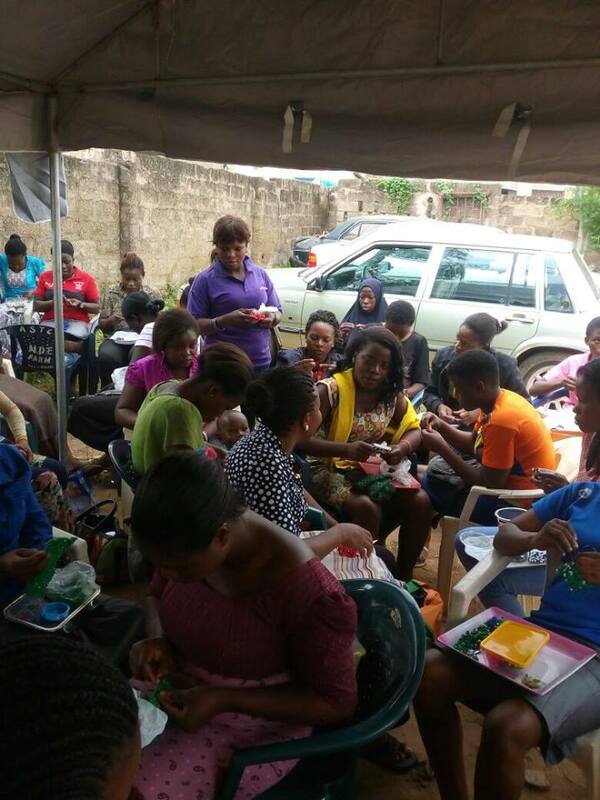 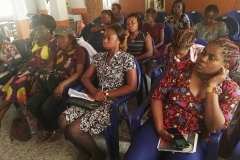 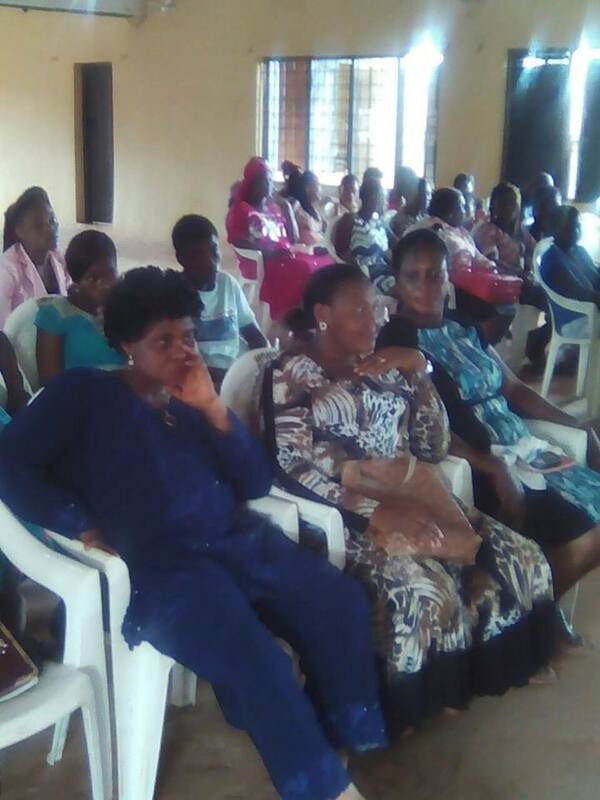 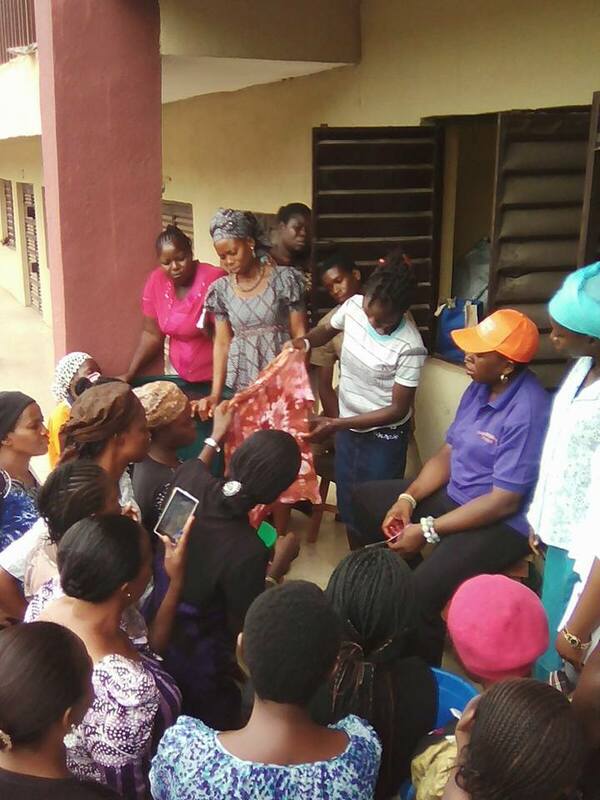 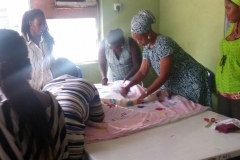 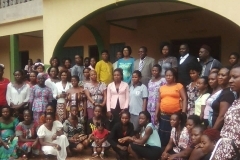 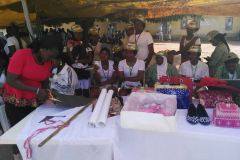 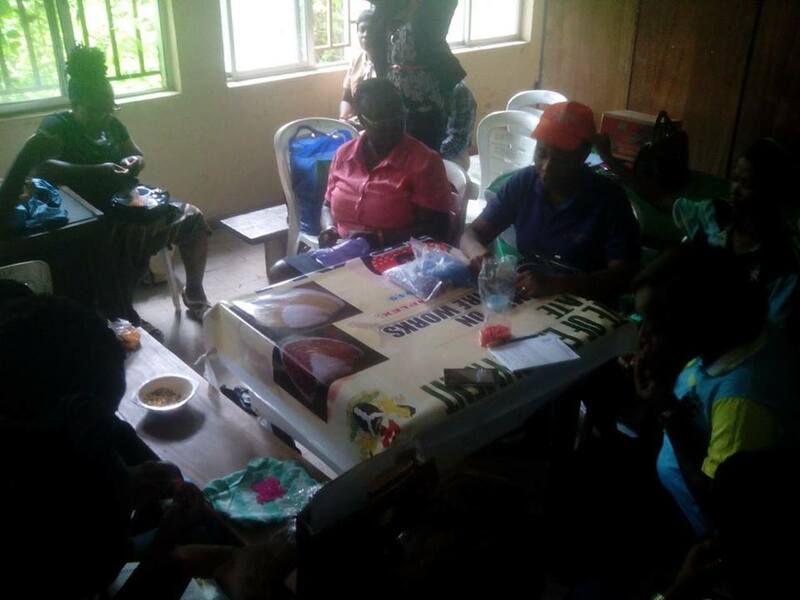 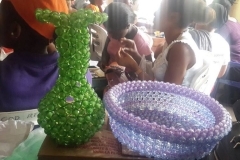 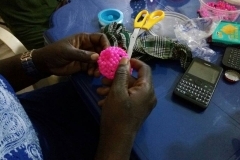 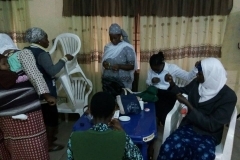 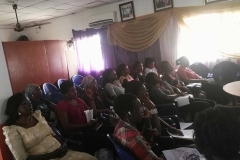 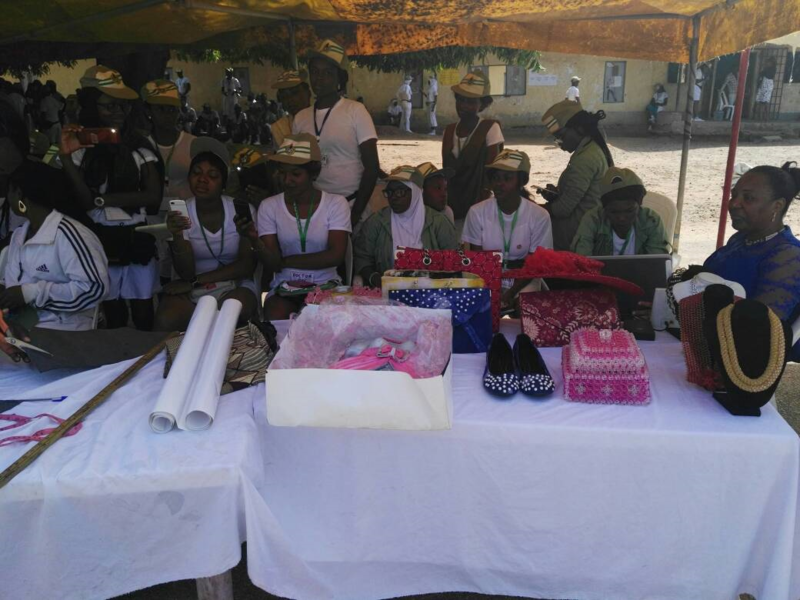 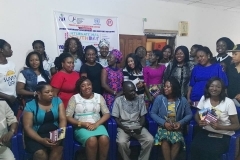 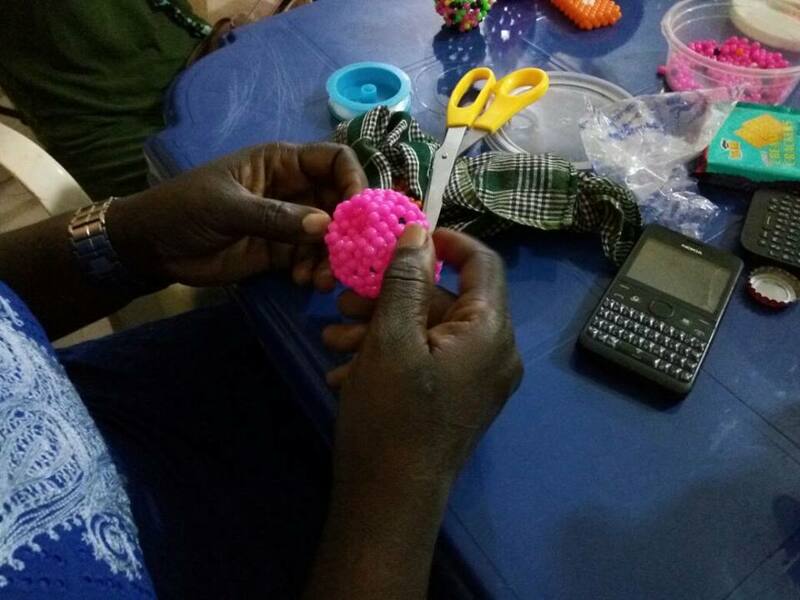 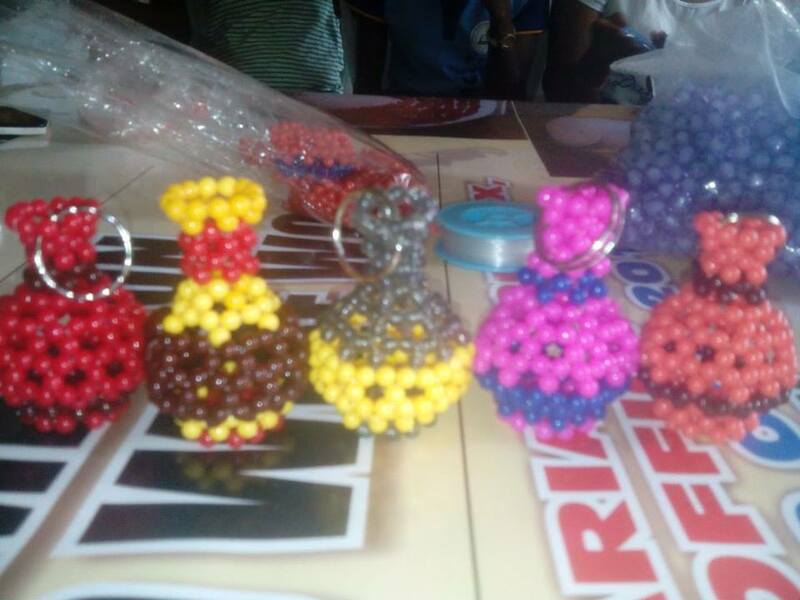 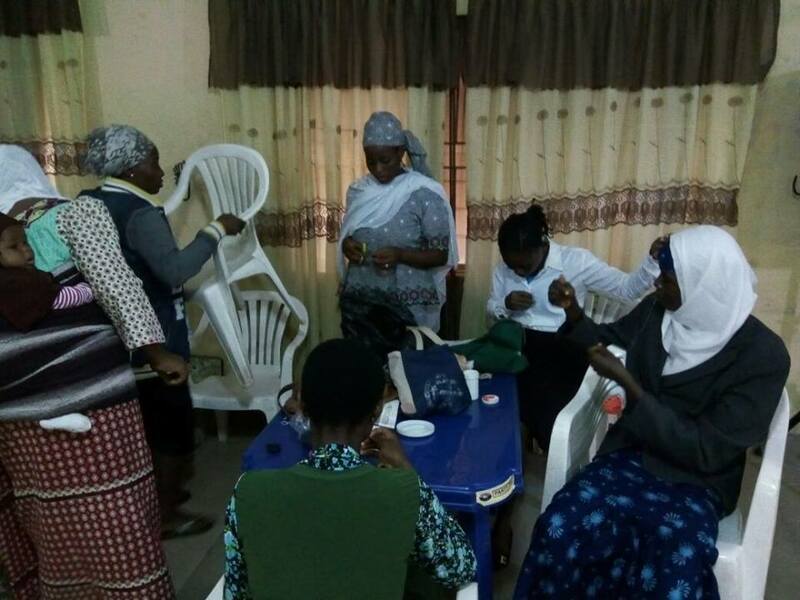 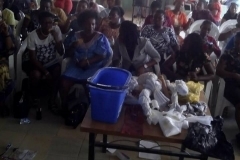 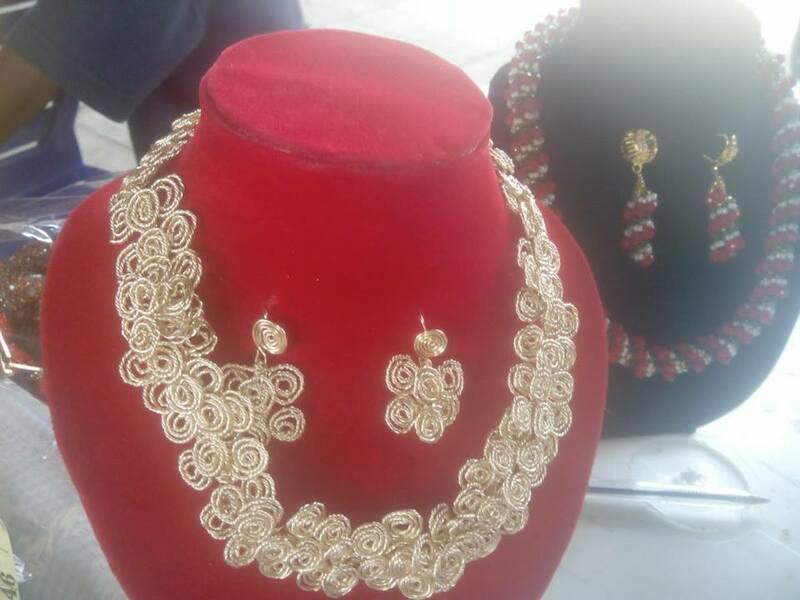 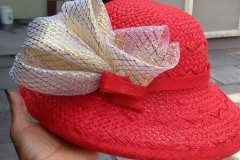 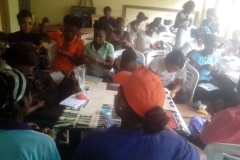 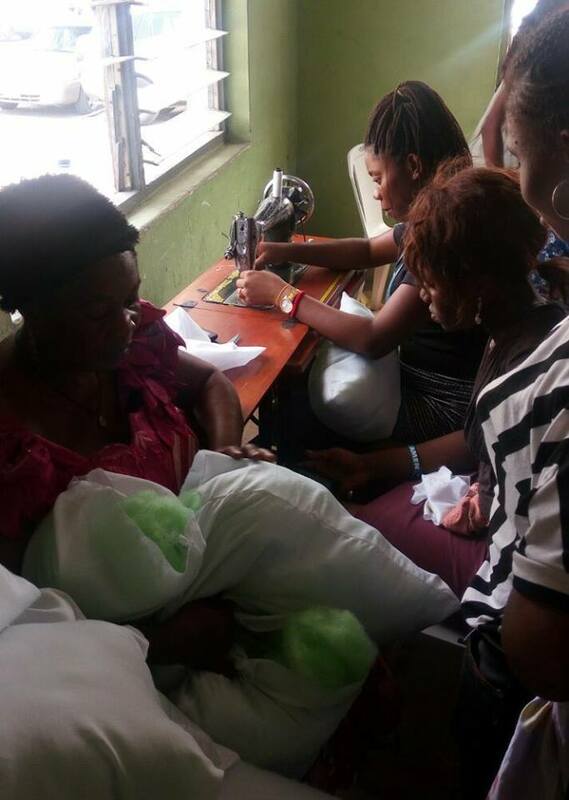 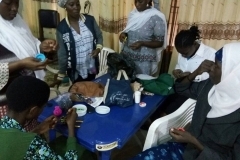 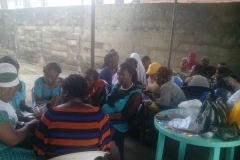 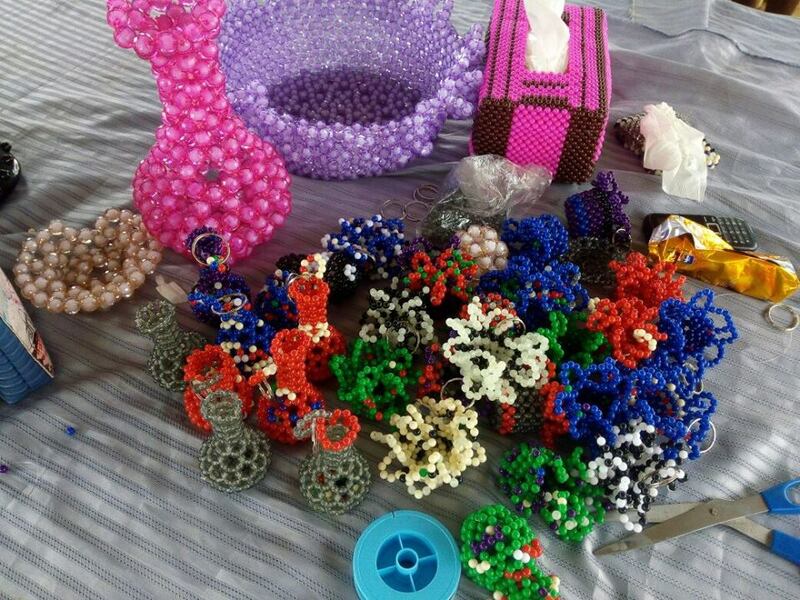 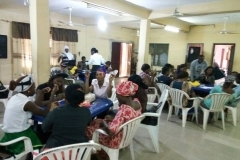 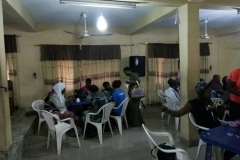 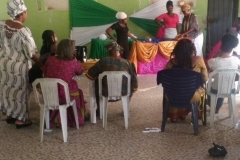 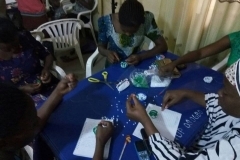 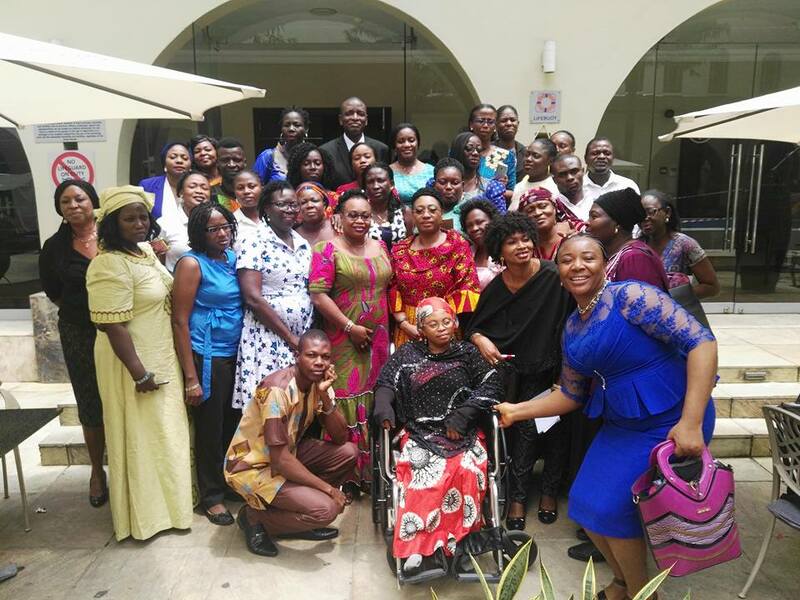 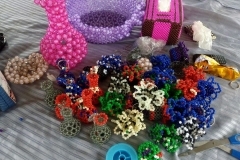 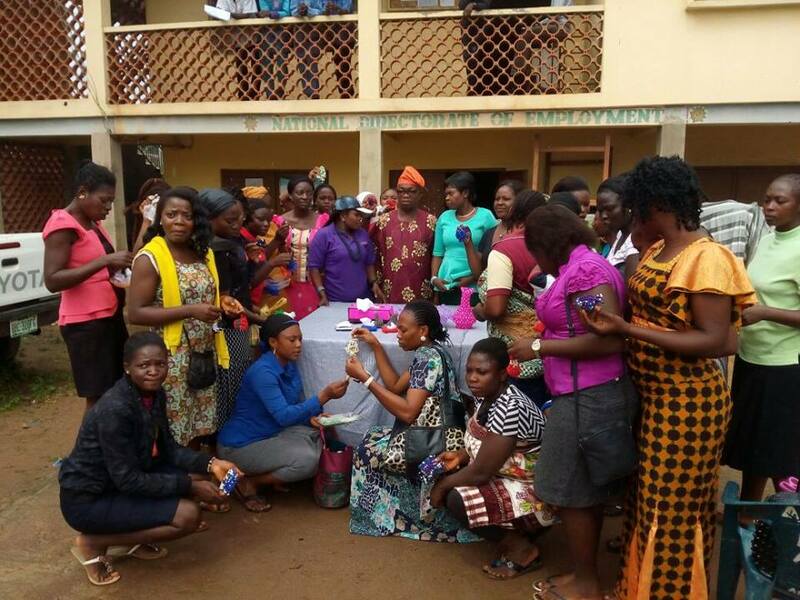 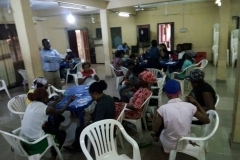 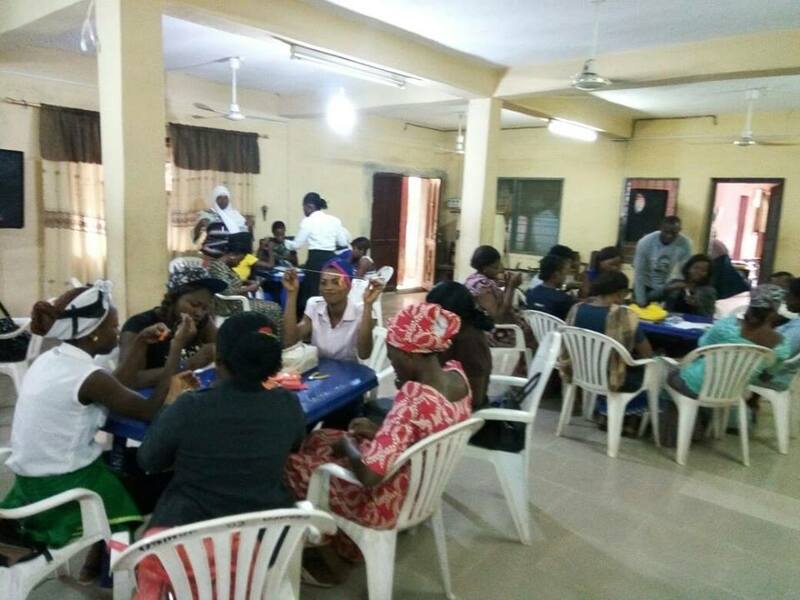 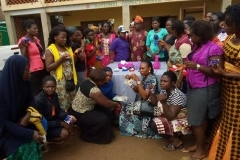 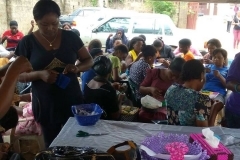 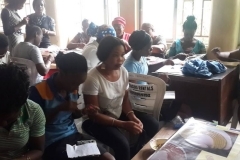 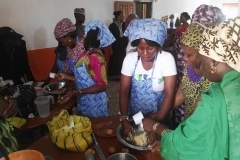 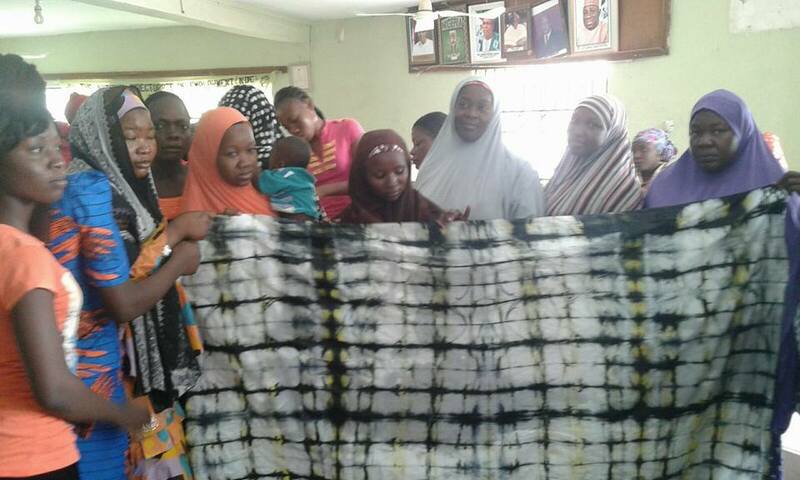 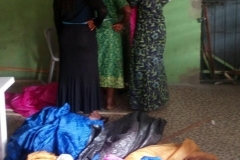 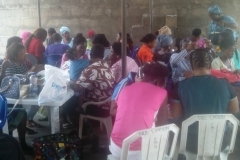 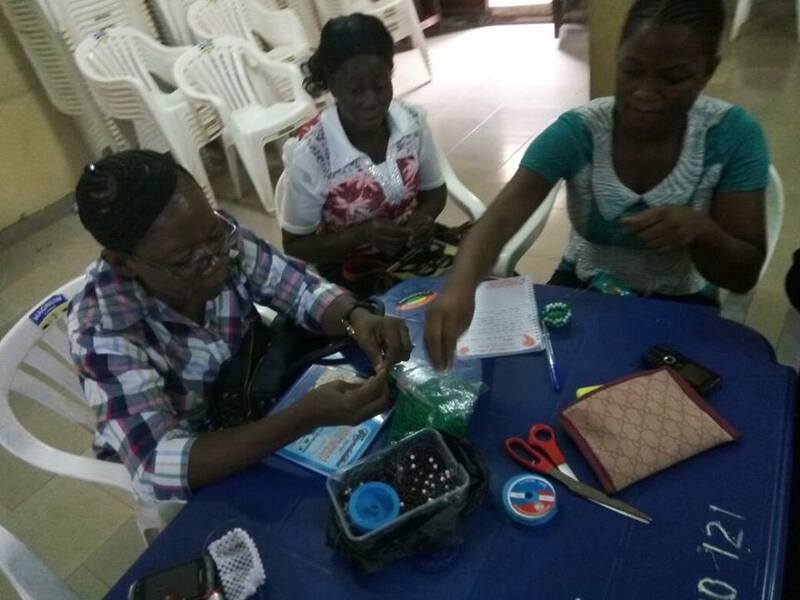 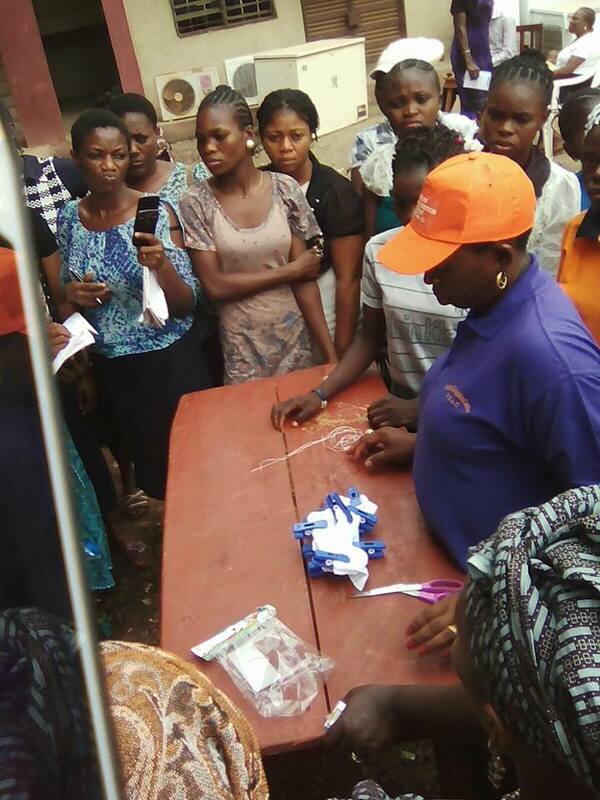 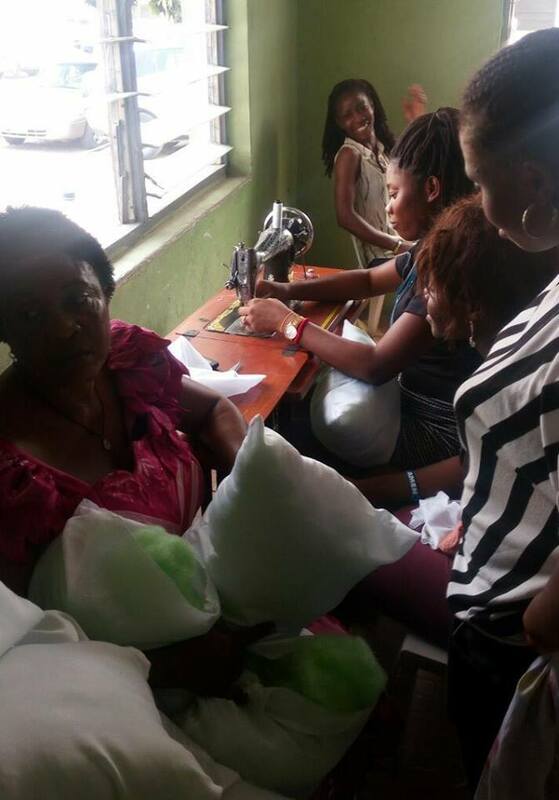 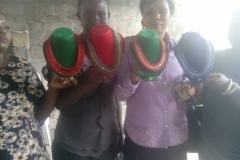 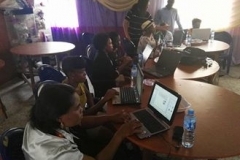 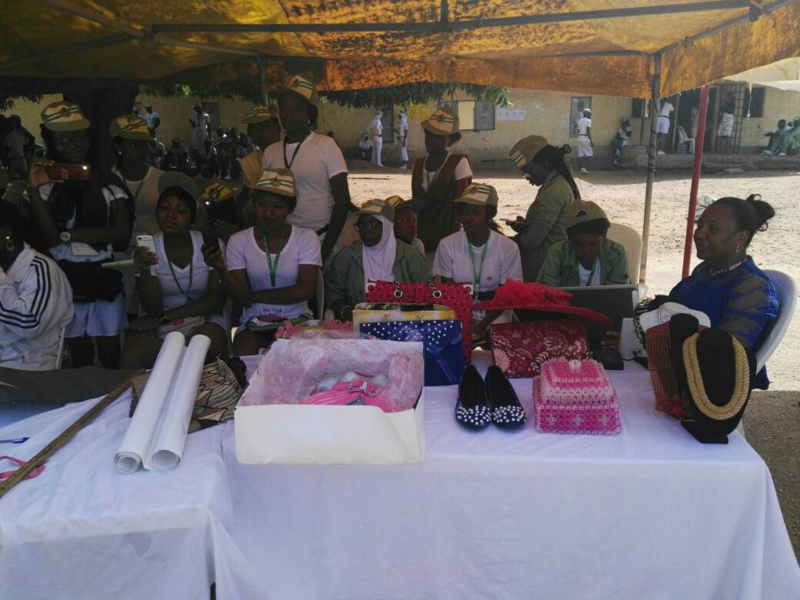 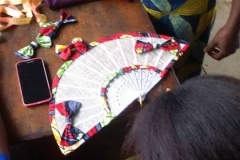 50 Women were trained on Craft in Osun State starting on the 18th July, 2016. 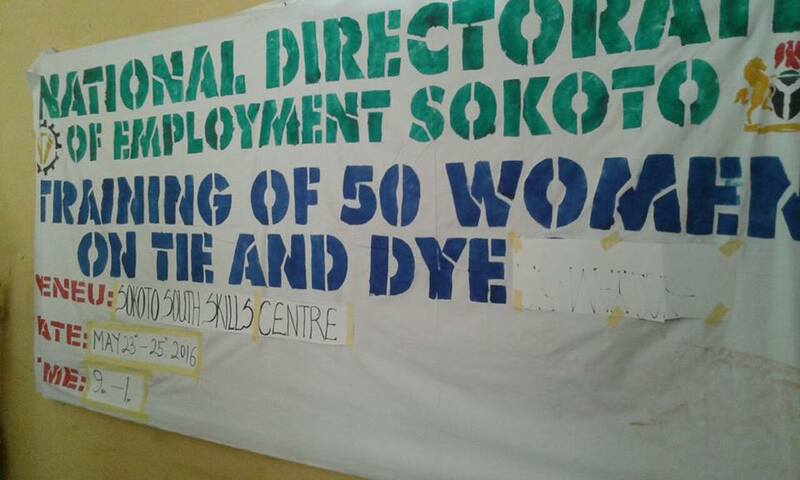 This is targeted at reducing unemployment and poverty. 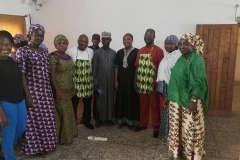 Thanks to NDE and Osun People for the warmth welcome given to us. 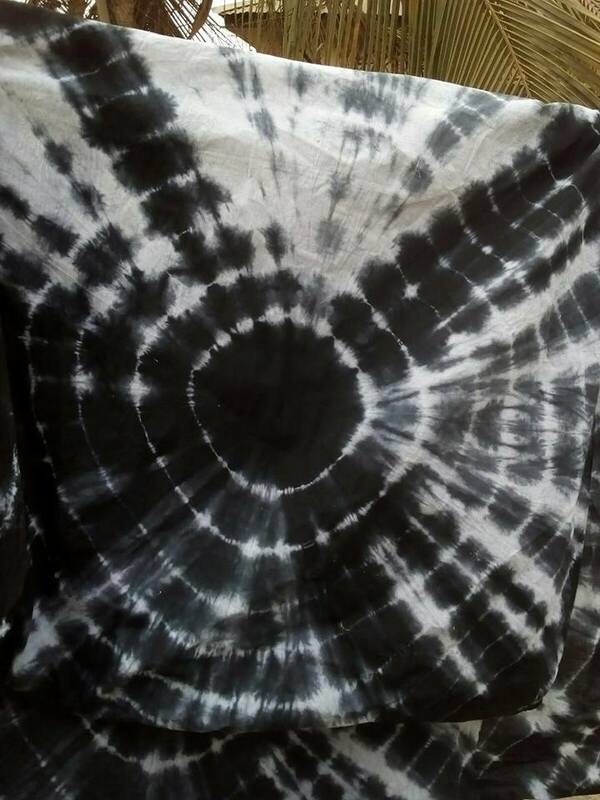 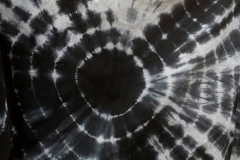 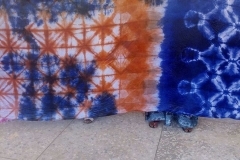 This time, we didn’t teach tie and dye as usual, rather, we thought them craft work. 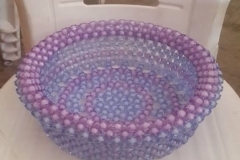 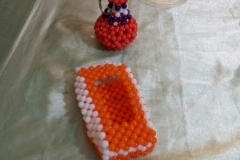 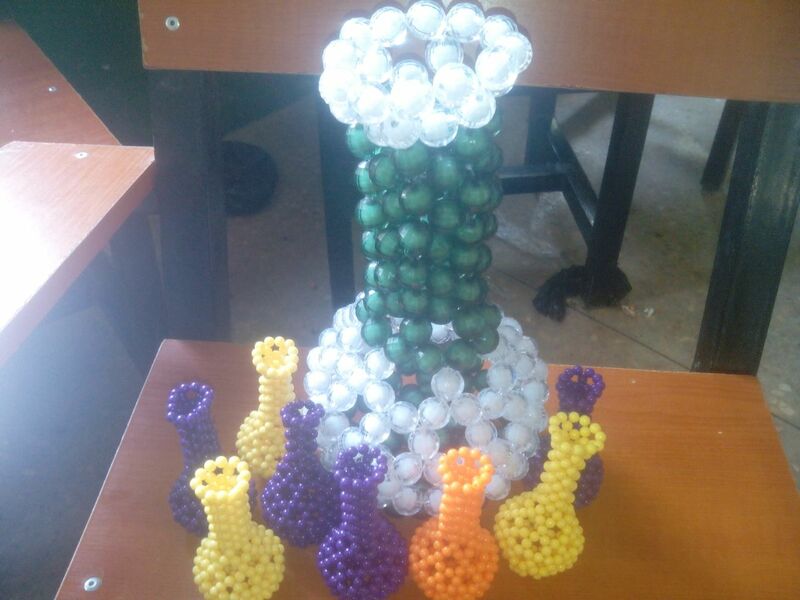 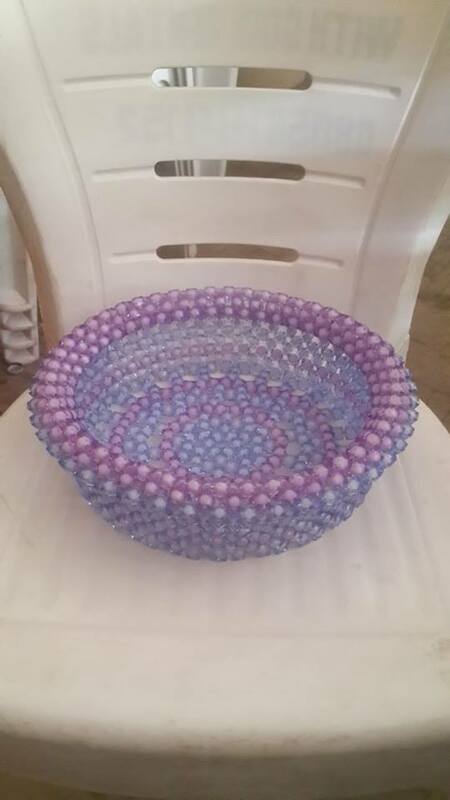 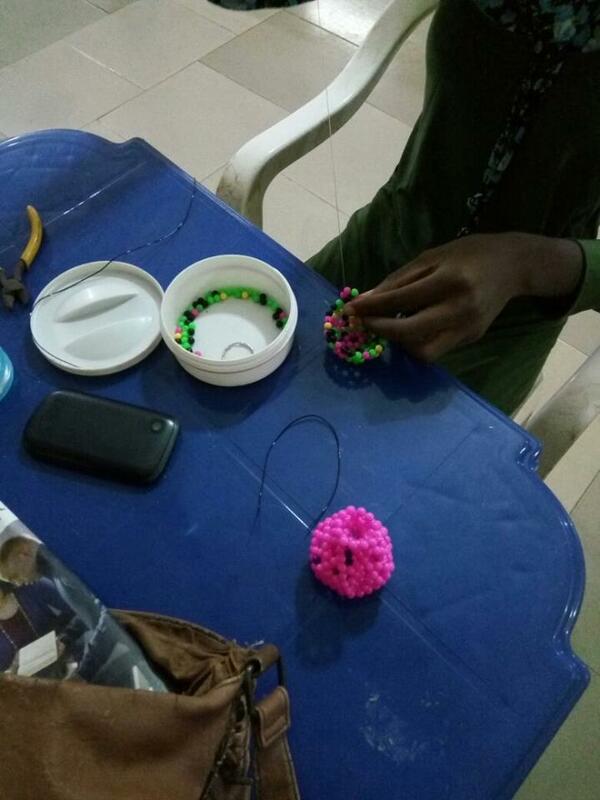 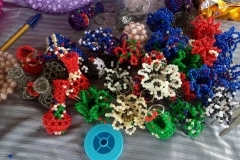 Pictures of craft works are shown below; Flower verse, bowl and tissue holder. 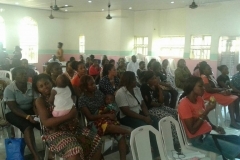 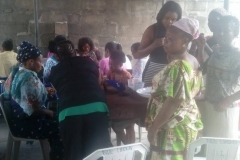 Average number of 50 women were in attendance. 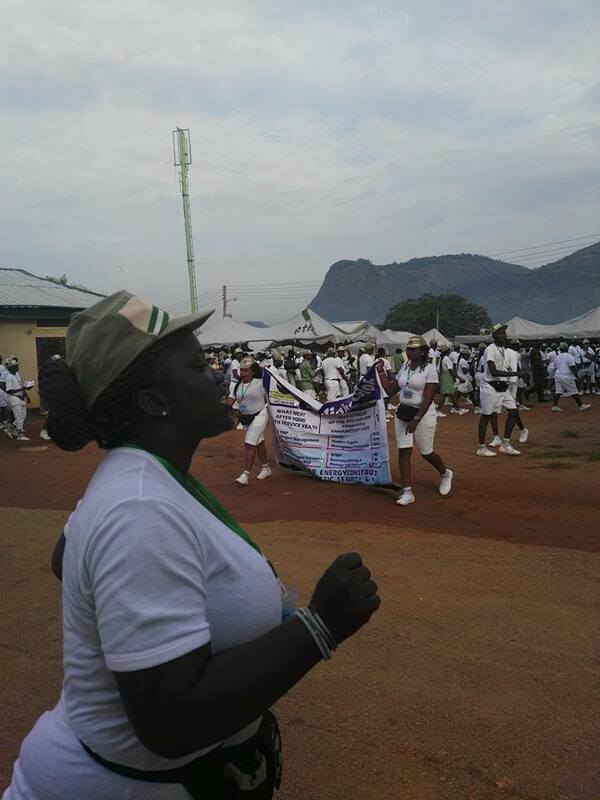 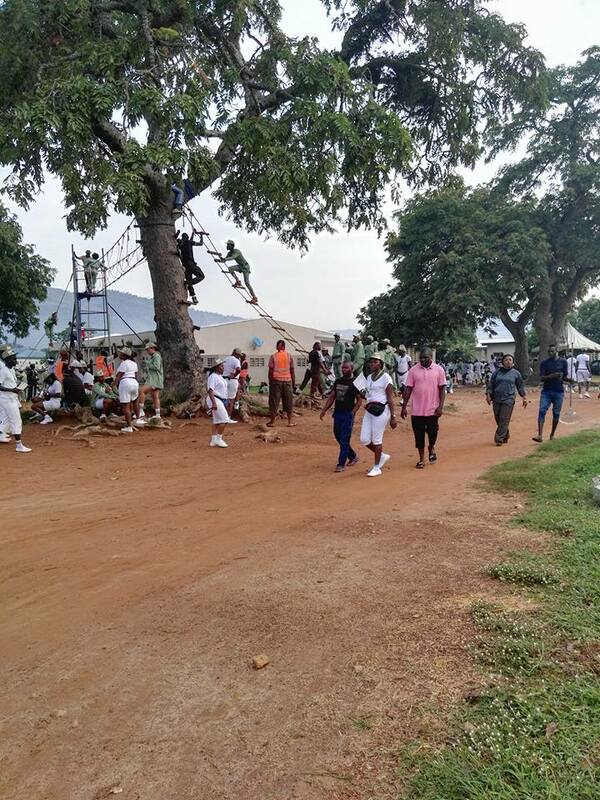 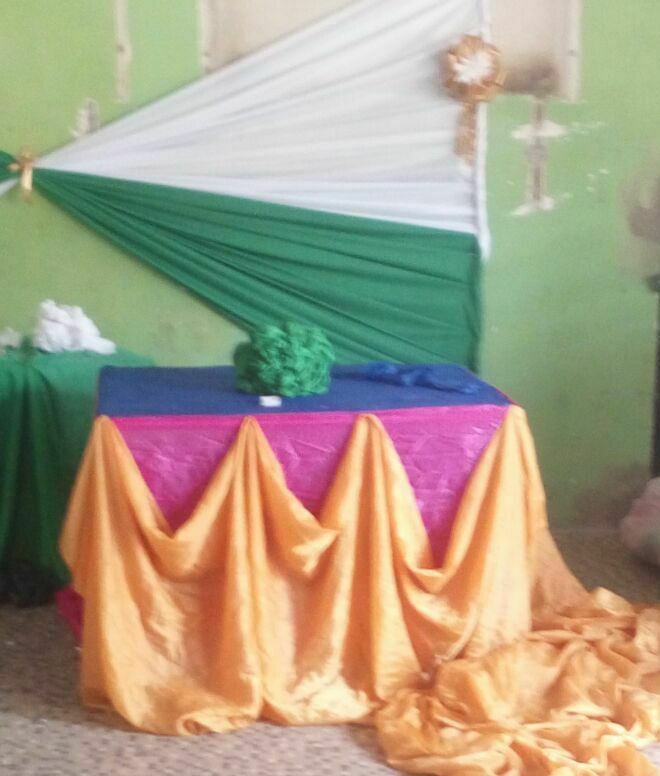 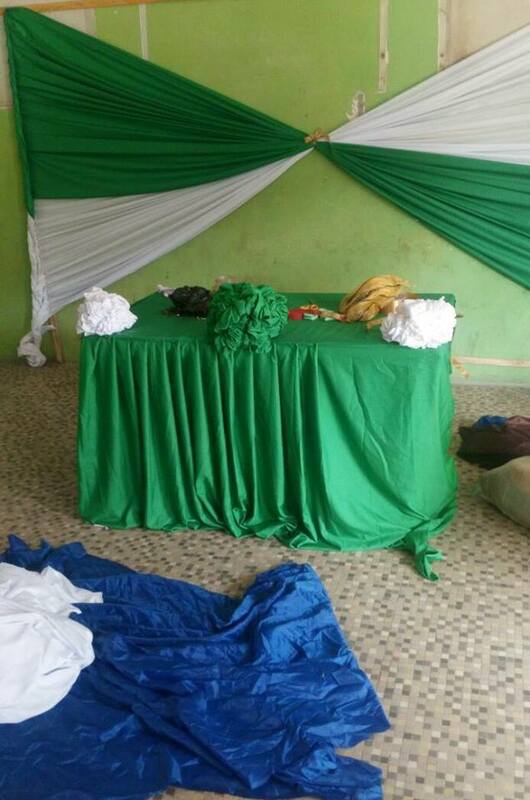 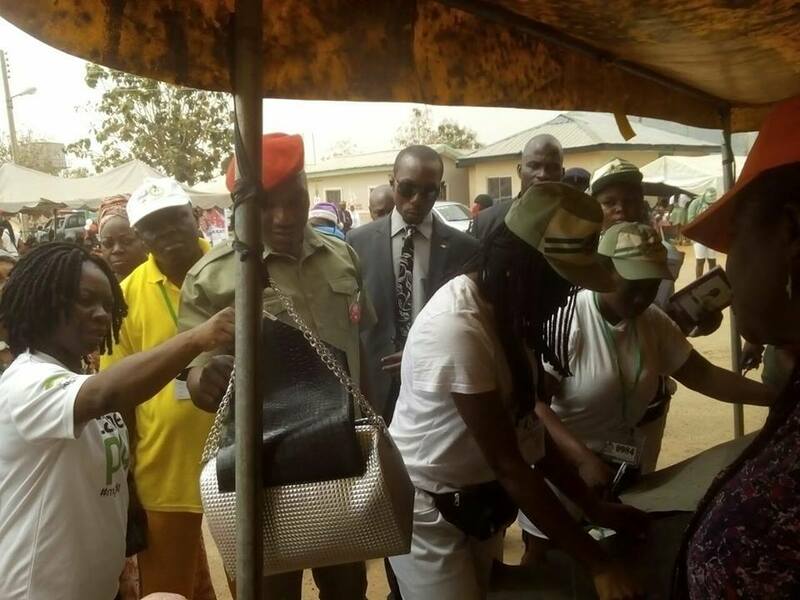 Below are pictures from Ekiti State. 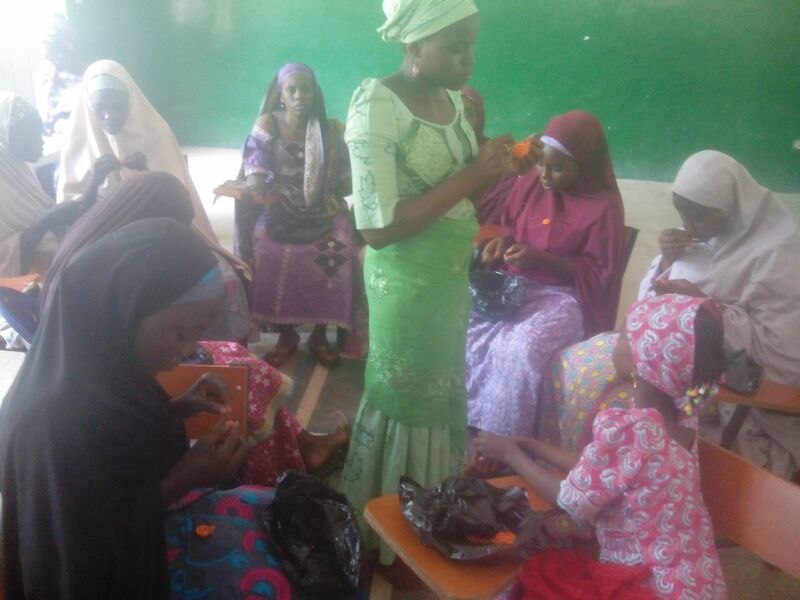 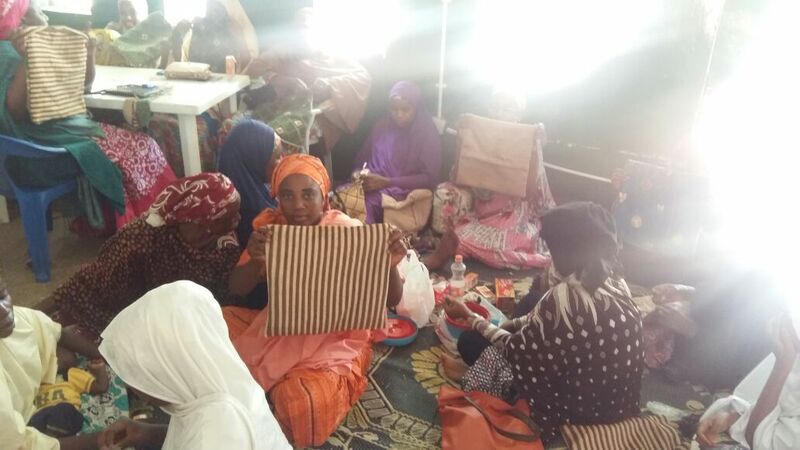 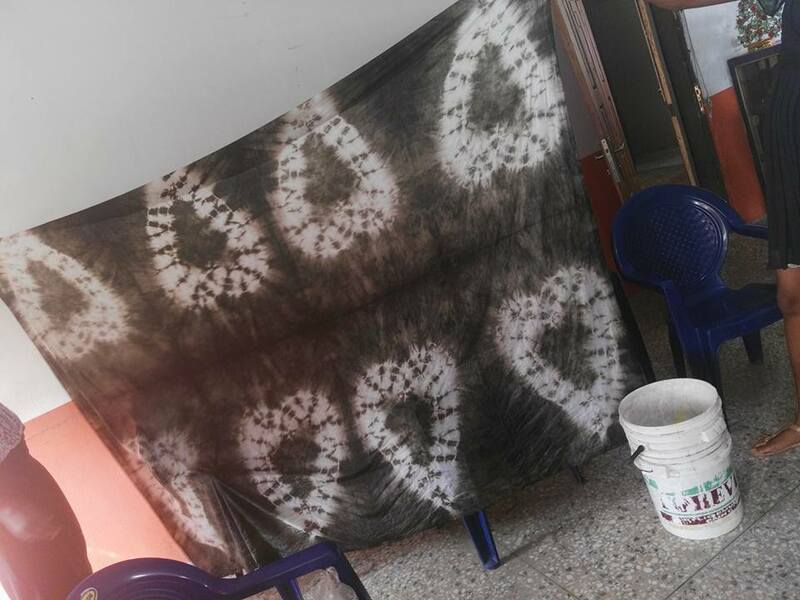 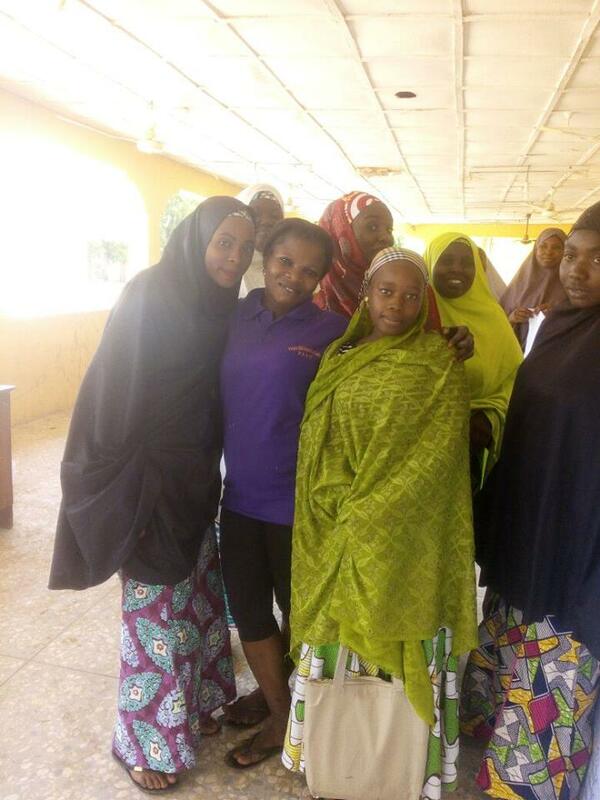 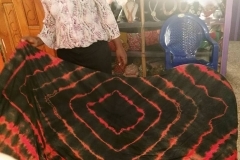 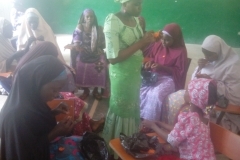 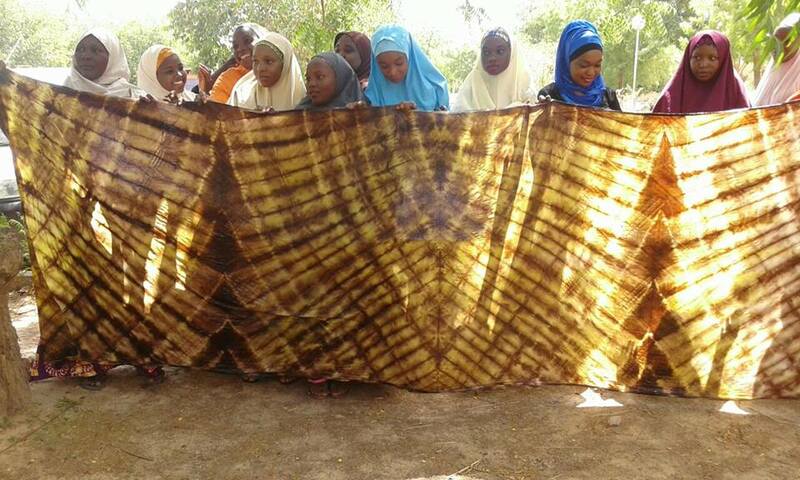 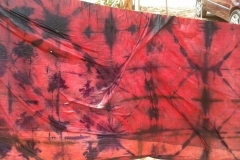 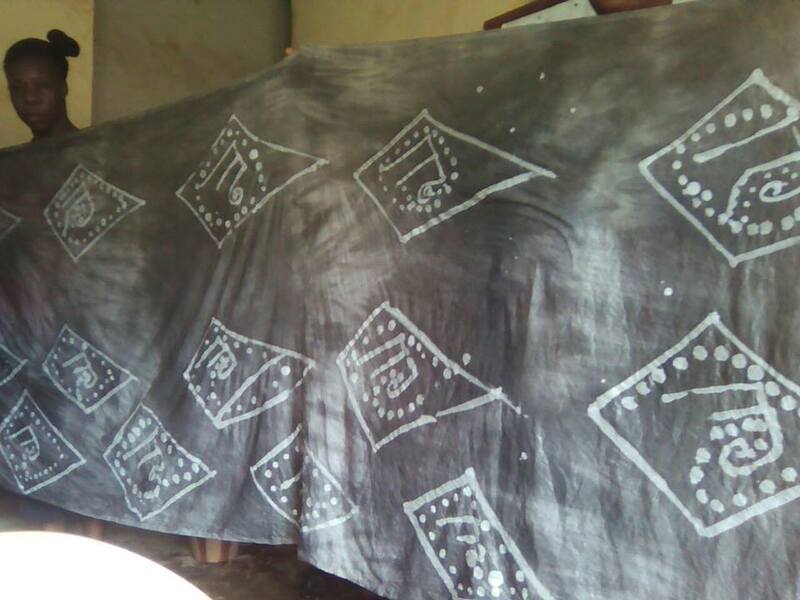 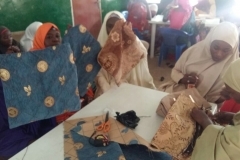 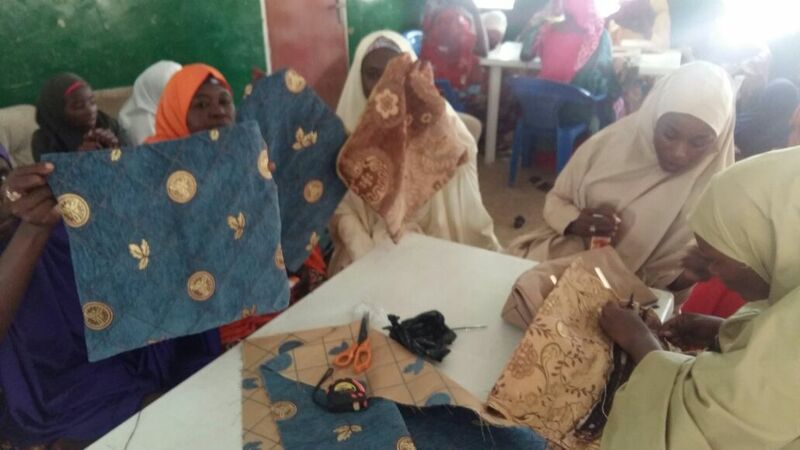 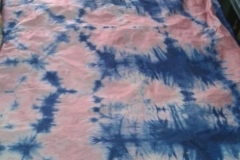 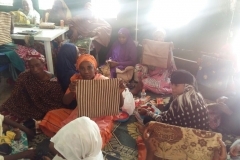 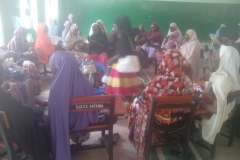 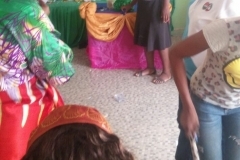 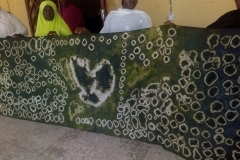 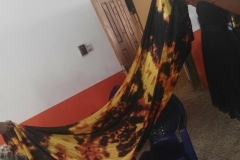 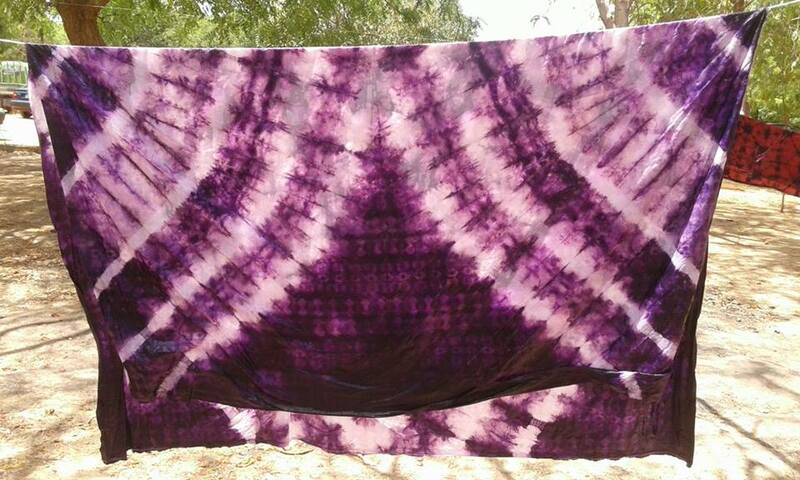 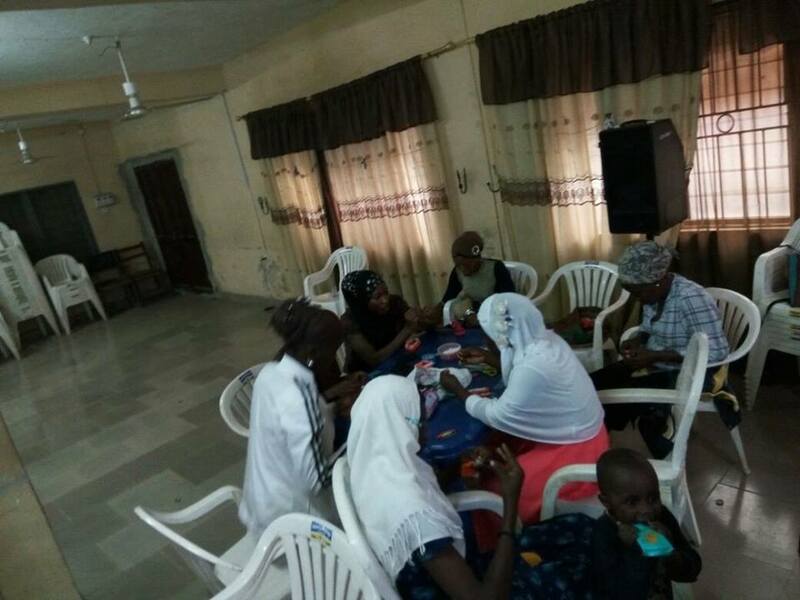 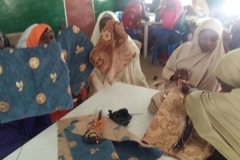 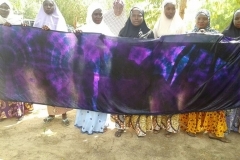 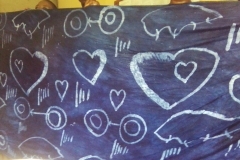 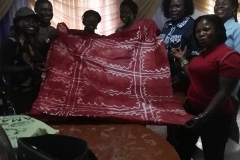 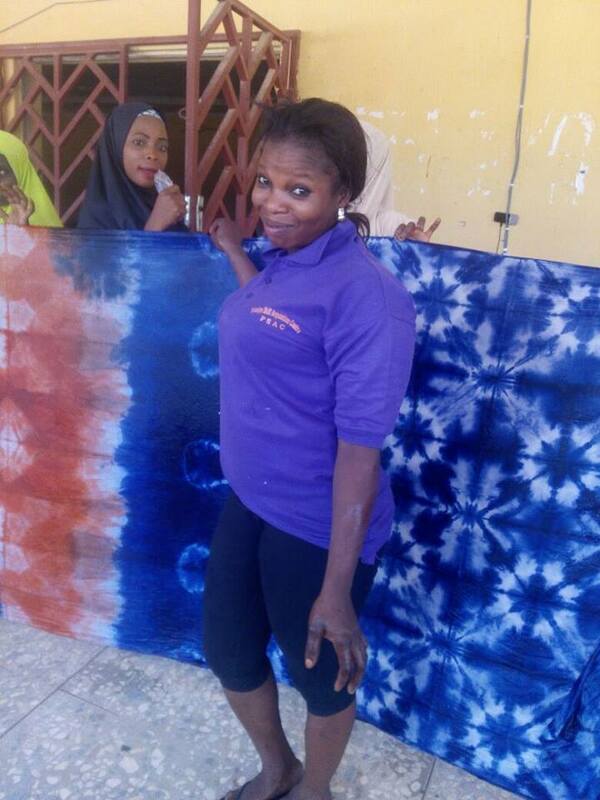 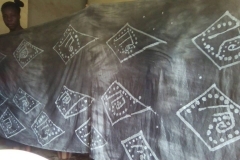 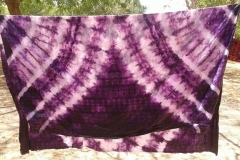 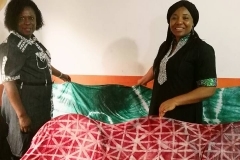 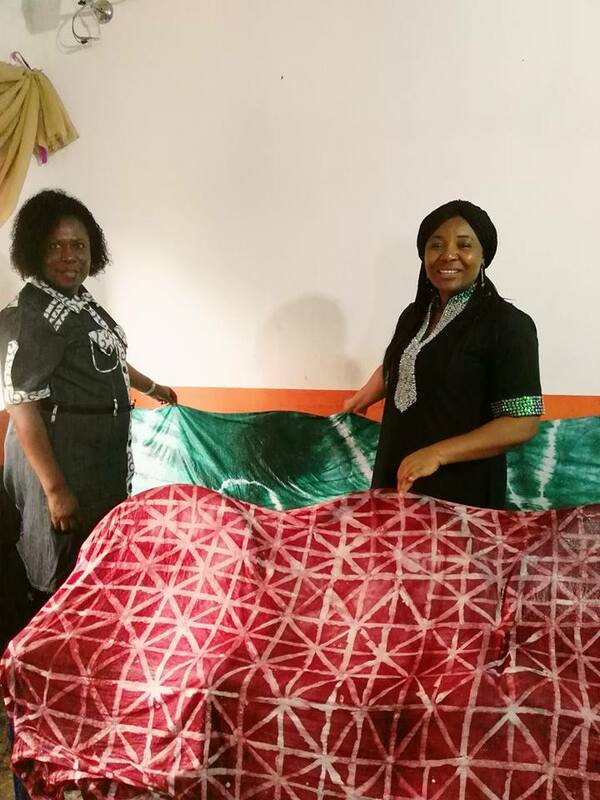 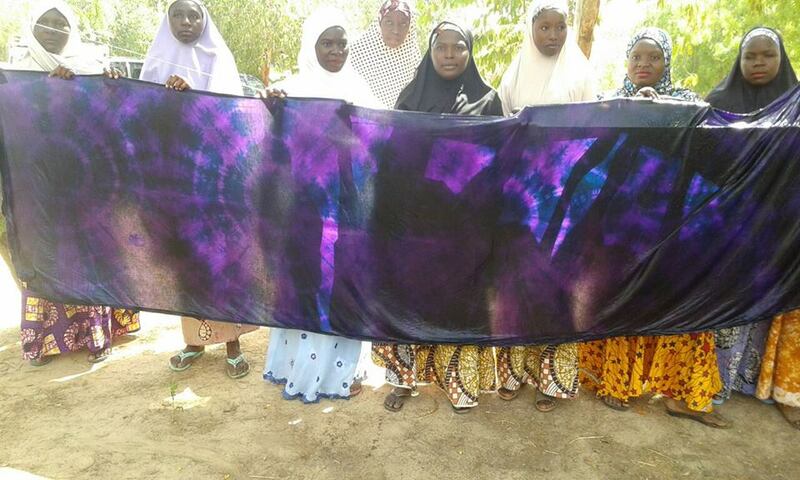 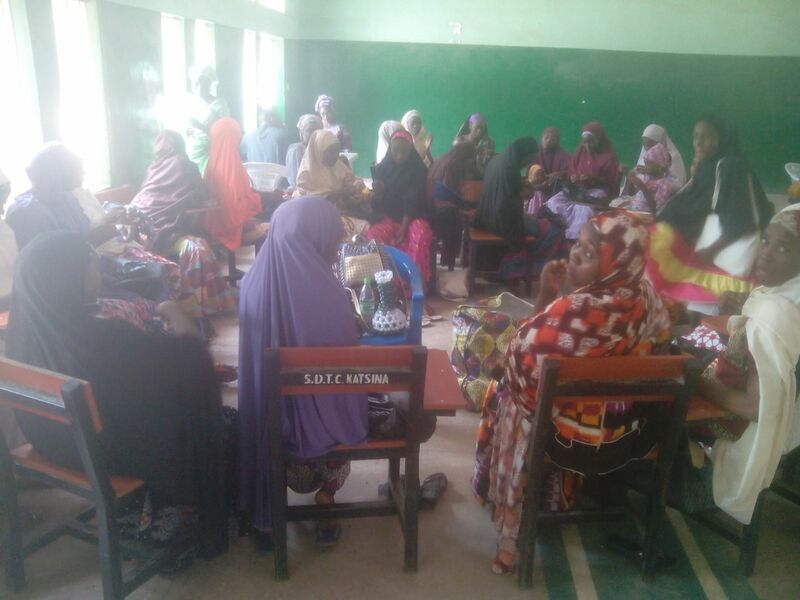 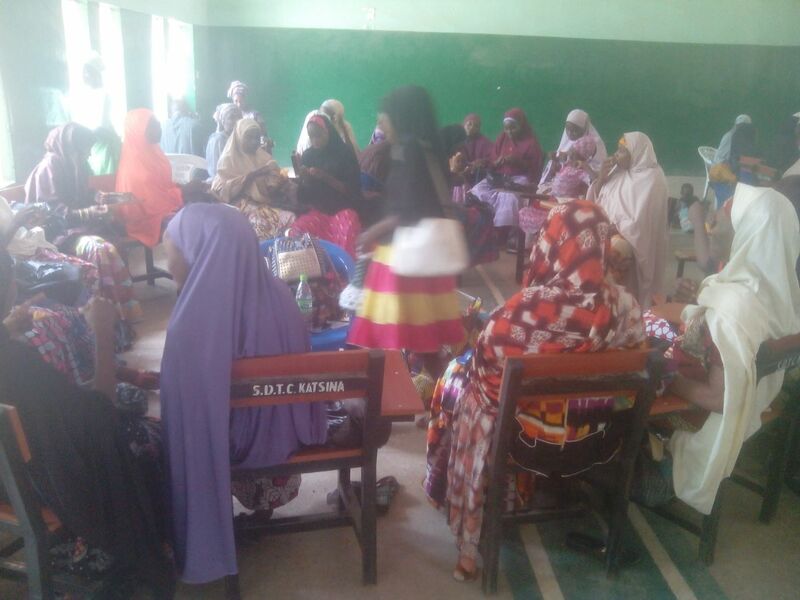 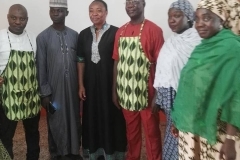 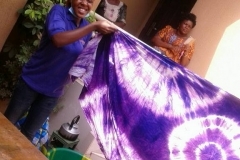 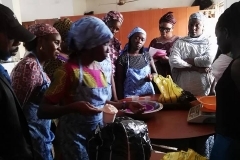 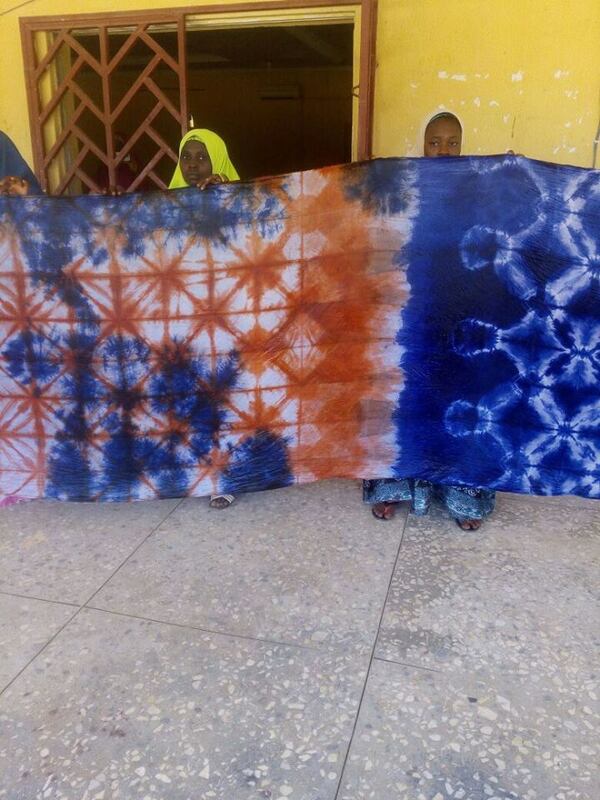 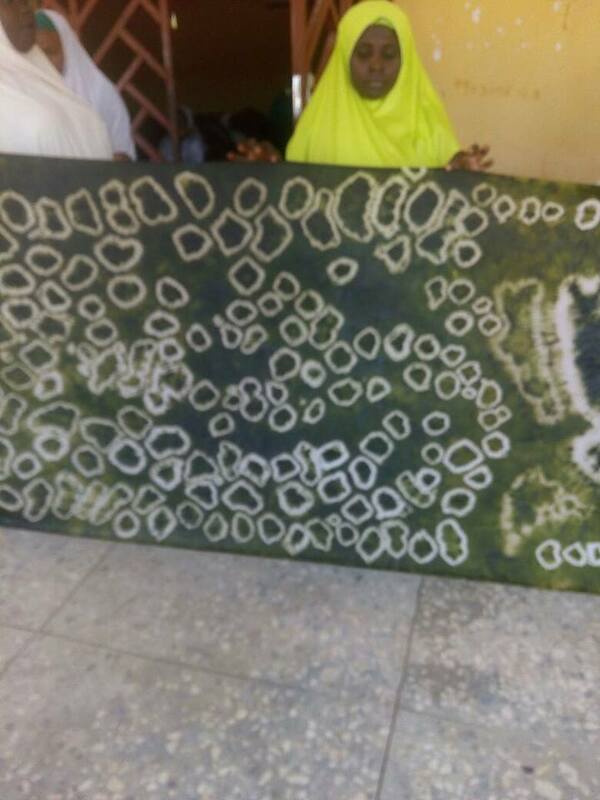 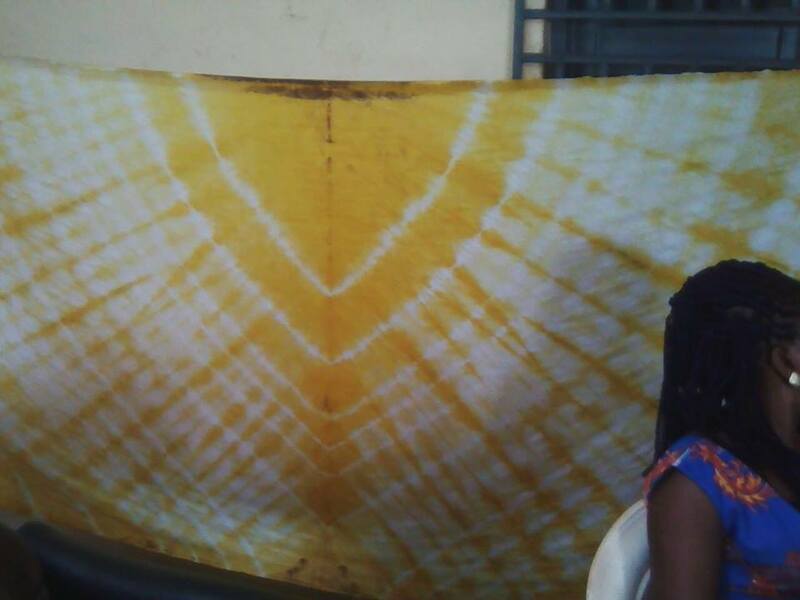 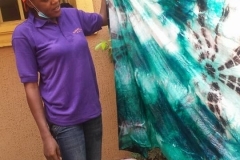 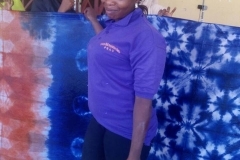 NDE in Partnership with PSAC Trained over 50 women in sokoto state on tie and dye, here are pictures from the training that took place in may, 2016. 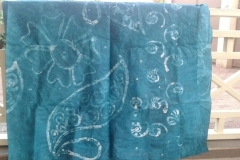 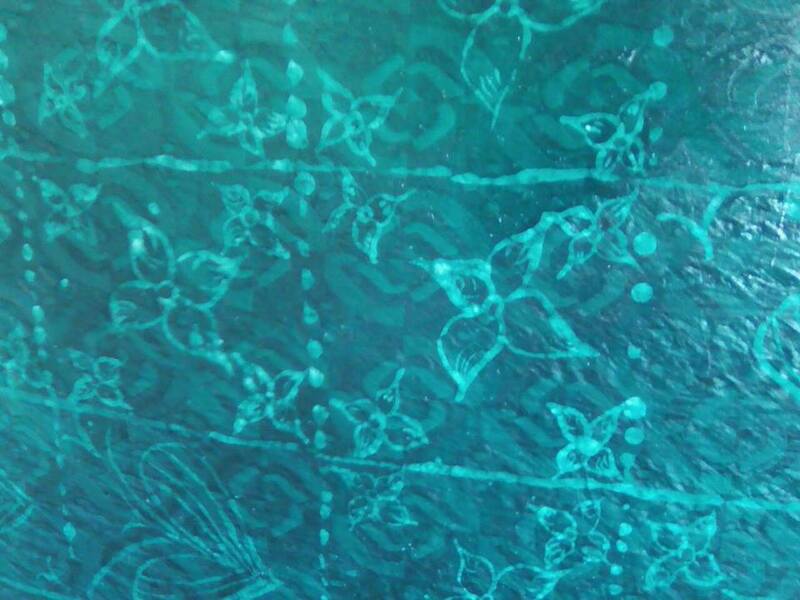 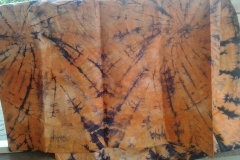 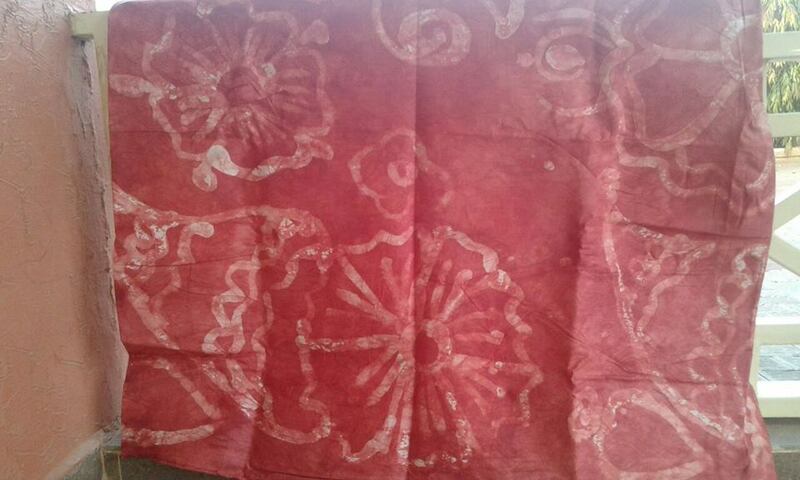 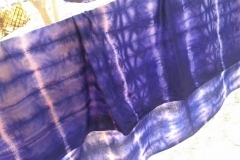 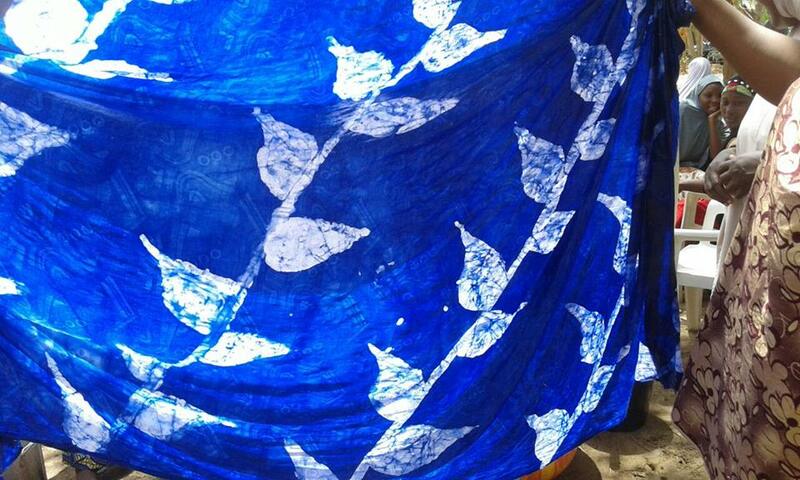 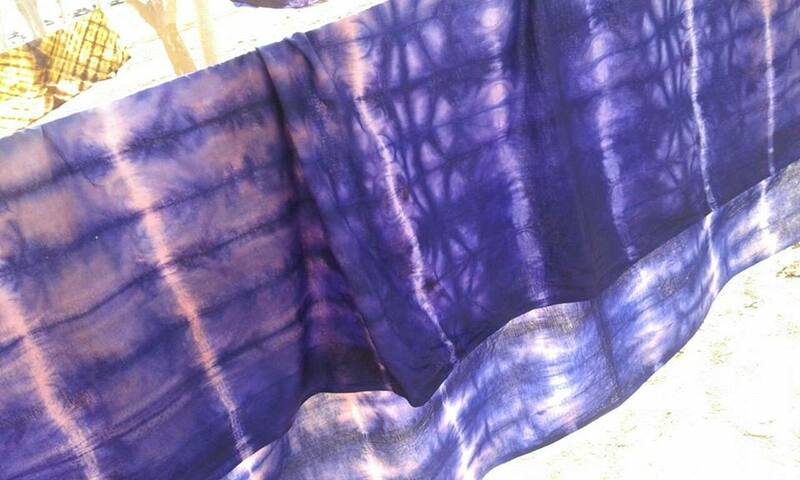 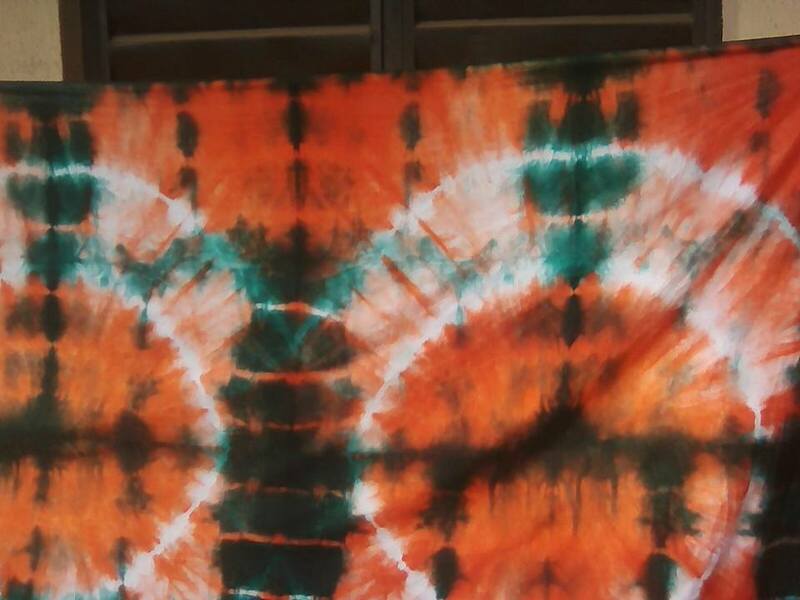 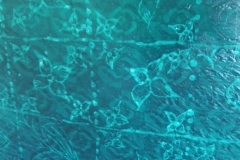 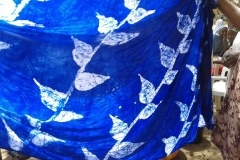 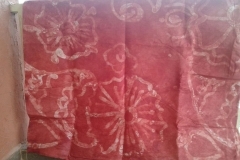 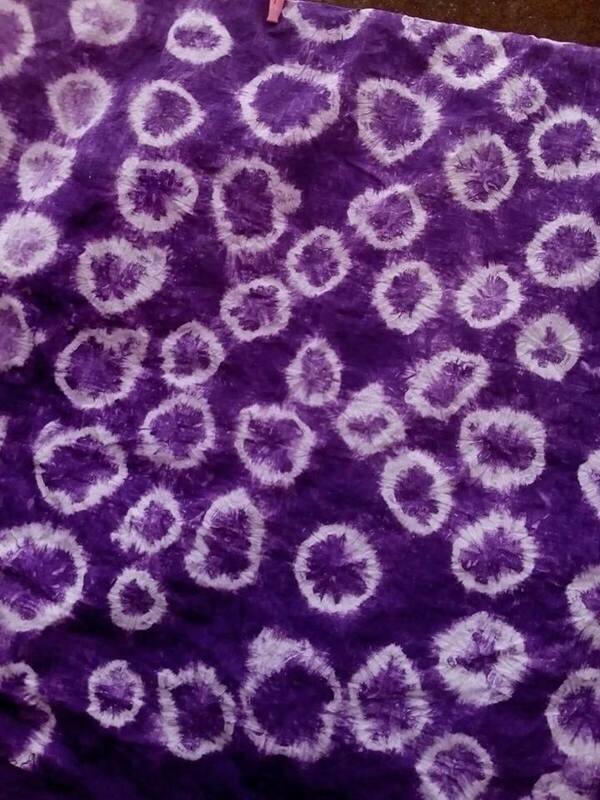 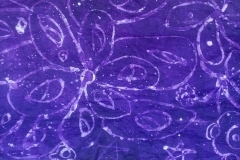 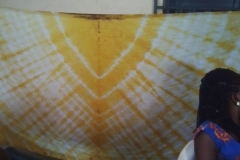 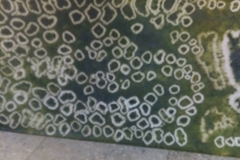 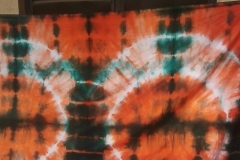 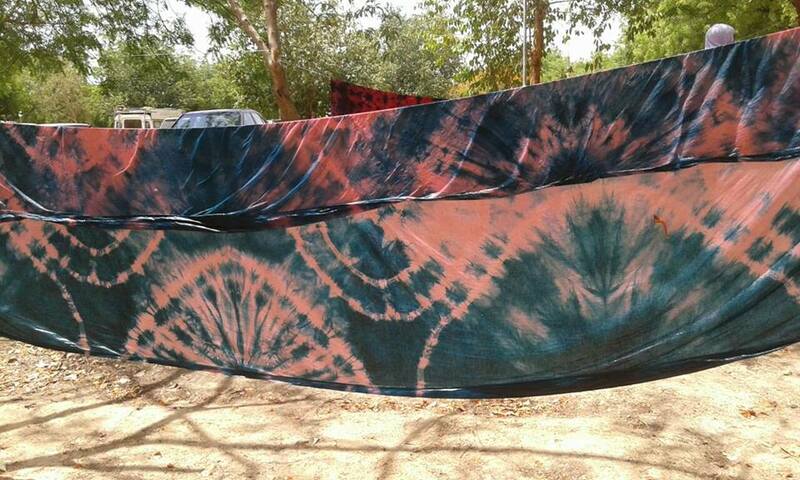 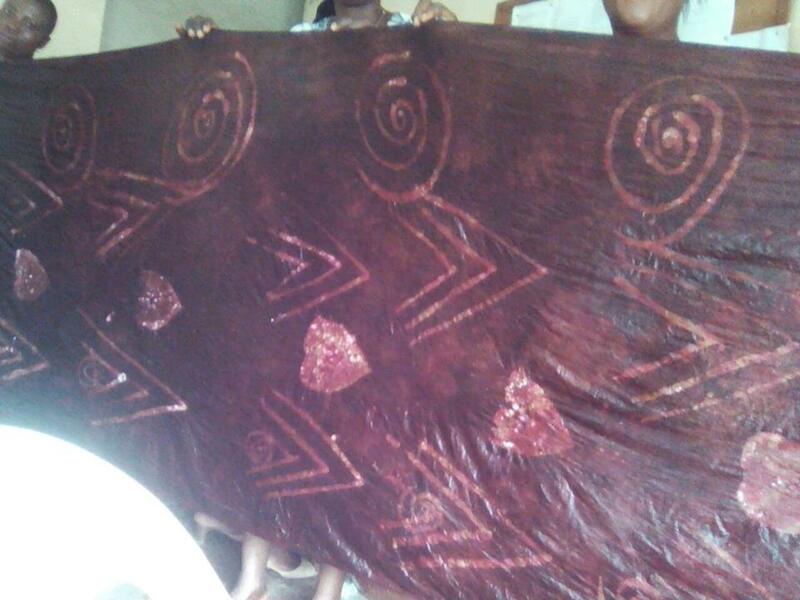 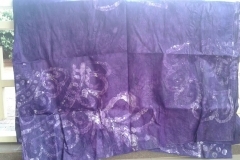 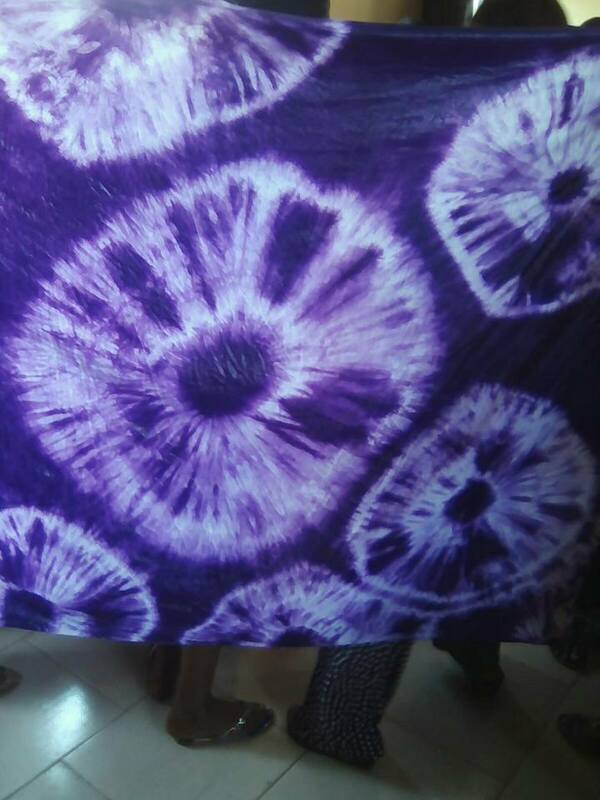 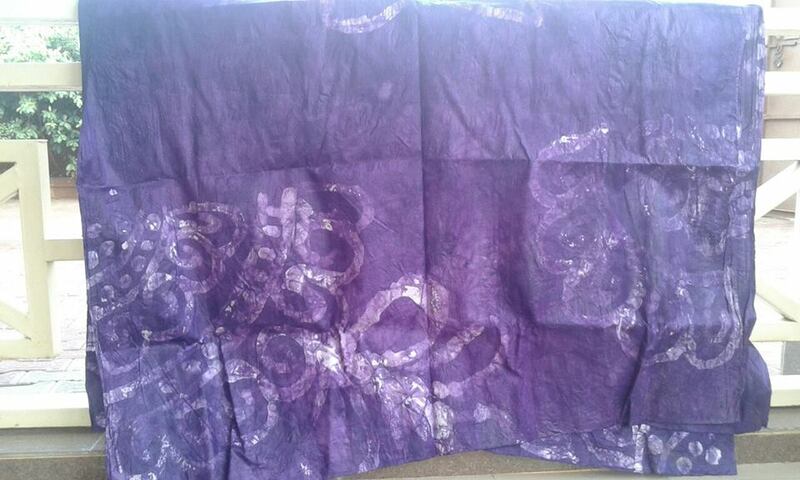 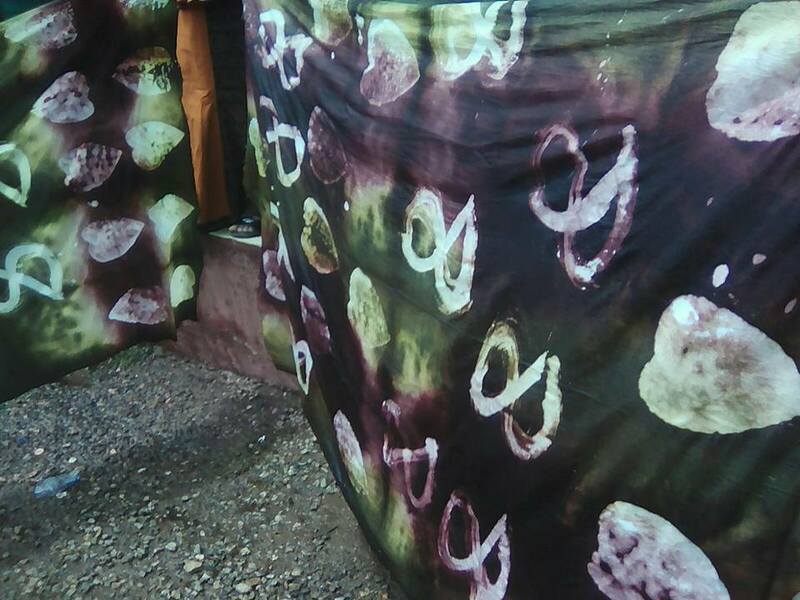 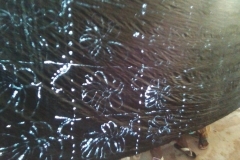 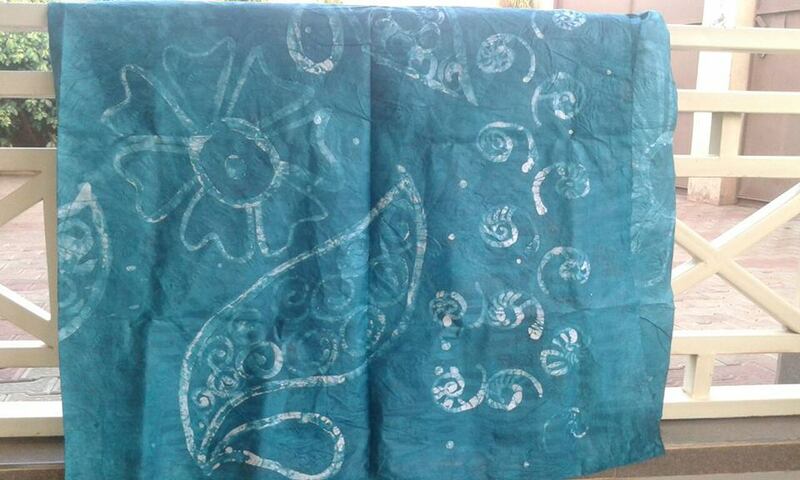 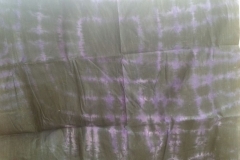 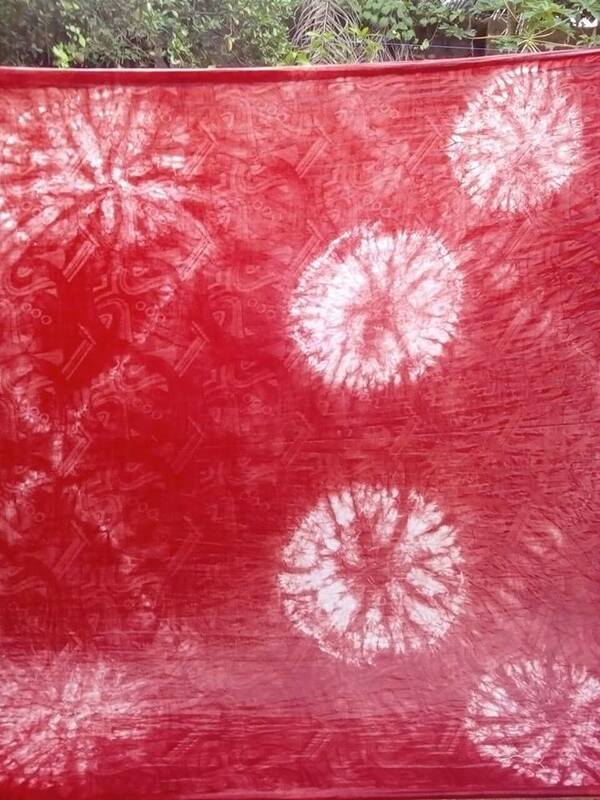 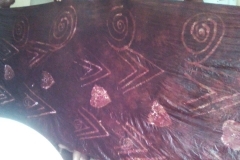 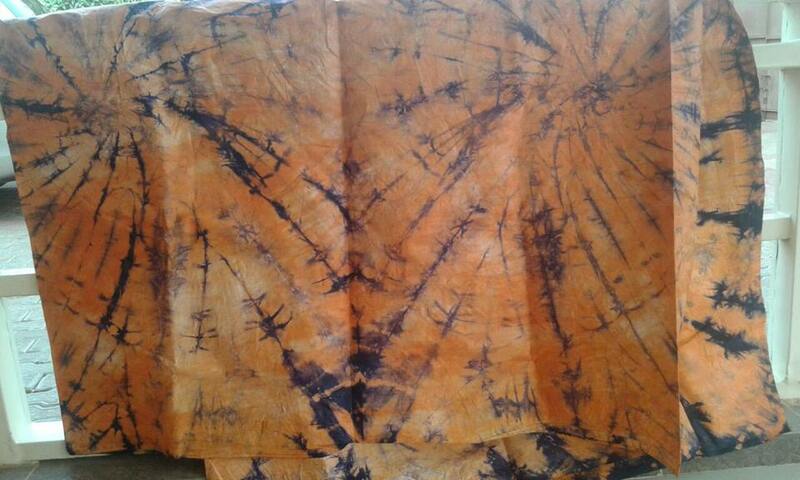 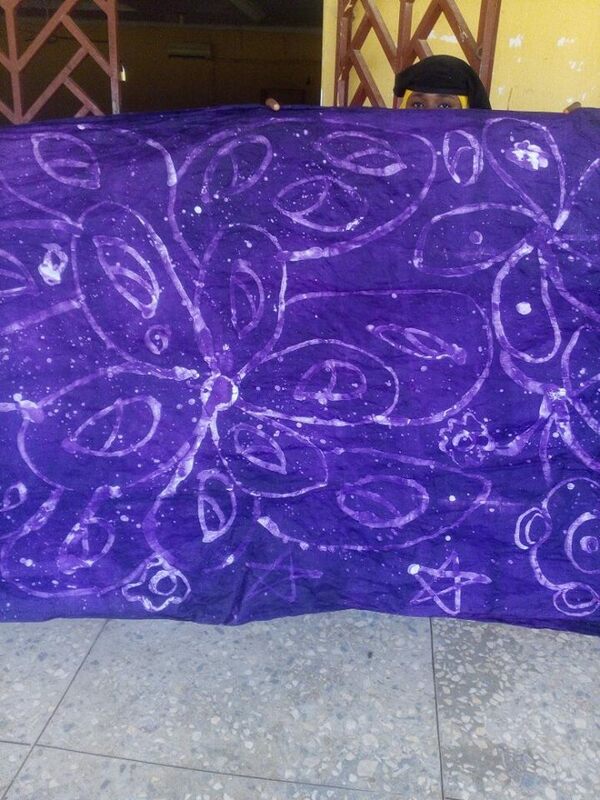 These are samples of batik, tye and dye made by the trainees. 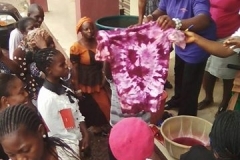 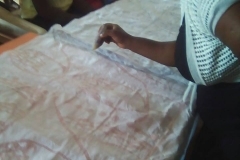 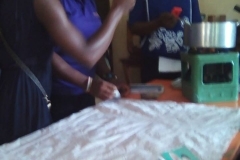 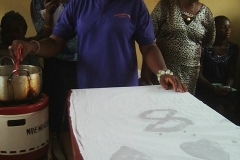 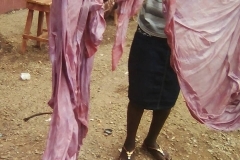 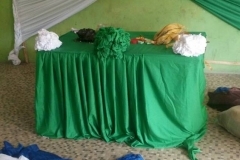 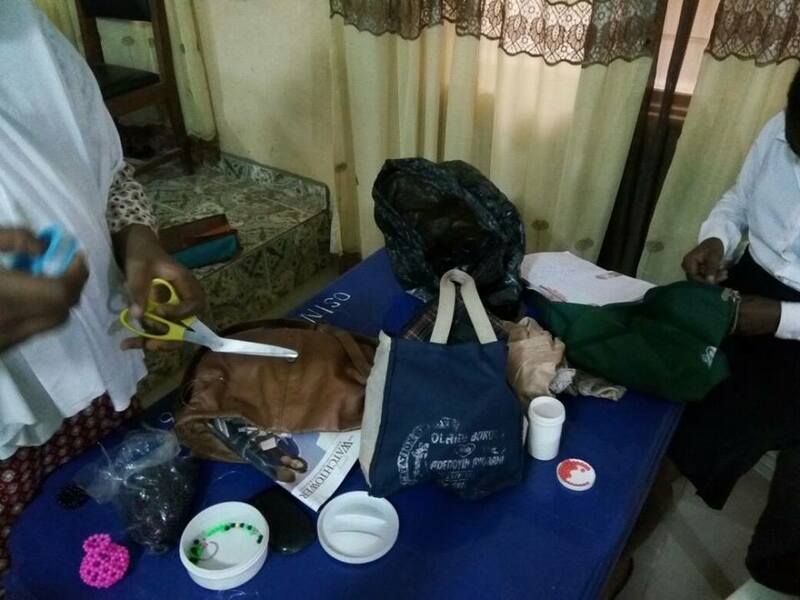 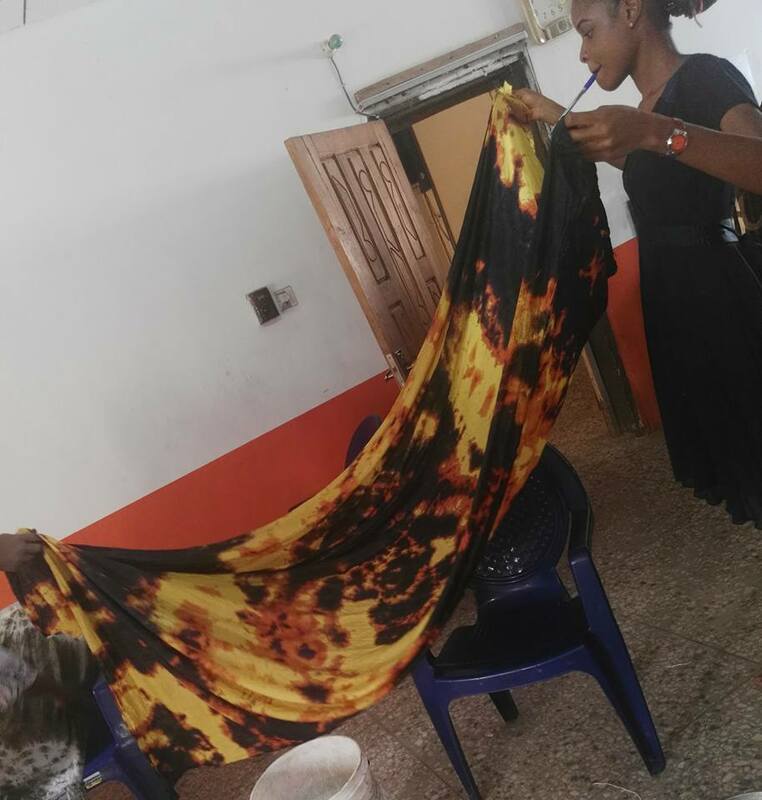 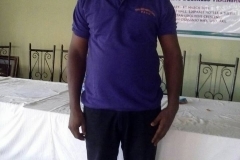 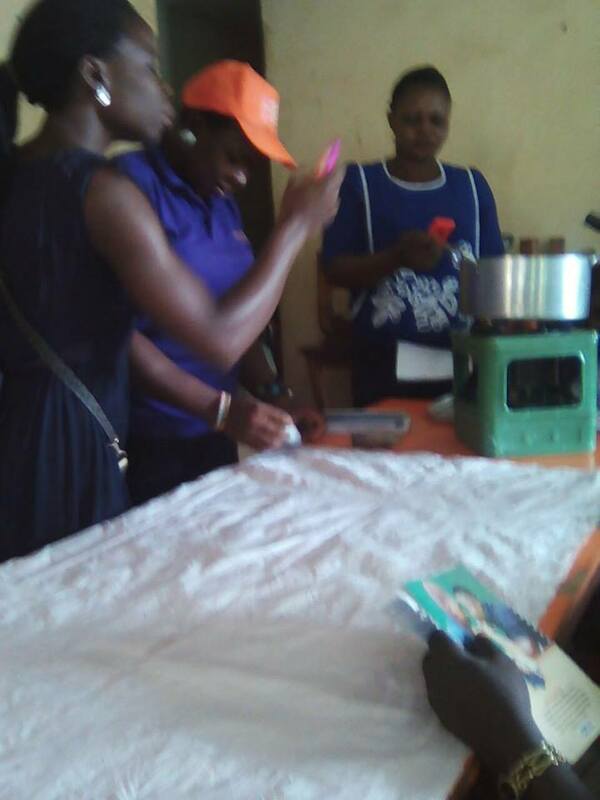 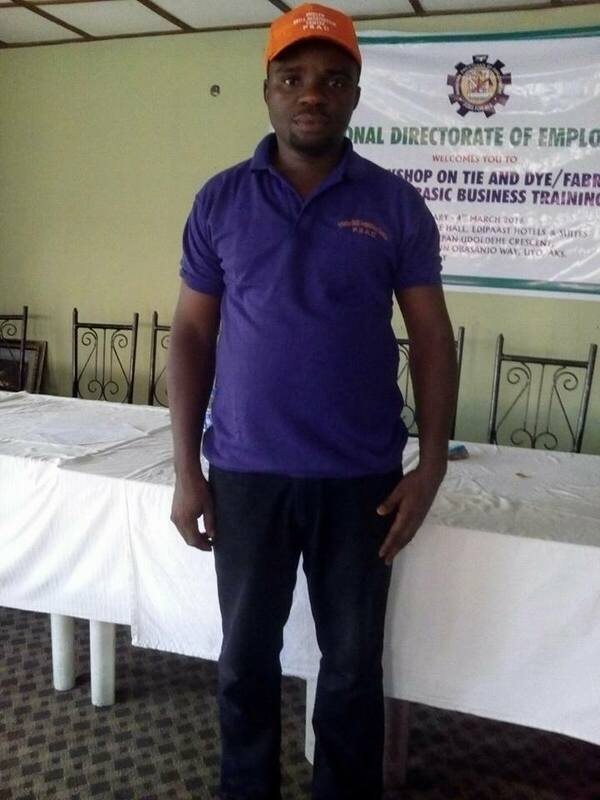 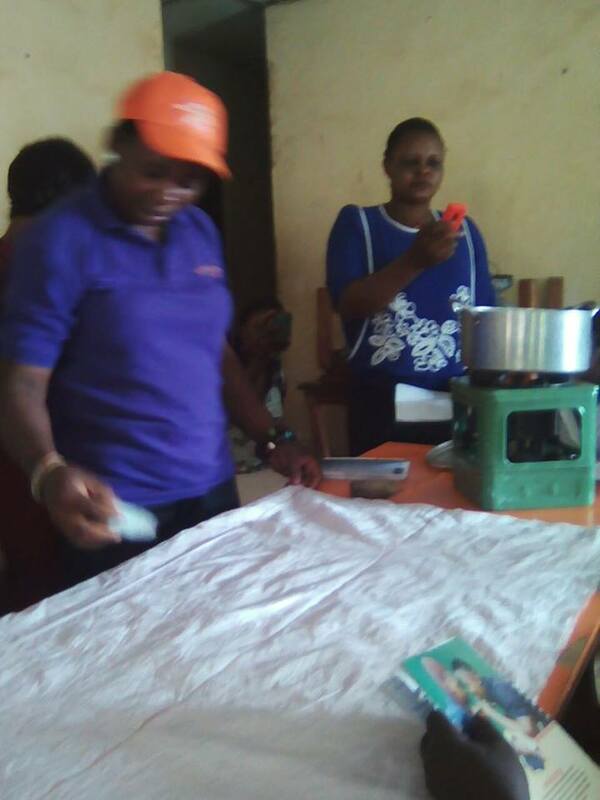 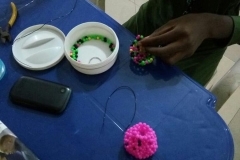 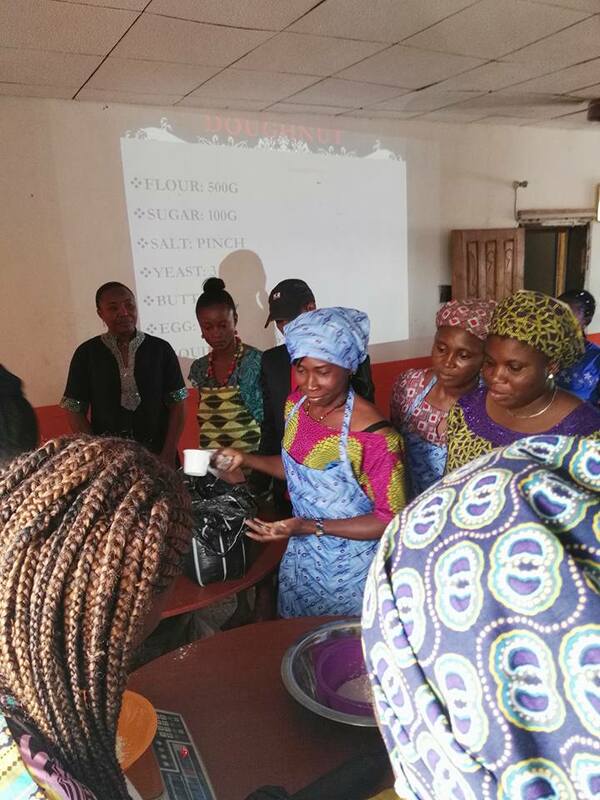 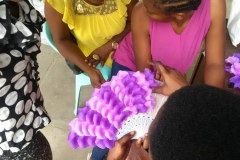 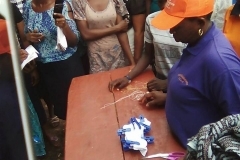 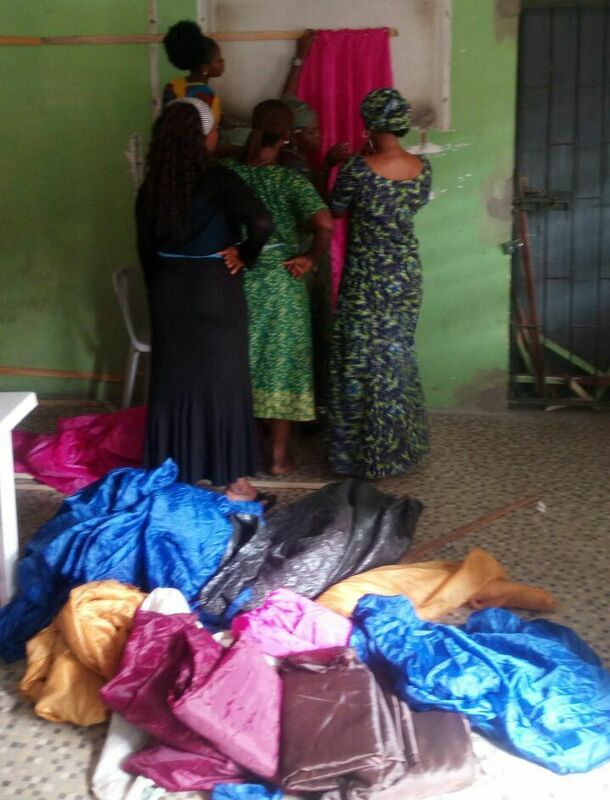 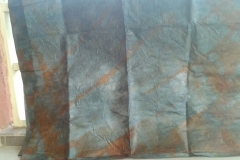 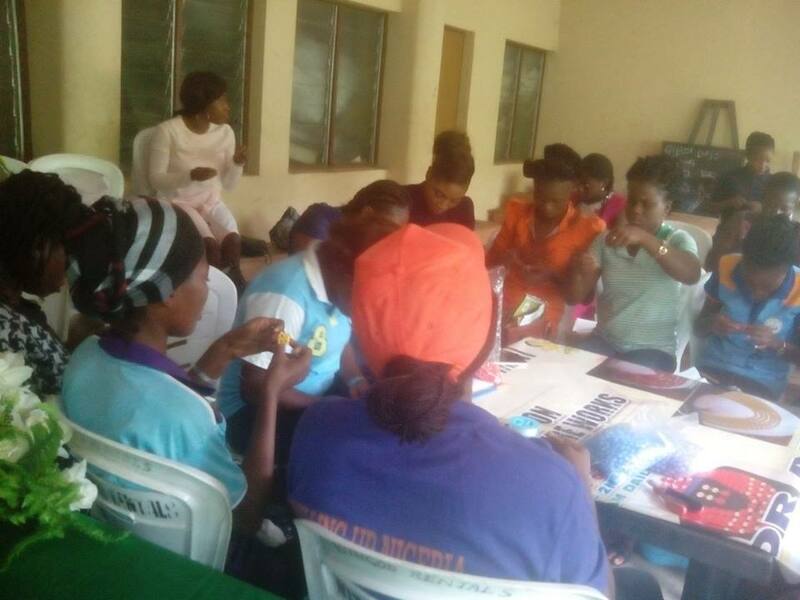 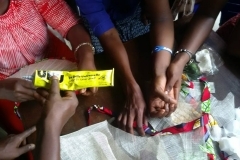 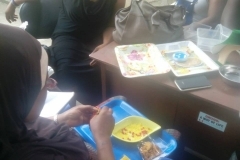 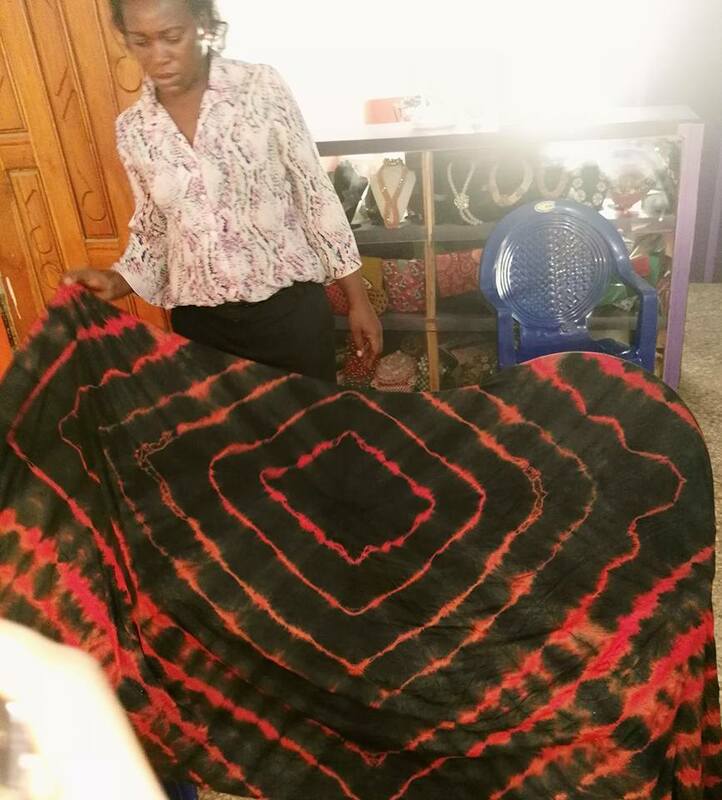 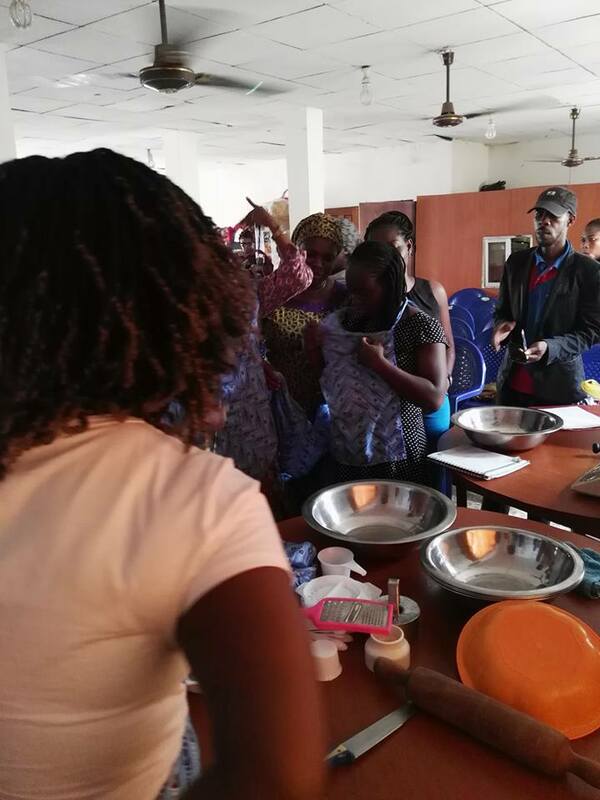 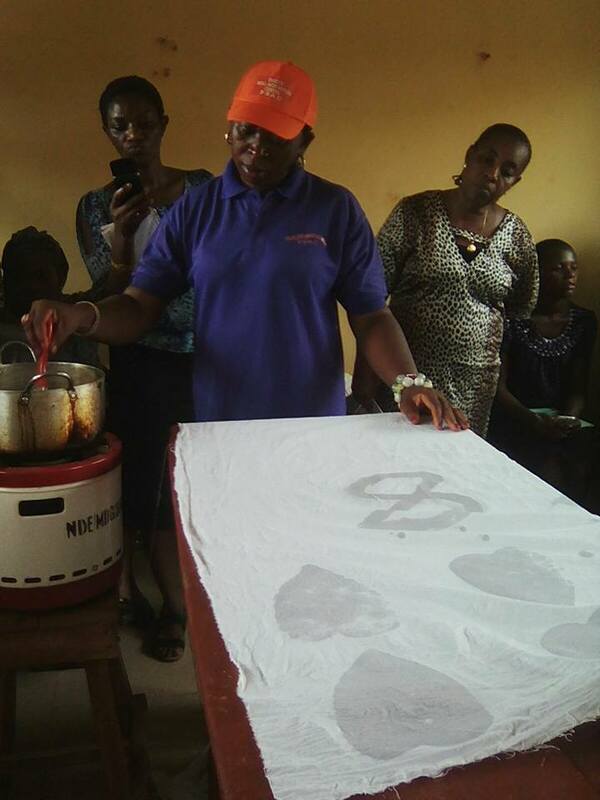 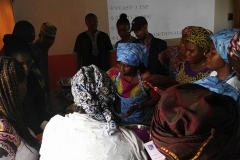 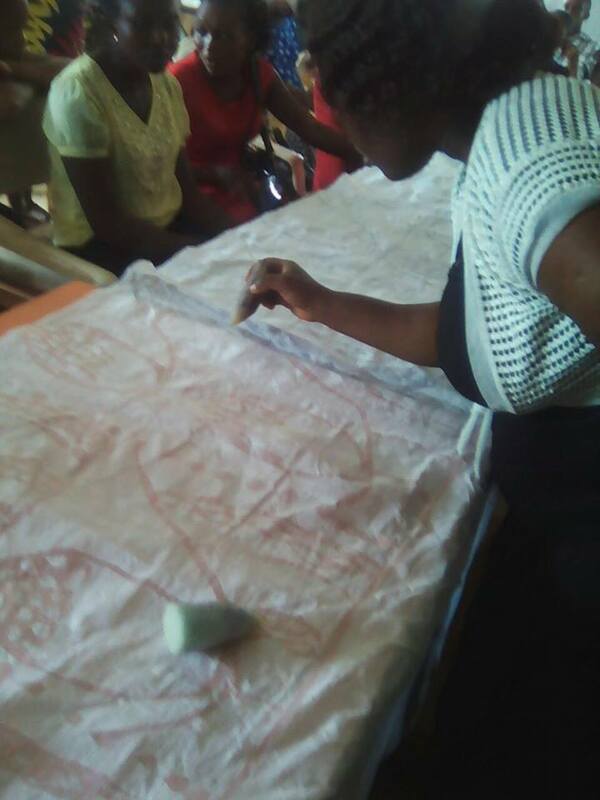 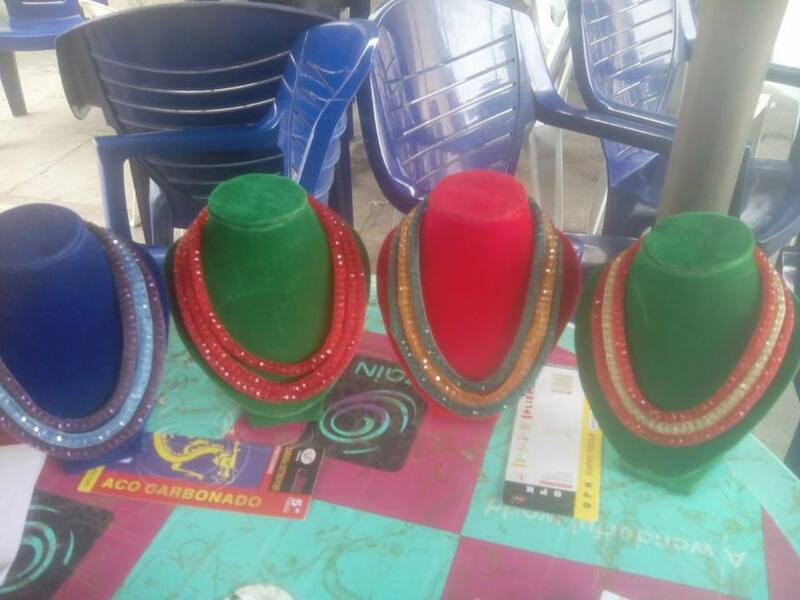 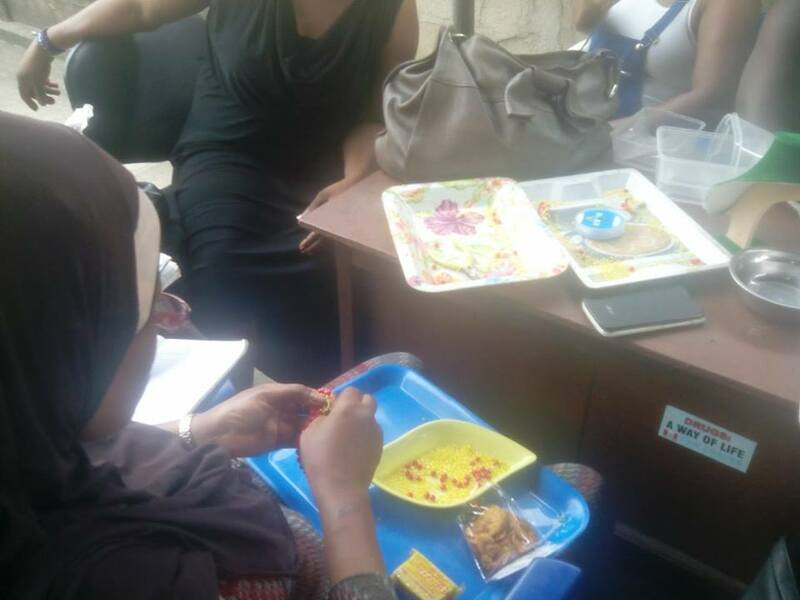 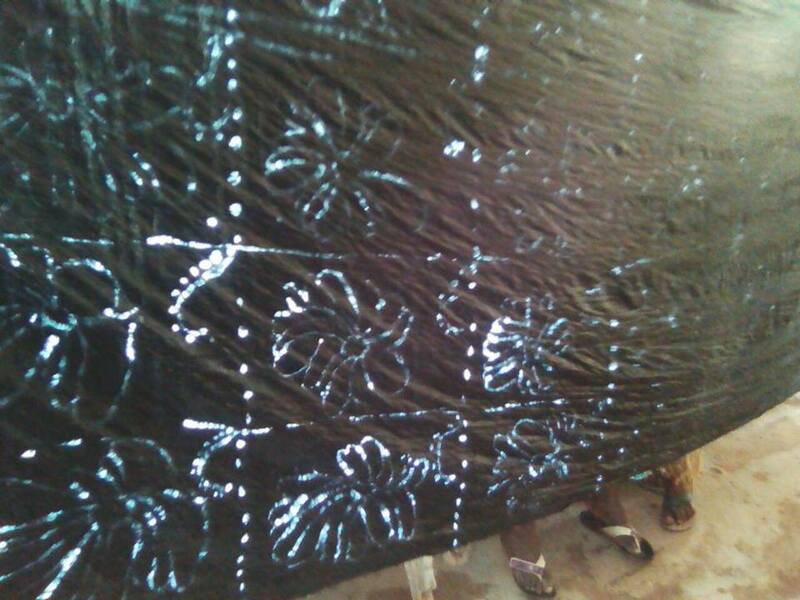 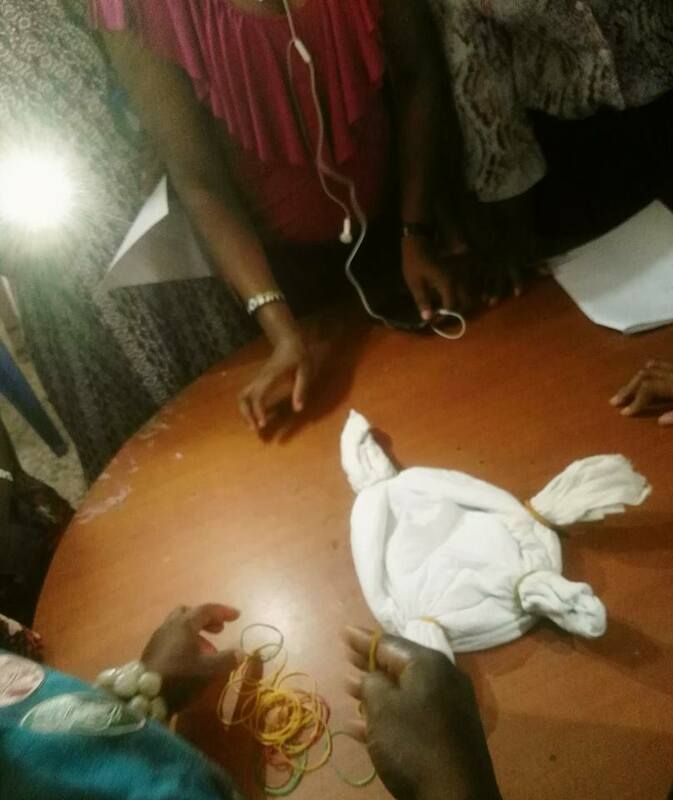 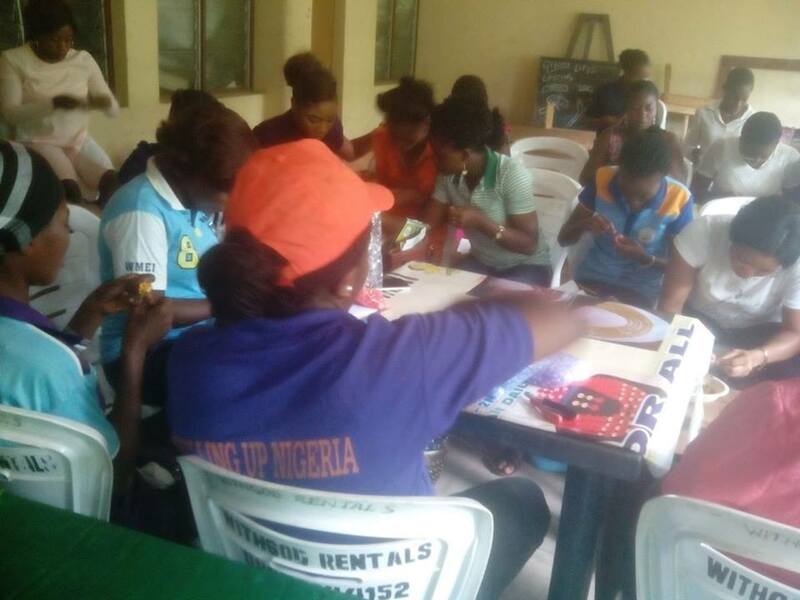 These pictures were taken from the current projects (The and dye) training that we’re handling in six states: Abia, Ebonyi, Jigawa, Sokoto, Katsina and Enugu States. 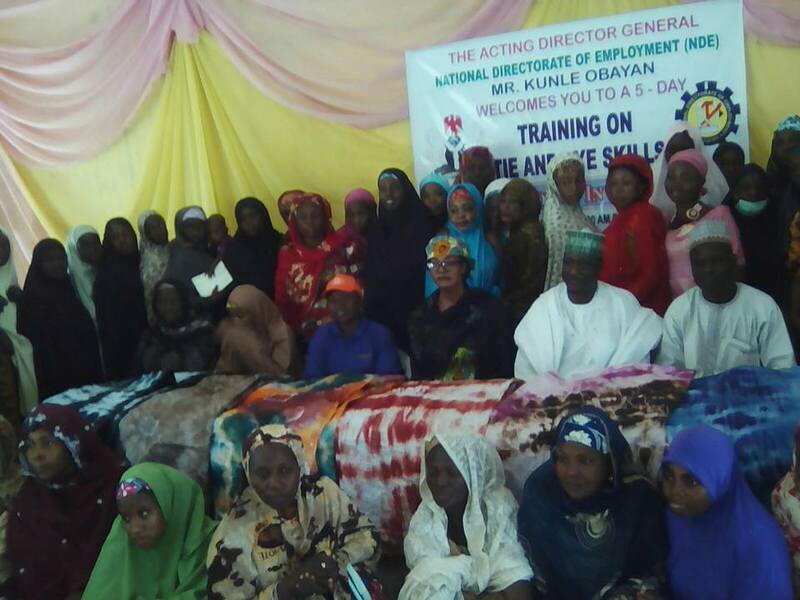 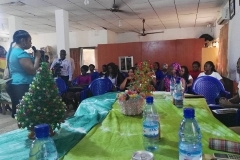 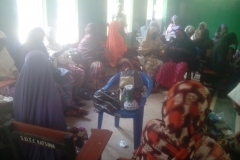 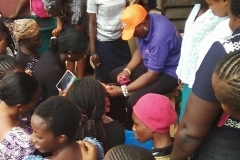 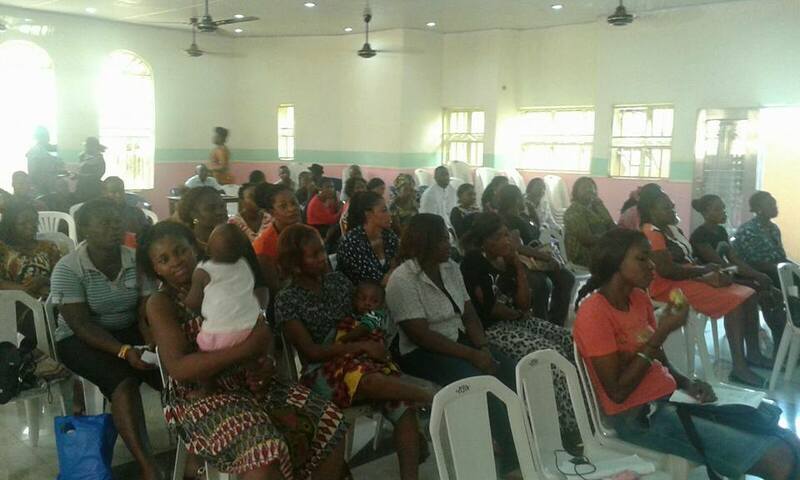 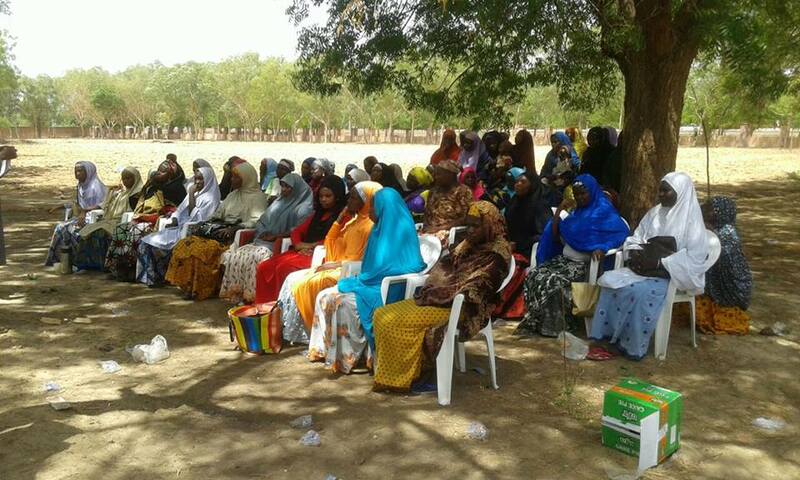 Over 400 women benefited from the training.